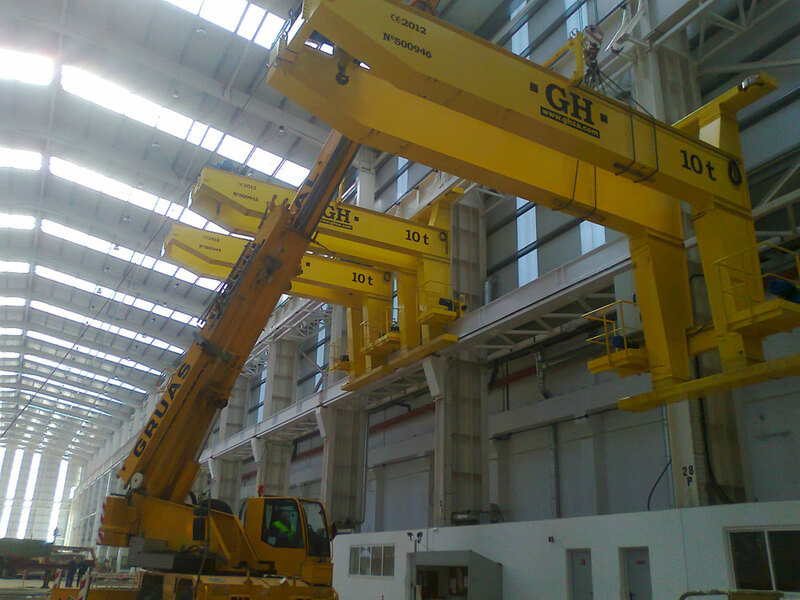 References | GH crane and hoist manufacturer. 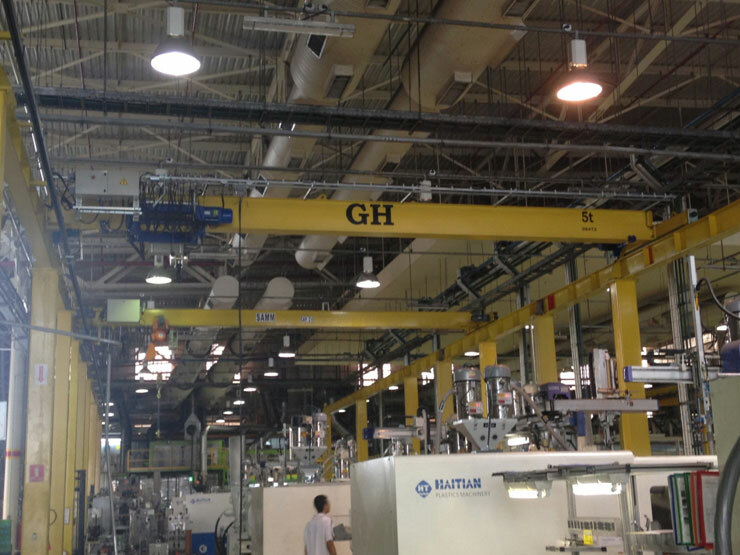 Customer: Sonelgaz SPE (Société Production Electricité). 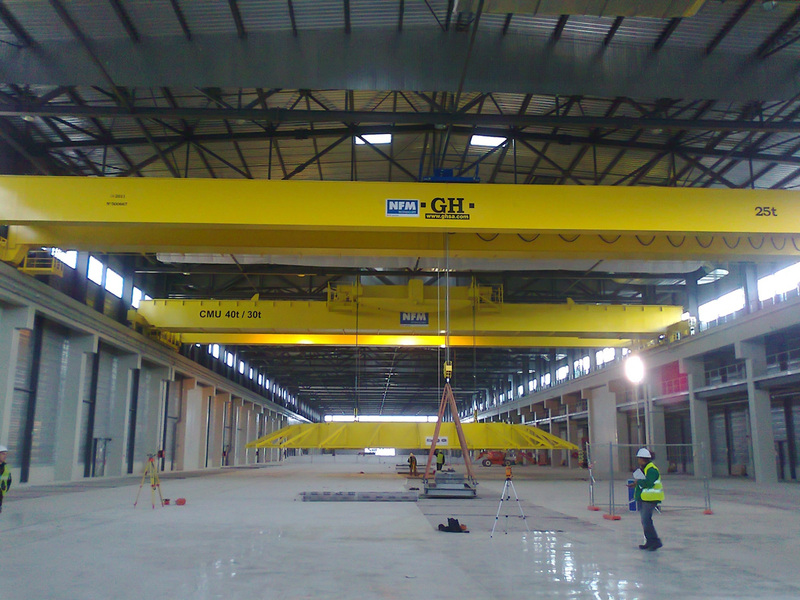 Place of installation: Algeria. 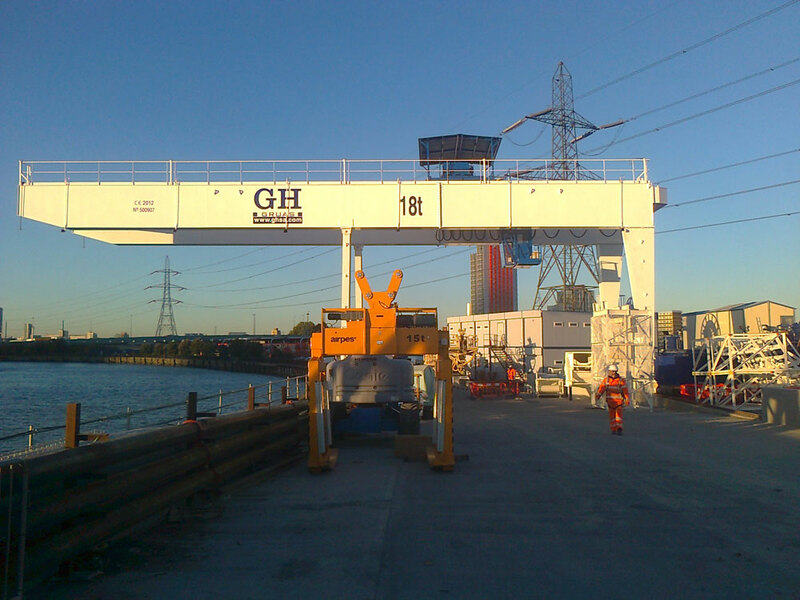 Capacity: 16t. Customer: Estimin Green. 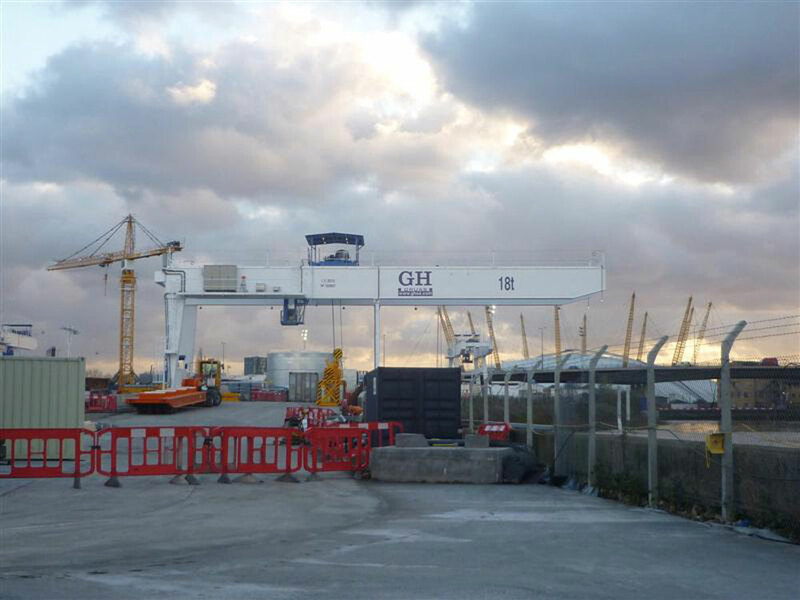 Place of installation: United Kingdom. 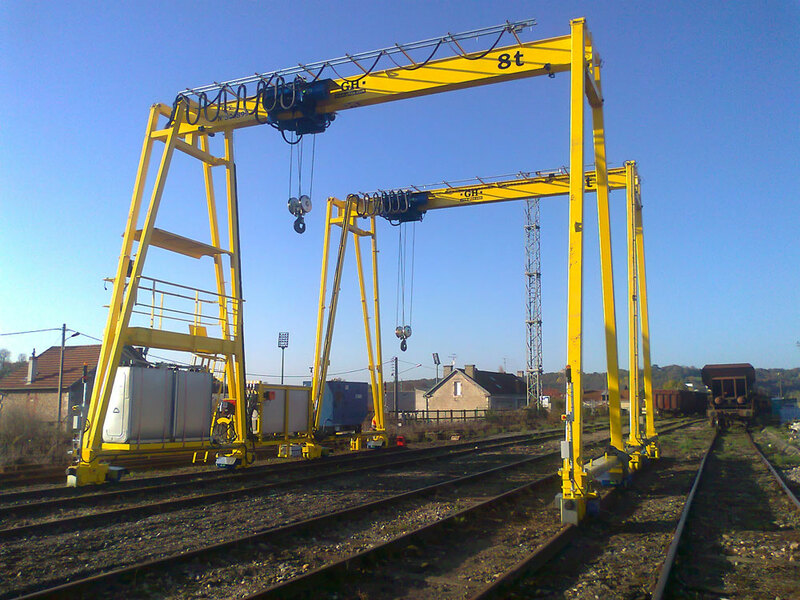 Capacity: 32/6,3t. Customer: Inneo. Place of installation: Polonia. 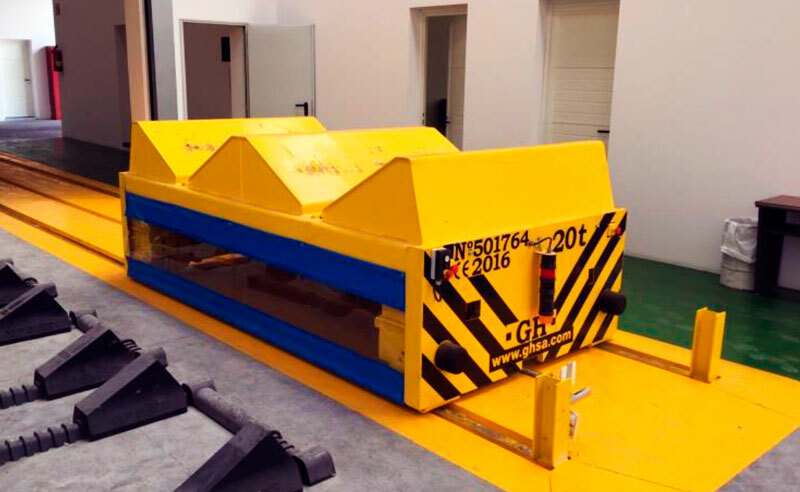 Capacity: 10t. 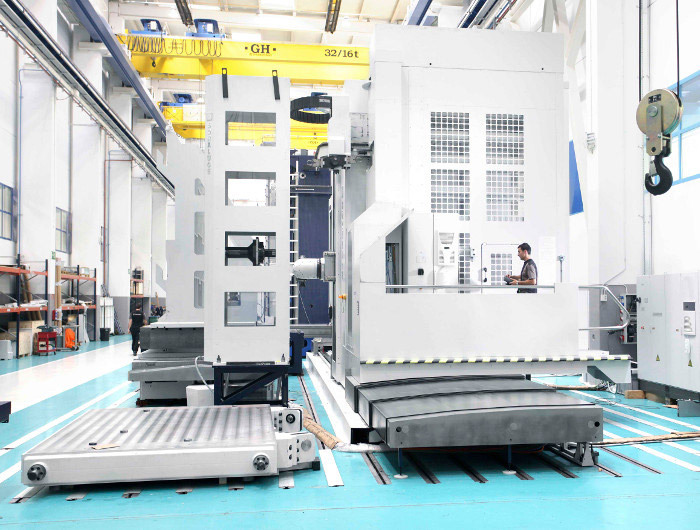 Customer: Precon Linyi. Place of installation: China. 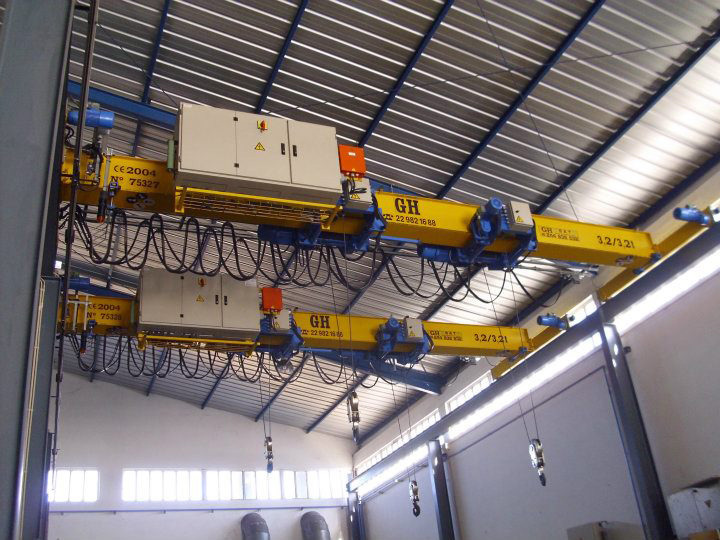 Capacity: 12,5t+12,5t. Place of installation: Londres. Capacity: 18t. 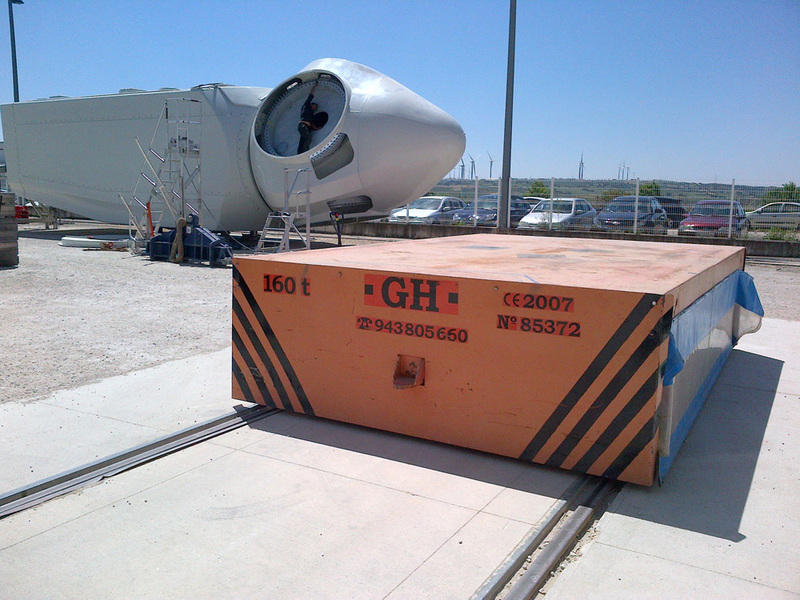 Customer: Acciona. Place of installation: Brasil. 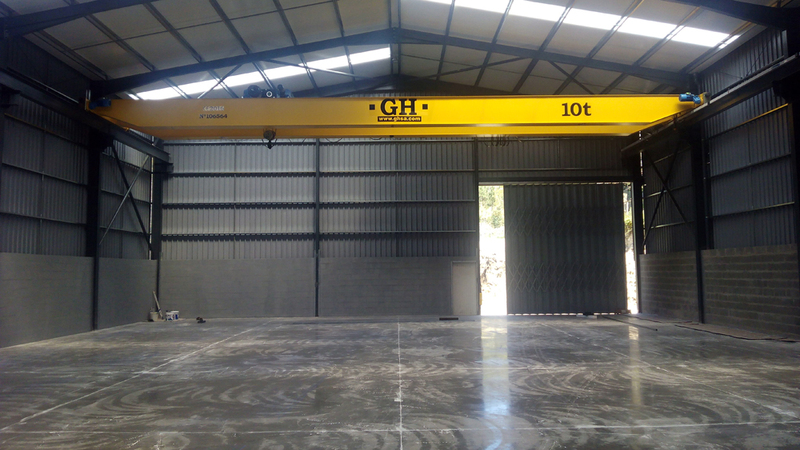 Capacity: 10t. 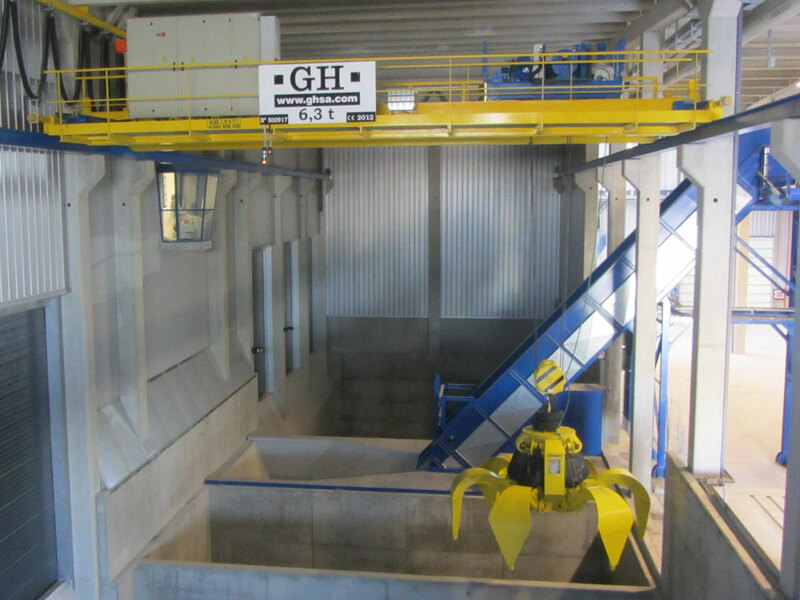 Customer: Andrytz Hydro. Place of installation: Egipto. 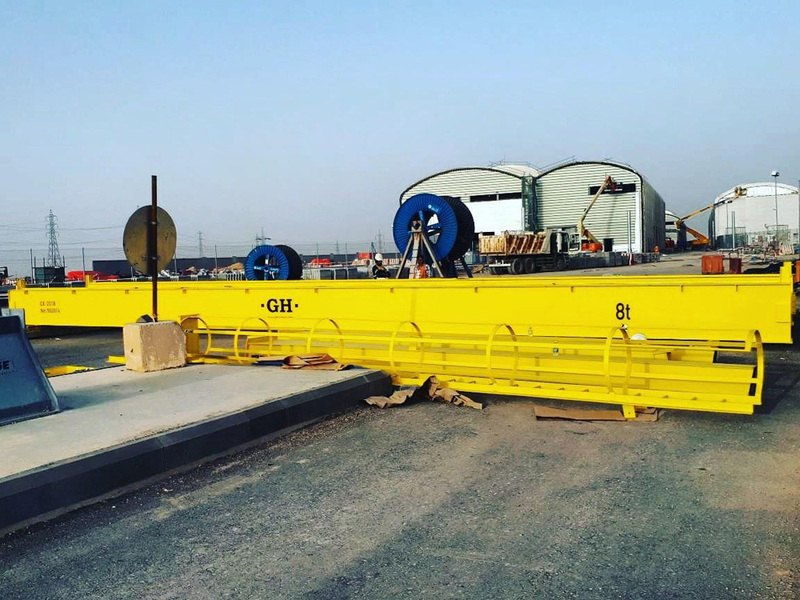 Capacity: 50t/10t. 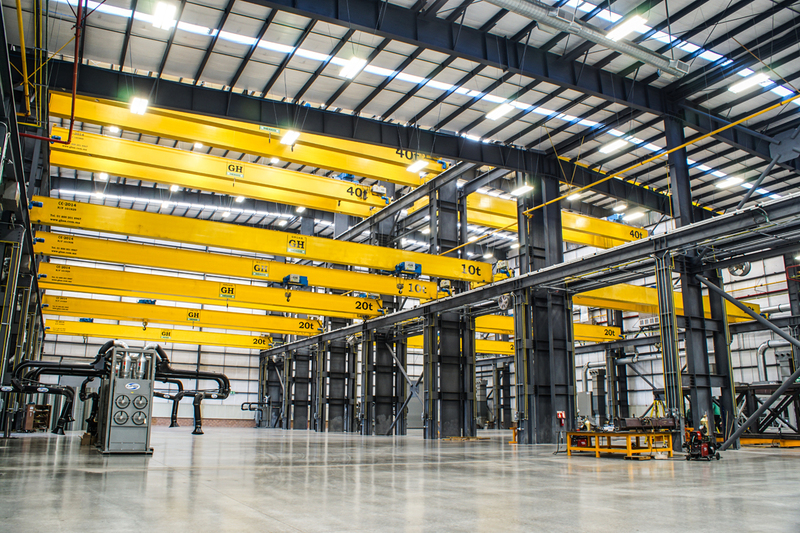 Customer: Confac. Place of installation: Dinamarca. 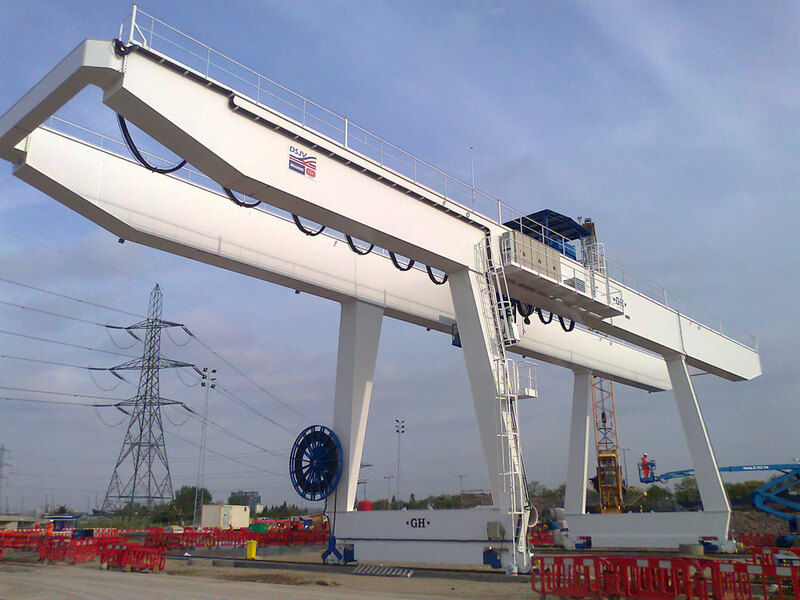 Capacity: 21t. 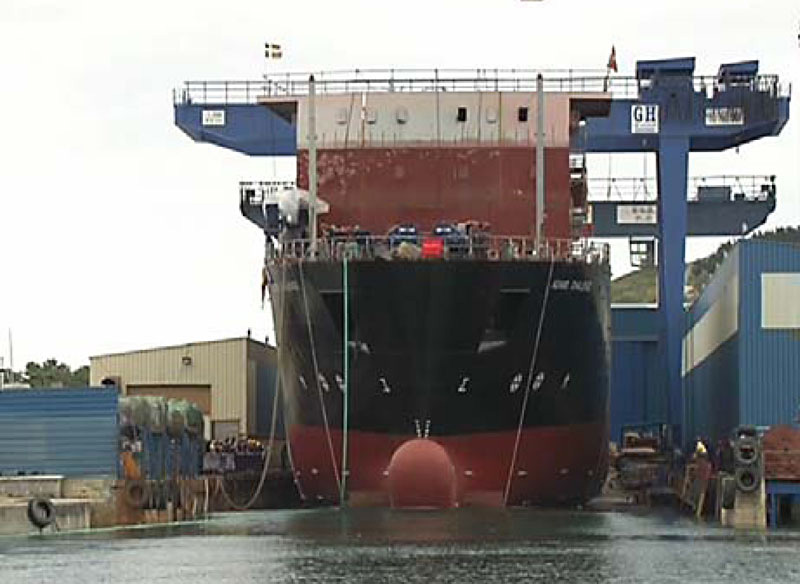 Span: 68,1m. 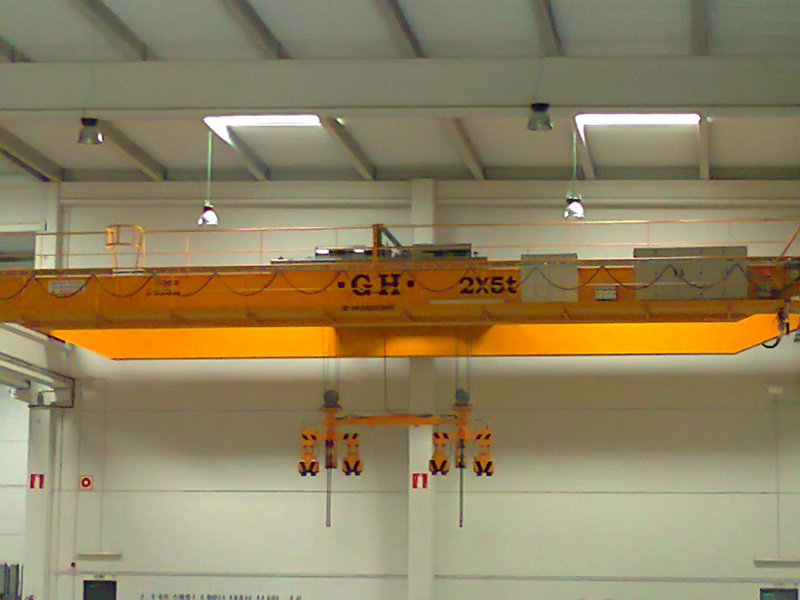 Lifting height: 21,2m. Customer: Cuel. Place of installation: Tailandia. 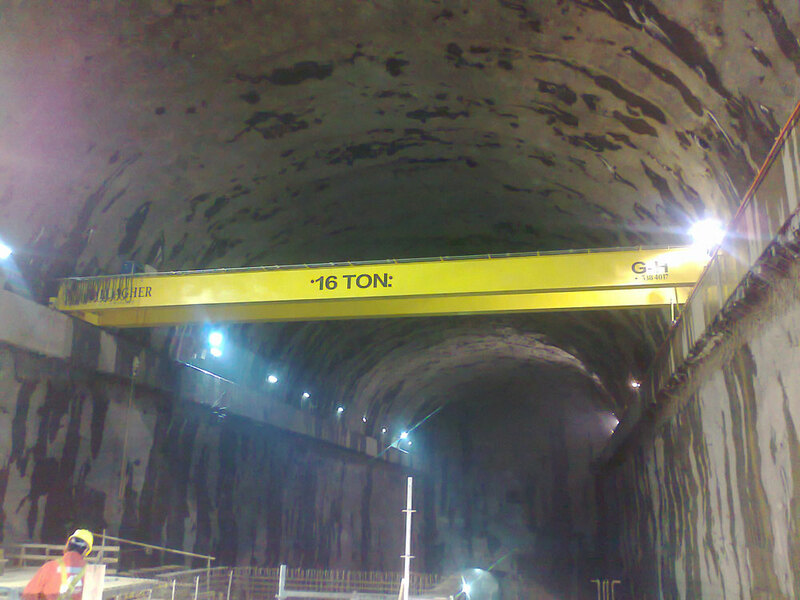 Capacity: 16t. 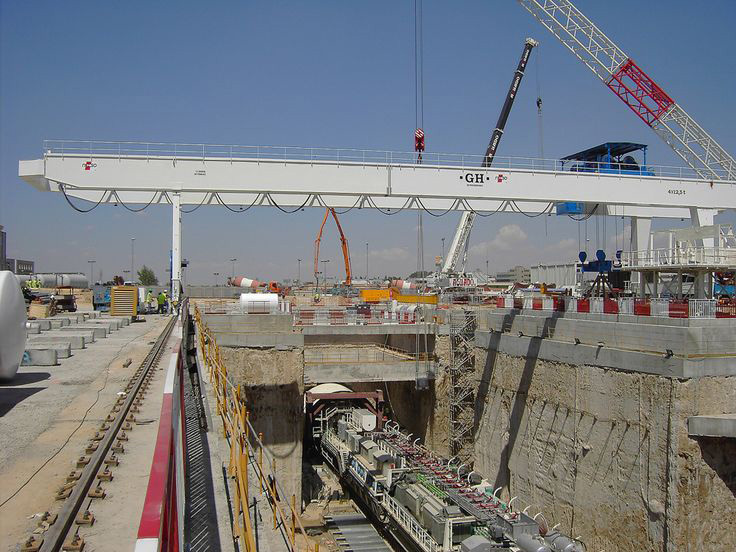 Customer: Odebrecht. Place of installation: Brasil. 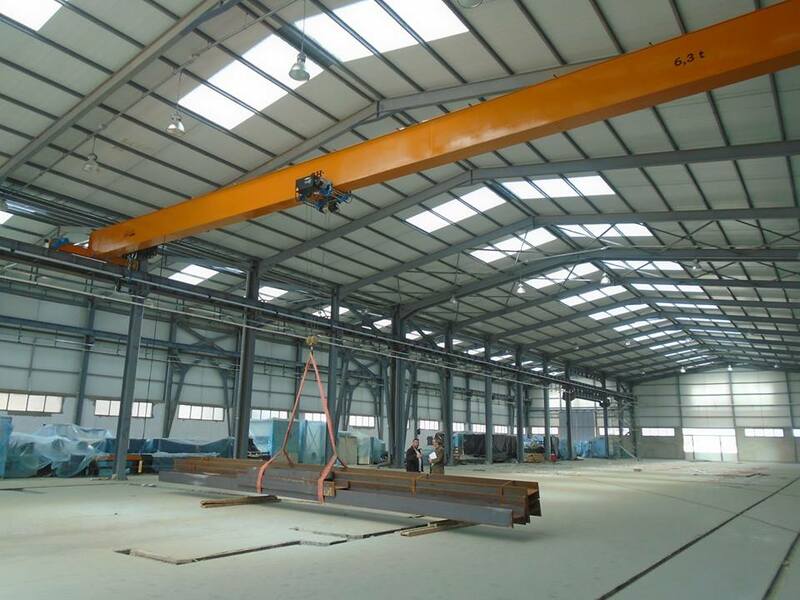 Capacity: 35t. 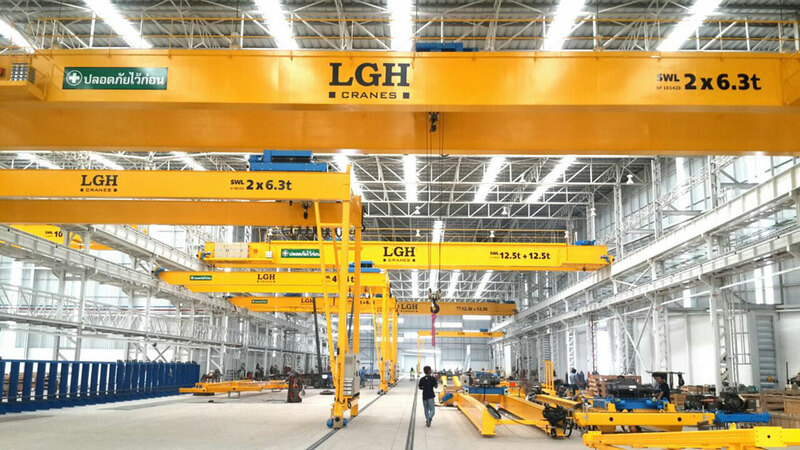 Customer: Lee Machinery (Thailand) CO., LTD.. Place of installation: Nonthaburi, Thailand. 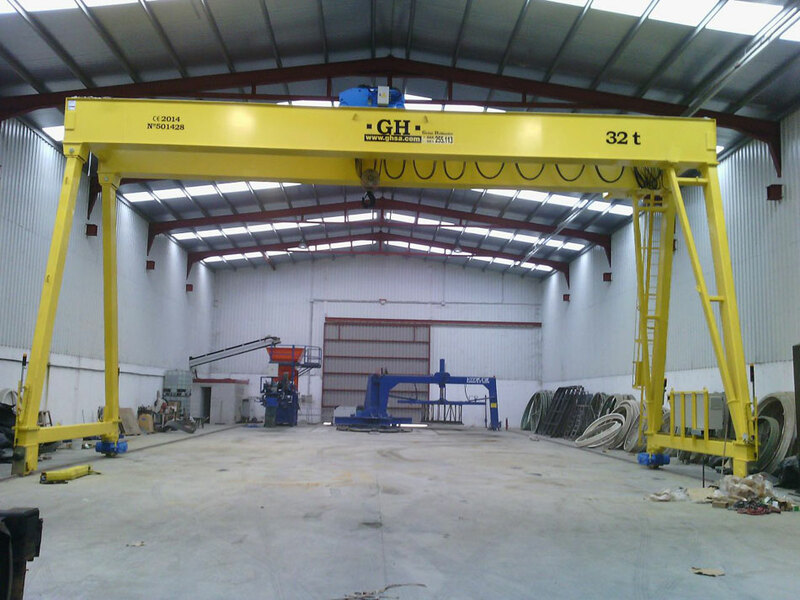 Capacity: 2x50t. Span: 37,27m. 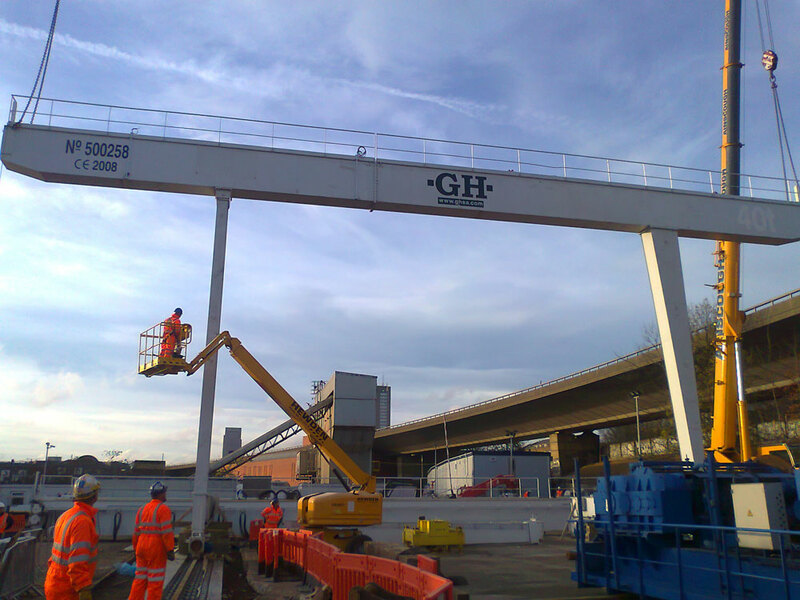 Lifting height: 18m. Customer: Giraud. Place of installation: Sudeste de Francia. Capacity: 8t. Customer: Austin. Place of installation: Perú. 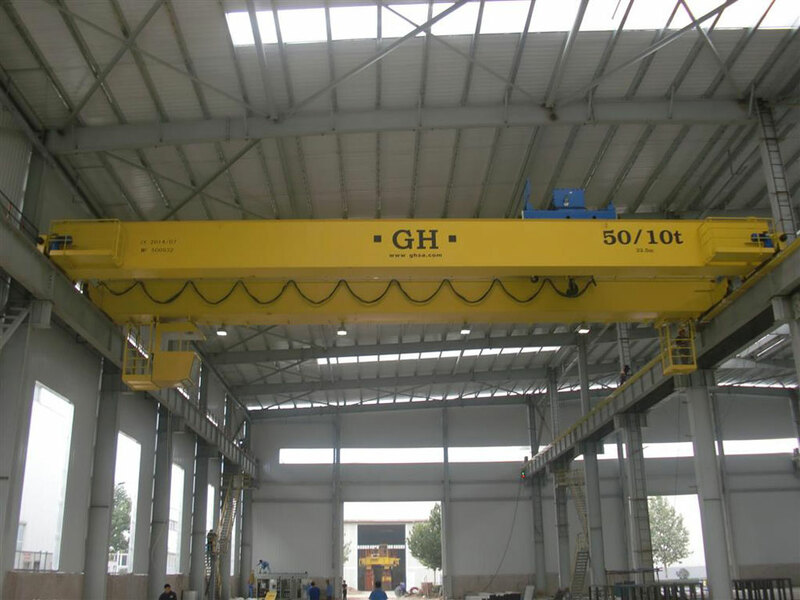 Capacity: 60/30t. Customer: Zamine. 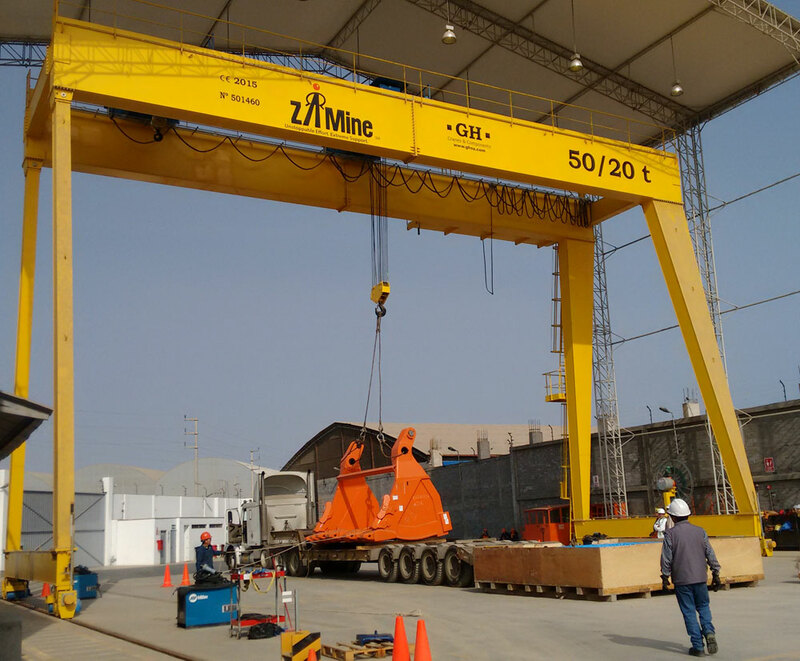 Place of installation: Lurin, Perú. 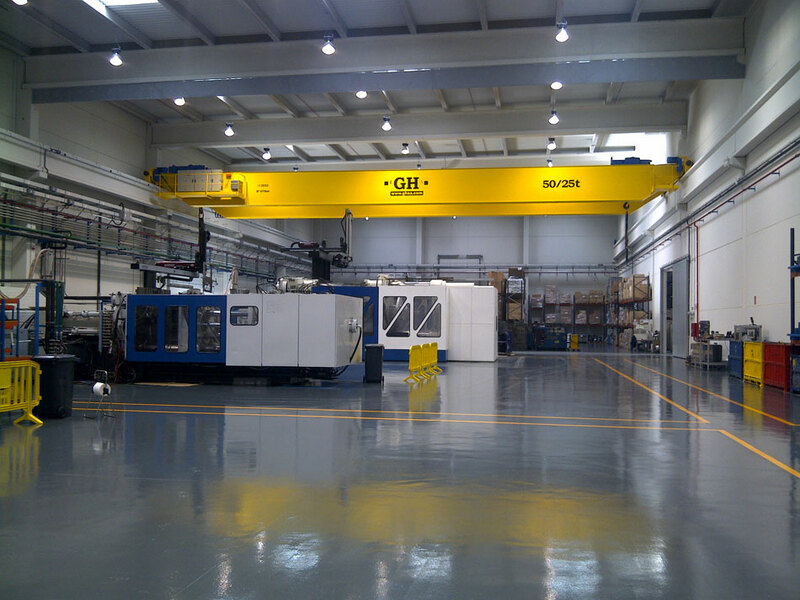 Capacity: 50/20t. Customer: Riobamba. Place of installation: Ecuador. 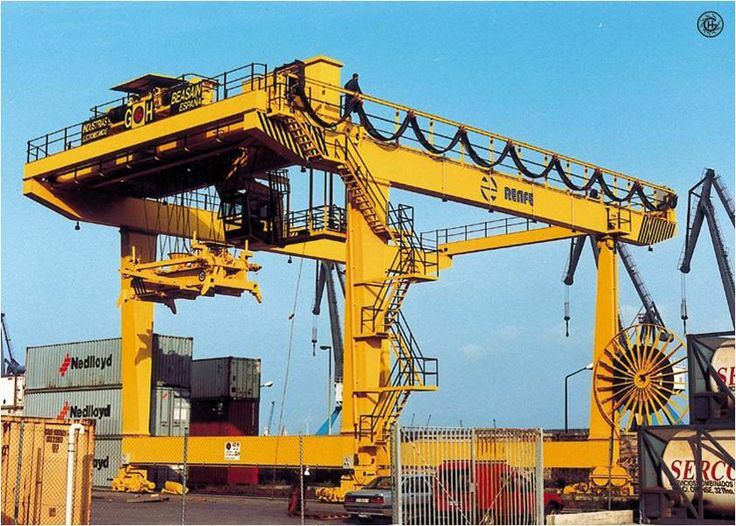 Capacity: 16t. 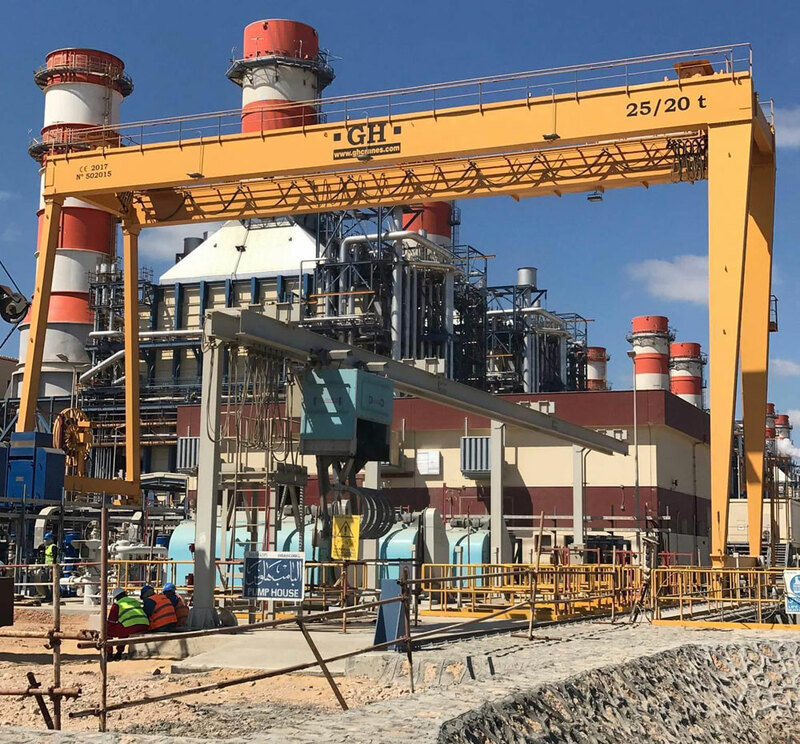 Customer: El Burullus Power Plant Project. Place of installation: Egipto. 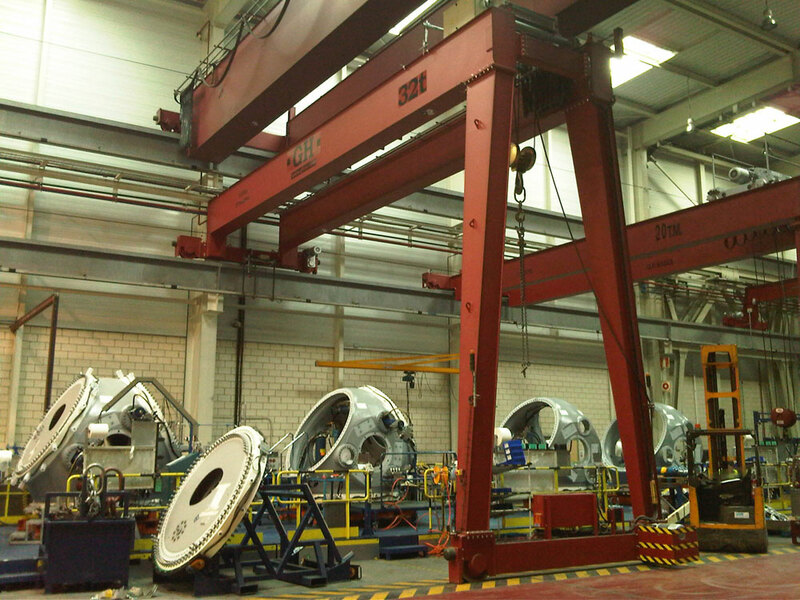 Capacity: 25/20t. Customer: UTE Olmedo. 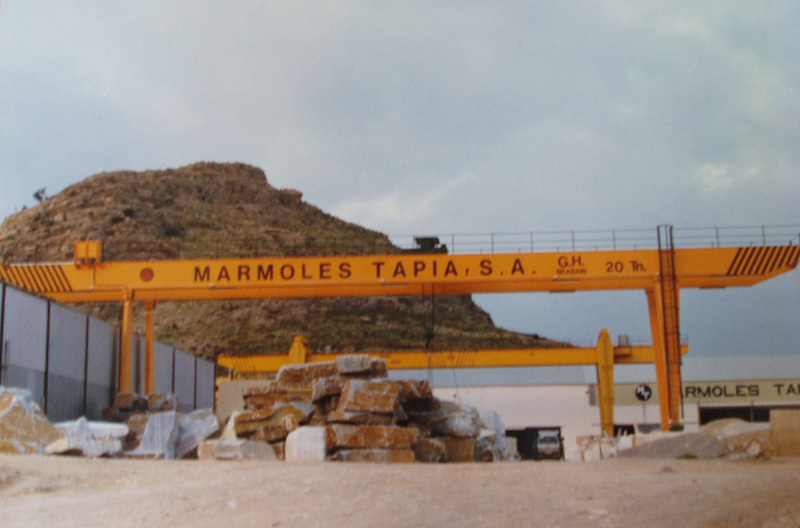 Place of installation: España. 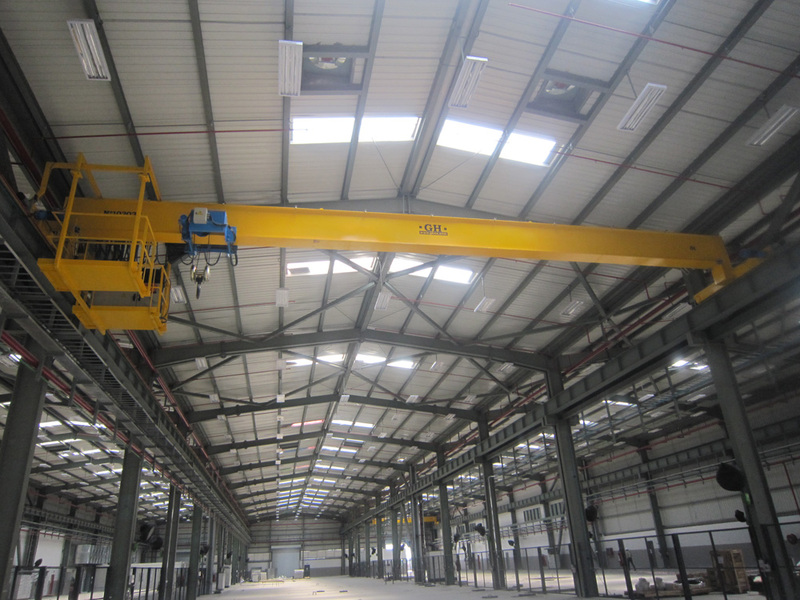 Capacity: 12,5t. Customer: Confac. Place of installation: Dinamarca. 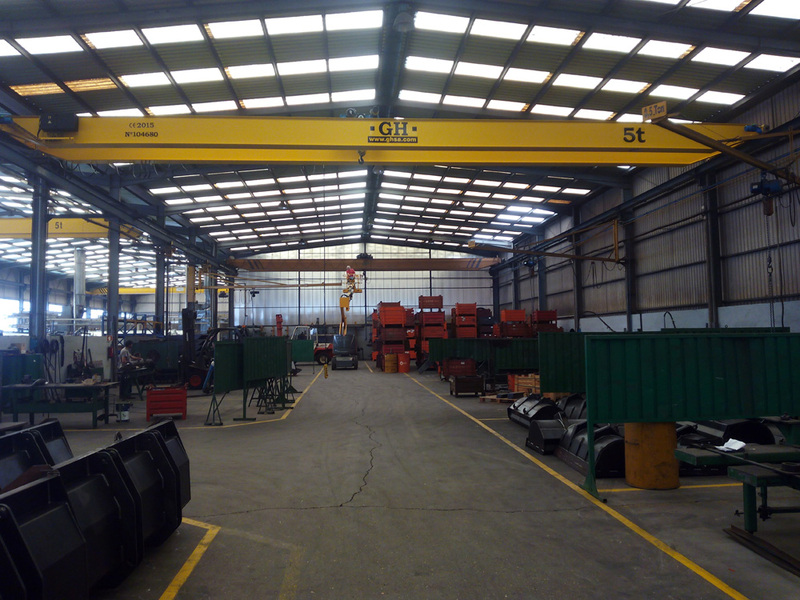 Capacity: 25t. 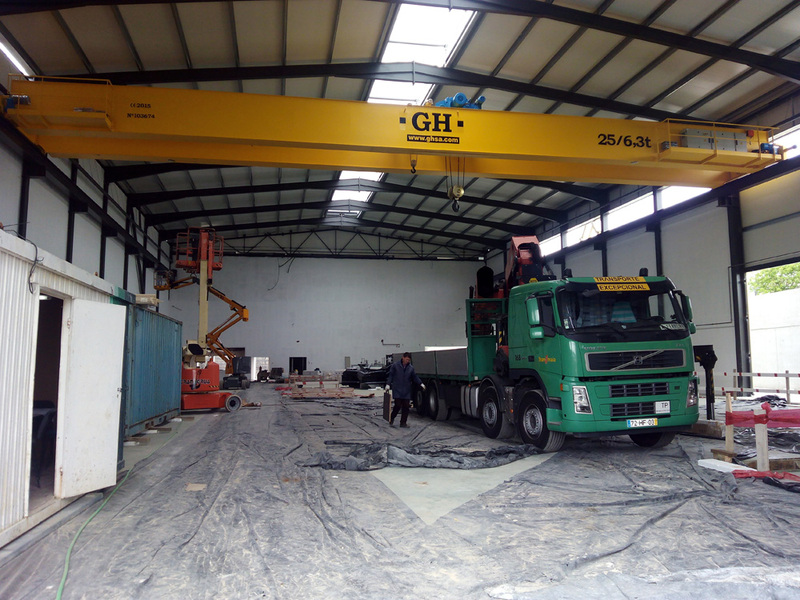 Customer: Imagro Construction SRL. Place of installation: Egipto. 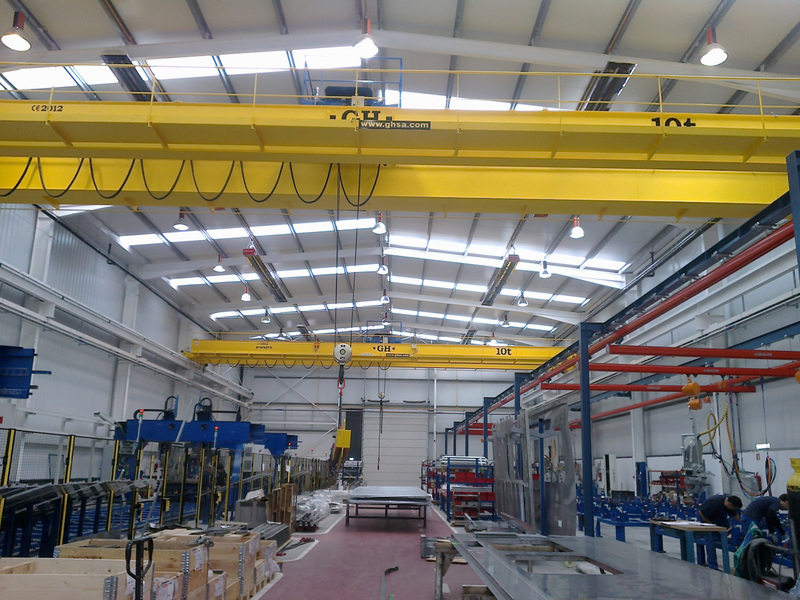 Capacity: 25/20t. Span: 27,2. 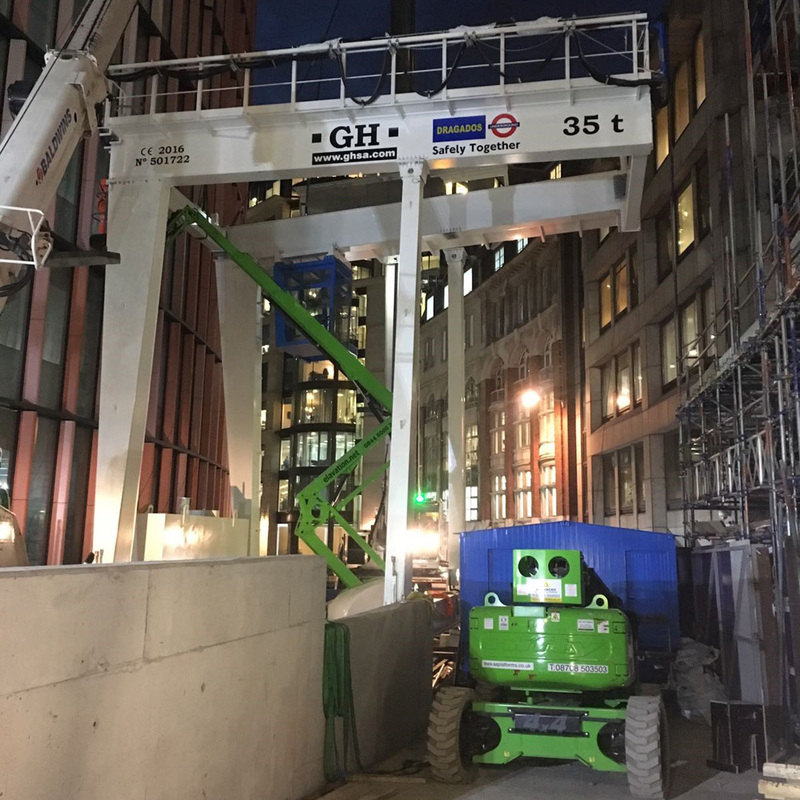 Lifting height: 25,5. Customer: DBJV. 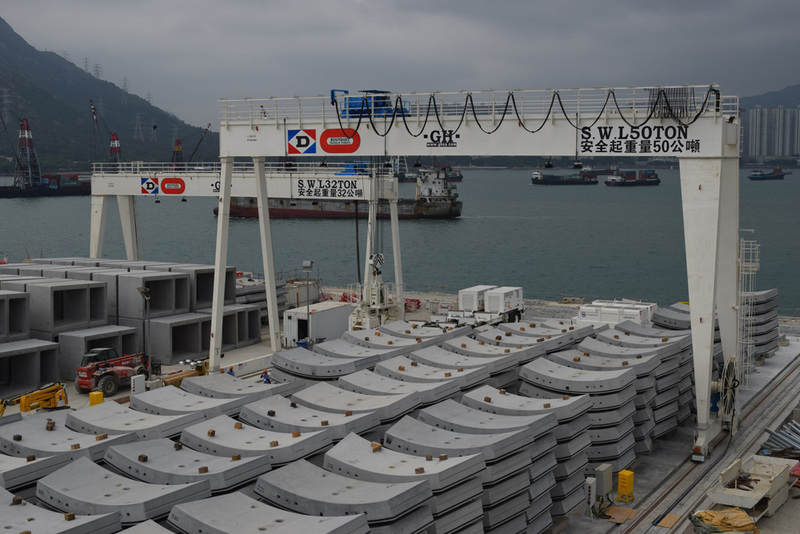 Place of installation: Hong Kong. 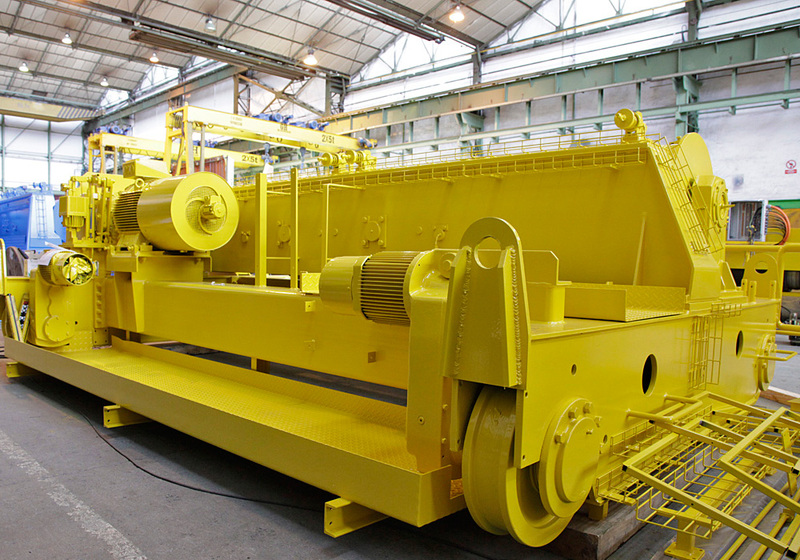 Capacity: 50t + 32t. 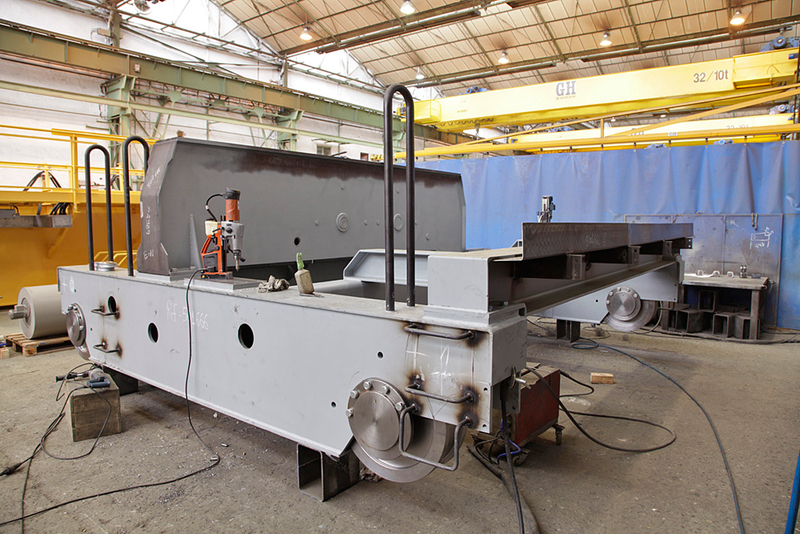 Customer: Bemo Rail. 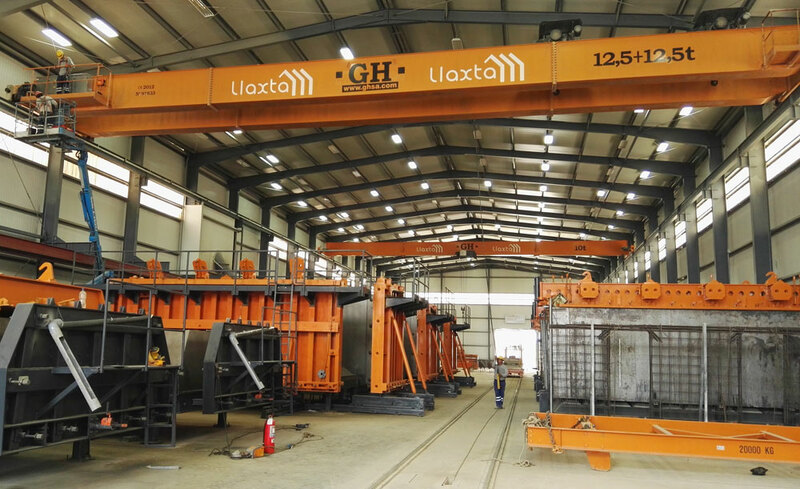 Capacity: 20+20t. Customer: Epce. 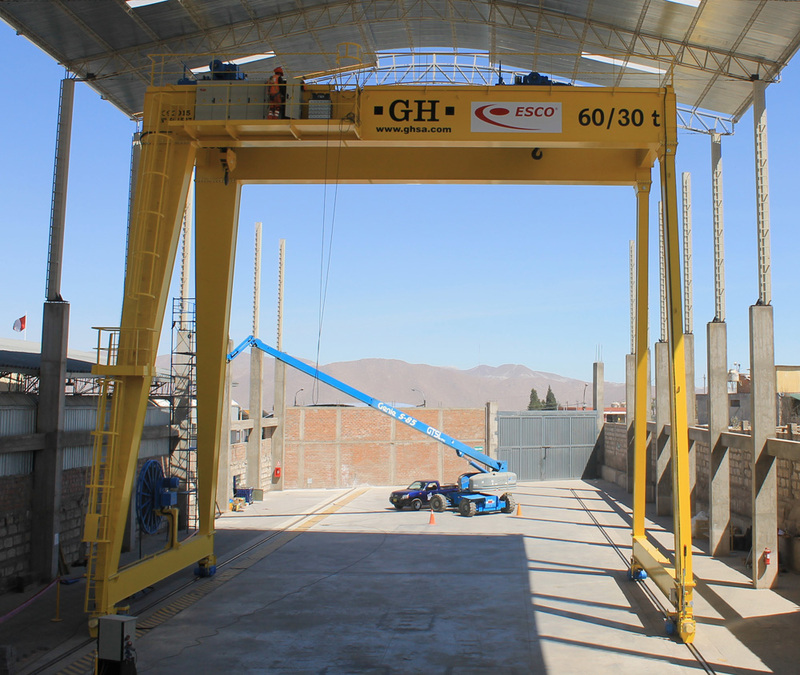 Place of installation: Riobamba, Ecuador. 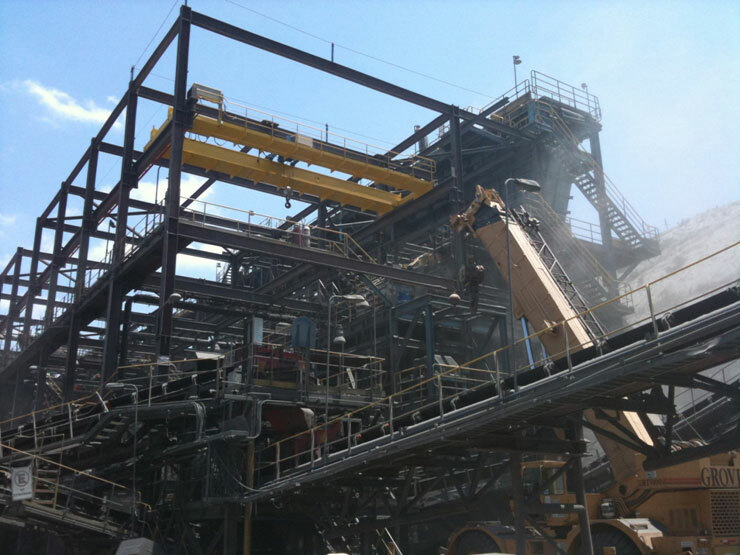 Capacity: 16t. Customer: Esco. 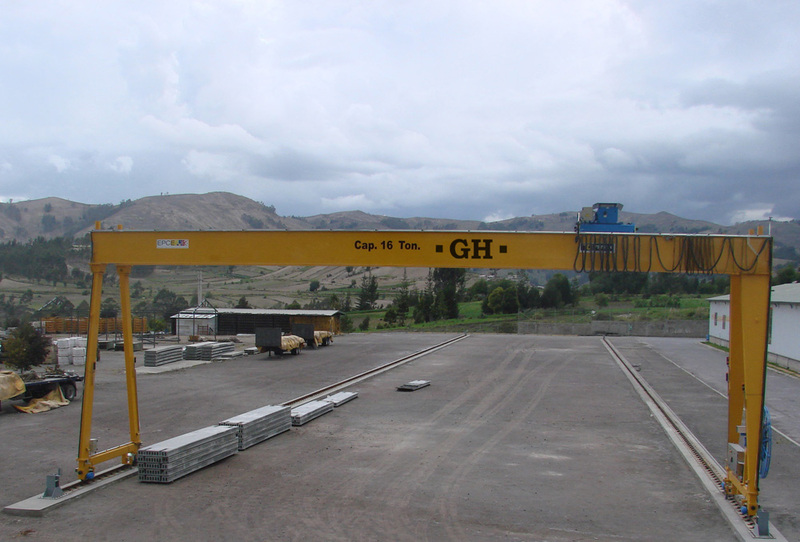 Place of installation: Cajamarca, Perú. 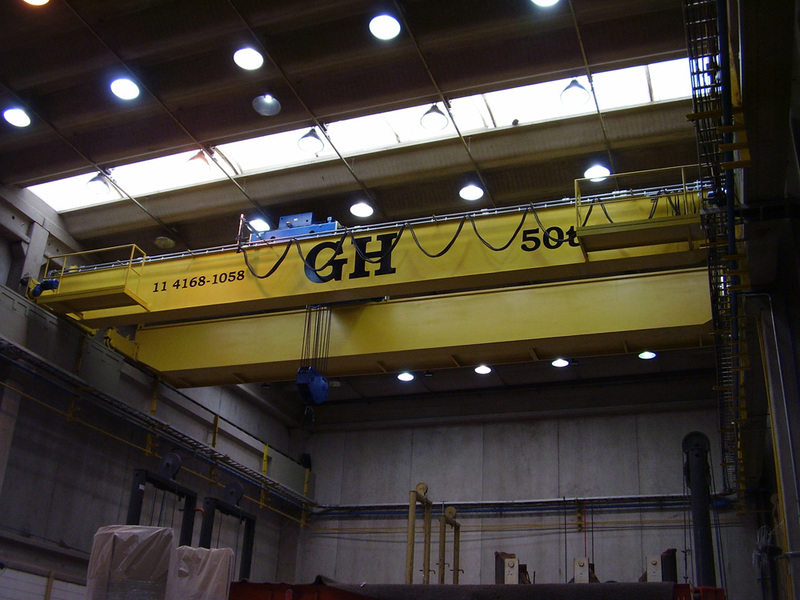 Capacity: 60/30t. Customer: Zamine. Place of installation: Lurín, Lima, Perú. 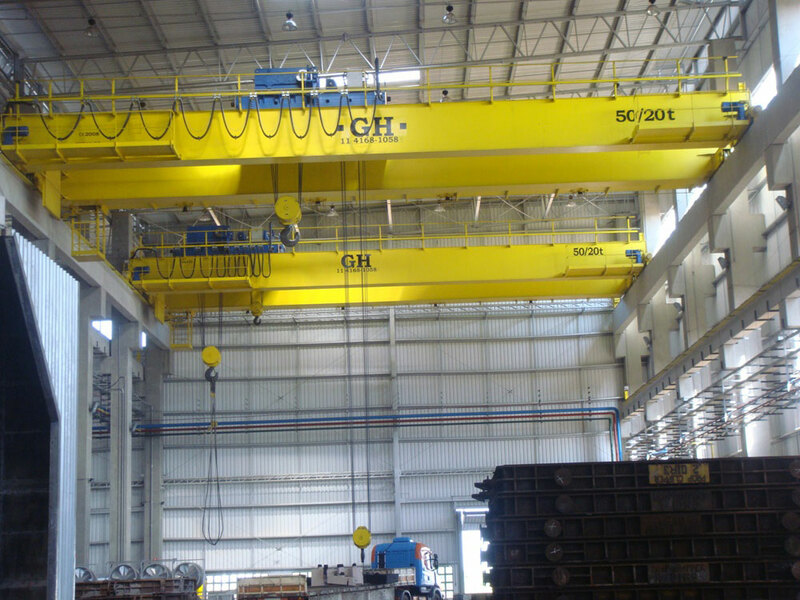 Capacity: 50/20t. 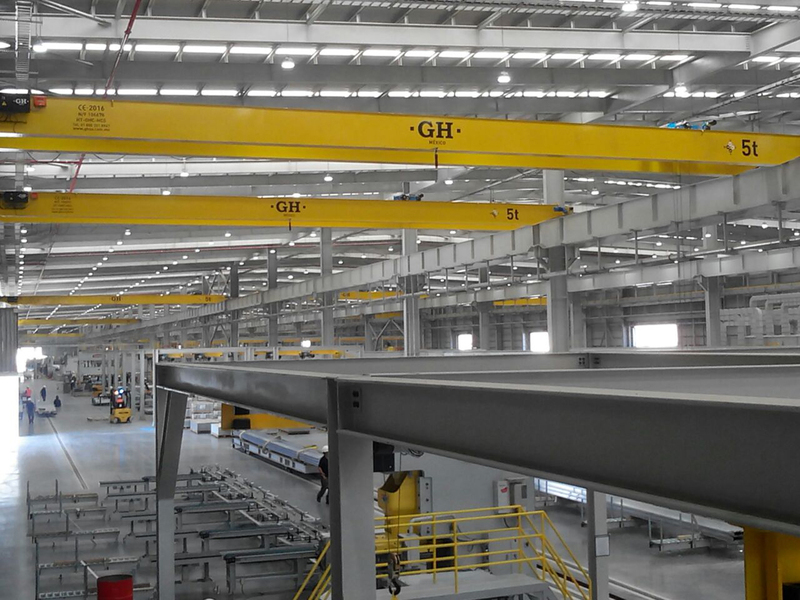 The Saudi Arabian high-speed line goes from Mecca to Madina via Jeddah, where GH CRANES & COMPONENTS has assembled two twin gantry cranes that supply the rail welding line (they join together 50 metre rails using a special welding technique to form a rail of 300 metres). 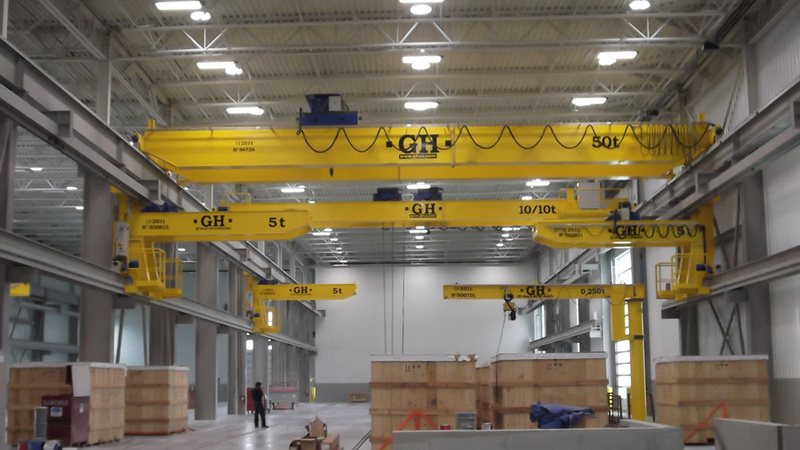 Once welded, these are stored by means of the 22 fixed gantry cranes that have also been assembled. 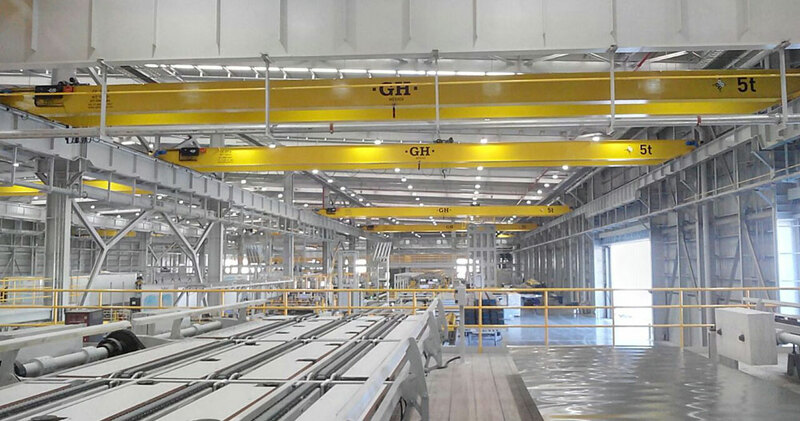 There are also two other twin gantry cranes for the assembly of switches, each twin gantry crane carrying 250 metres of shielded line. 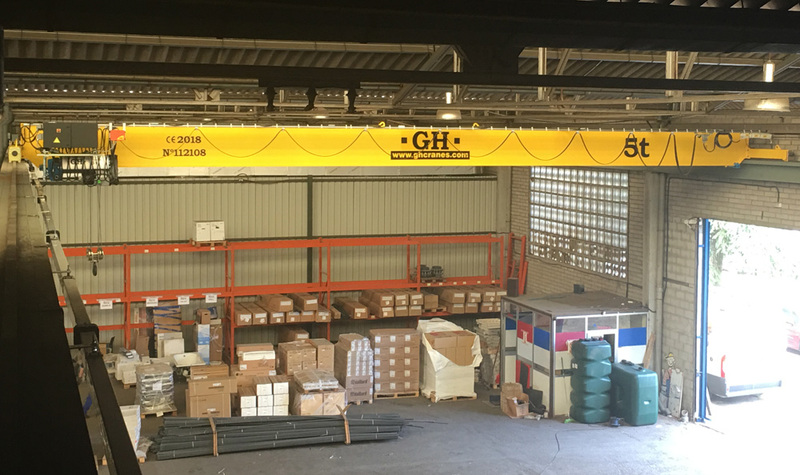 Gantry crane with cantilevers with hoists of 50t of lifting capacity for the Vasco Gallega de Consignaciones, S.A. customer. 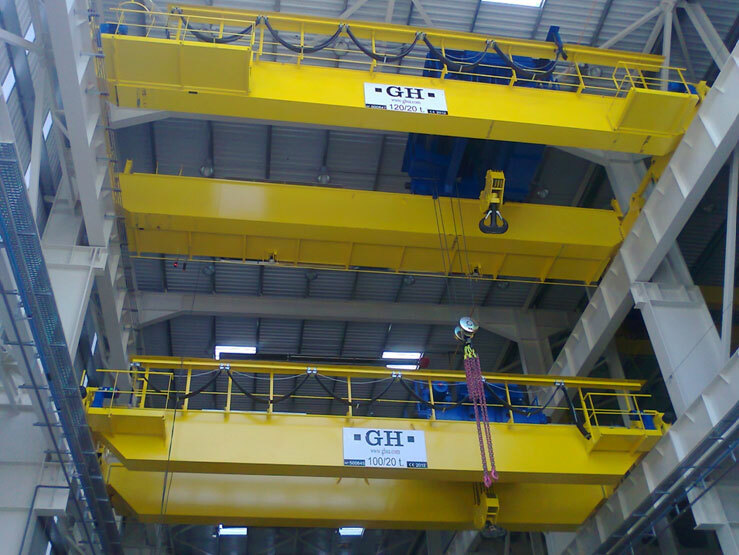 Gantry crane with cantilevers with 40t lifting capacity hoist for M+Q customer. 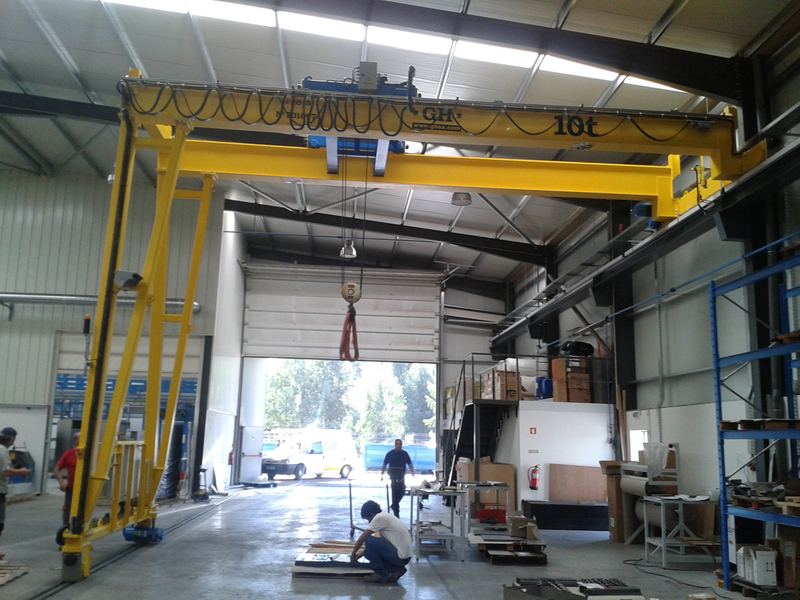 Gantry crane with cantilevers with 10t lifting capacity hoist for Mármoles Alzamora customer. 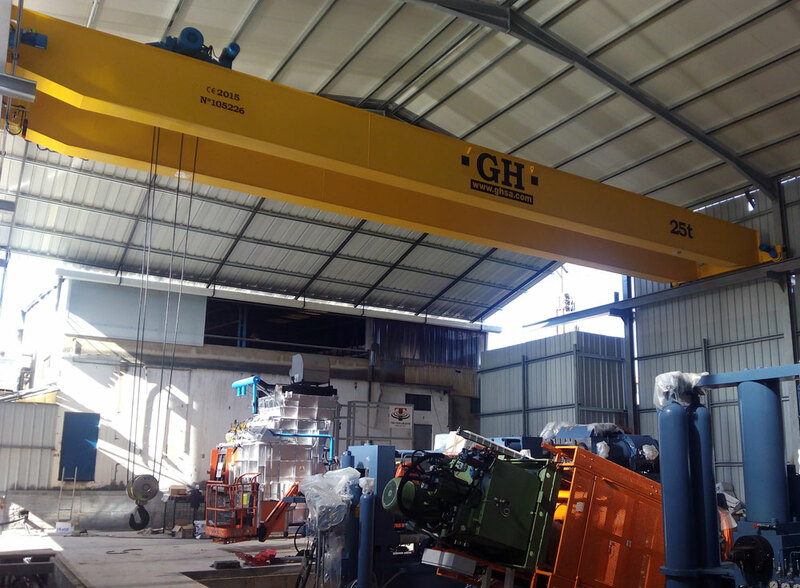 Gantrycrane with 25t lifting capacity hoist for Farpedra customer. 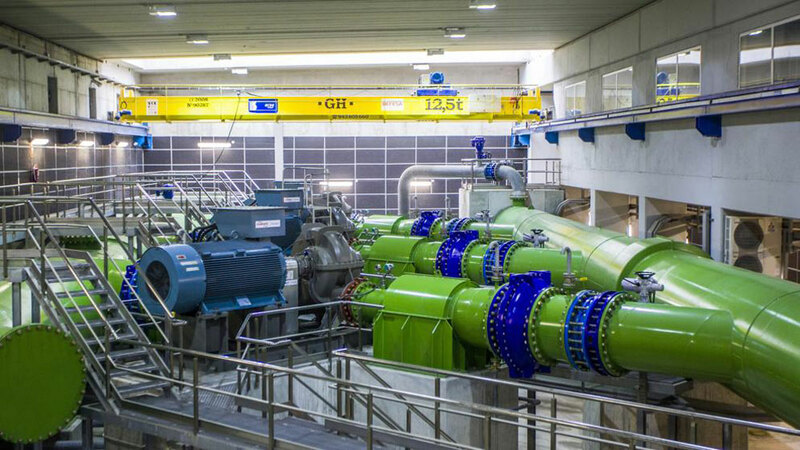 Grúa pórtico con 80t de capacidad de elevación para cliente Dragados - Cyes U.T.E. Grúa pórtico con voladizos con 20t de capacidad de elevación para cliente Hnos Arriaga Cruz. 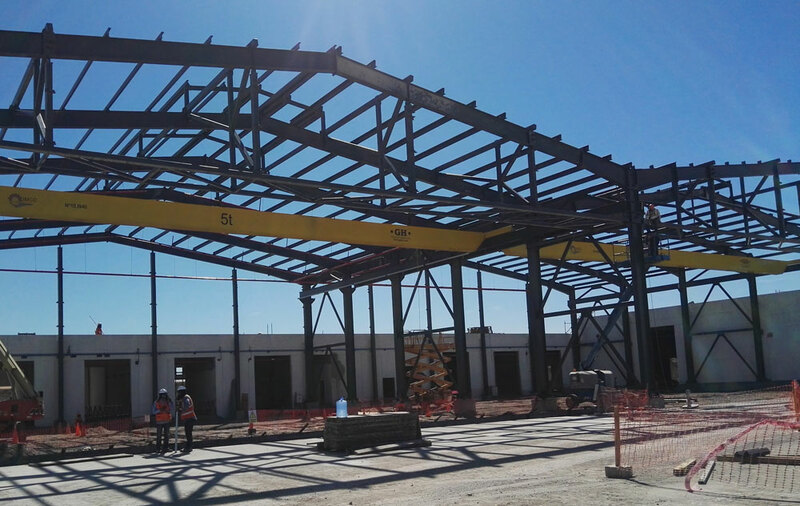 Grúa pórtico con voladizos con 20t de capacidad de elevación para cliente Marmoles Tapia, S.A.
Grúa pórtico con 25t de capacidad de elevación para cliente Marnorte. 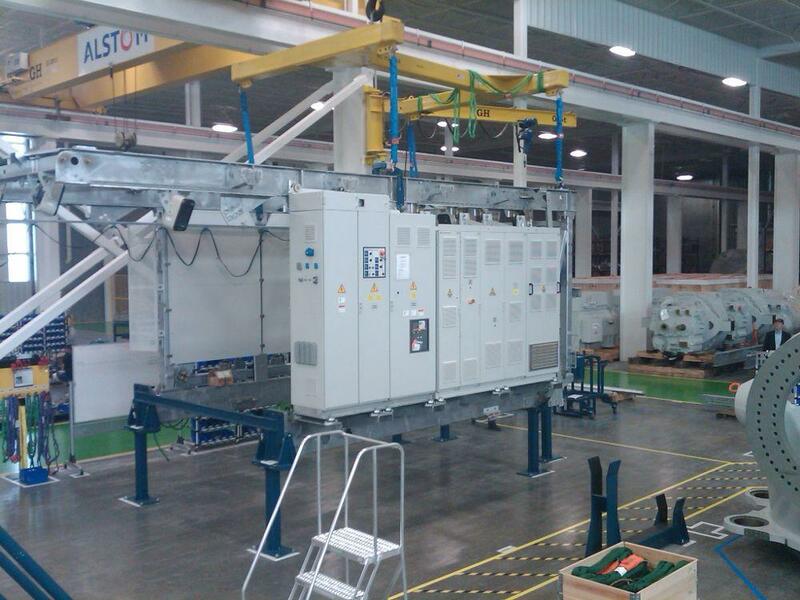 Grúa ménsula con polipasto de 120t de capacidad de elevación para cliente Siemens. 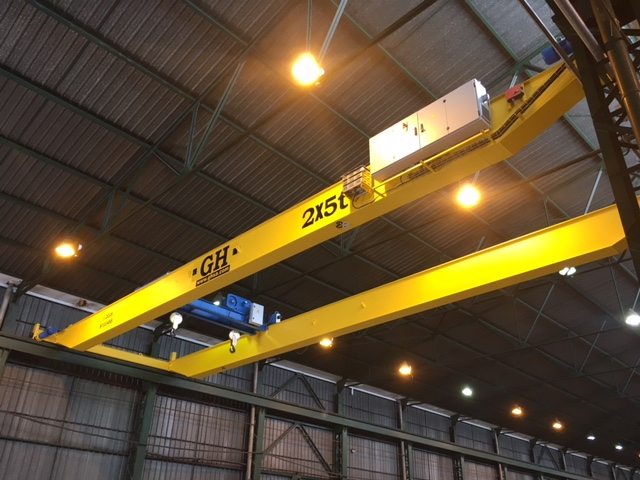 Gantry crane with two cantilevers and with hoists of 80t, 160t and 10t of lifting capacity for Astilleros Balenciaga customer. 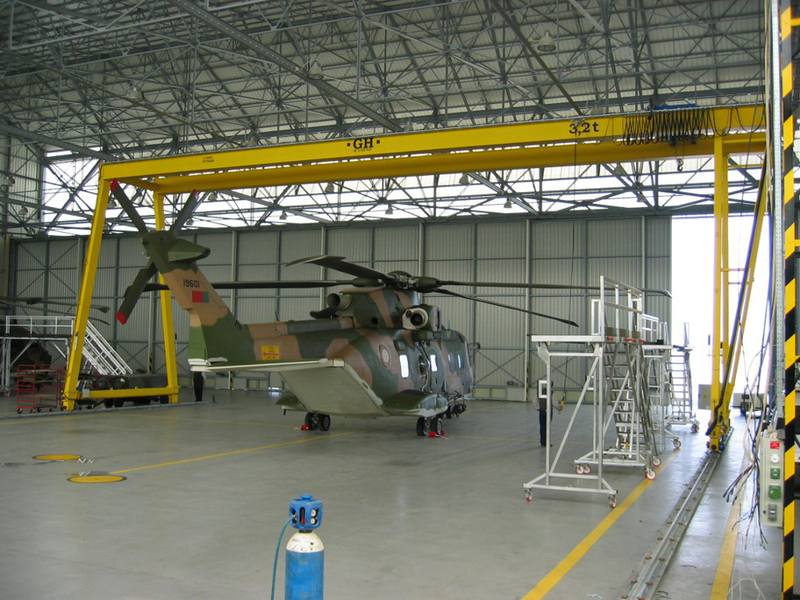 Gantry crane of 3,2t lifting capacity hoist for Fuerzas Aéreas of Portugal. 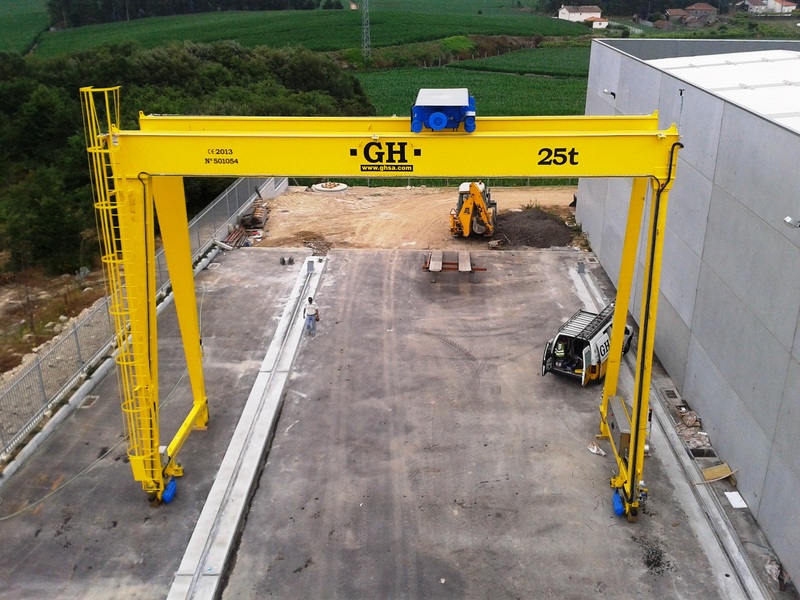 Goliath cranes with a 8t hoist in France. 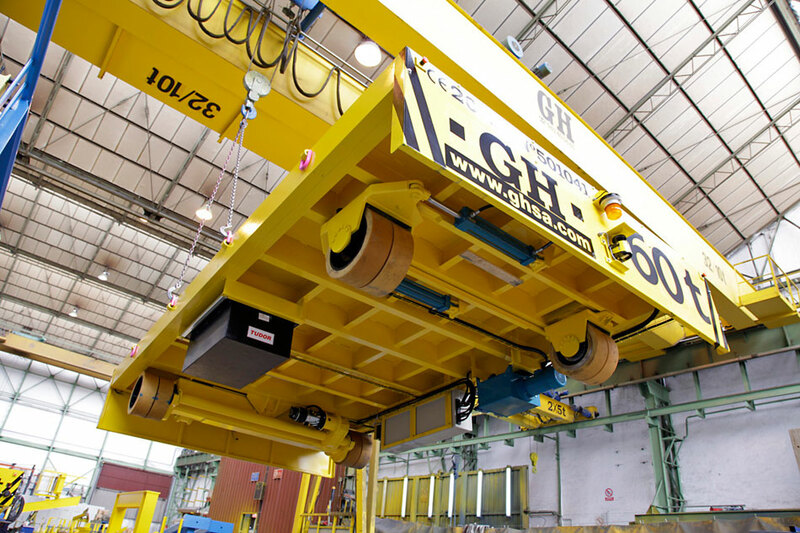 Some gantry cranes with different lifting capacities in London. 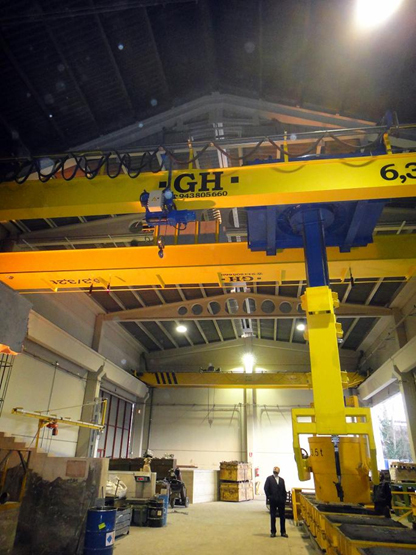 Goliath crane with several 15t hoists for OHL in Poland. 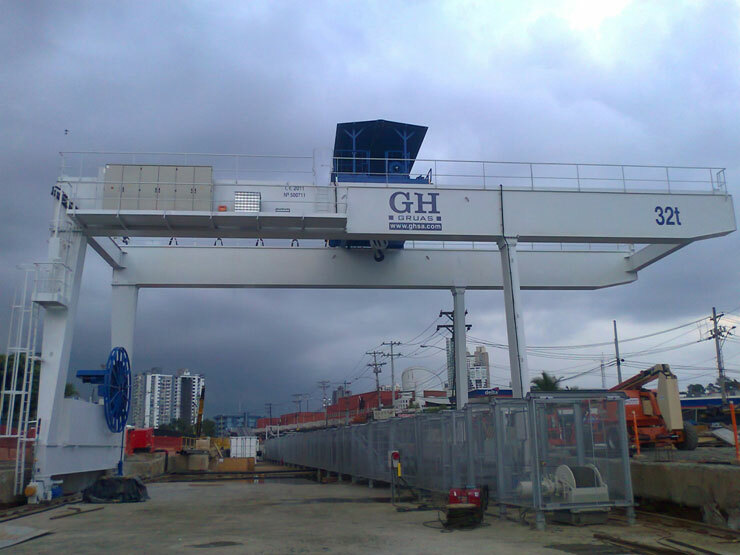 Gantry crane for France with a 12.5t hoist. Grúas pórtico con polipasto de 8t en Francia. 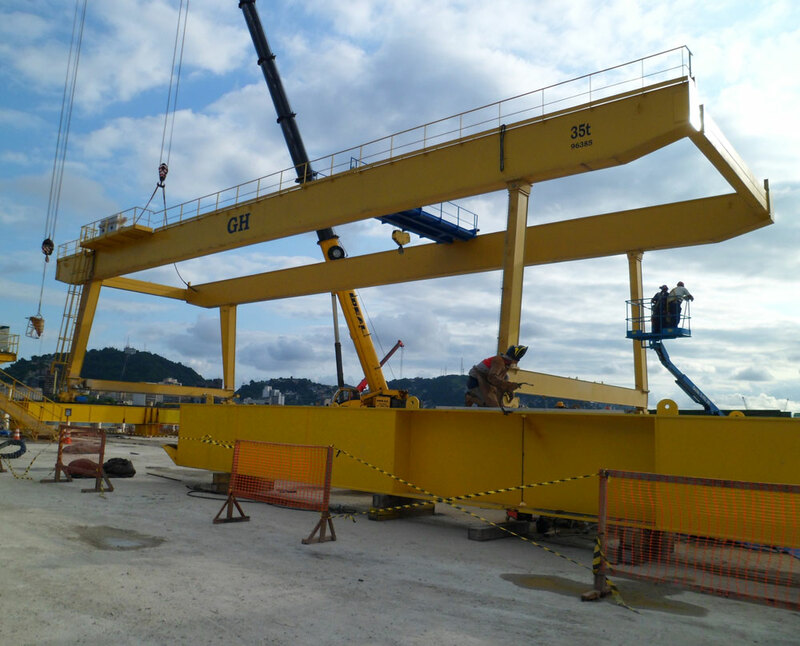 Portal crane with a 32t hoist in Panama. 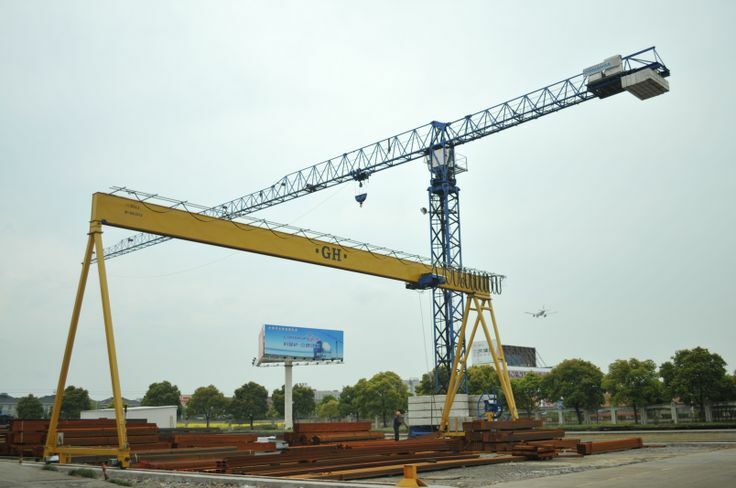 Goliath crane with a 20t for Thailand. 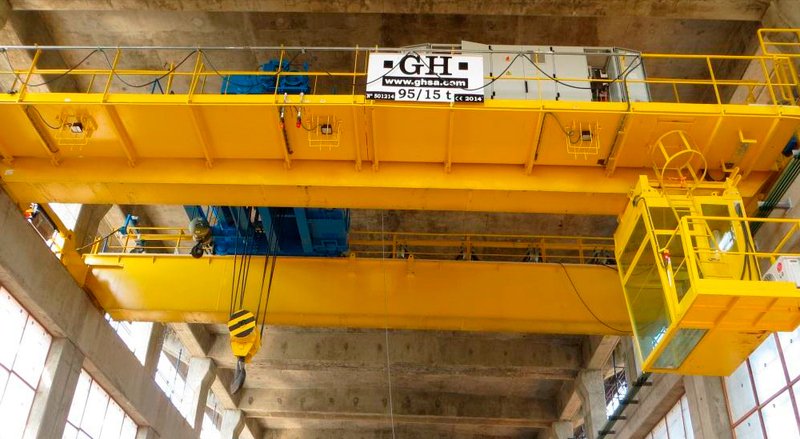 Gantry crane with a 36t hoist for Speco in Mexico. 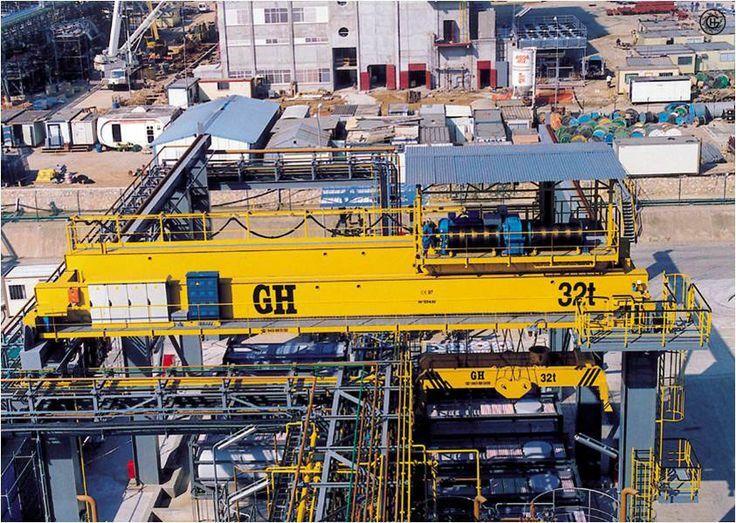 Gantry crane with a 30t hoist in Hong Kong. 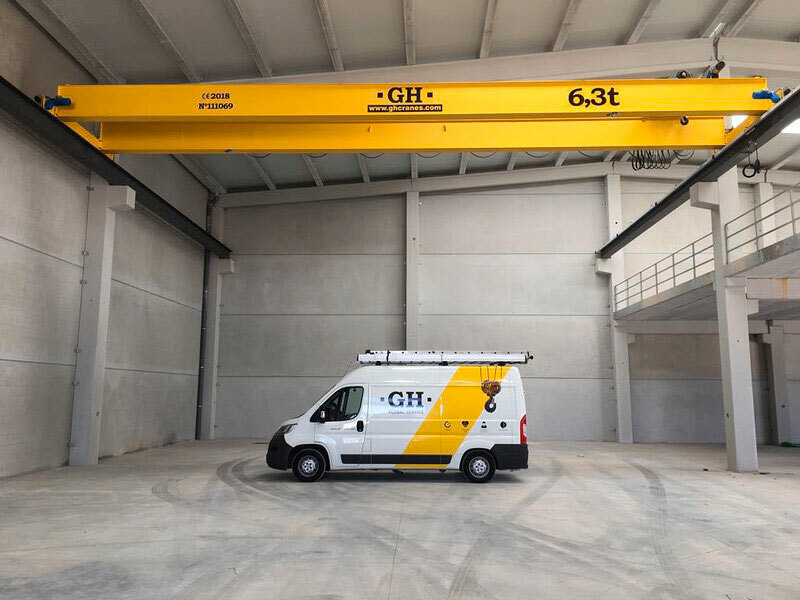 Goliath crane with 12.5t hoist for Adif. 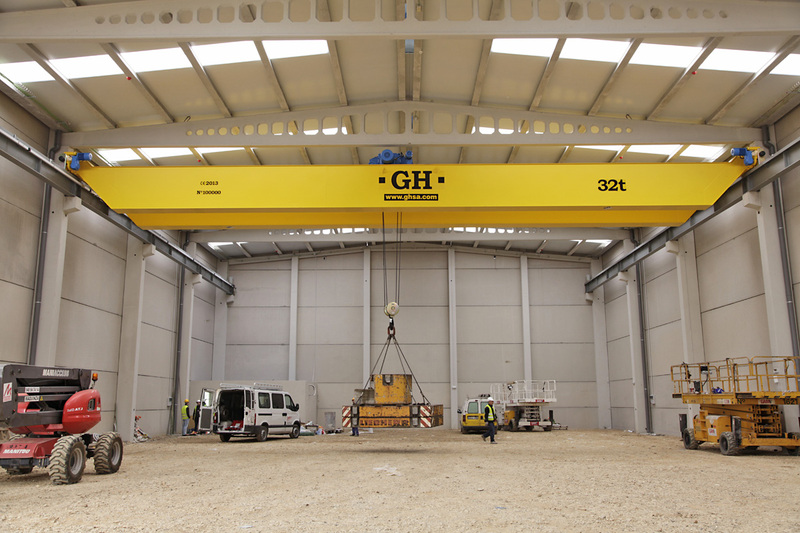 Goliath crane for Gallardo with two 20t hoists. 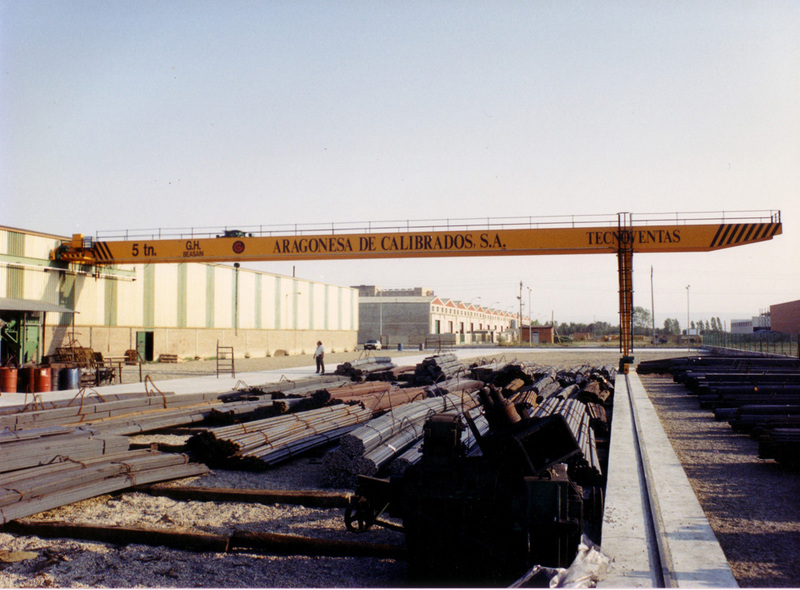 Semigantry crane for Grupo Conado for steel works. 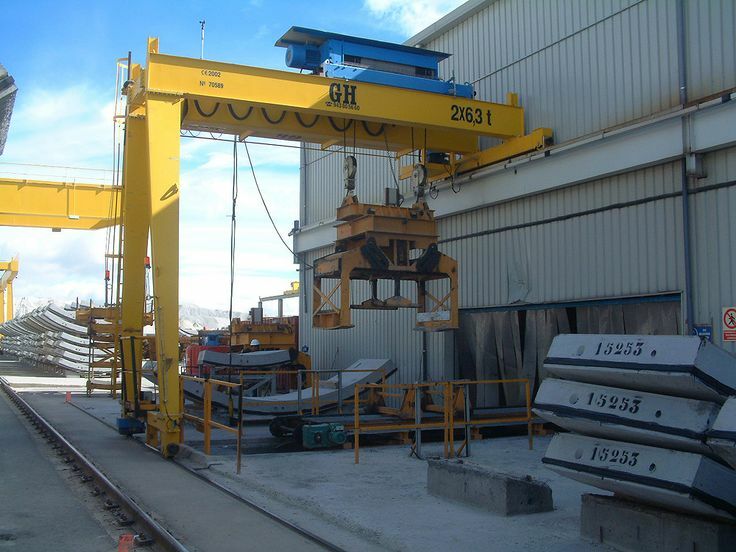 Portal crane for stone manipulating processes with 63t hoist. 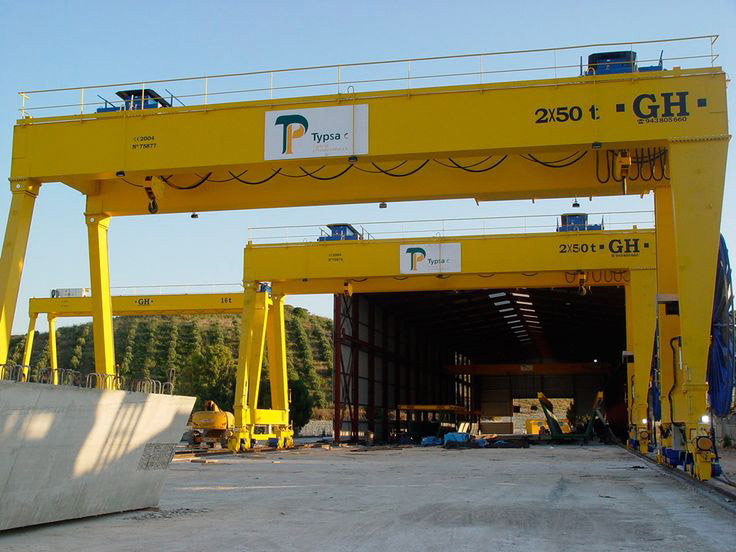 Portal crane for Typsa with two 50t hoist each. 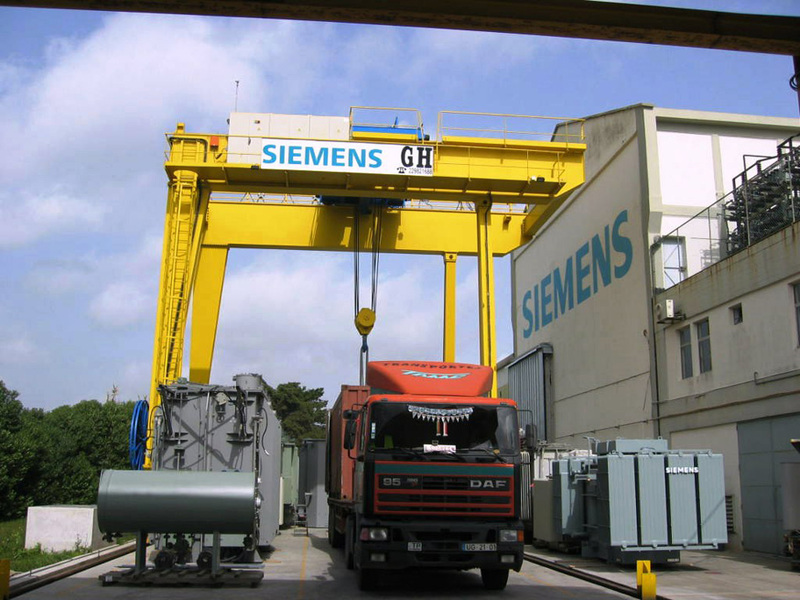 Gantry crane for Siemens with 12 t capacity hoist. 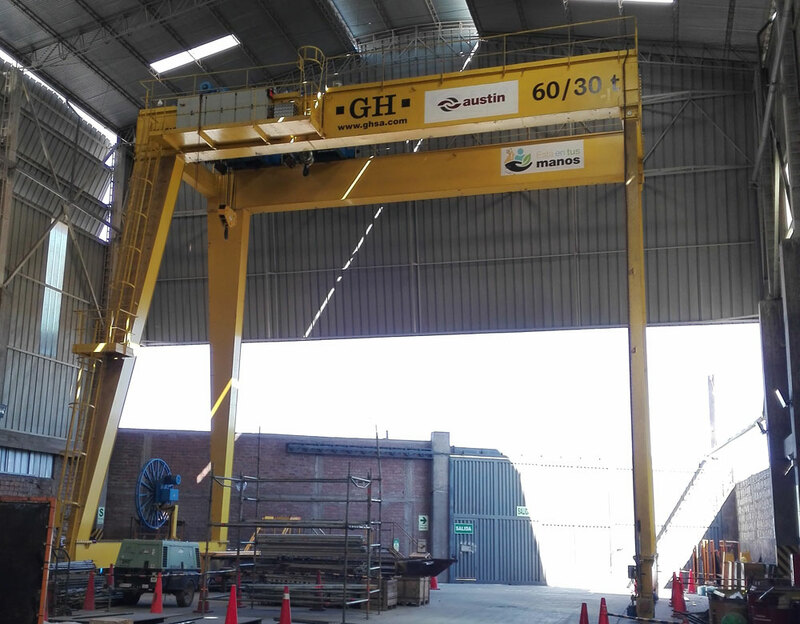 Goliath cranes 35t in installations Korean company SPECO WIND in Monclova MEXICO. 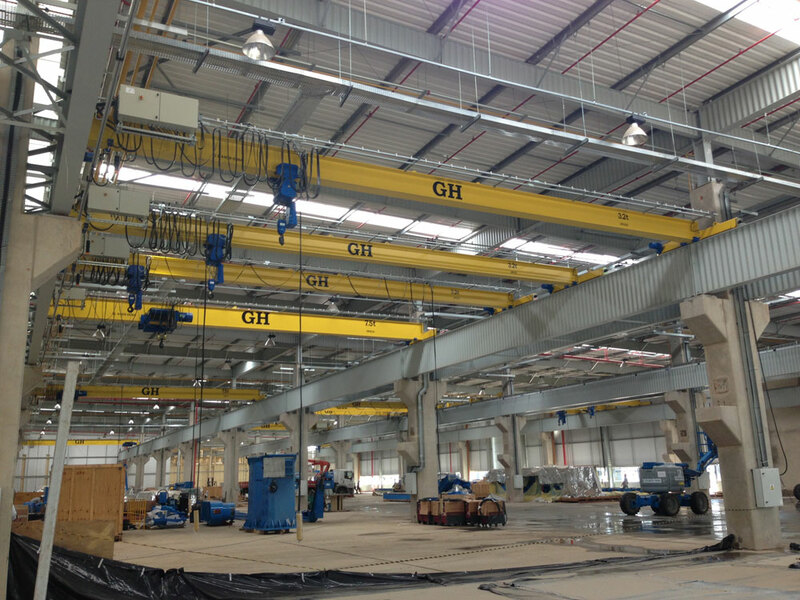 Installation of some GH Cranes & Components semi gantry cranes and EOT cranes. 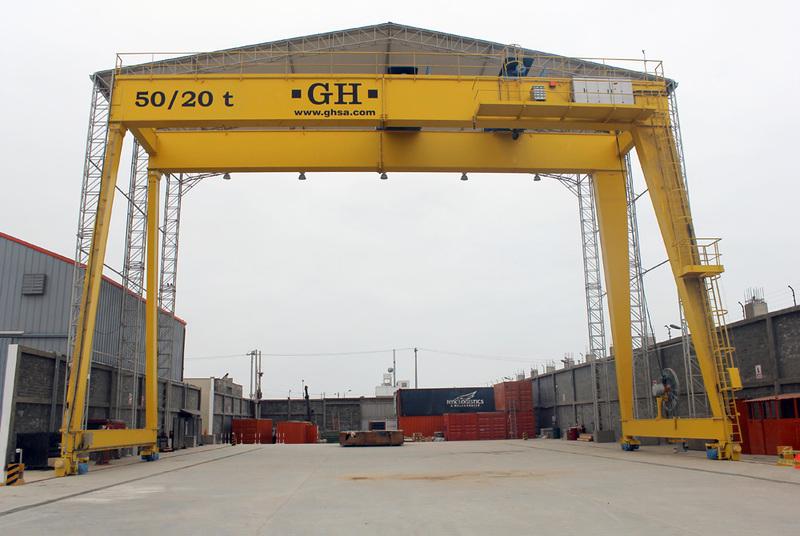 GH Cranes & Components gantry crane for the application of containers manipulation. 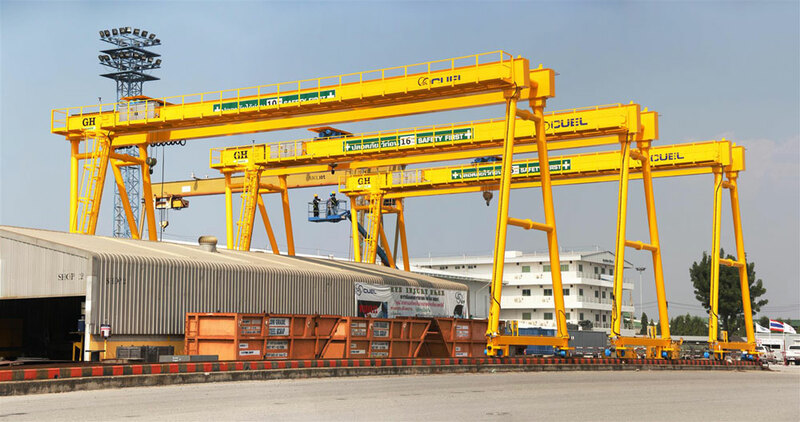 Installation of GH Cranes & Components gantry crane for the application of containers manipulation. 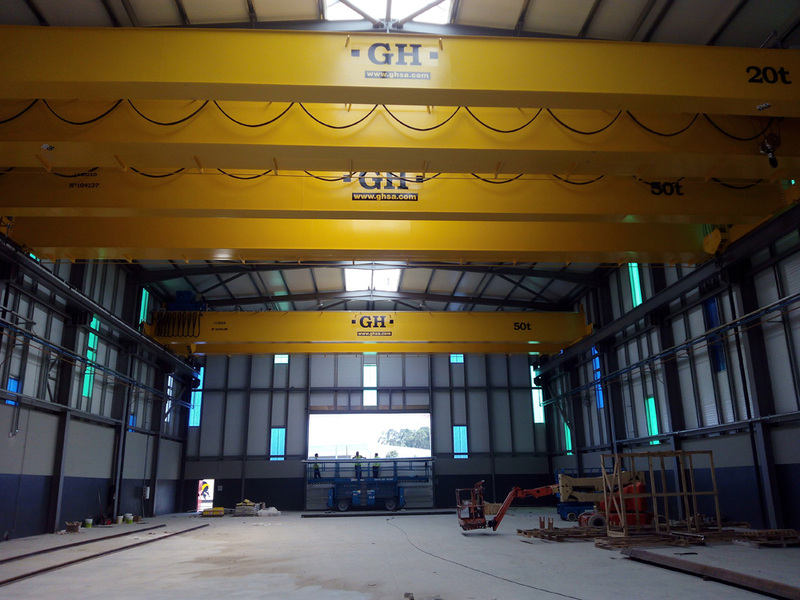 Installation of gantry GH CRANES & COMPONENTS Cranes & Components in the shipyard industry to manufacture and maintenance of vessels. 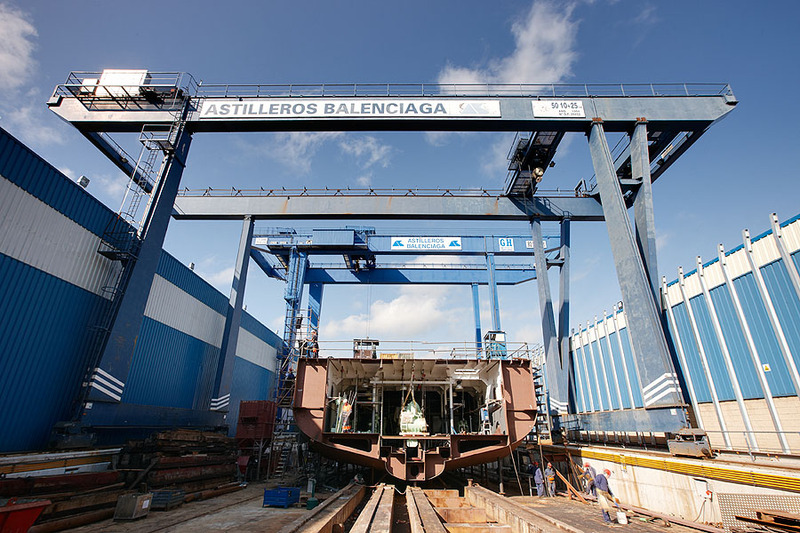 Astilleros Balenciaga. 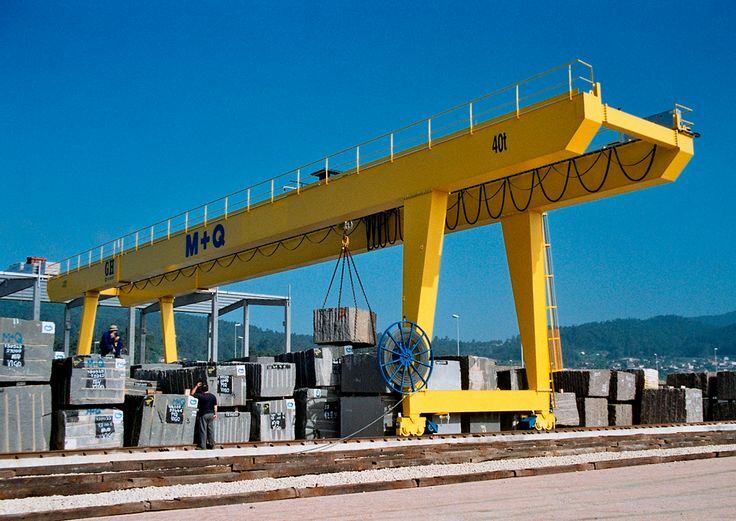 GH Cranes & Components gantry cranes for shipyards for the fabrication and maintenance of ships. Customer: Astilleros Balenciaga. 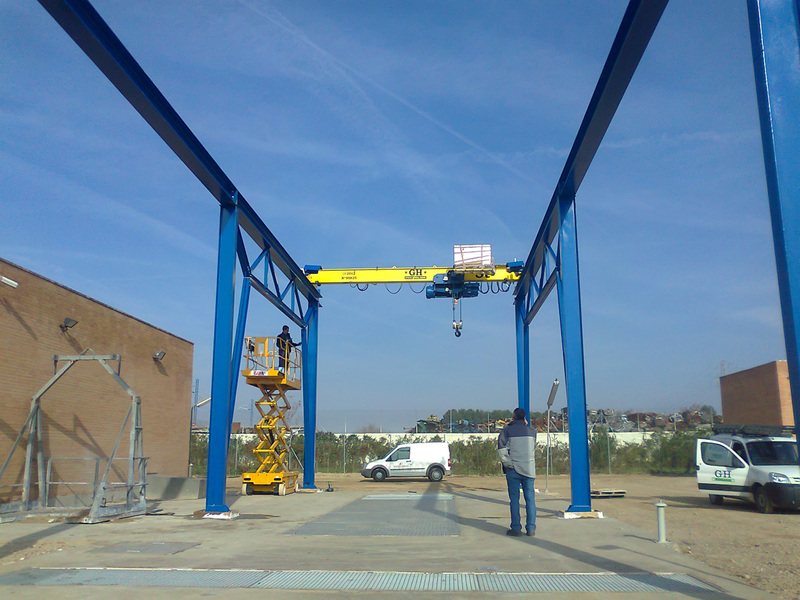 Installation of gantry cranes for ADIF. 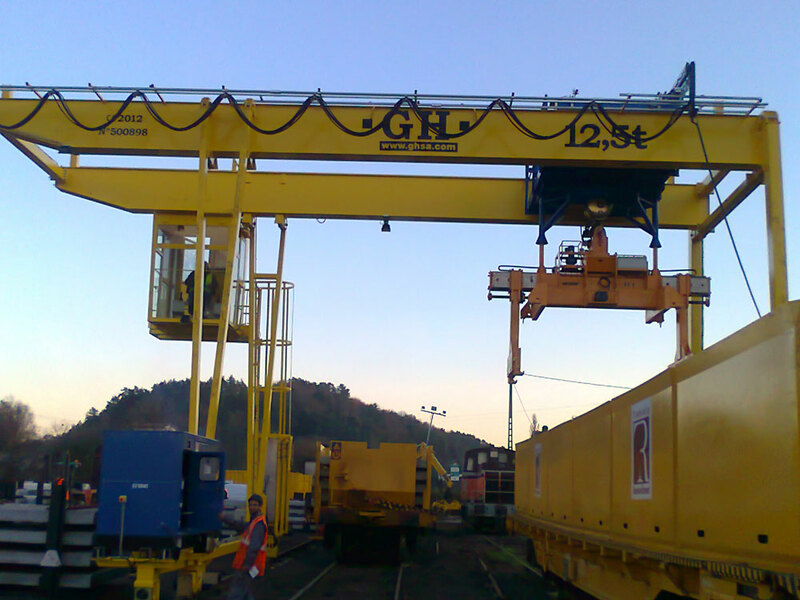 Instalation of a GH CRANES & COMPONENTS portal cranes for railway installation. 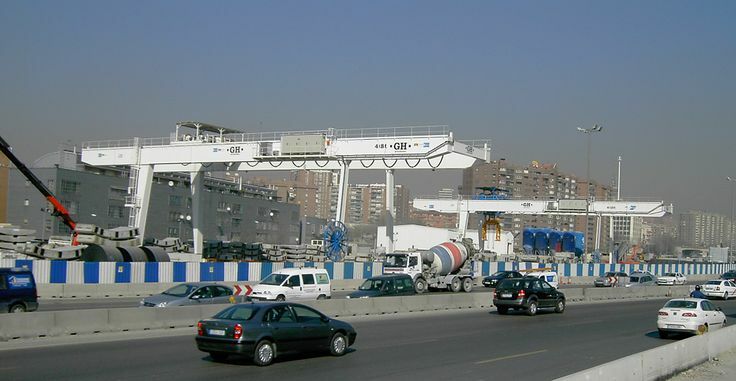 ADIF Railway sector. Instalation of a GH CRANES & COMPONENTS goliath for railway management. 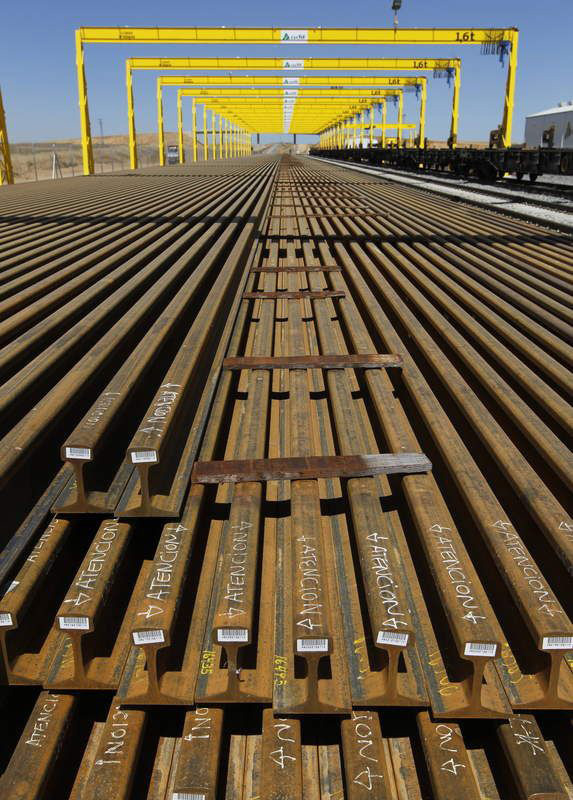 Railway sector. 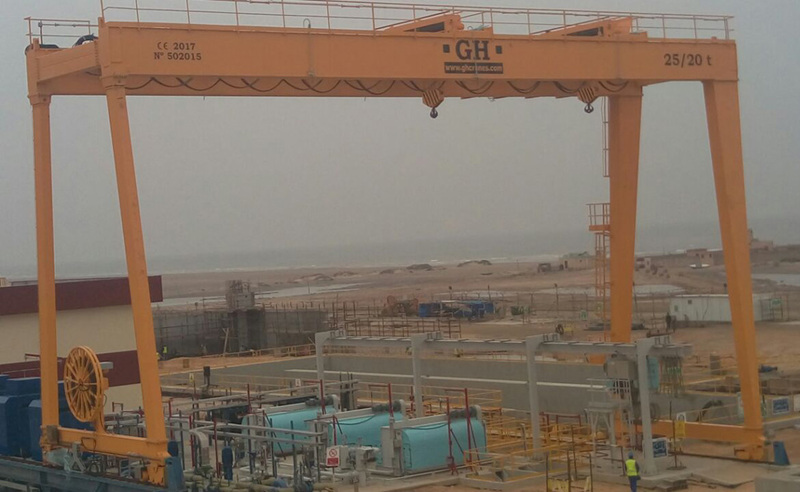 Installation of gantry GH Cranes and Components in ACCIONA. Wind power sector. 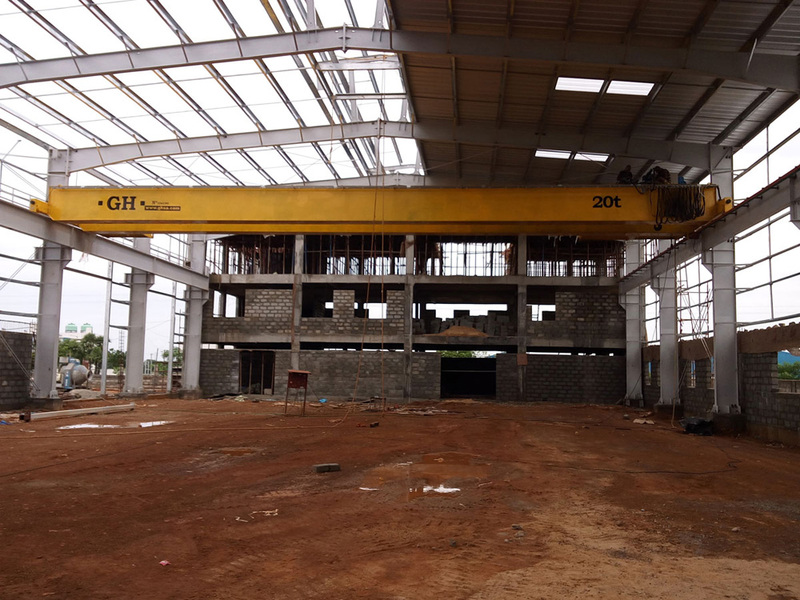 Installation of multiple cranes, Jib and semi-gantry GH Cranes and Components in the Steel constructions. 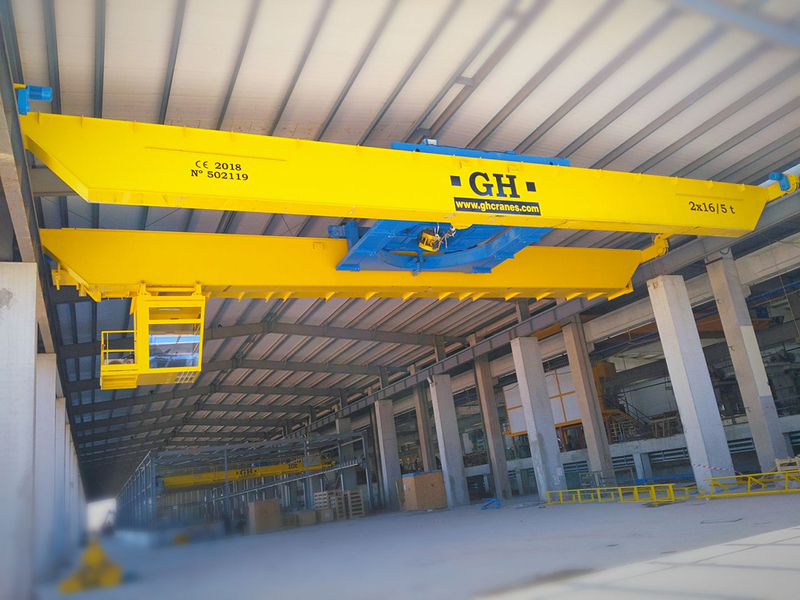 Instalation of GH CRANES & COMPONENTS goliath cranes and components in the sector of Shipyards for construction and maintenance of ships. Customer: Cosider. Place of installation: Francia. 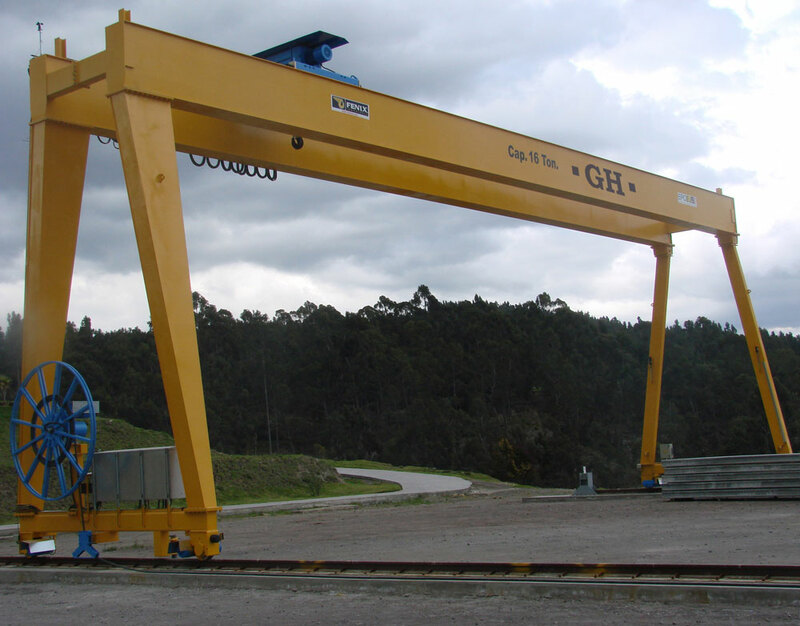 Capacity: 6,3t. 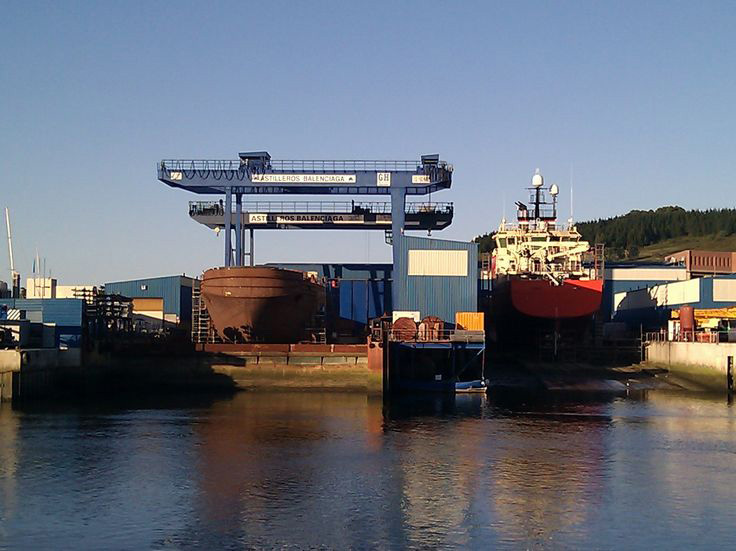 Span: 23m. 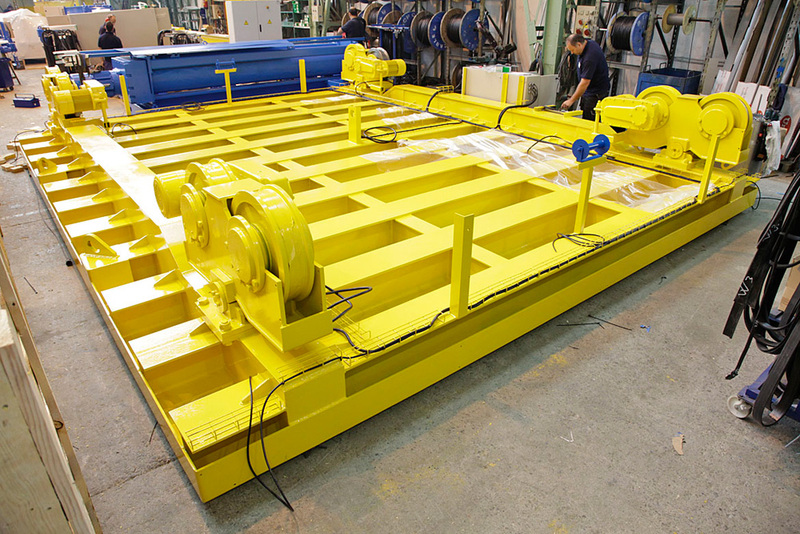 Customer: EPM. Place of installation: Colombia. 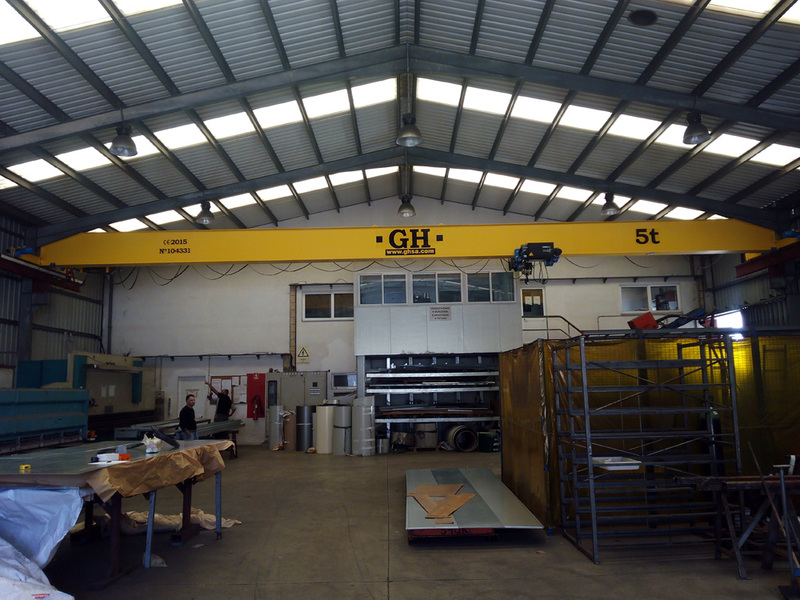 Capacity: 160/25t. 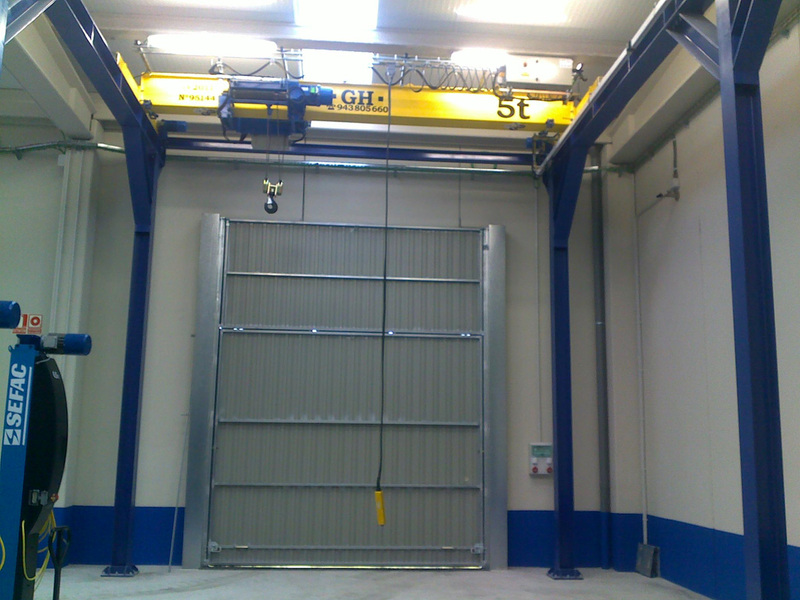 Span: 12,3m. 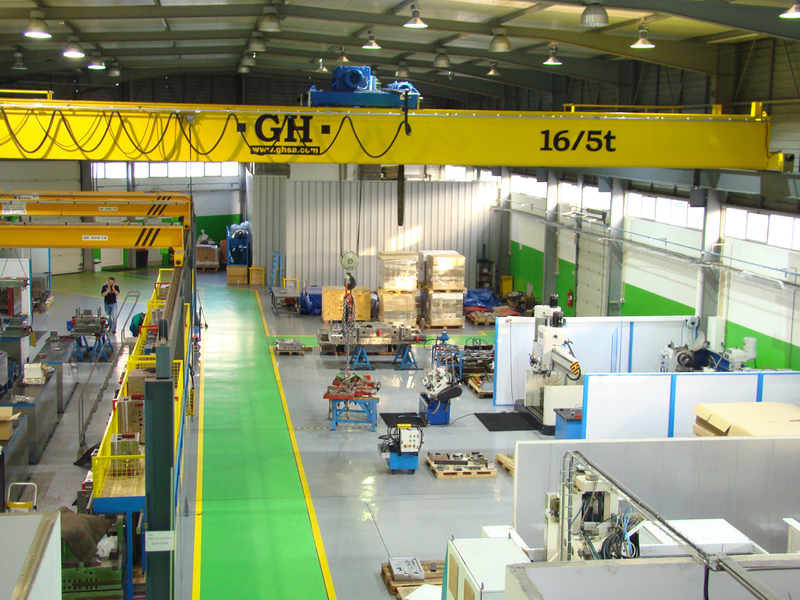 Customer: D.H. Systems. 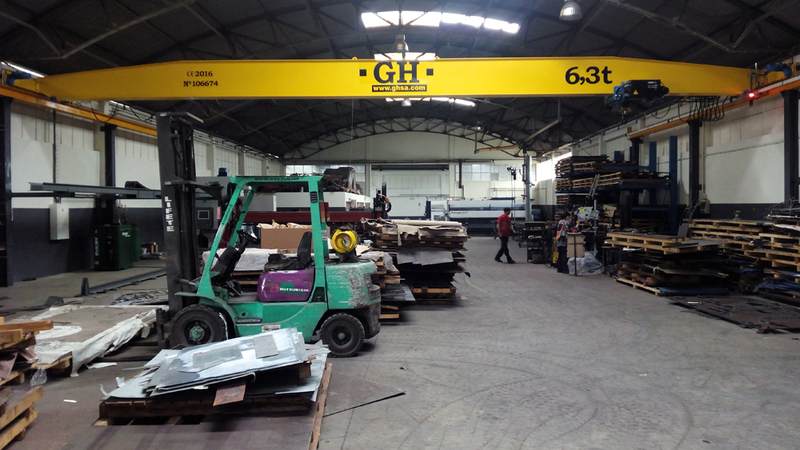 Place of installation: Gran Buenos Aires, Argentina. Capacity: 5t. 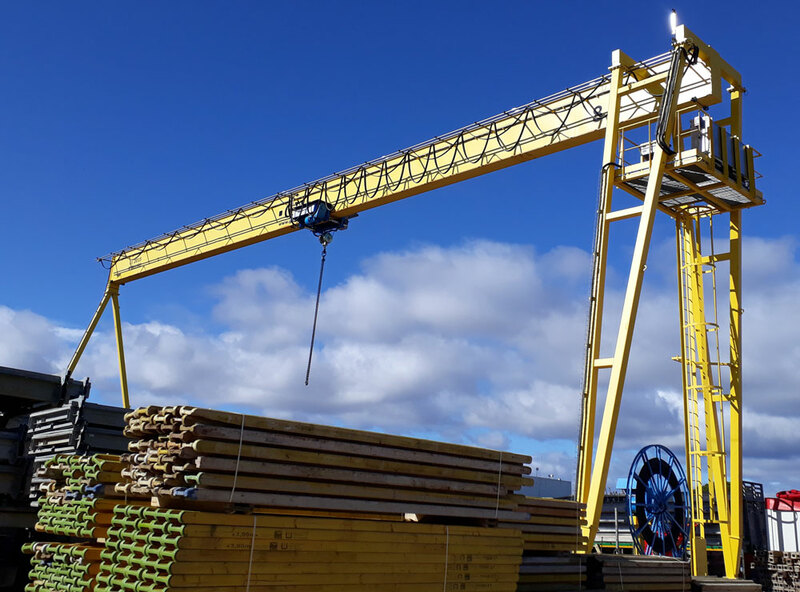 Customer: Kier Kanden Ossa. Place of installation: China. 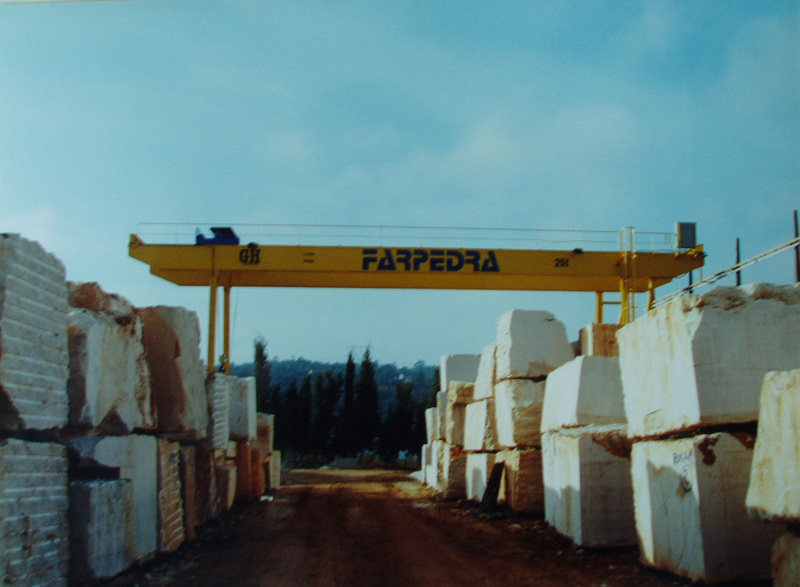 Capacity: 45t. Customer: TZ. Place of installation: China. 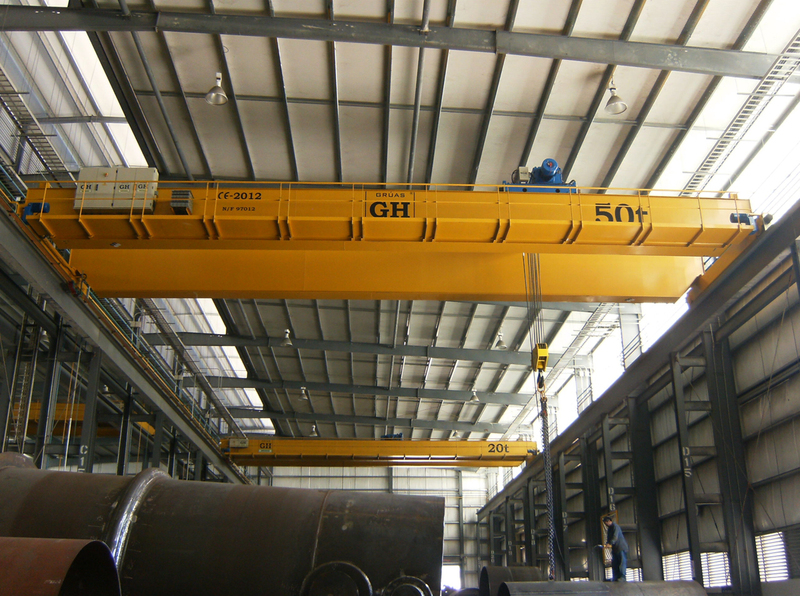 Capacity: 50t/10t. 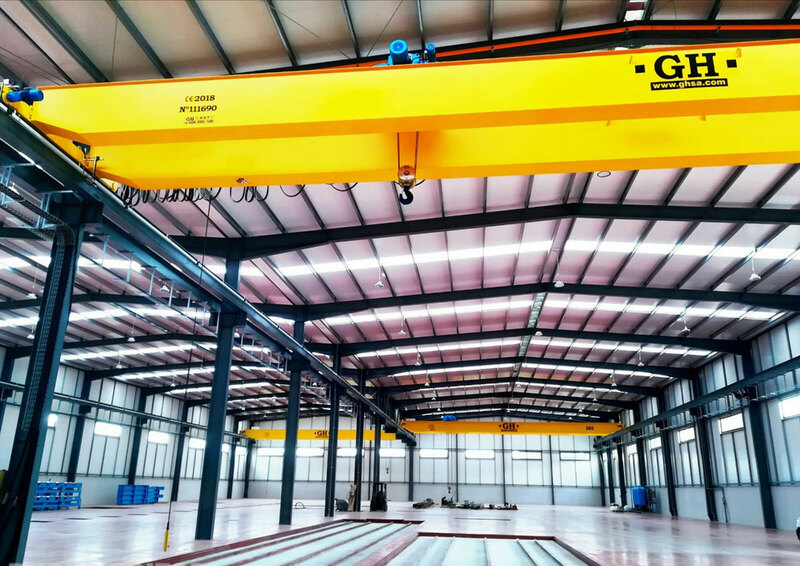 Customer: Citic Censa. Place of installation: China. 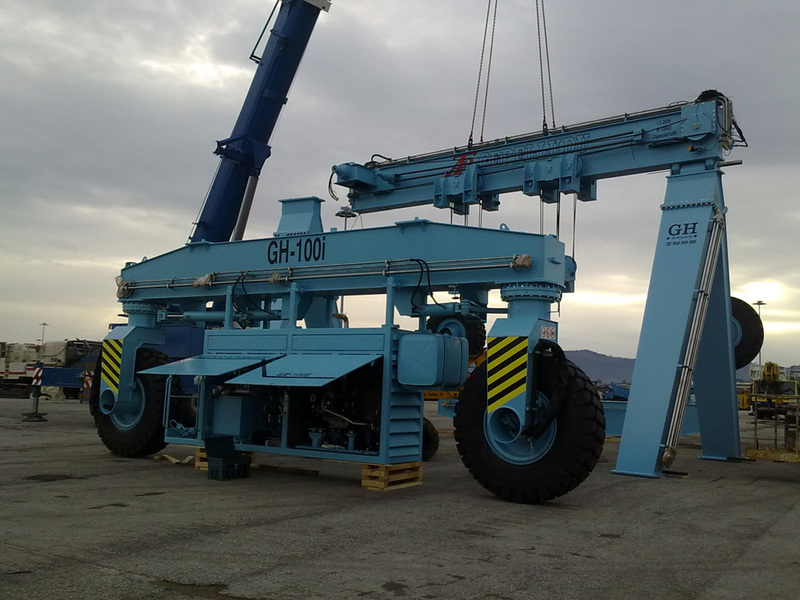 Capacity: 10t. 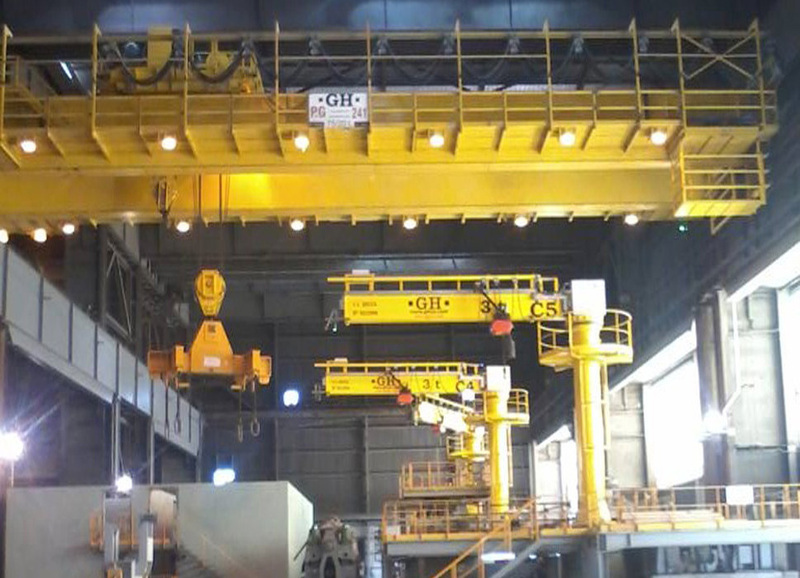 Customer: Citic Censa. Place of installation: China. 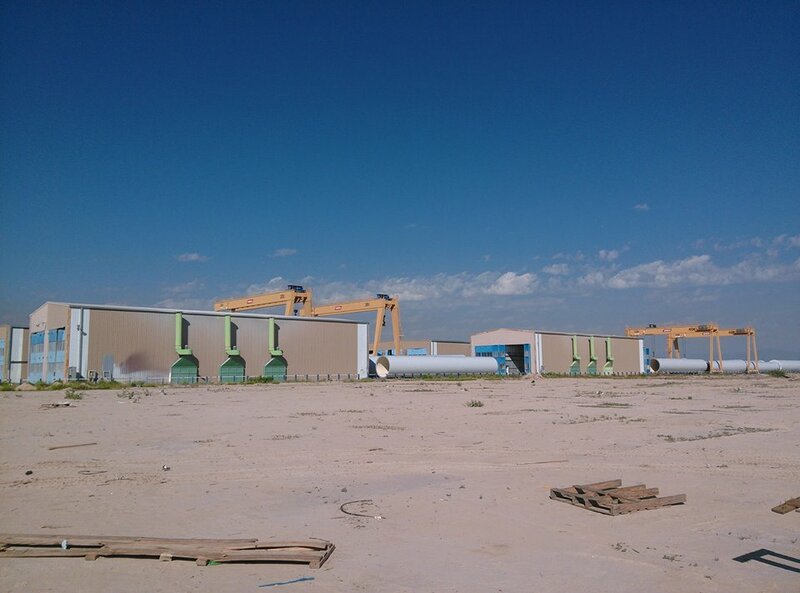 Capacity: 250t/80t. Customer: Leighton. Place of installation: Hong Kong. 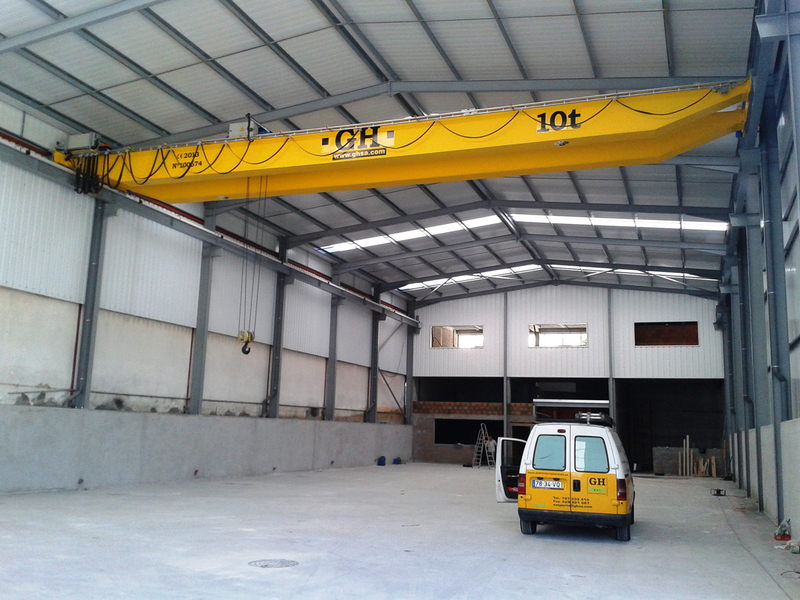 Capacity: 10t. Customer: Leighton. Place of installation: Hong Kong. 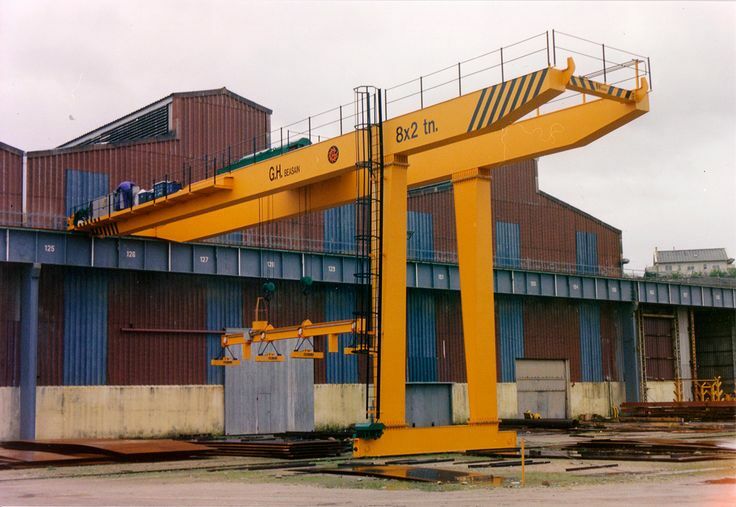 Capacity: 25t. 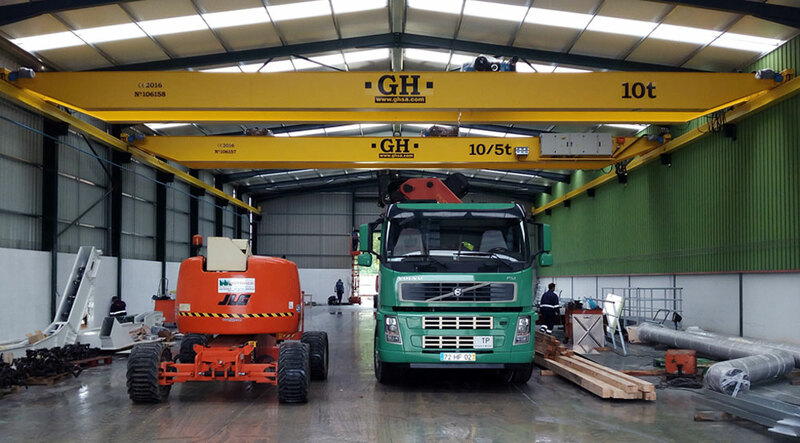 Customer: Rooftec. 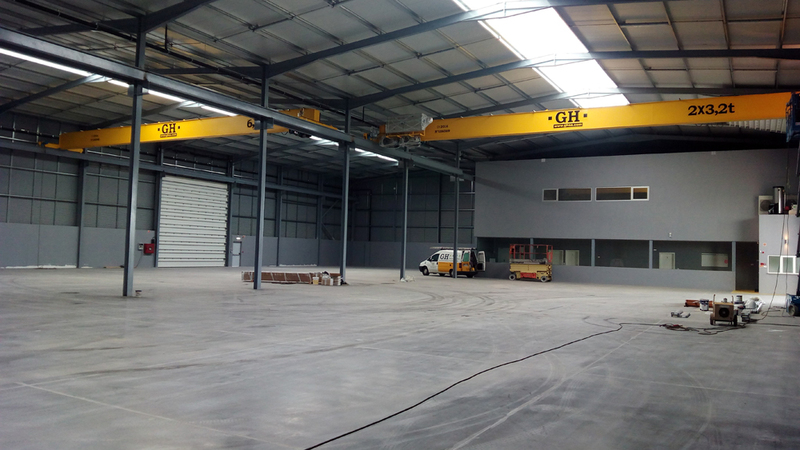 Place of installation: Parque Industrial Quito, Ecuador. 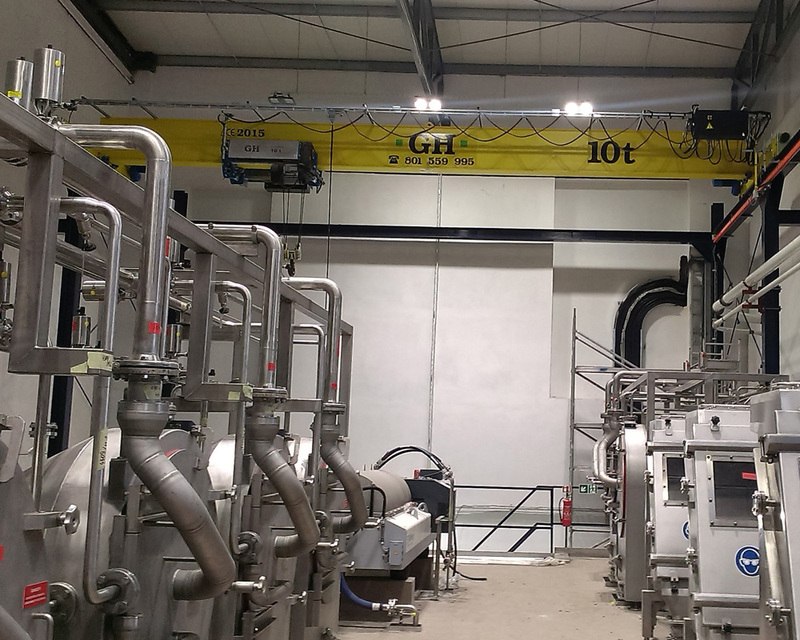 Capacity: 10t. 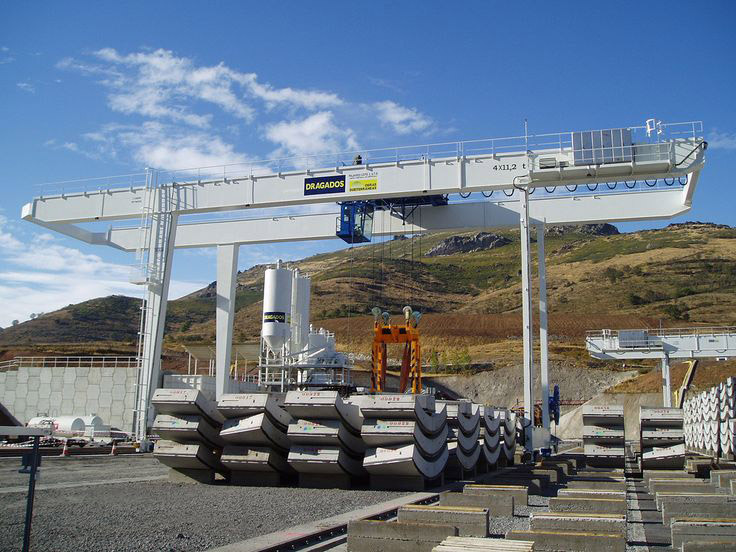 Span: 25m. 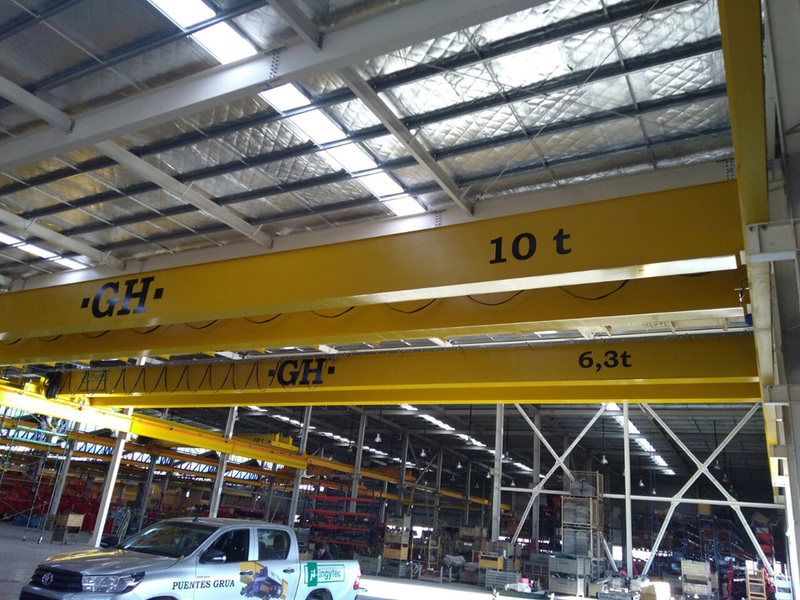 Lifting height: 7m. 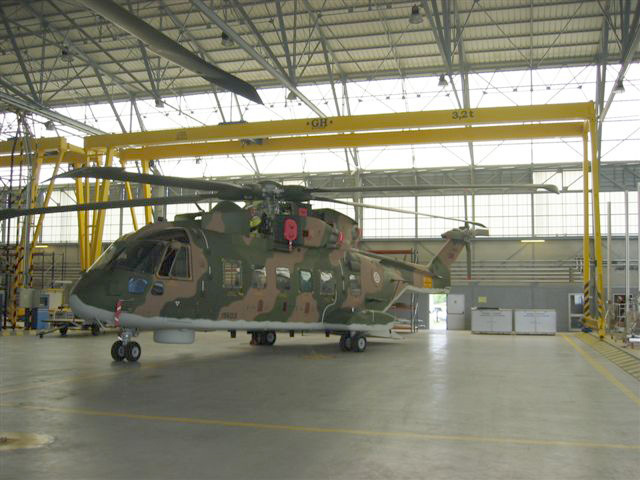 Customer: ATLL Concessio­naria. Place of installation: Sant Joan Despí, España. 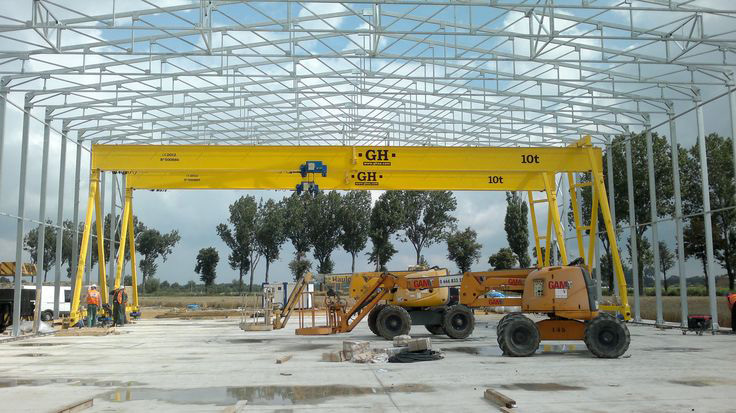 Capacity: 12,5t. 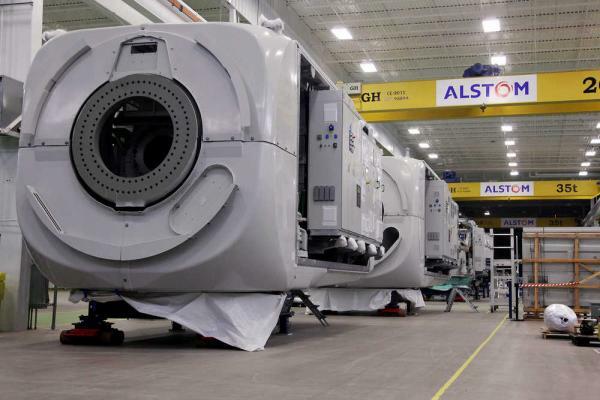 Customer: Alcon. Place of installation: Polonia. 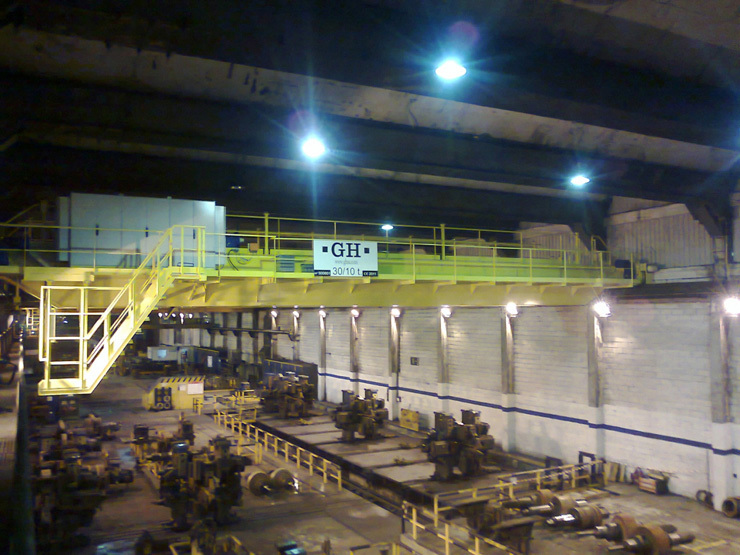 Capacity: 32t. Customer: Romi. Place of installation: Brasil. 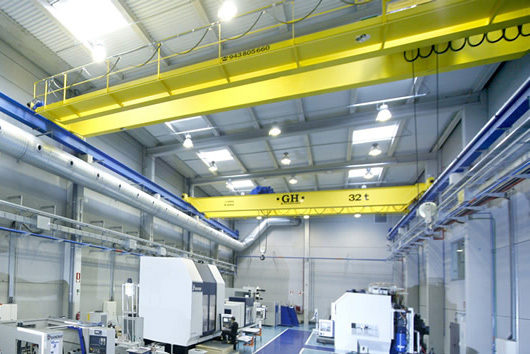 Capacity: 50/20t. Customer: HHI. Place of installation: Brasil. Capacity: 3,2t. 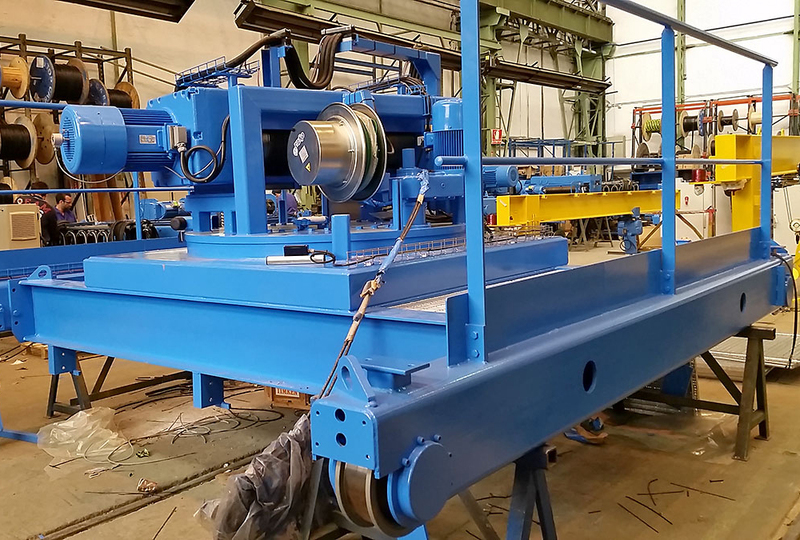 Customer: Gestamp. 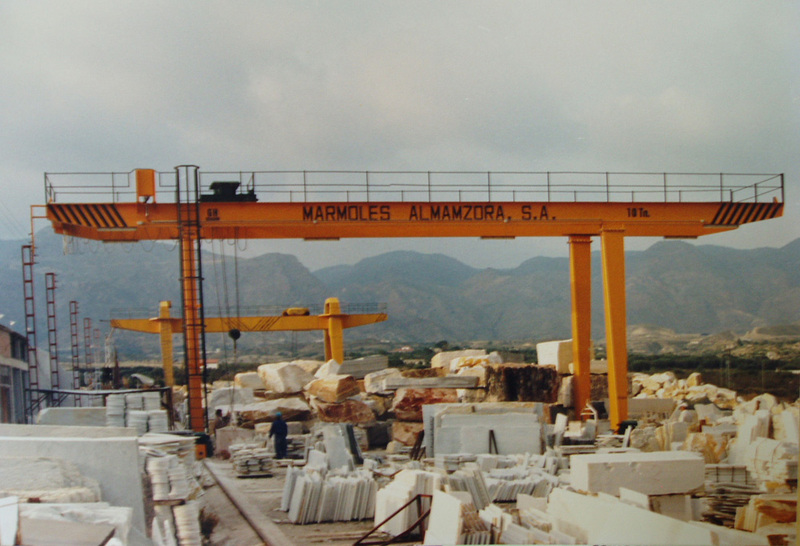 Place of installation: España. 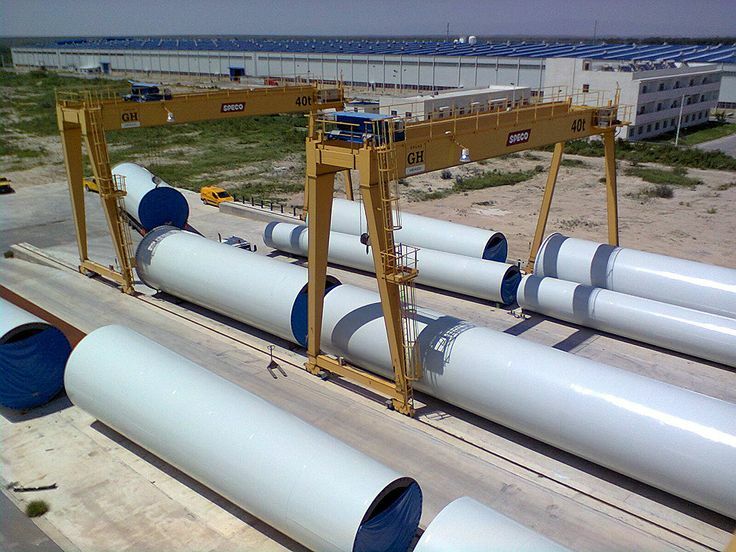 Capacity: 40t. 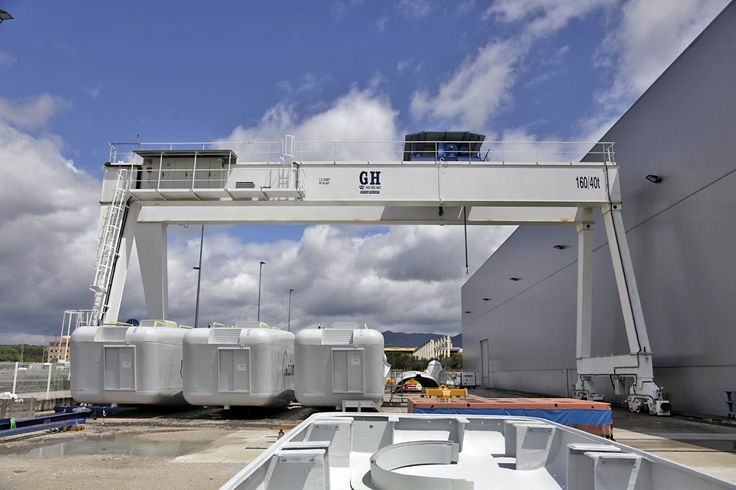 Customer: Gamesa. Place of installation: Lerma, España. 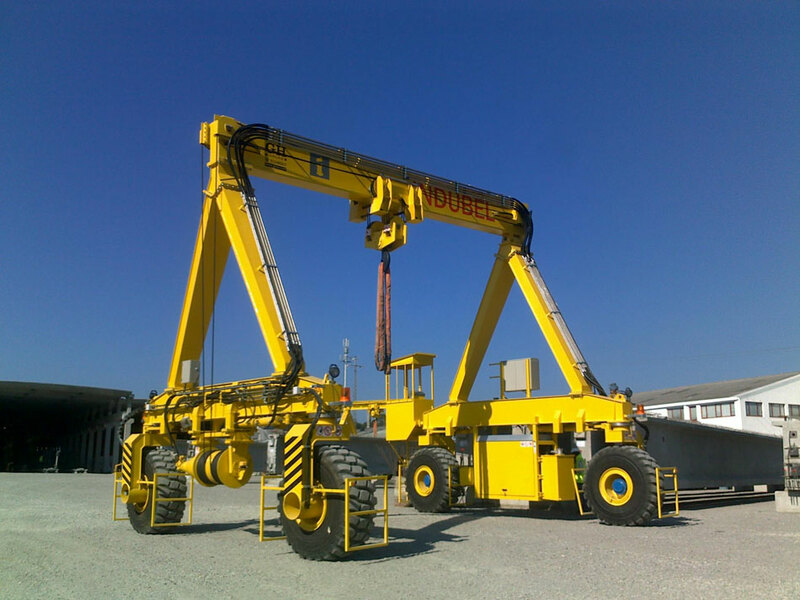 Capacity: 63t/25t. Customer: Fagor Arrasate. 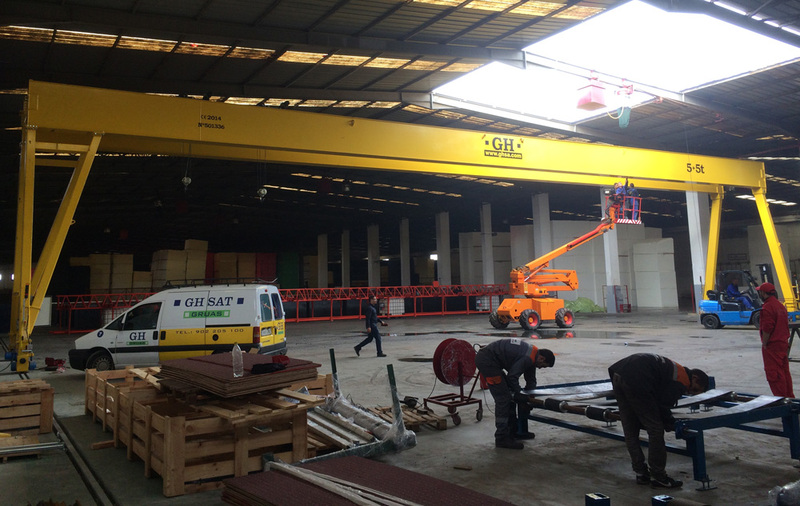 Place of installation: Kunshan, China. 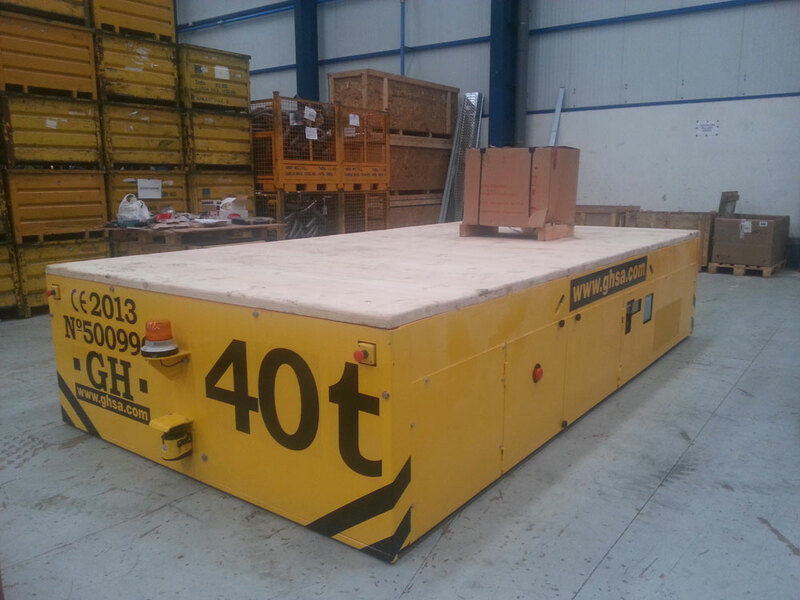 Capacity: 40/6,3t. Customer: Viadic de Langeais. 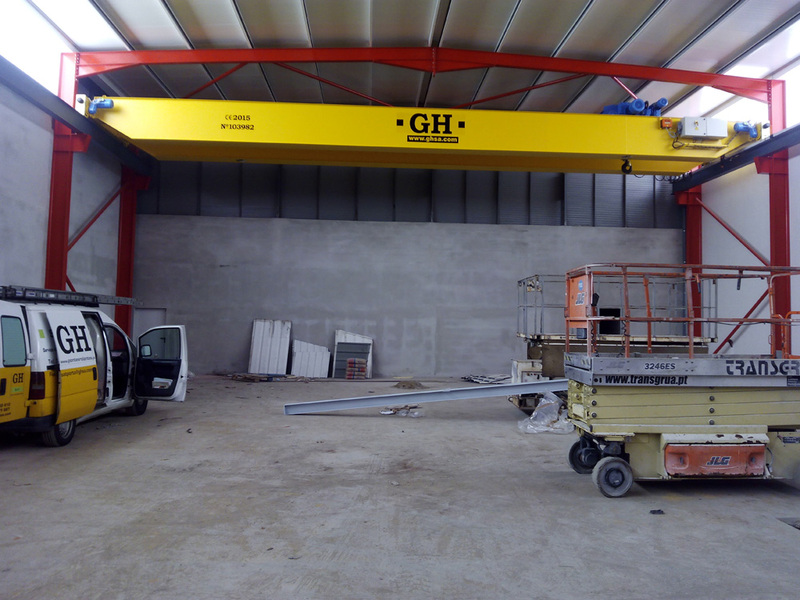 Place of installation: Langeais, Francia. 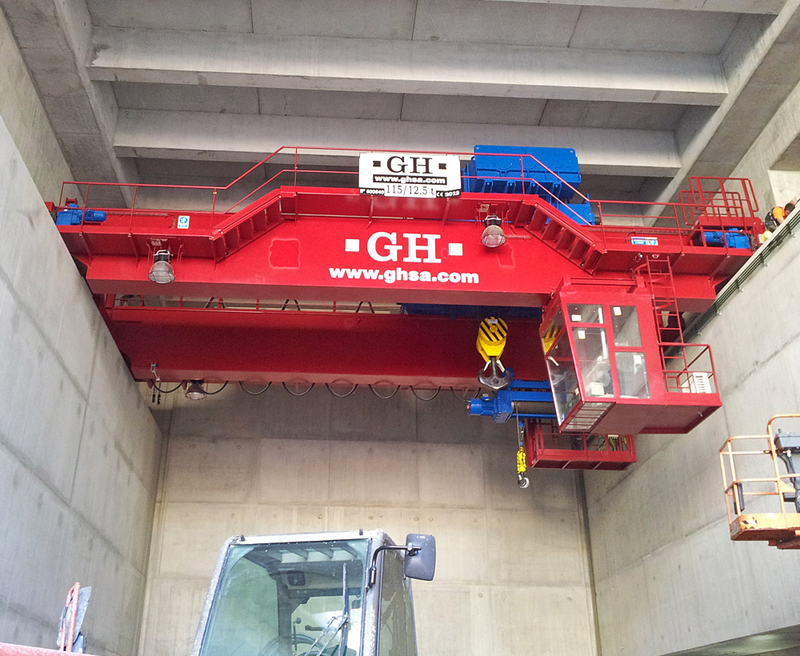 Capacity: 70t. Span: 12,246m. 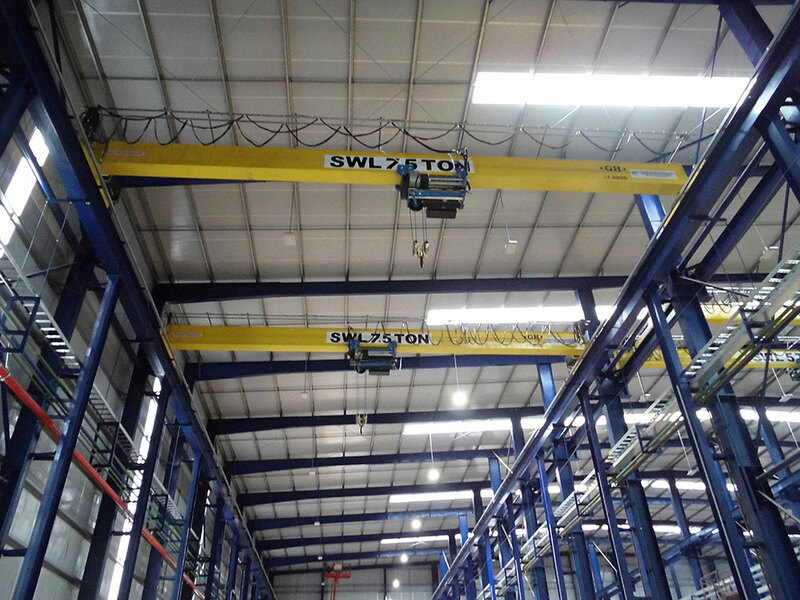 Customer: Grupos DSA - Desarrollo de Sistemas Avanzados, S.L.. Place of installation: España. 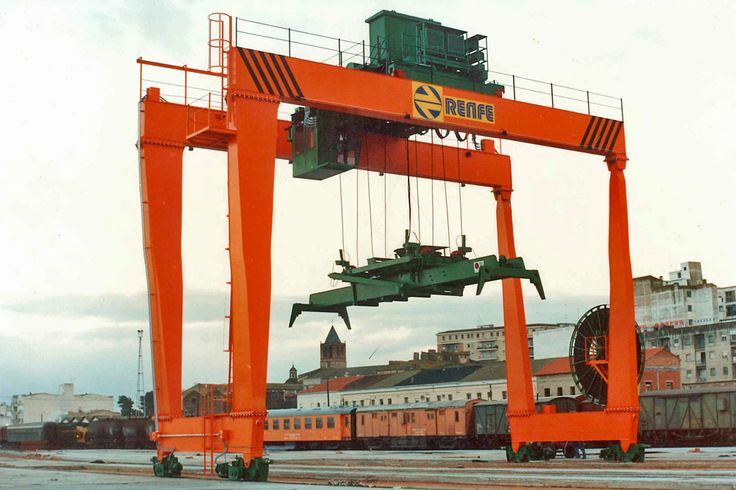 Capacity: 12,5t. Customer: Spirax Sarco. Place of installation: Argentina. 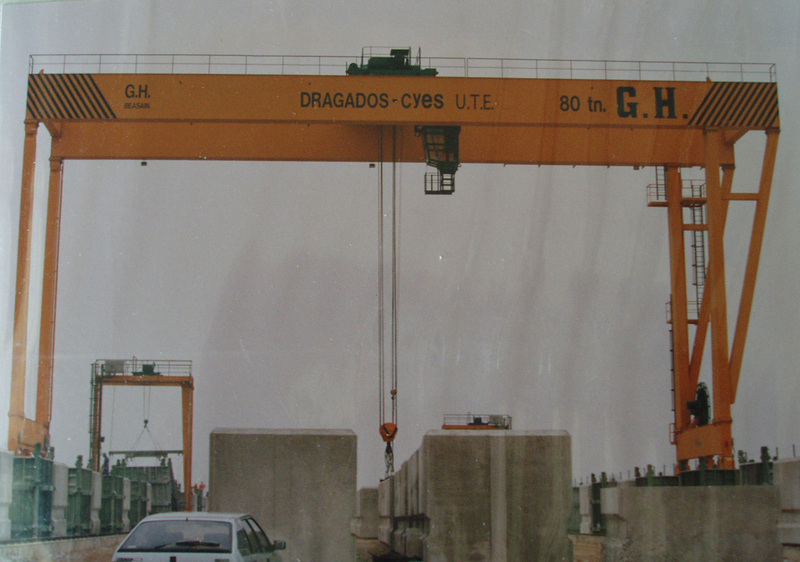 Capacity: 6,3t. Customer: Metalsider. Place of installation: Kouba, Argelia. 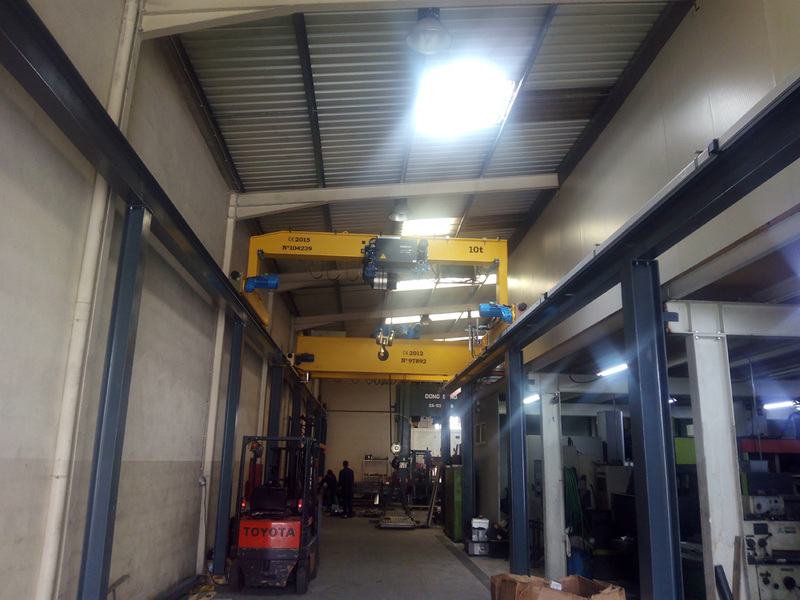 Capacity: 2x16t/5t. Span: 22,146m. 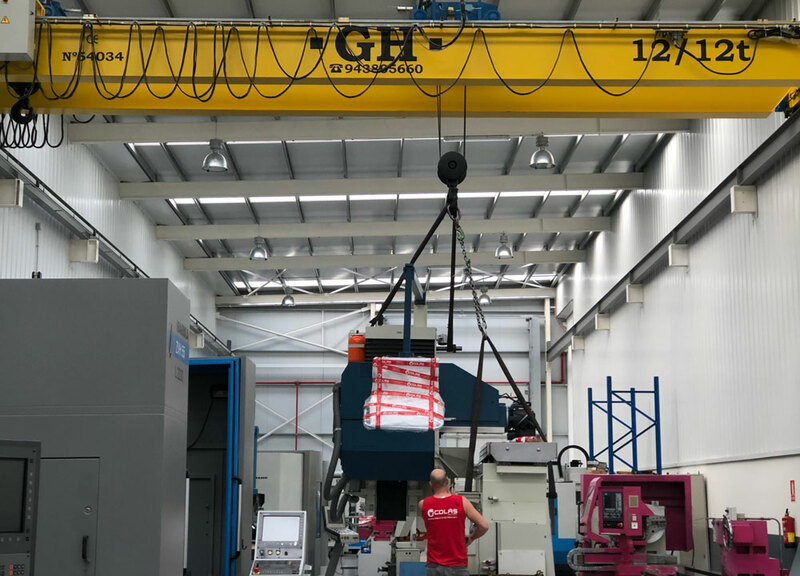 Customer: CMP. Place of installation: Sudeste de Francia. Capacity: 3,2t. Customer: Evertz. Place of installation: Sudeste de Francia. 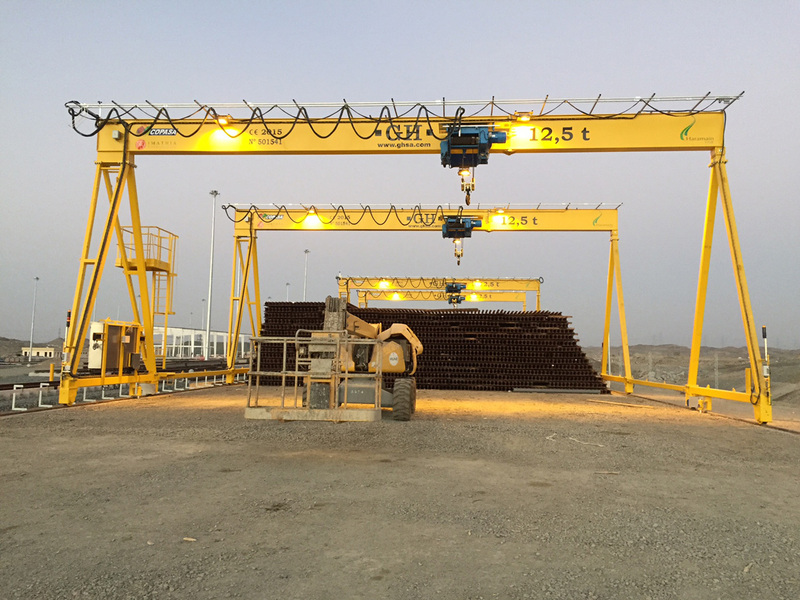 Capacity: 120t. Customer: Aluminios Cortizo. Place of installation: Padron, España. 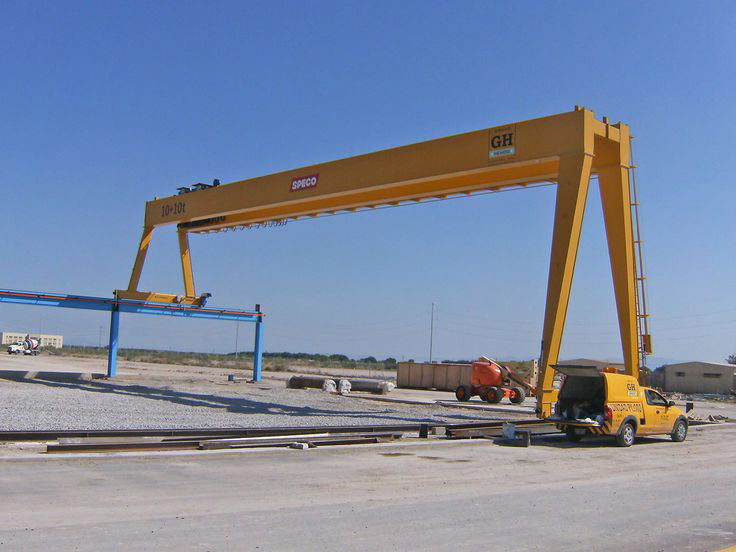 Capacity: 16t. Customer: Puente Pumarejo. Place of installation: Colombia. 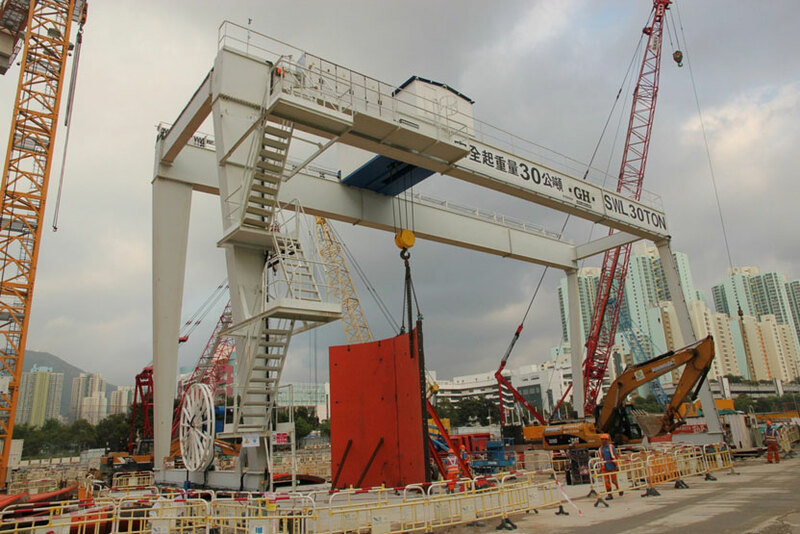 Capacity: 30t. 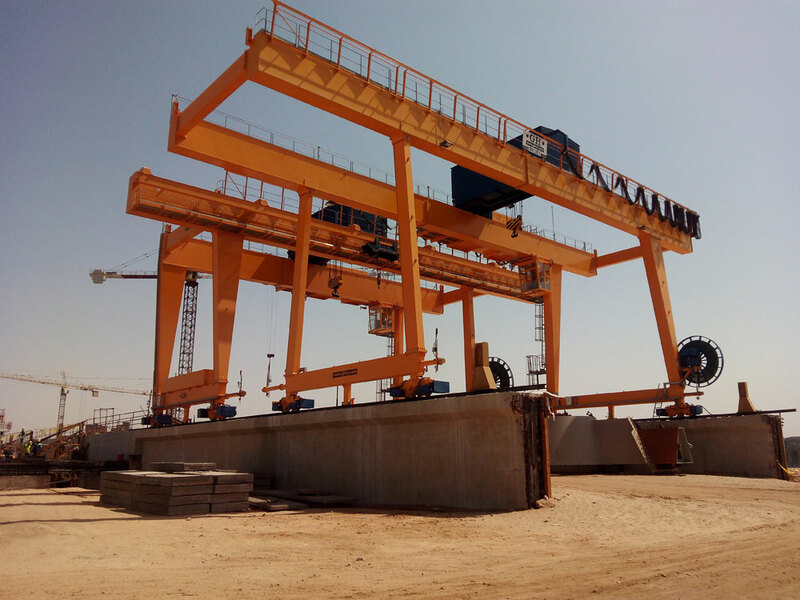 Customer: Imco. Place of installation: Perú. Capacity: 5t. 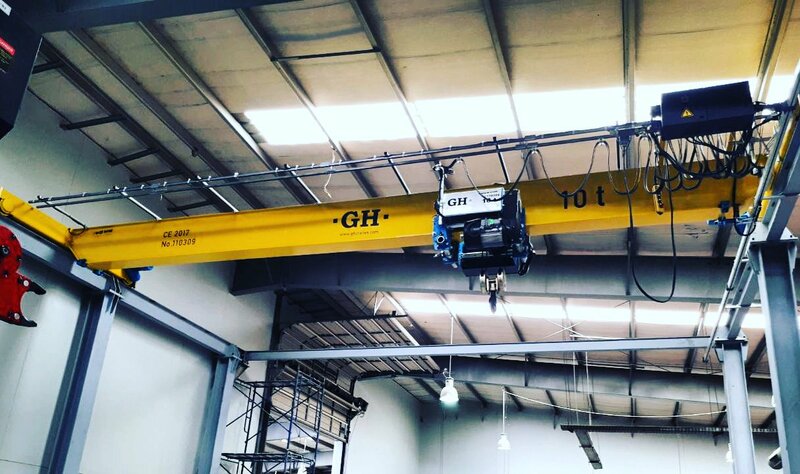 Customer: GCZ. Place of installation: Perú. Capacity: 50/10t. Customer: Shougang Hierro Perú S.A.A.. Place of installation: Perú. 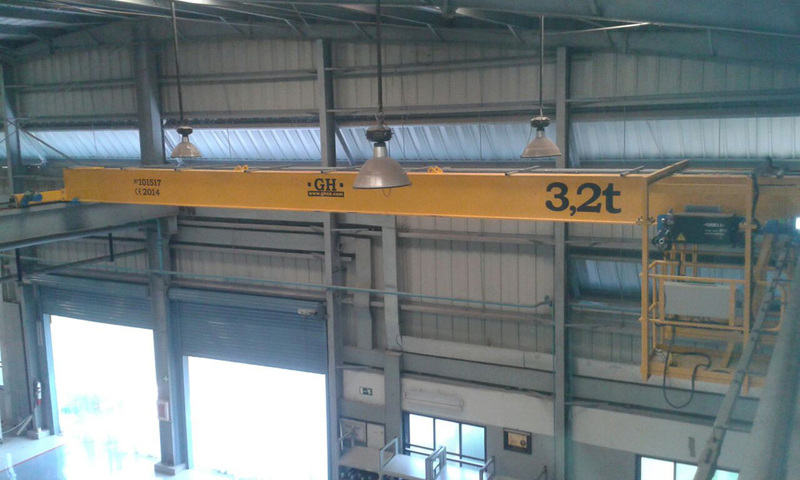 Capacity: 32/5t. Customer: Machu picchu foods SAC. Place of installation: Perú. 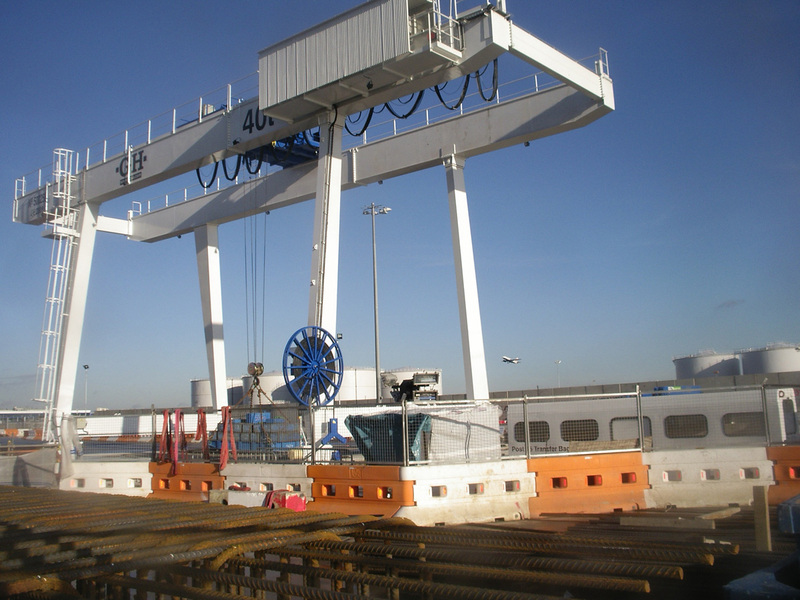 Capacity: 16t. Customer: Llaxta. 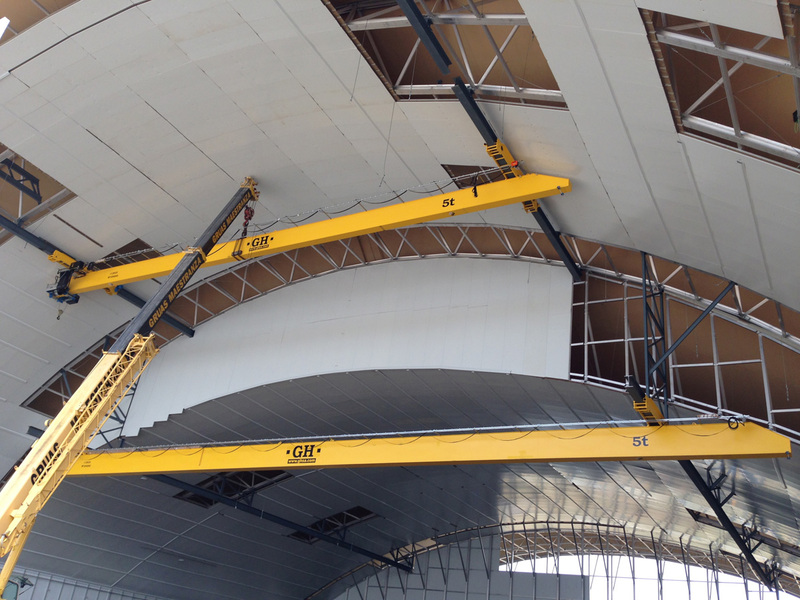 Place of installation: Ica, Perú. 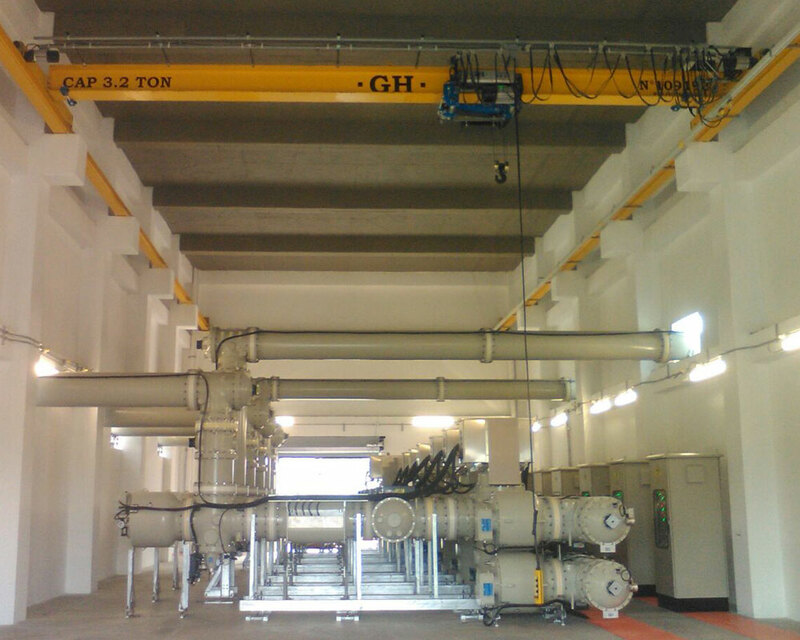 Capacity: 12,5t+12,5t. Customer: Zamine. Place of installation: Perú. 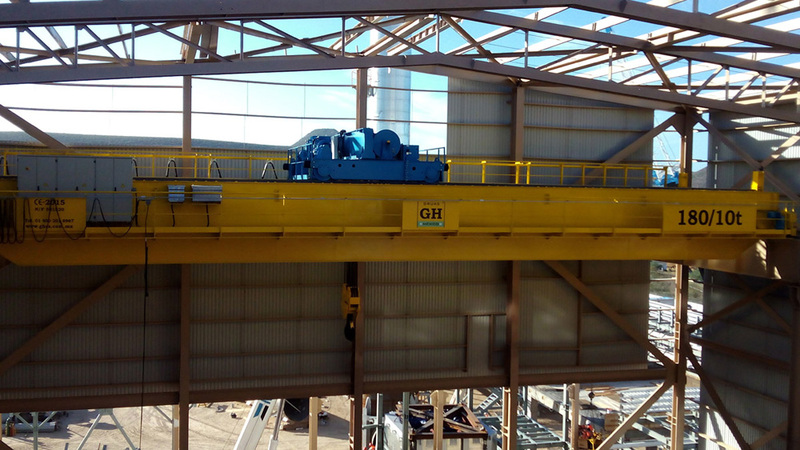 Capacity: 10t. 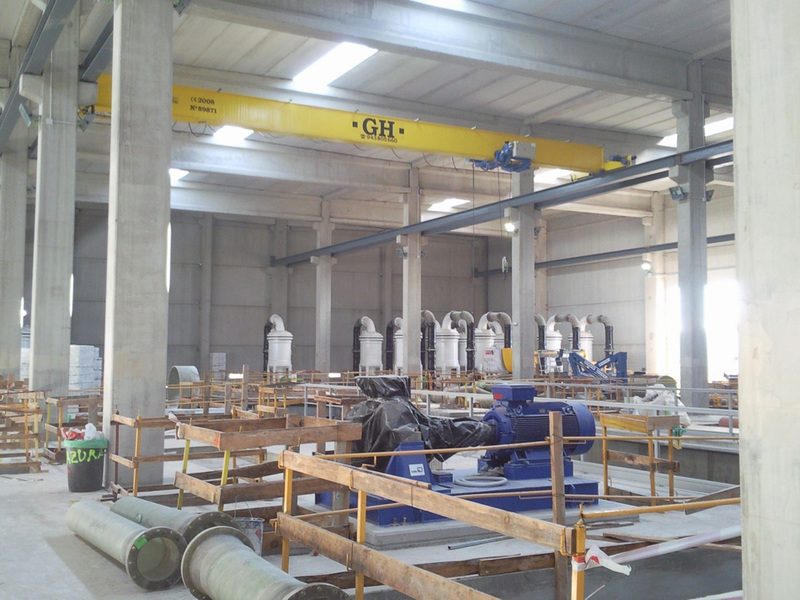 Customer: Stone Sur, S.L.. Place of installation: Sevilla, España. Capacity: 6,3t. Customer: Cementownia Warta. Place of installation: Poland. 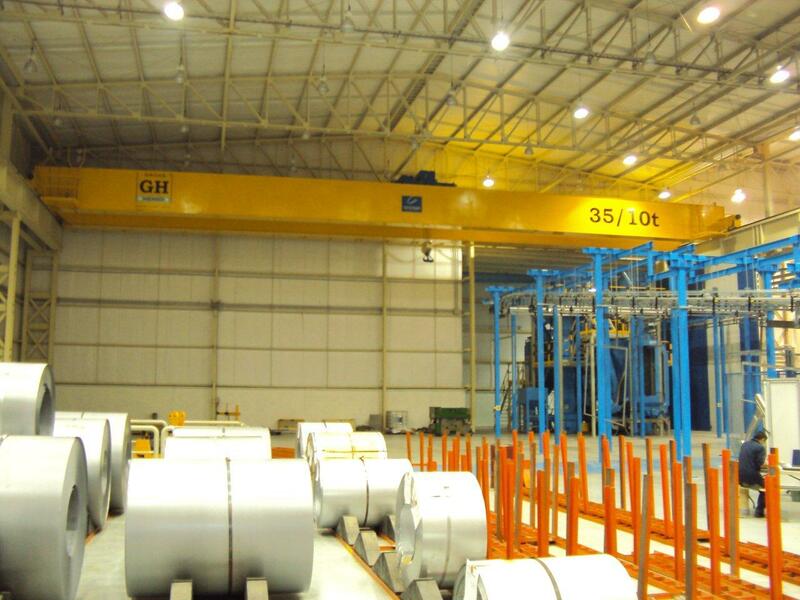 Capacity: 10,5t. 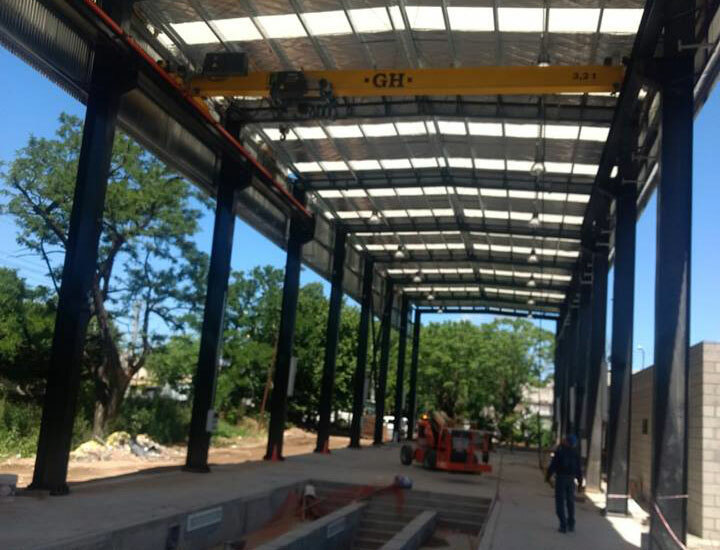 Span: 17m. 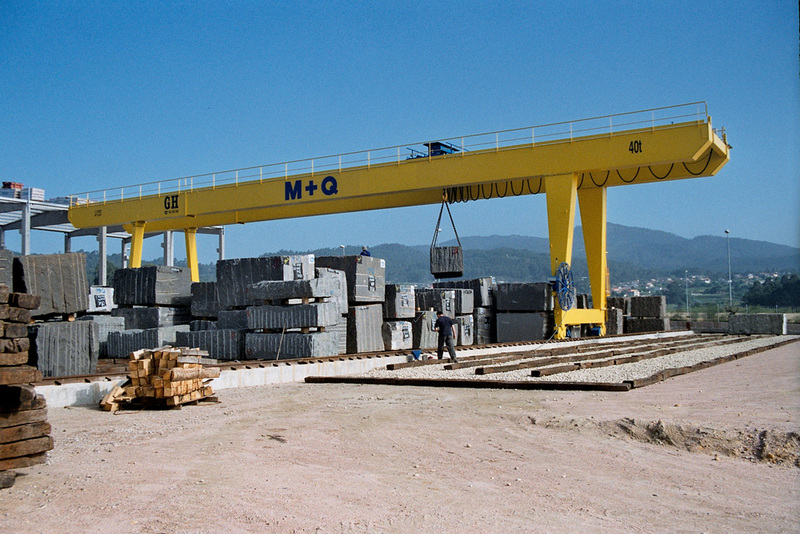 Customer: Dominio de Queiron, S.L.. Capacity: 6,5t. 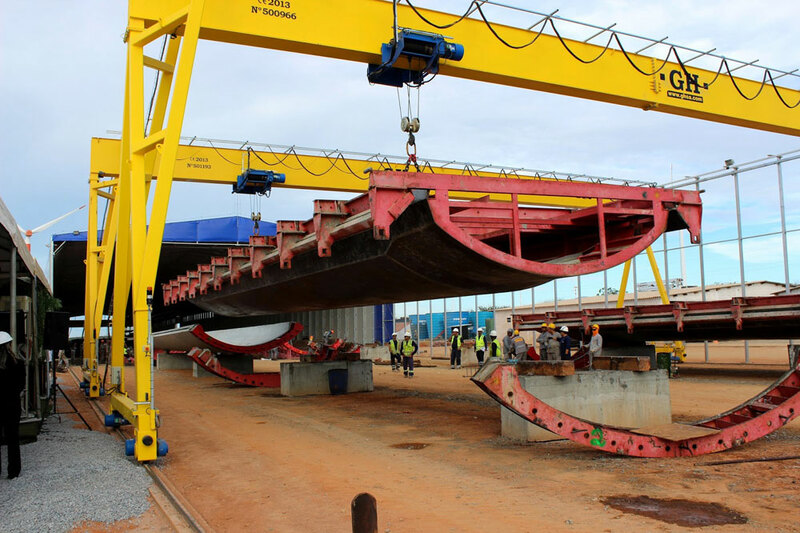 Span: 14,55 m.
Customer: Hyundai. 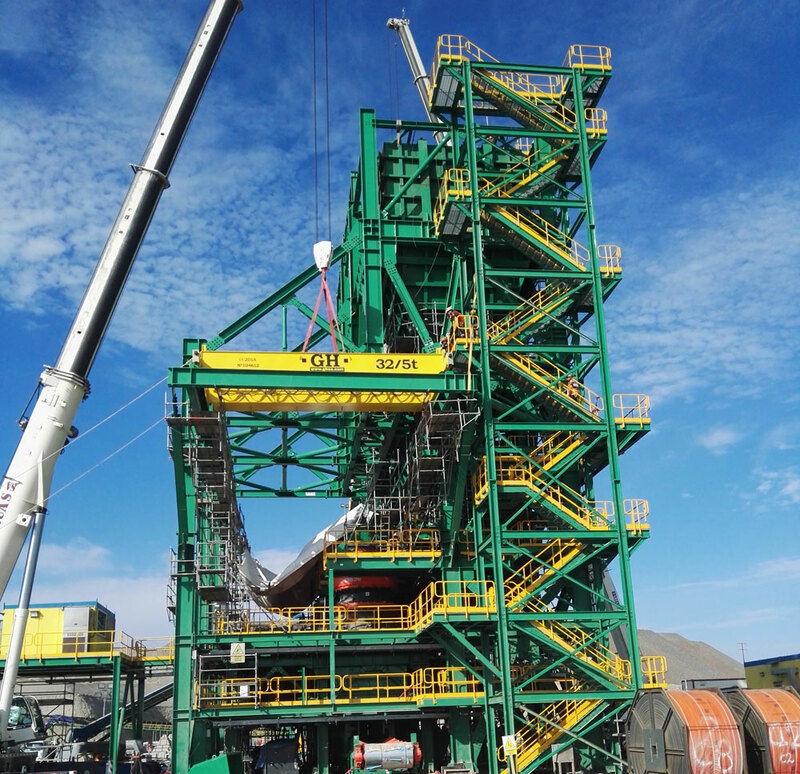 Place of installation: Rosarito, México. Capacity: 5t. 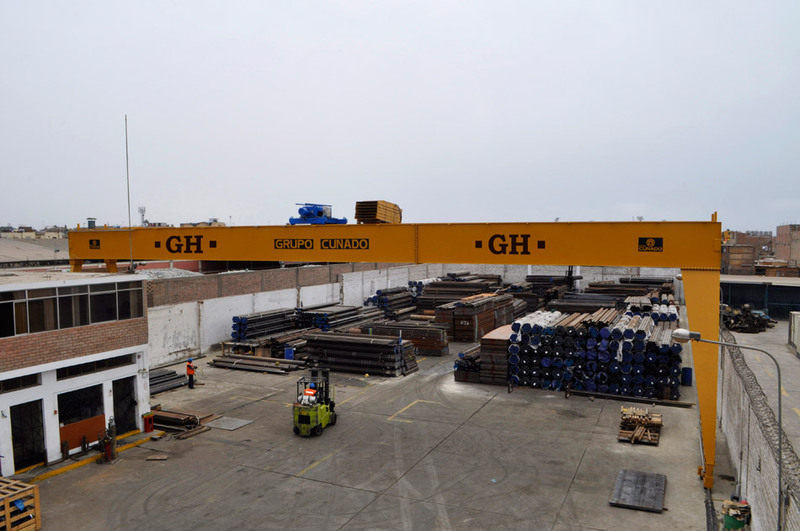 Customer: LOMBOSER - Metalúrgica, S.A.. Place of installation: Aveiro, Portugal. Capacity: 5t. Span: 19,56 mts. 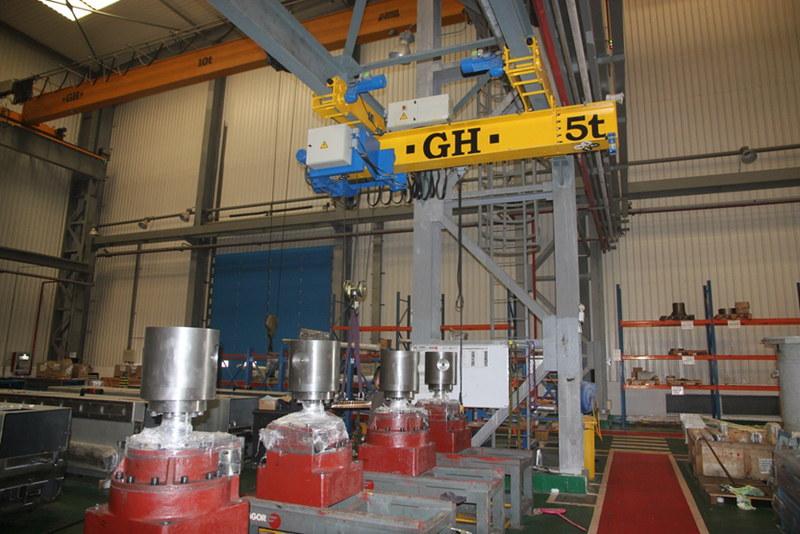 Lifting height: 5,37 mts. 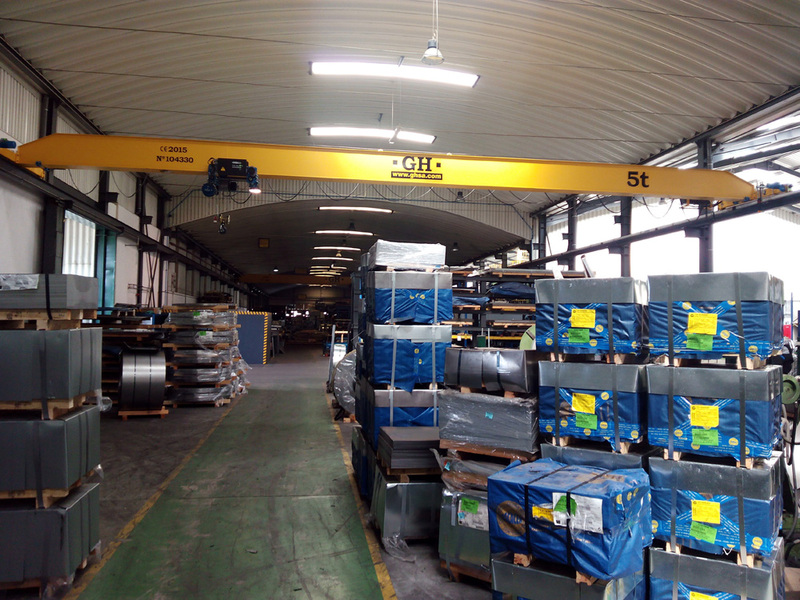 Customer: LOMBOSER - Metalúrgica, S.A.. Place of installation: Aveiro, Portugal. Capacity: 2t. Span: 14,2 mts. 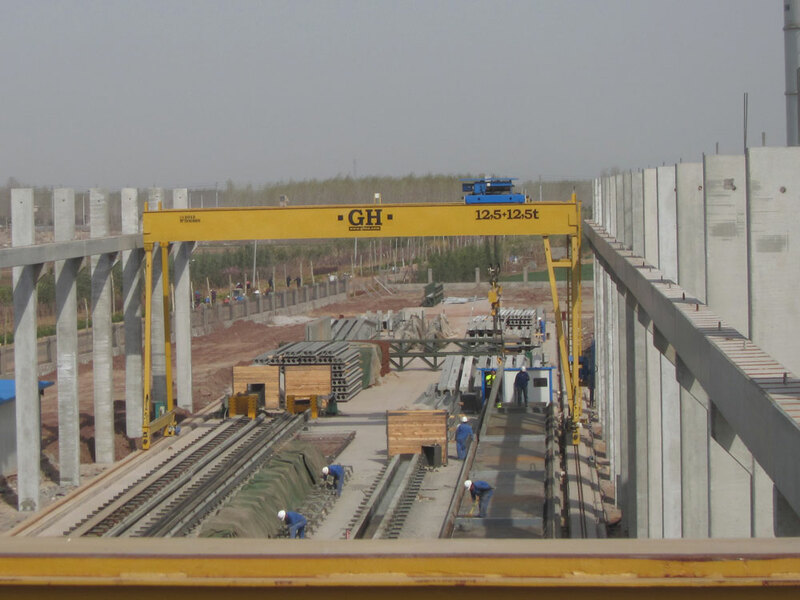 Lifting height: 4,67 mts. Customer: Empresa Industrial Sampedro, S.A.. Place of installation: Guimarães, Portugal. Capacity: 2t. Span: 15 mts. 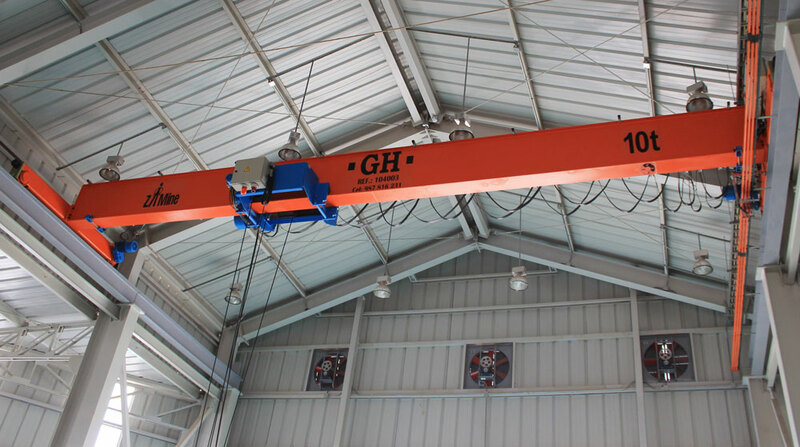 Lifting height: 6,3 mts. Customer: Megafusão, Lda. 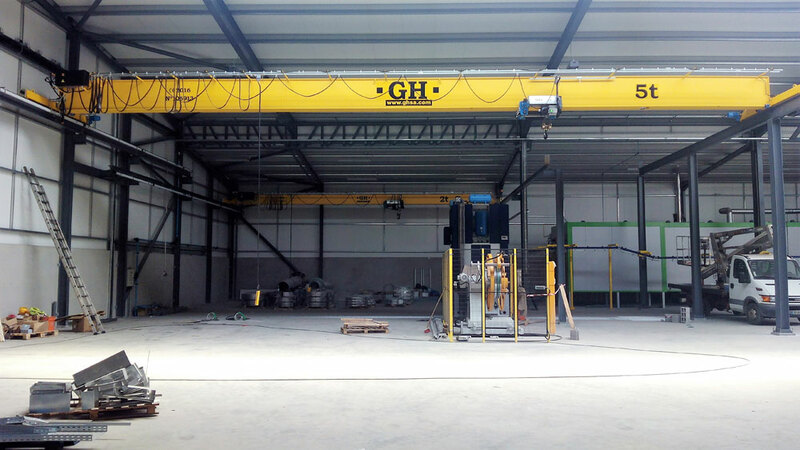 Place of installation: Guimarães, Portugal. Capacity: 5t. Span: 15,4 mts. 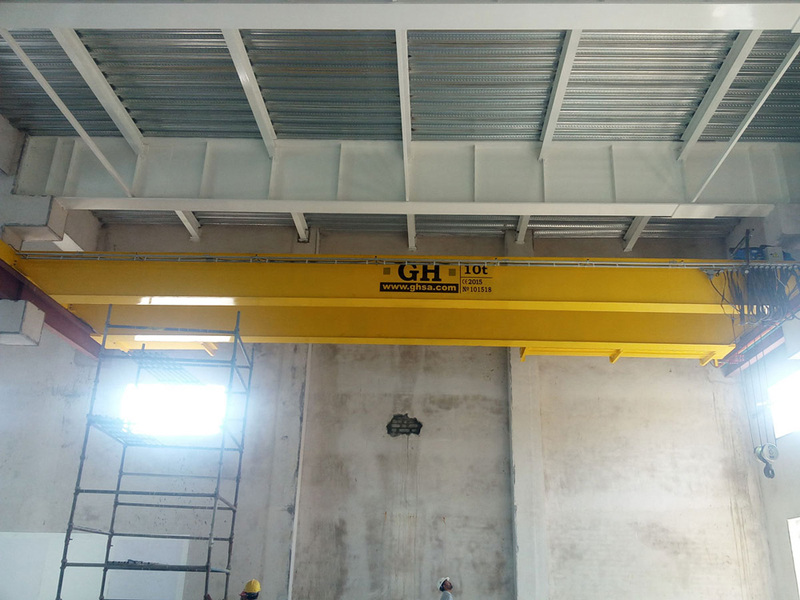 Lifting height: 5,5 mts. 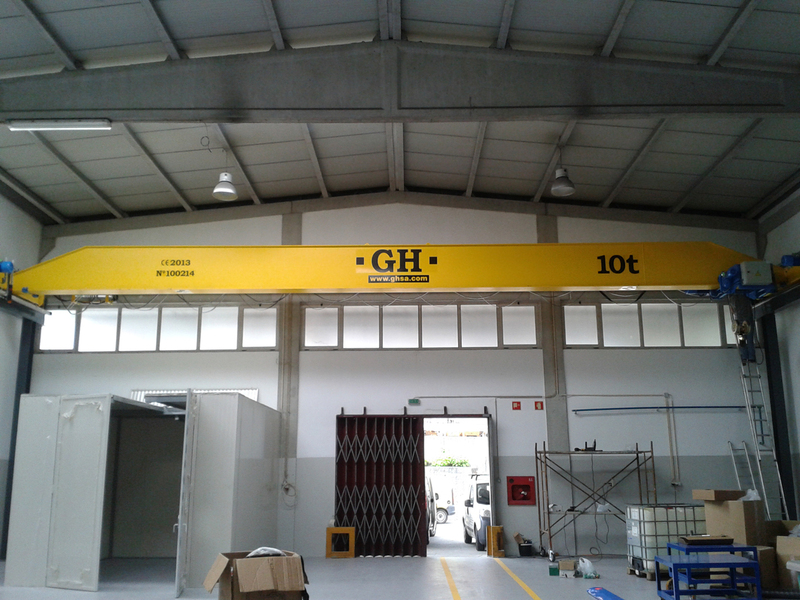 Customer: O Feliz - Painel, Lda.. Place of installation: Braga, Portugal. 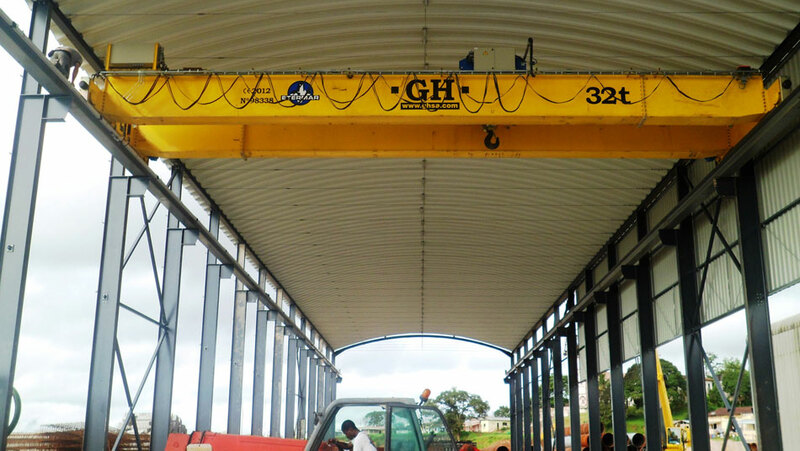 Capacity: 12,5t. Span: 19,25 mts. 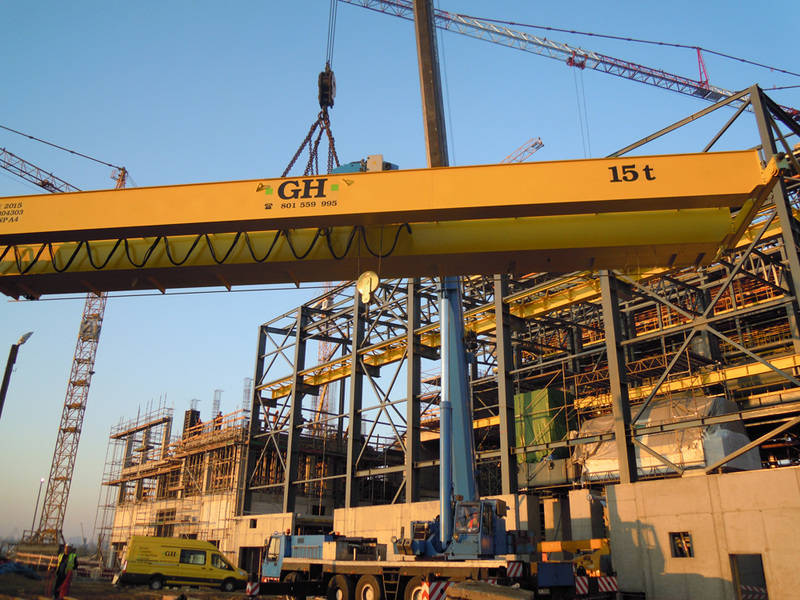 Lifting height: 9,73 mts. 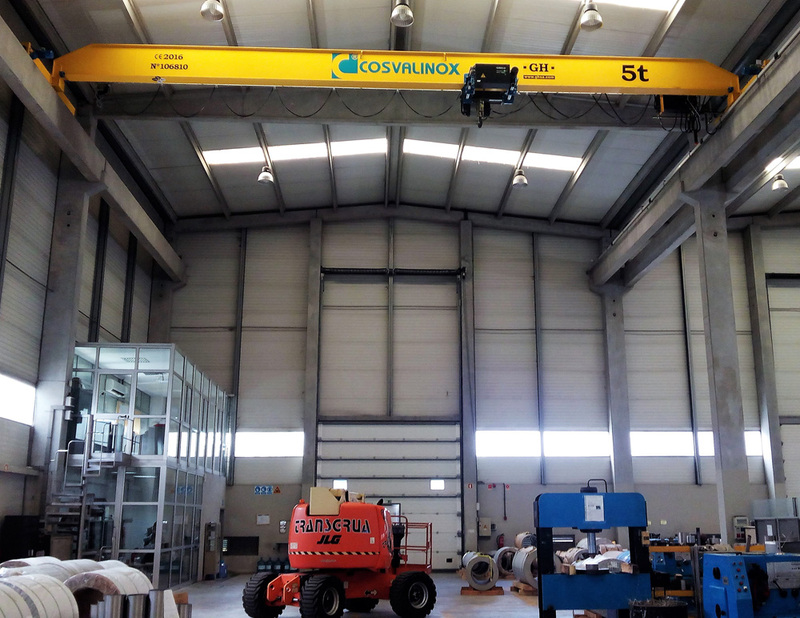 Customer: Cosvalinox - Indústria Metalúrgica e Equipamentos, Lda . 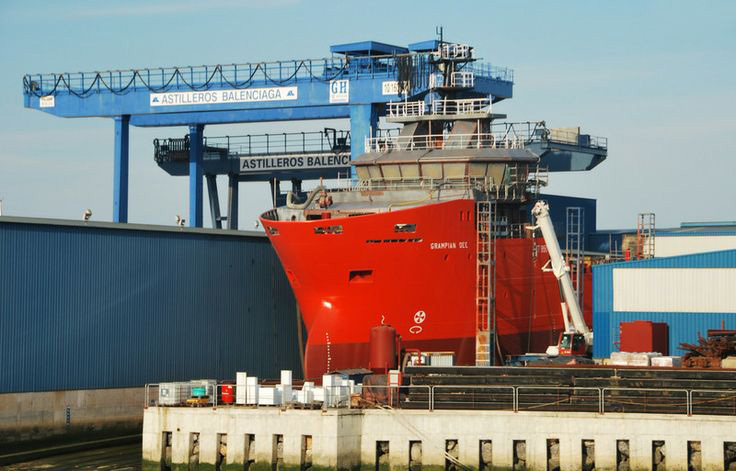 Place of installation: Aveiro, Portugal. Capacity: 5t. Span: 14,68 mts. 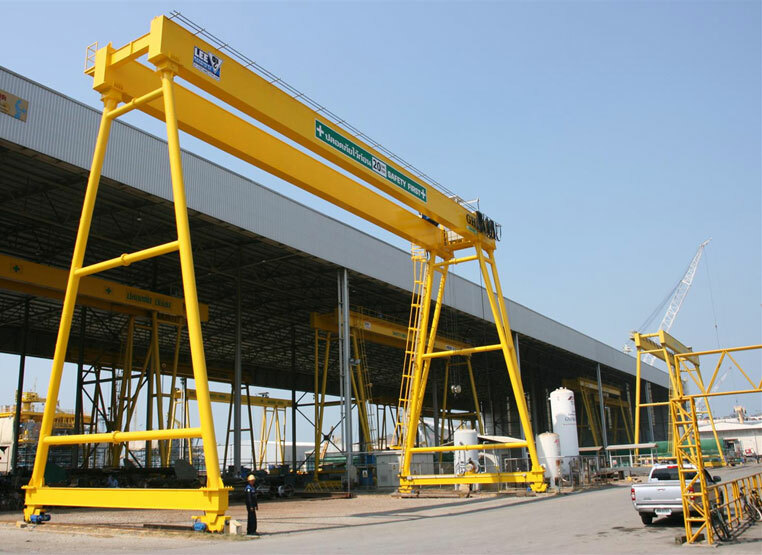 Lifting height: 12 mts. Customer: Transportes Ferrão & Martins, Lda. 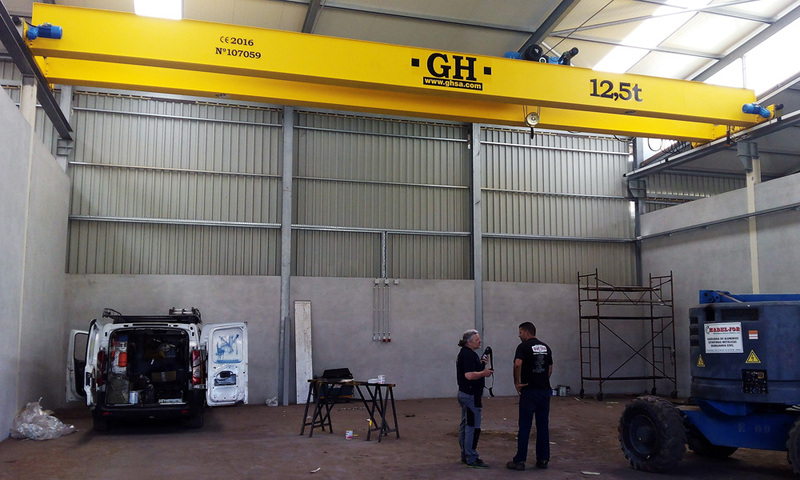 Place of installation: Arganil, Portugal. 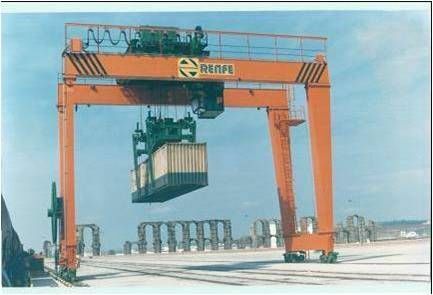 Capacity: 12,5t. Span: 14,4 mts. 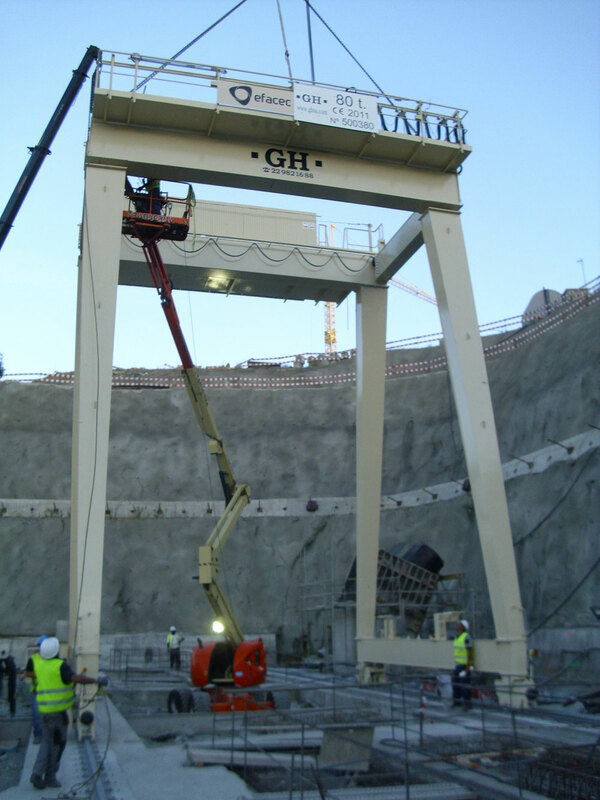 Lifting height: 6,06 mts. Customer: Coated Solutions. Place of installation: Raos. 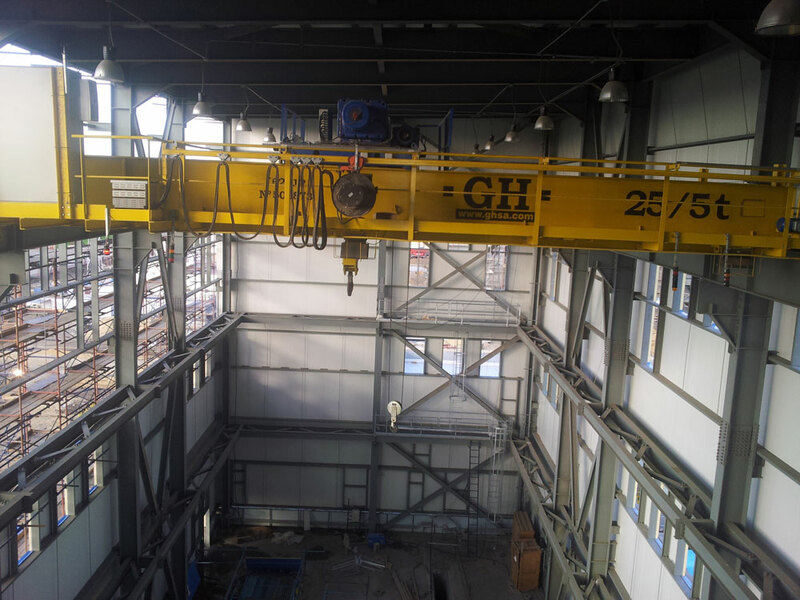 Capacity: 25t. 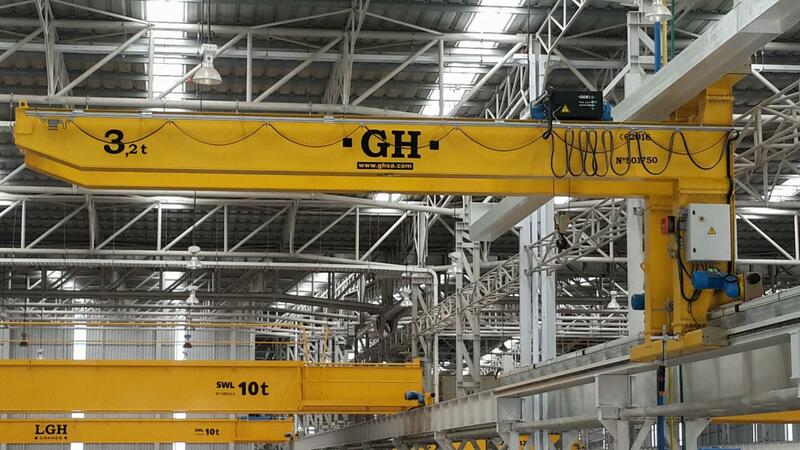 Customer: GH Tailandia. Place of installation: Tailandia. 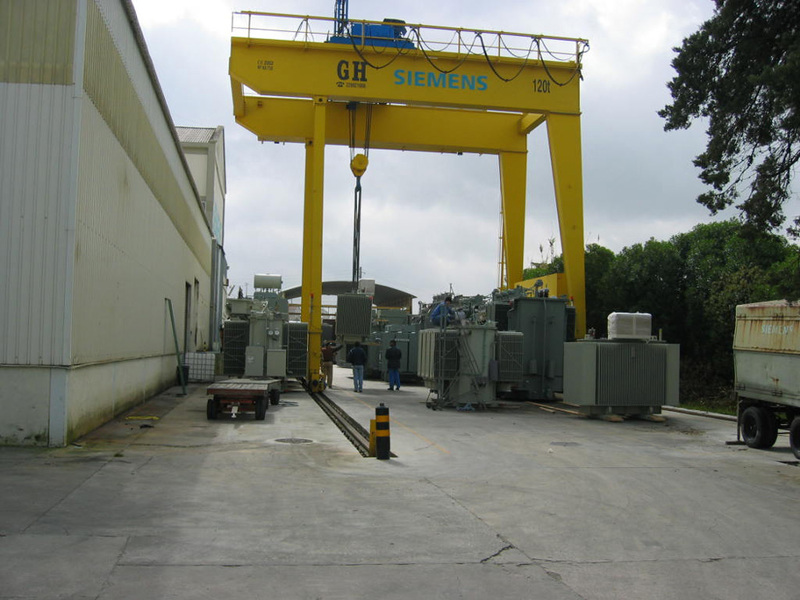 Capacity: 12,5t + 12,5t. 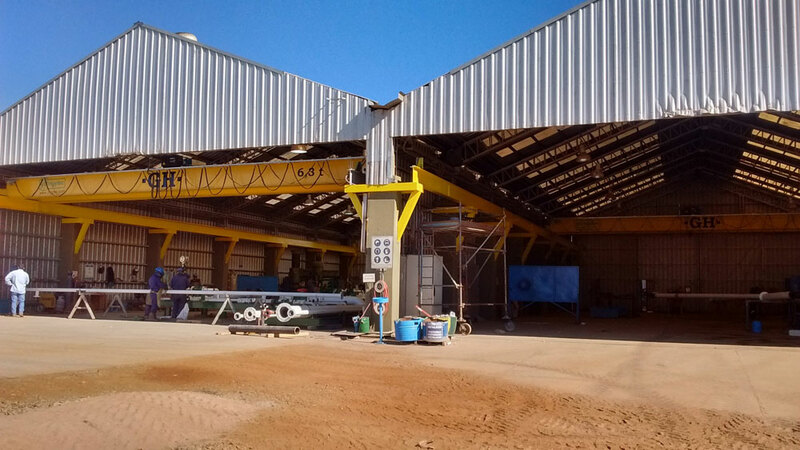 Customer: Solomold, Unipessoal Lda.. Place of installation: Aveiro. 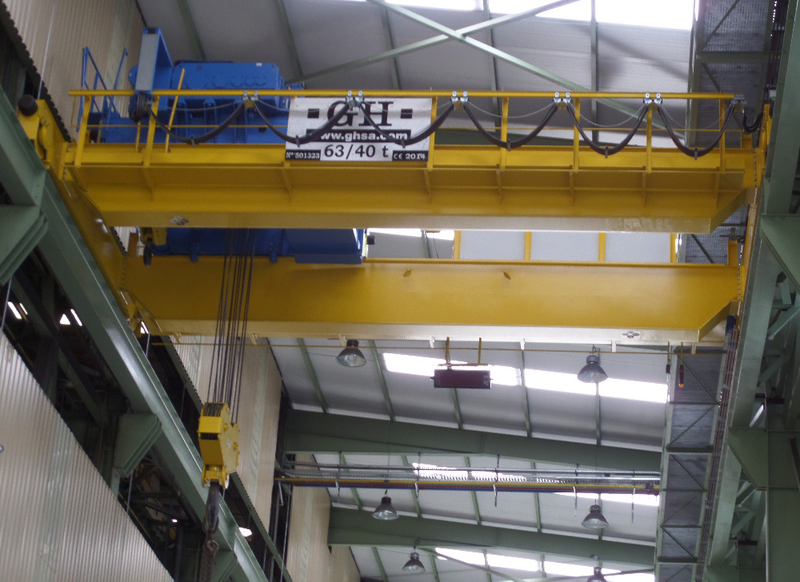 Capacity: 20t. Span: 10,4 mts. 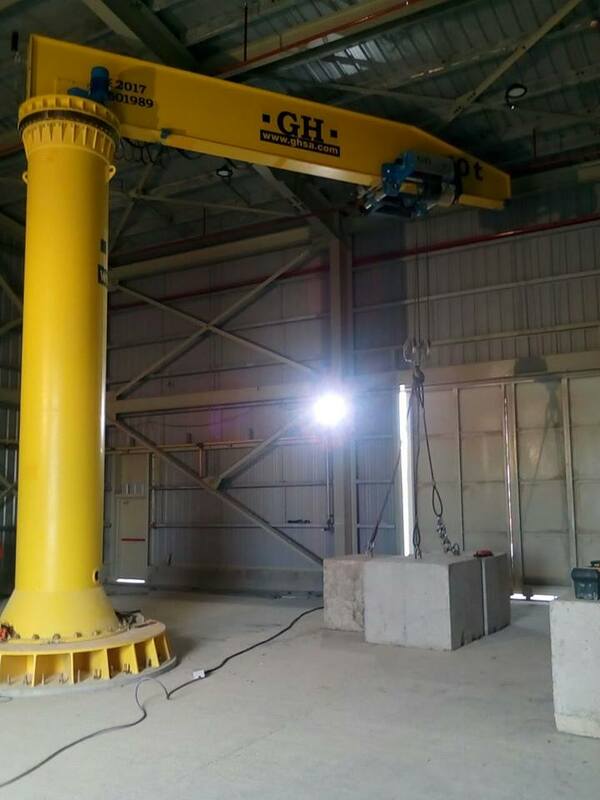 Lifting height: 4,65 mts. Customer: Ramadastorax, S.A.. Place of installation: Ovar. 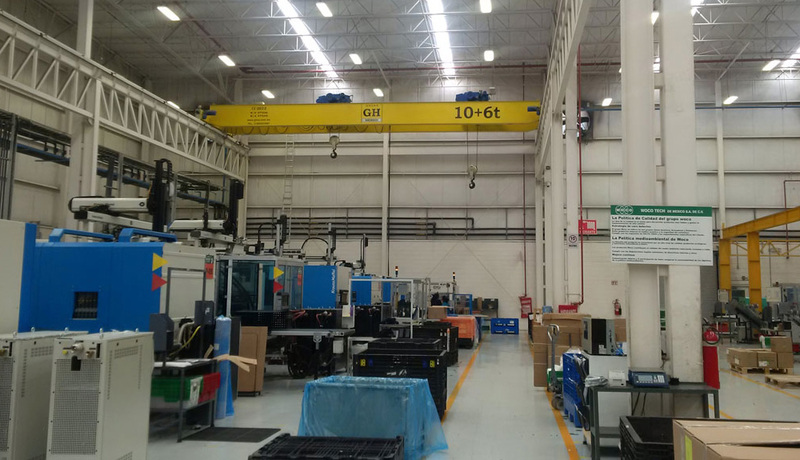 Capacity: 10t. Span: 14,5 mts. 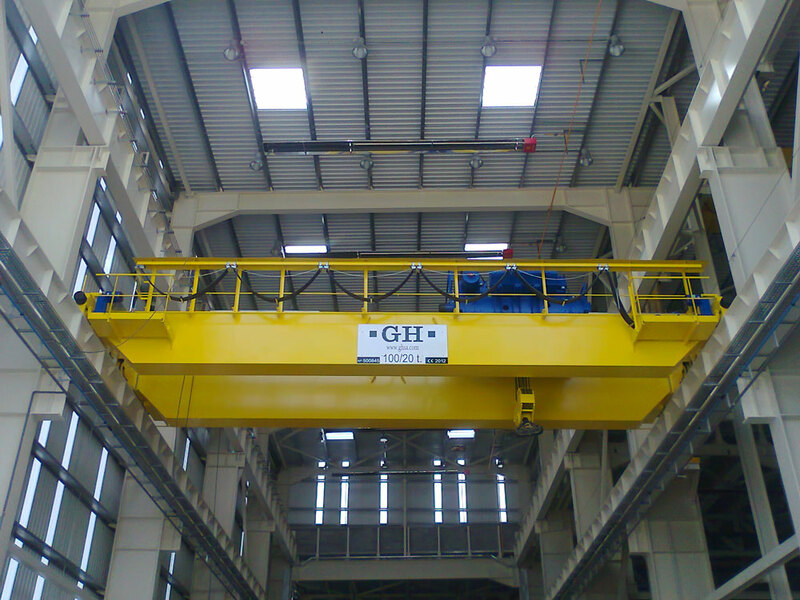 Lifting height: 6 mts. 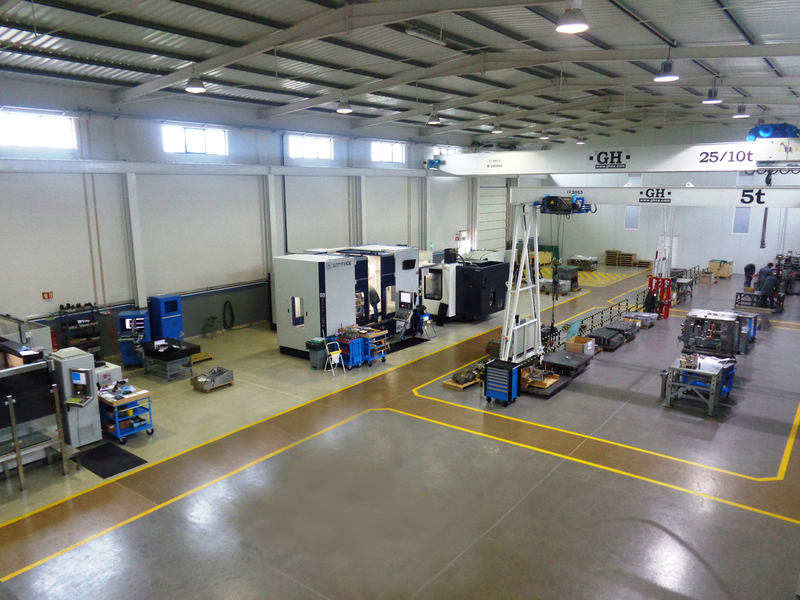 Customer: MOTRINDE - Montagens Técnicas e Rep. Industriais, S.A.. Place of installation: Cacia - Aveiro. 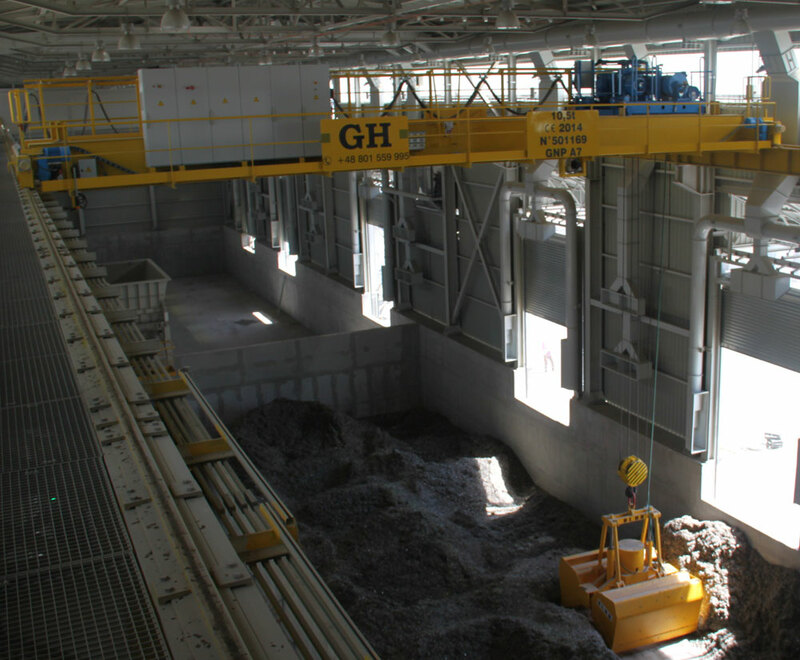 Capacity: 10 Ton. + 10/5 Ton. Span: 19 mts. 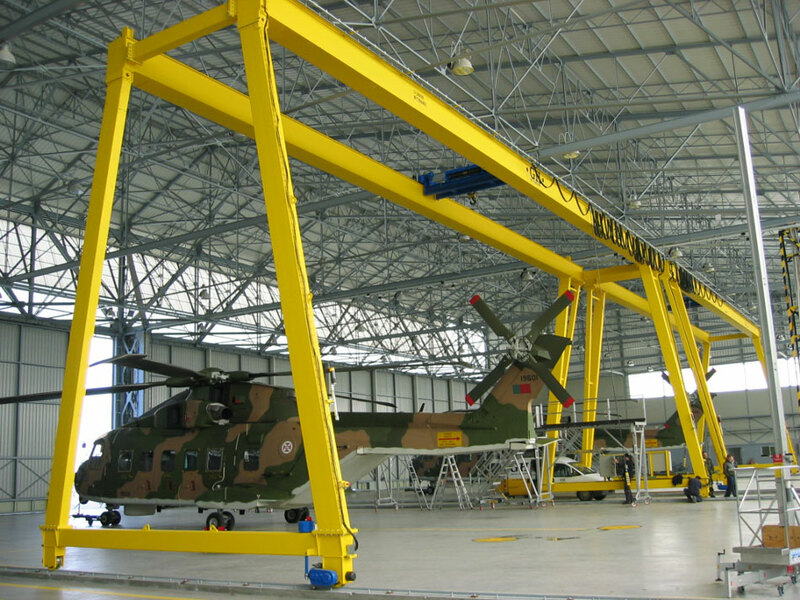 Lifting height: 7 mts. Customer: FUNDIVEN - Fundição Venezuela, S.A.. Place of installation: Águeda. 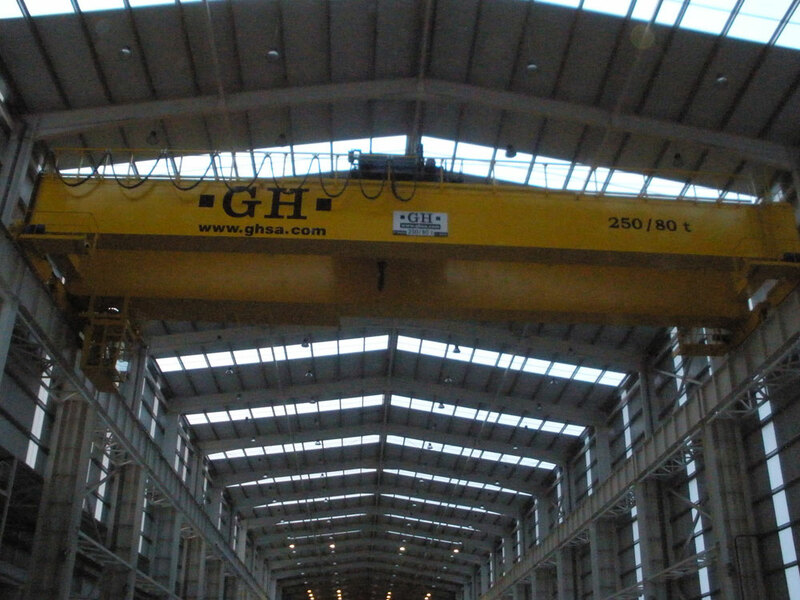 Capacity: 25t. Span: 19,26 mts. 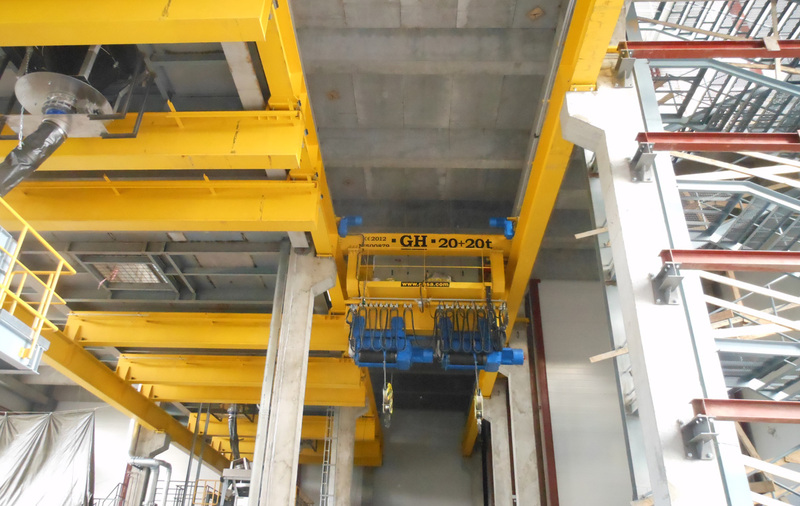 Lifting height: 9,21 mts. Customer: Gonvarri. Place of installation: Wrzesnia. Capacity: 35t. 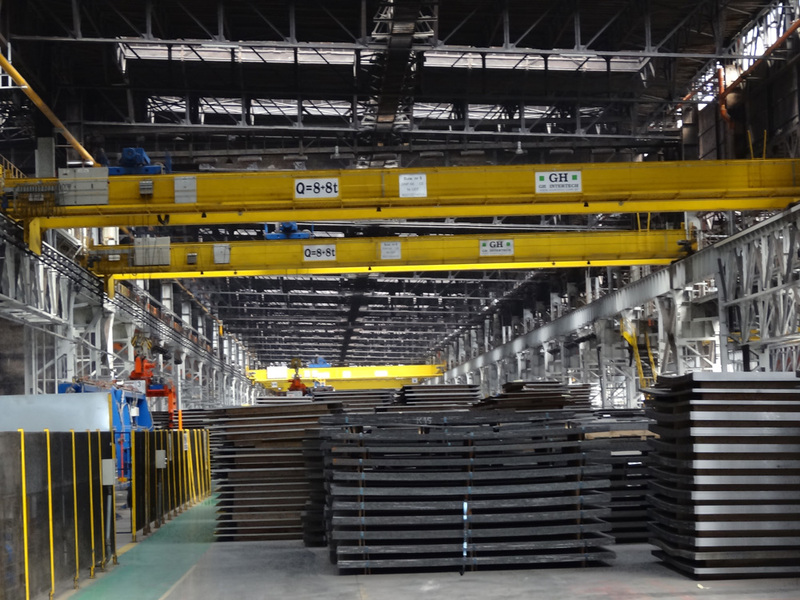 Customer: Industrias Lekue. Place of installation: Sevilla. Capacity: 5t. Customer: Albico. Place of installation: Colombia. Capacity: 3,2t. Customer: Avianca. Place of installation: Colombia. 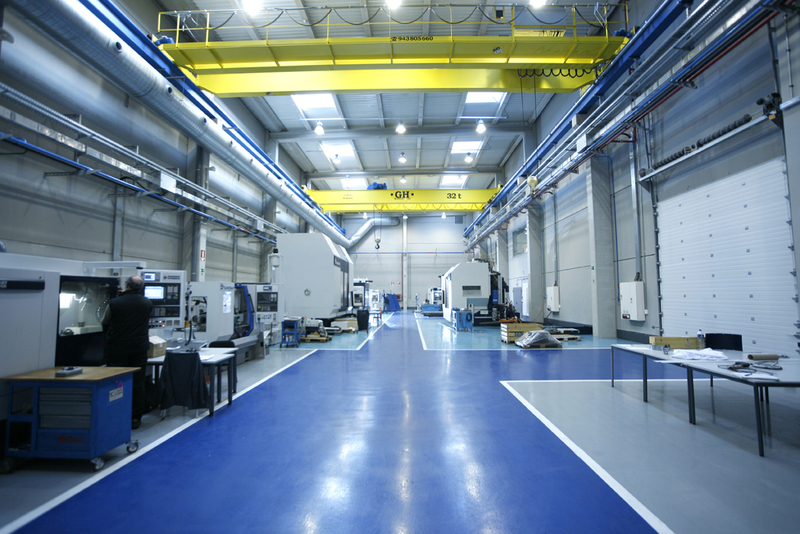 Capacity: 10t. Customer: JE Jaimes Ingenieros. Place of installation: Colombia. Capacity: 3,2t. Customer: Imbera Cooling. Place of installation: Colombia. 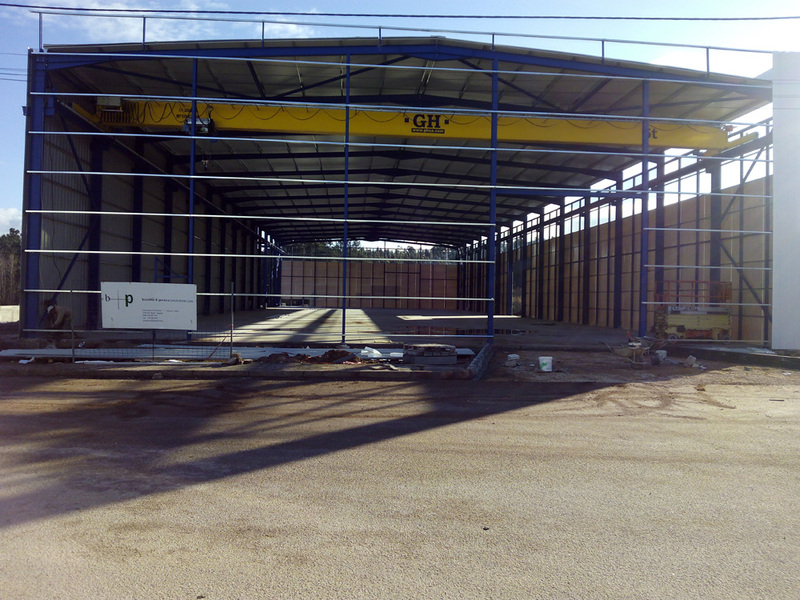 Capacity: 10t. Customer: Maquinaria Colas. 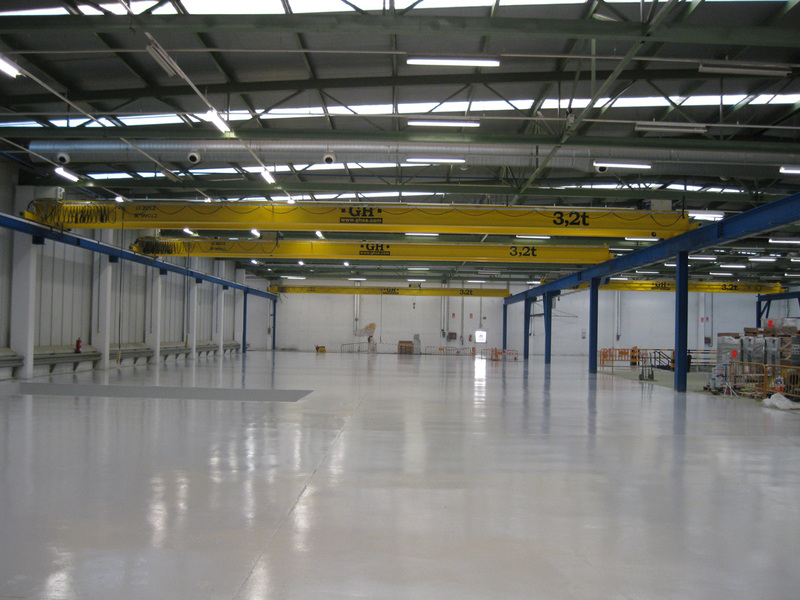 Capacity: 12/12t. Place of installation: Brasil. 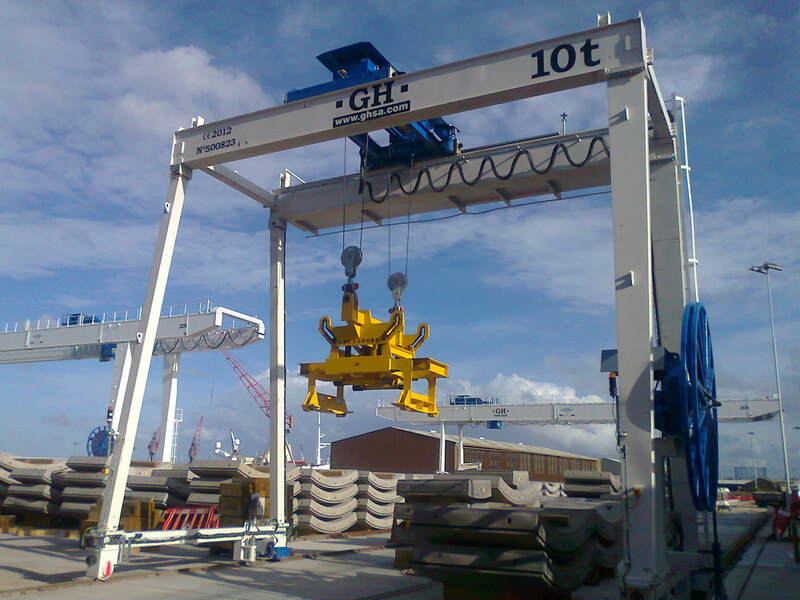 Capacity: 500kg. 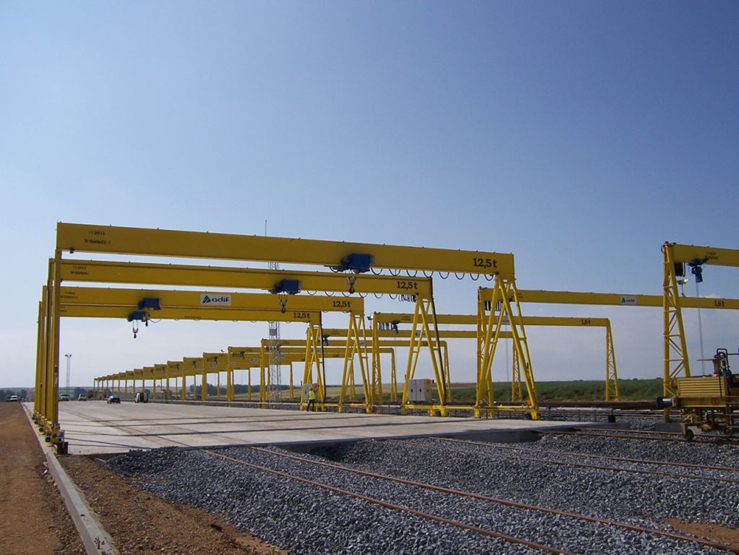 Place of installation: Emiratos Árabes. 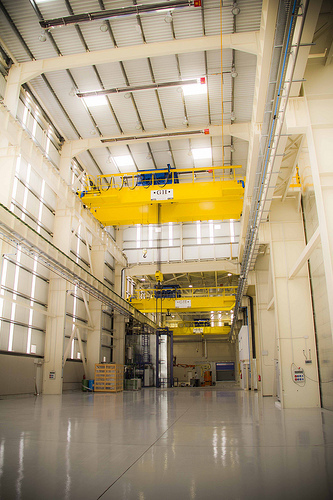 Capacity: 10t. 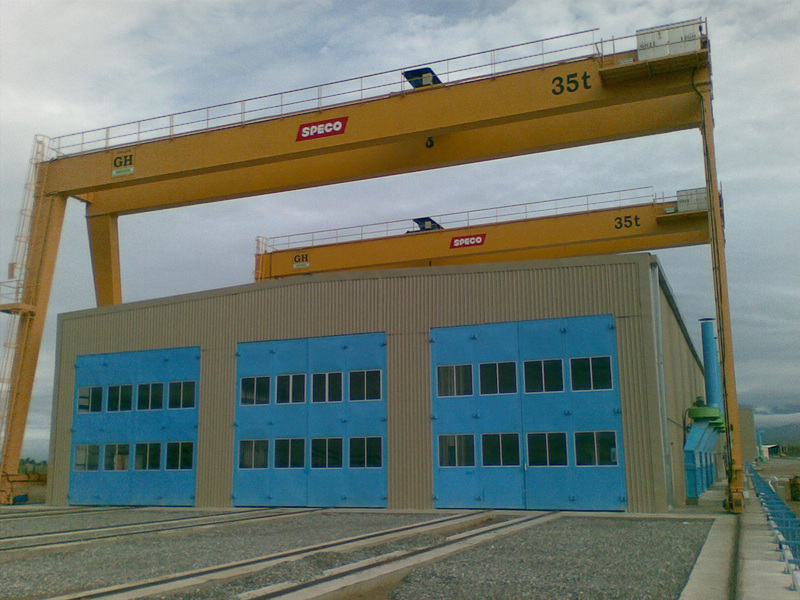 Place of installation: Emiratos Árabes. Capacity: 8t. Customer: Talleres FF CC ROCA. Place of installation: Argentina. Capacity: 3,2t. 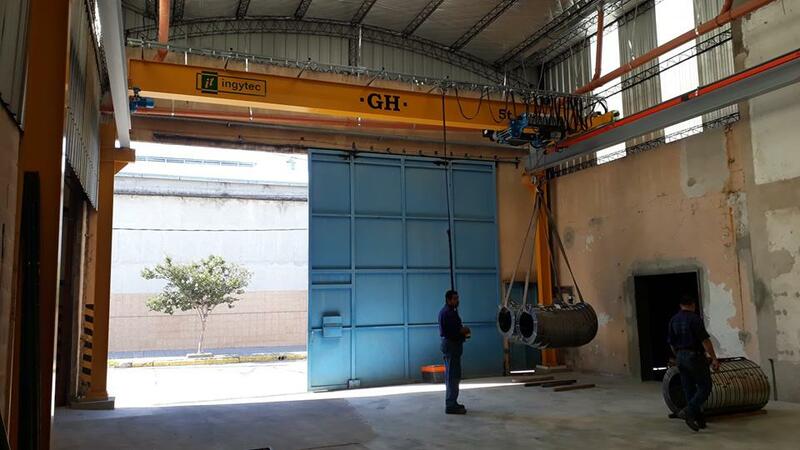 Customer: Rovella Carranza S.A.. Place of installation: Alto Reyes, Jujuy. Capacity: 5t. 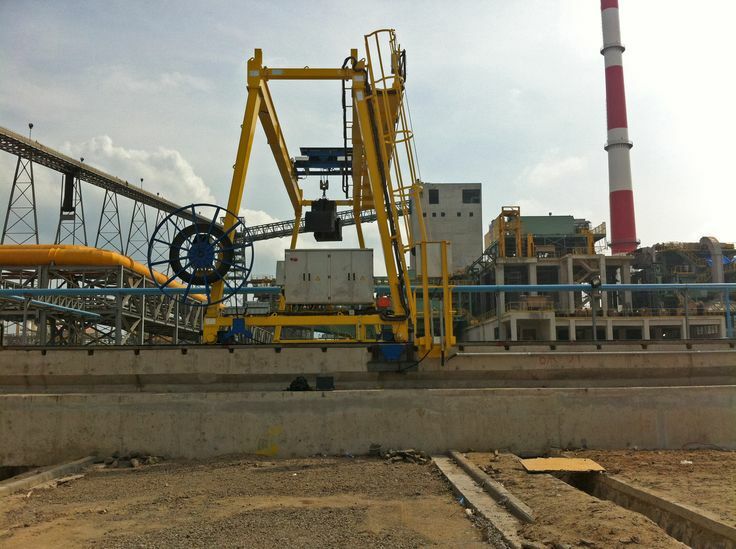 Customer: Oilfield Production Services. Place of installation: Argentina. 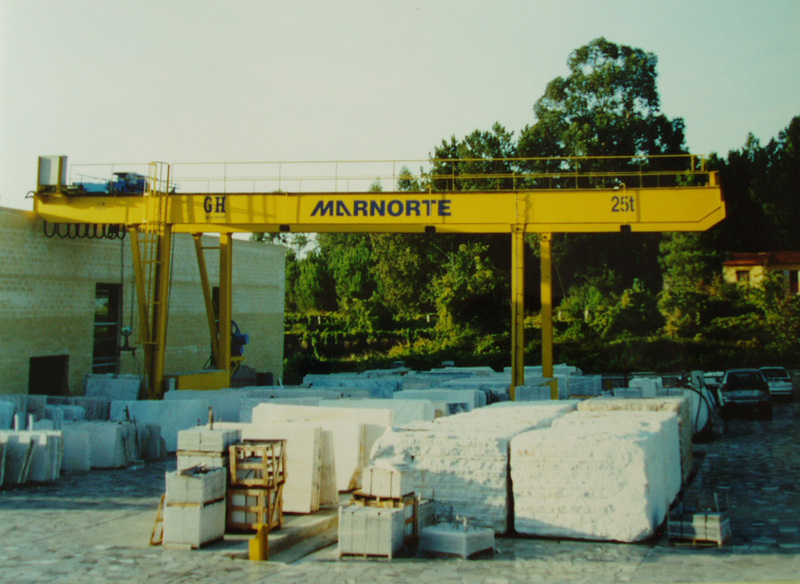 Capacity: 6,3t. 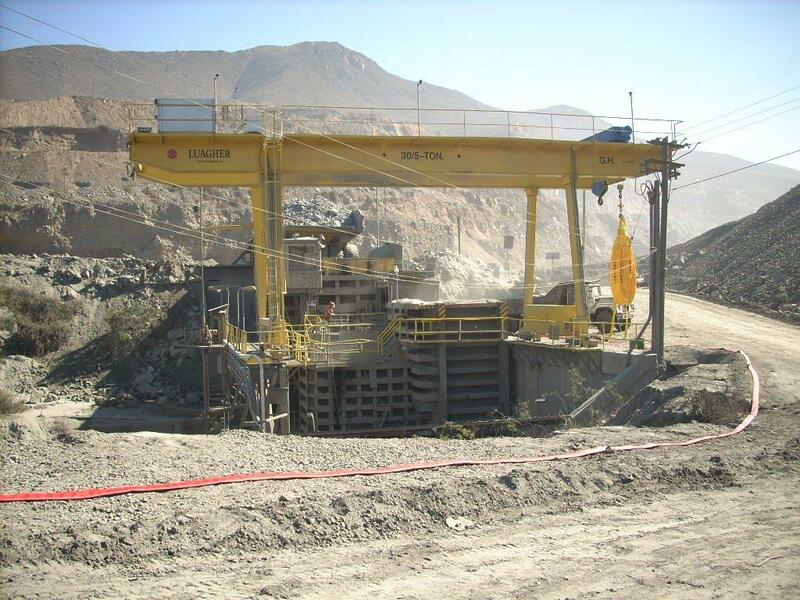 Customer: Yamana Gold Inc. Place of installation: Cerro Moro, Provincia de Santa Cruz. 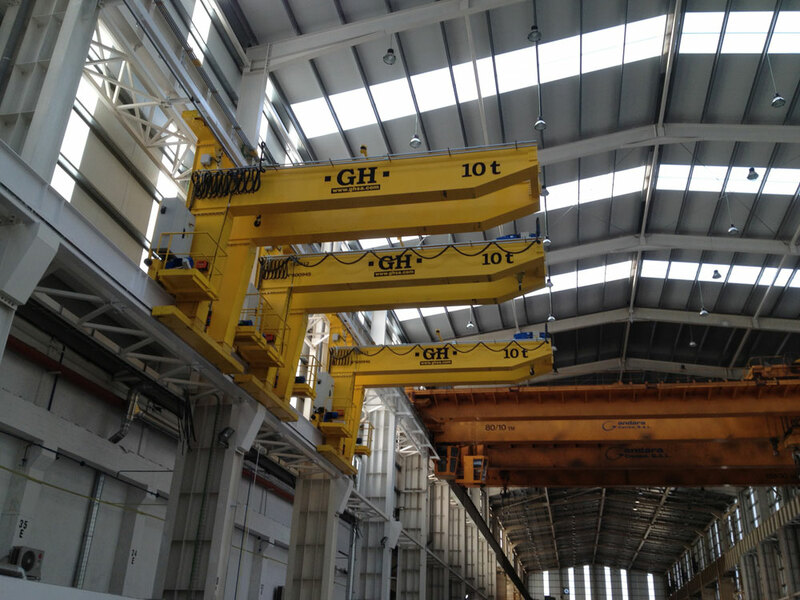 Capacity: 10t. 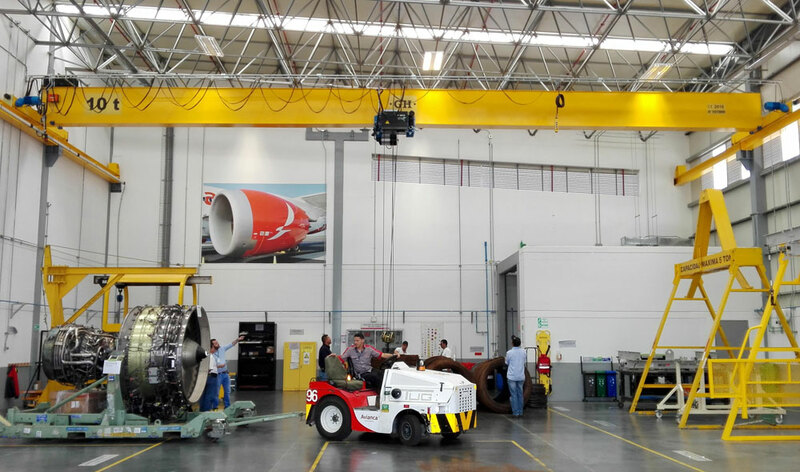 Customer: Spirax Sarco Argentina. Place of installation: Argentina. Capacity: 6,3t. 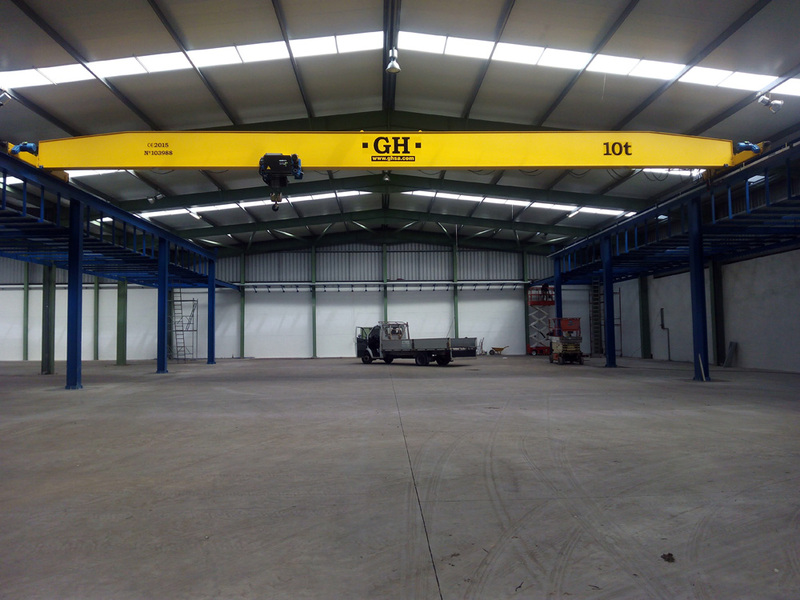 Span: 15m. 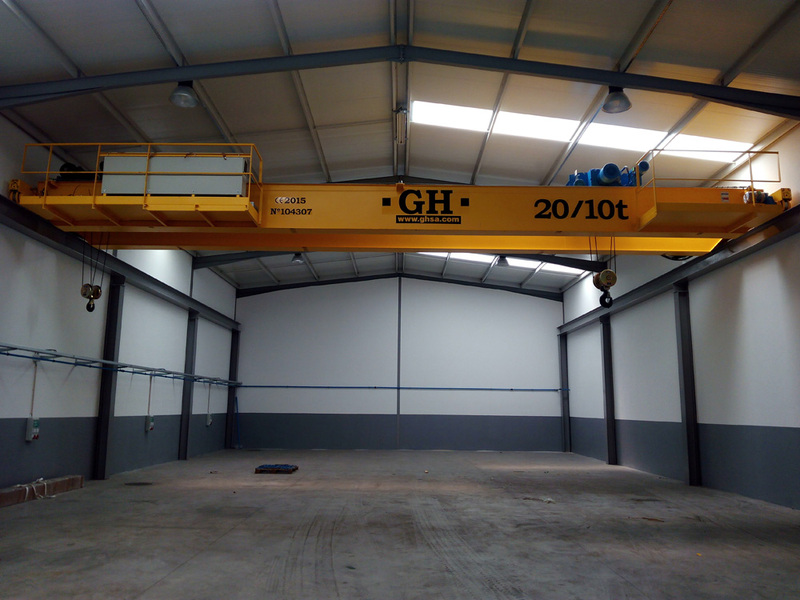 Customer: Gestión Vizcaína de patrimonios, S.L.. Capacity: 2x5t. Span: 16,924m. Customer: Crucianelli. 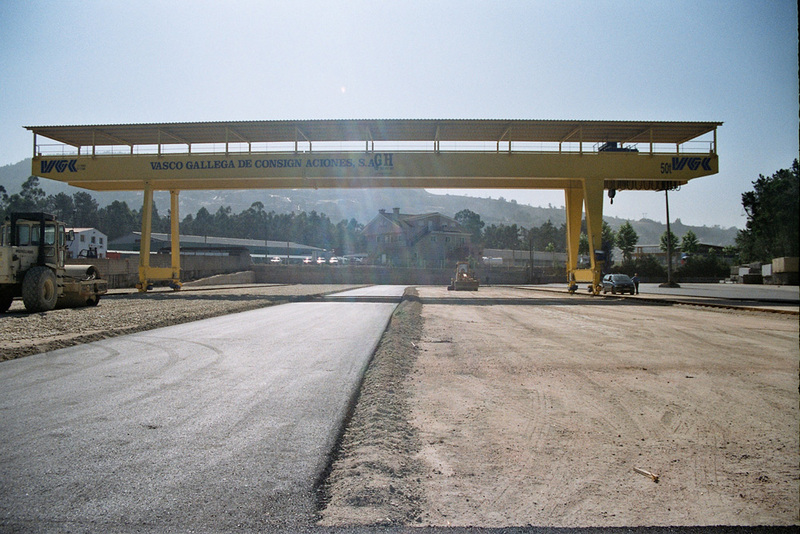 Place of installation: Armstrong, Provincia de Santa Fe. 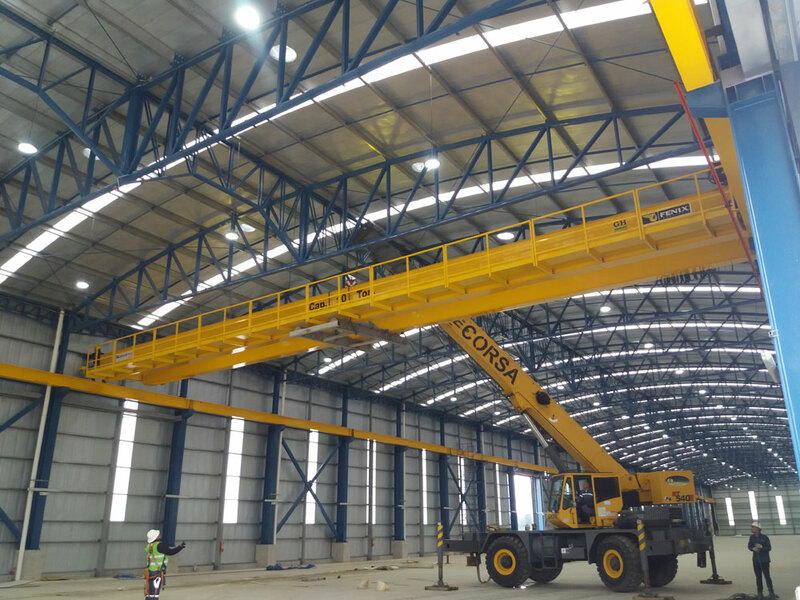 Capacity: 6,3 y 10 t.. Span: 27m. 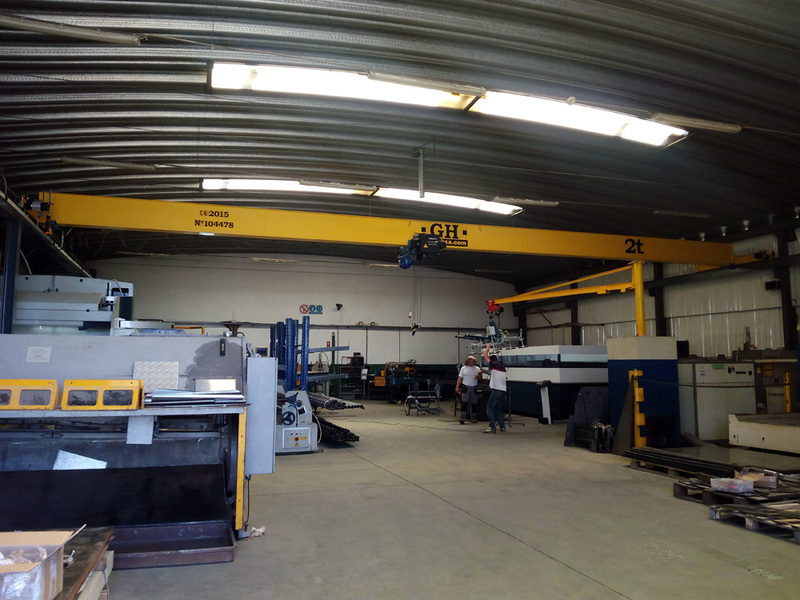 Customer: Mecanizados Damfer, S.A.. Place of installation: Vitoria-Gasteiz. 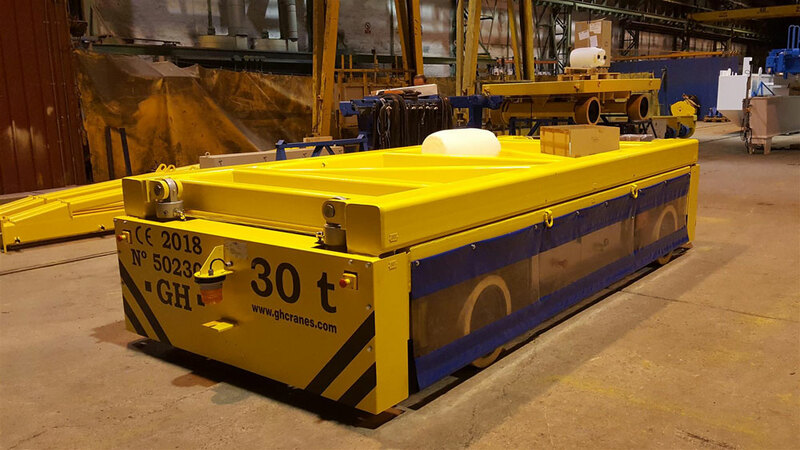 Capacity: 20t. Customer: UTE Itercon-Zikoitz. 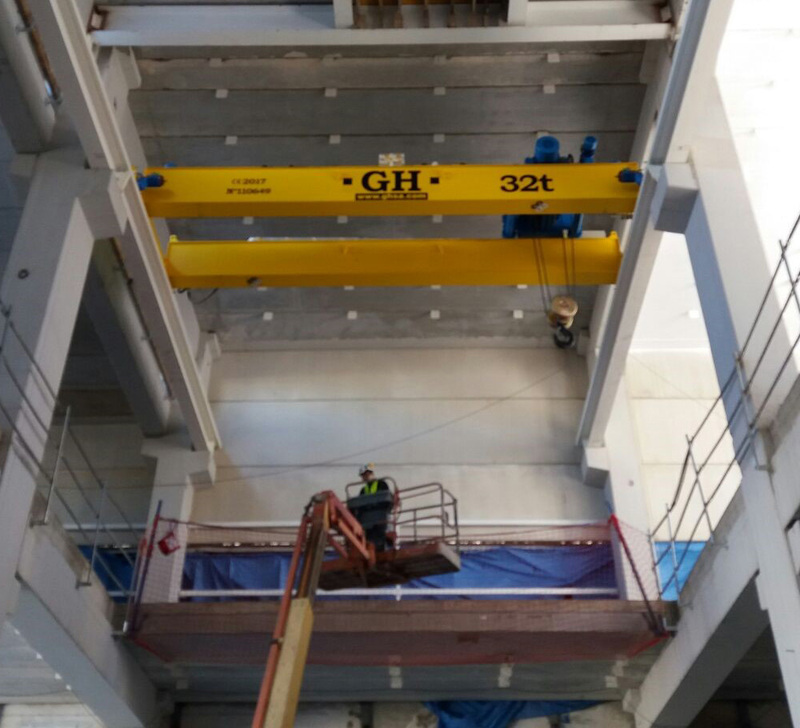 Place of installation: Michelin España Portugal, S.A.. Capacity: 32t. Span: 8,8. 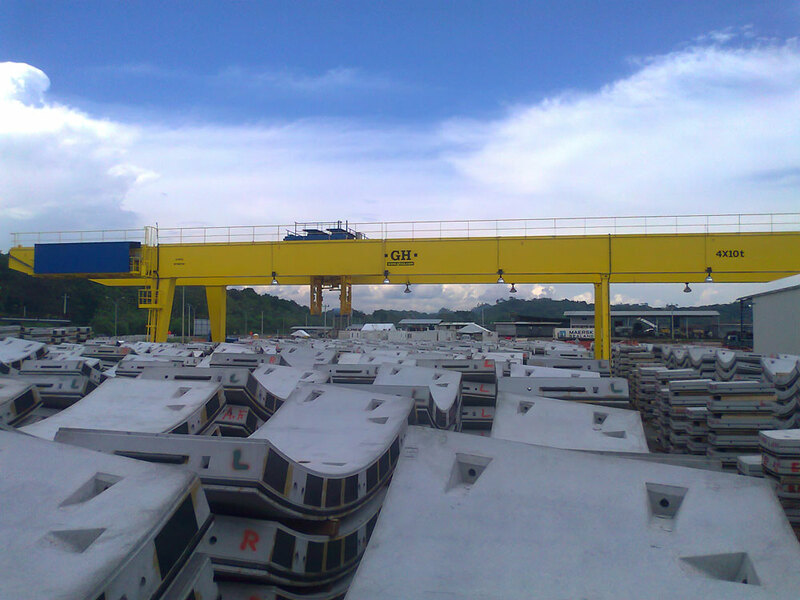 Customer: Aker Solutions Malaysia Sdn Bhd. Place of installation: Malasia. 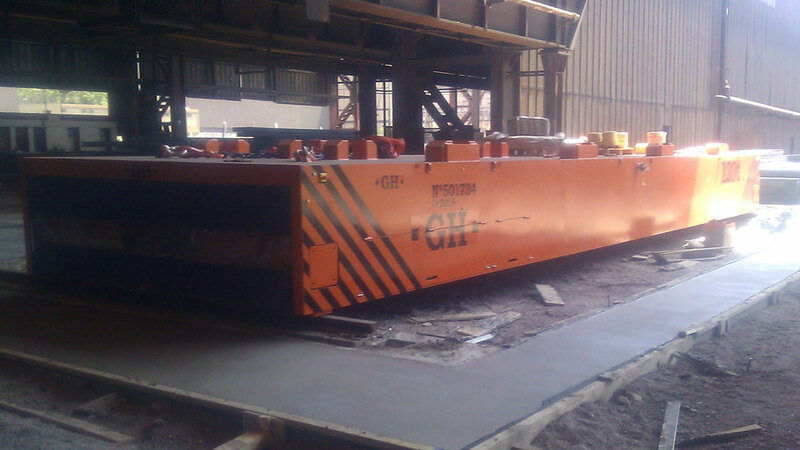 Capacity: 60t. Customer: Grupo Armando Álvarez. 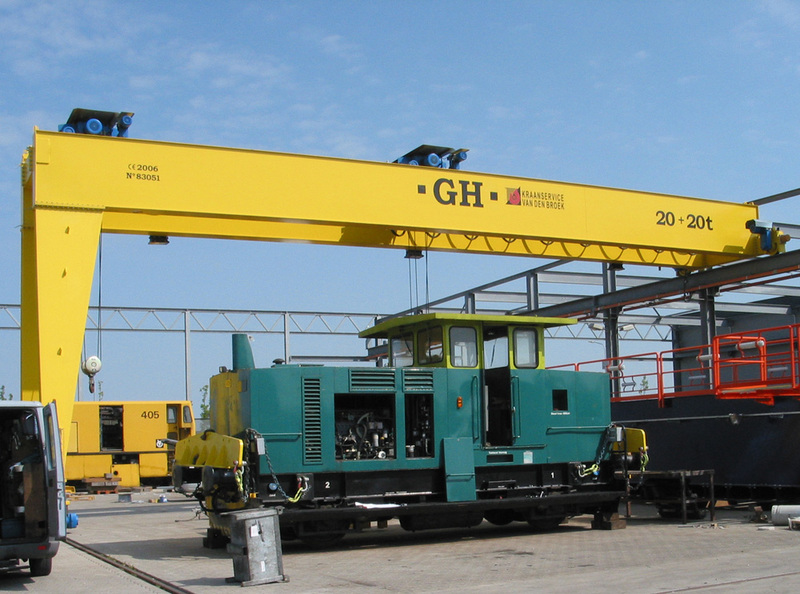 Capacity: 20t. Customer: Nissan. 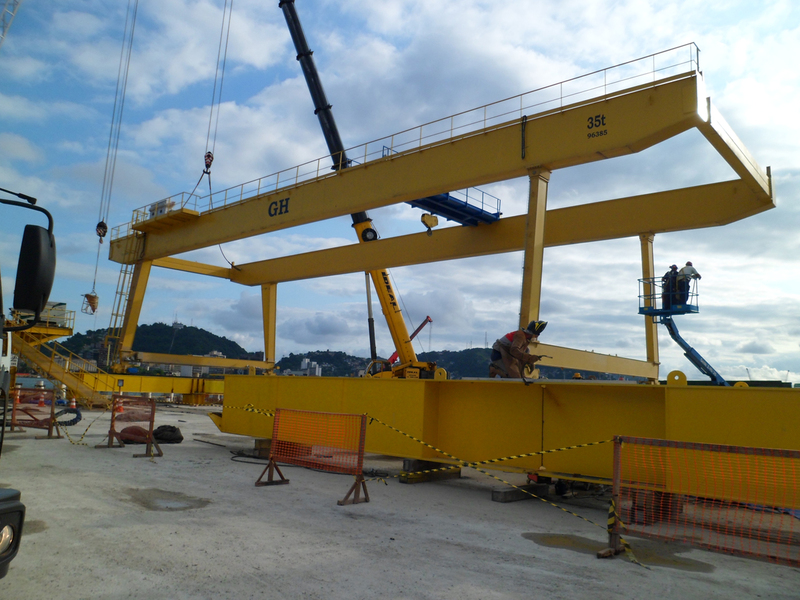 Place of installation: Resende (Rio de Janeiro). 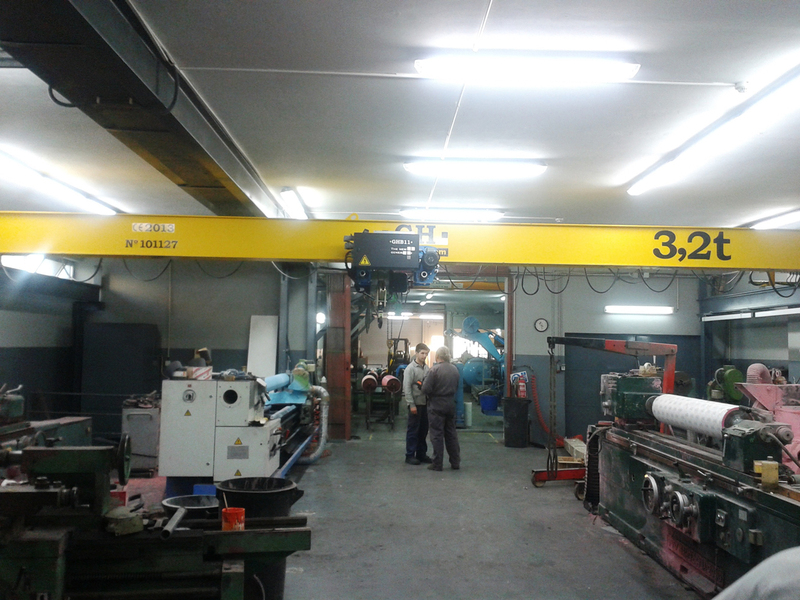 Capacity: 35/16t. Customer: Constructora Queiroz Galvao. 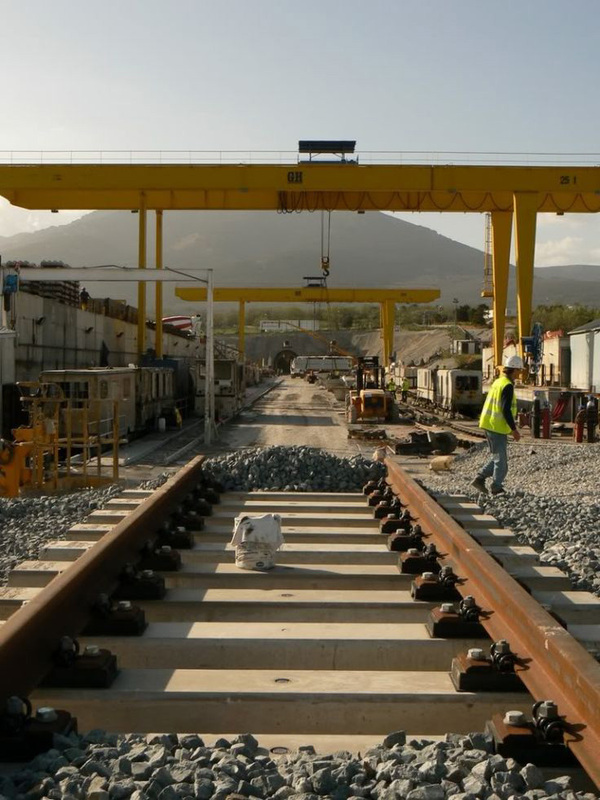 Place of installation: El salvador. 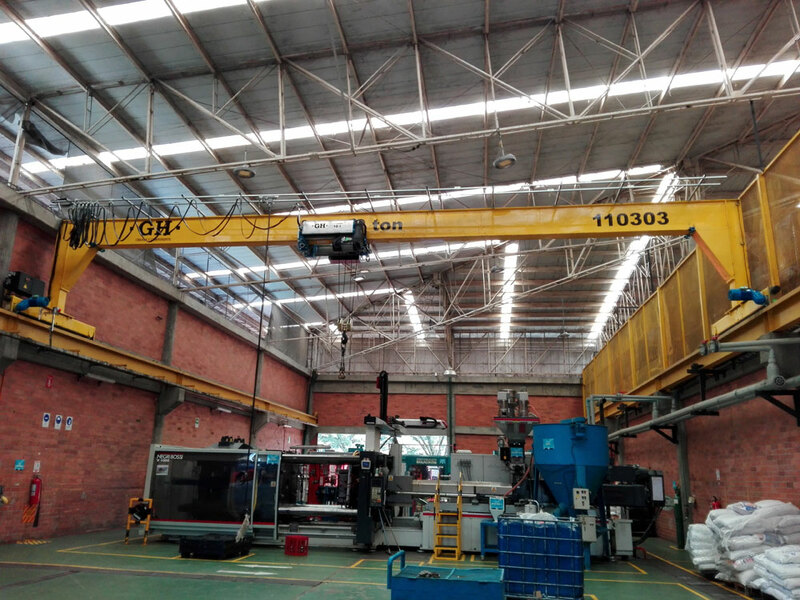 Capacity: 90/15t. Span: 19,7m. Customer: SAKANA SCOOP. 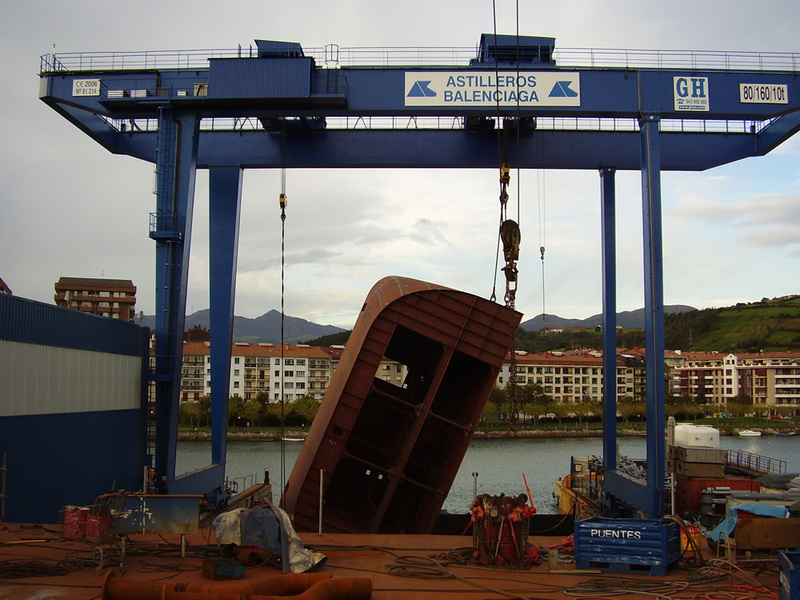 Place of installation: Alsasua. 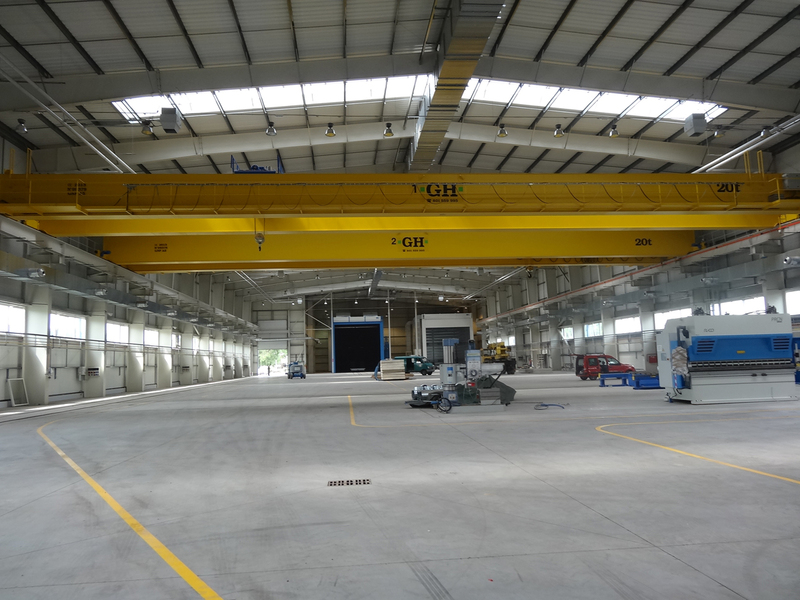 Capacity: 63/40t. Customer: Sakana. Place of installation: Alsasua. 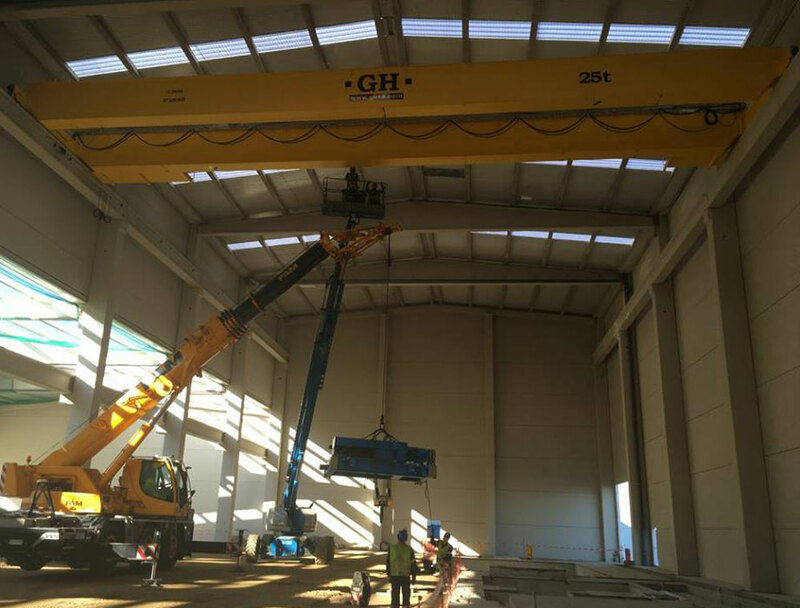 Capacity: 63/40t. 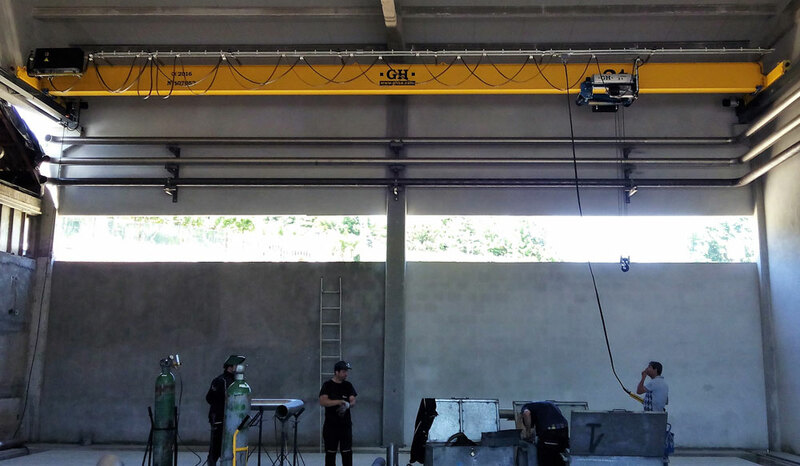 Customer: Budimex, S.A.. Place of installation: Varsovia (Polonia). 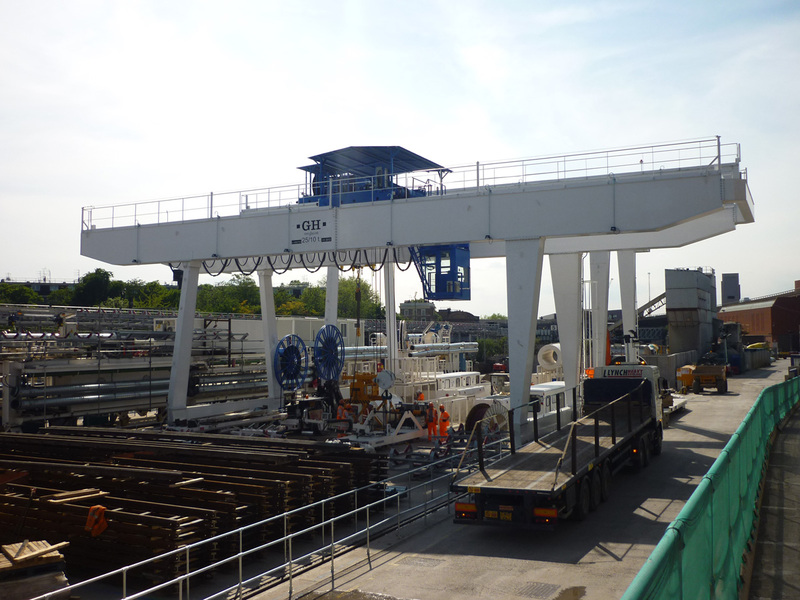 Capacity: 10t. 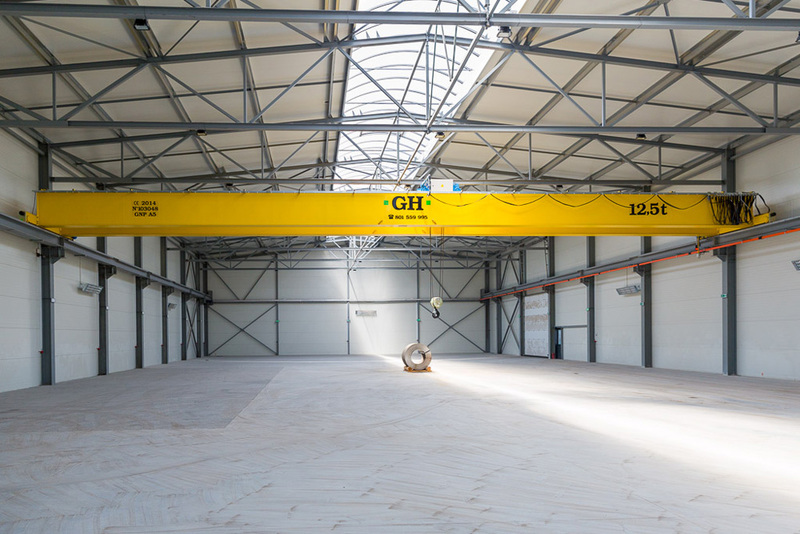 Span: 18,35m. 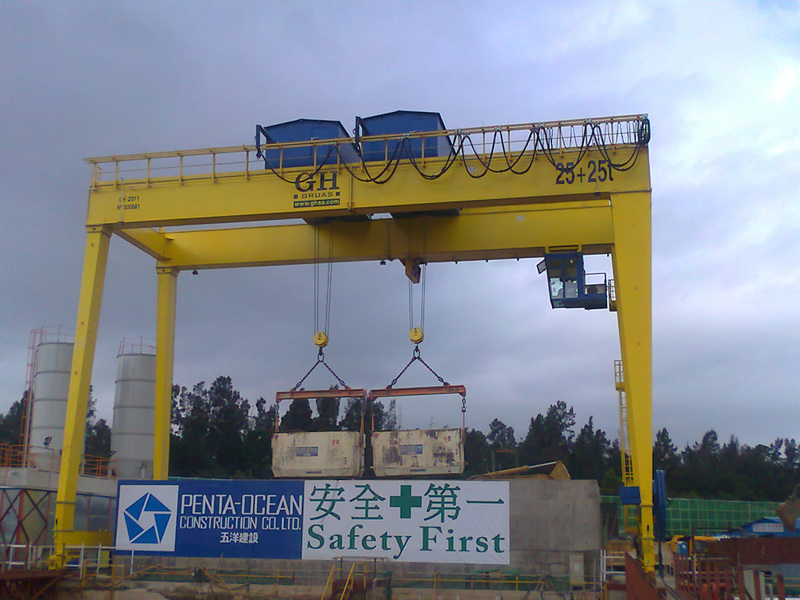 Lifting height: 37m. Customer: Port à Sec des Eaux blanches. 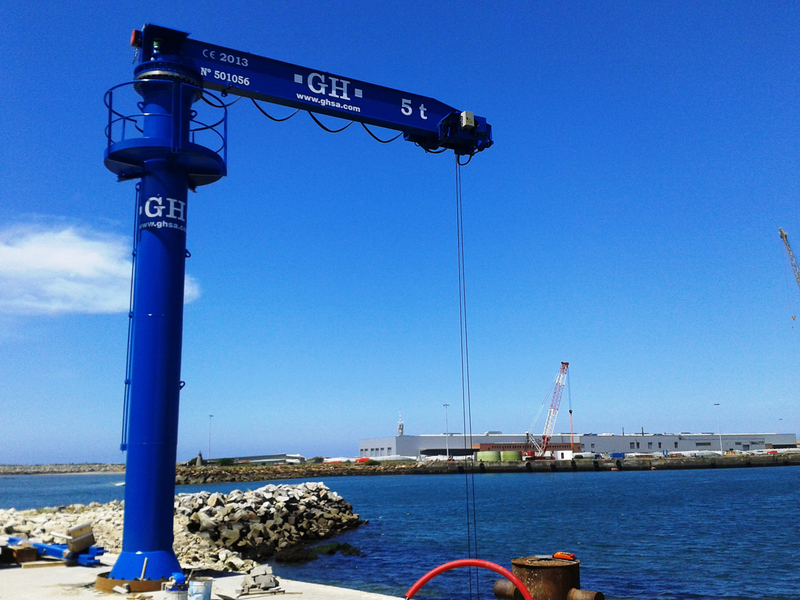 Place of installation: Sete (France). Capacity: 2,5t. 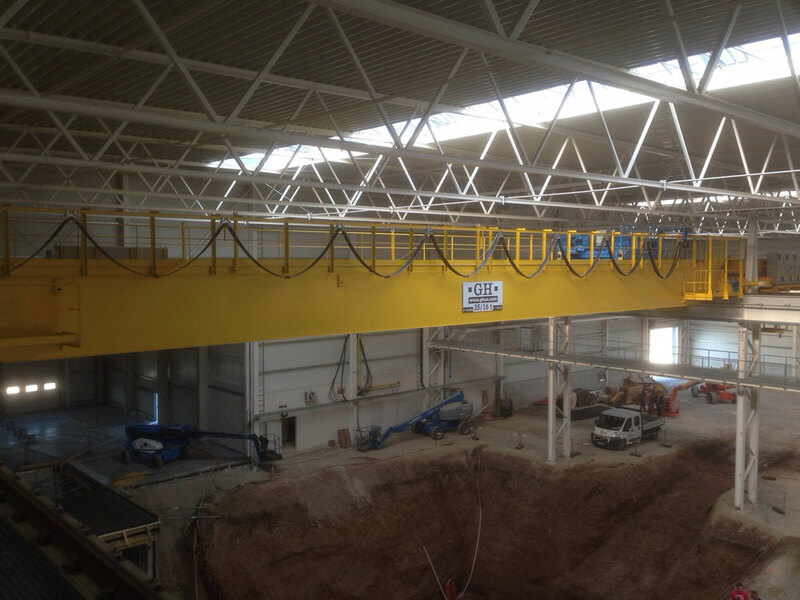 Span: 20m. Customer: Arri. Place of installation: Arri. 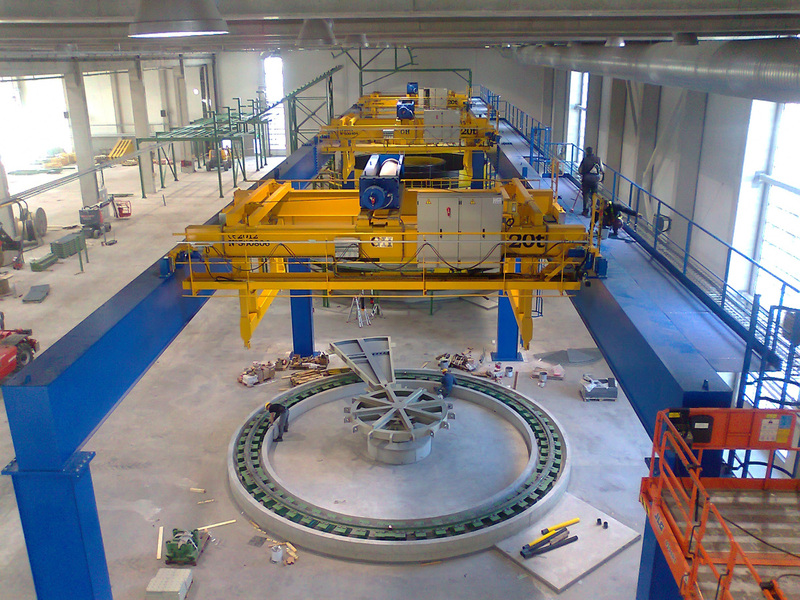 Customer: Voith Hydro. Place of installation: Mount Coffee (Liberia). 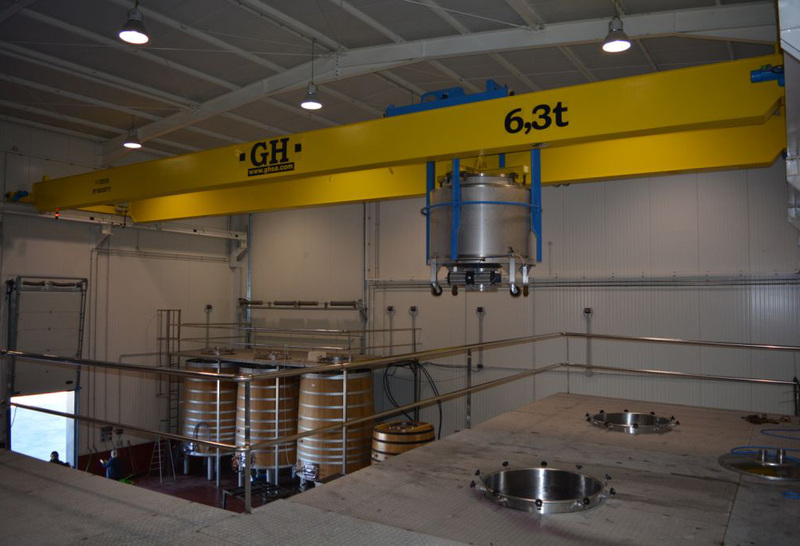 Capacity: 95/15t. Customer: ANDRITZ HYDRO y socio local ENSULMECI. 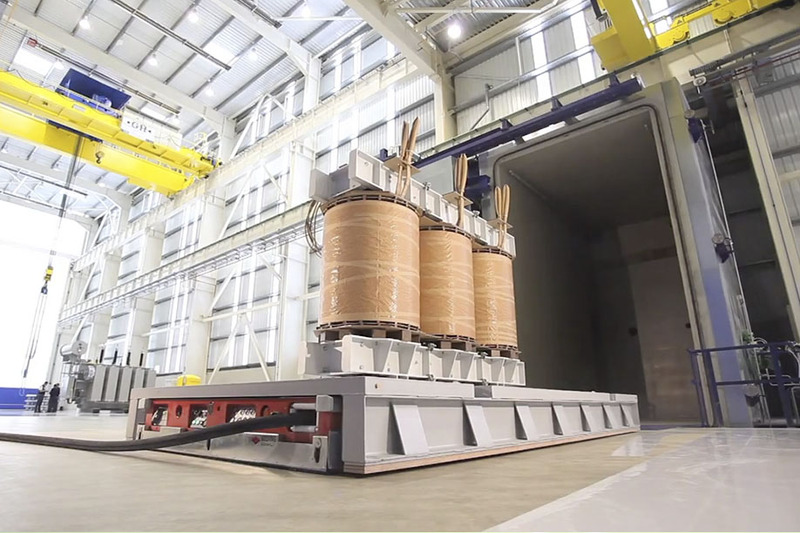 Place of installation: Central Hidroeléctrica Baixo Sabor, en el norte de Portugal. 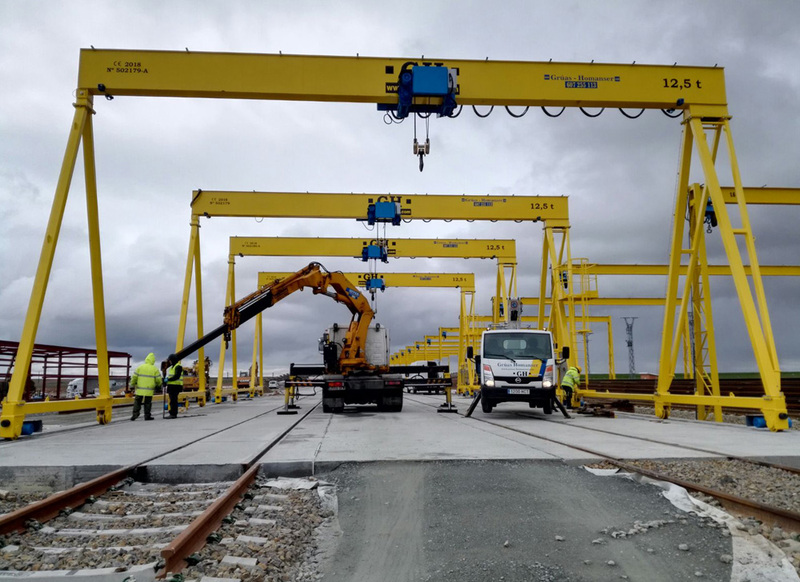 Capacity: 115/12,5t. 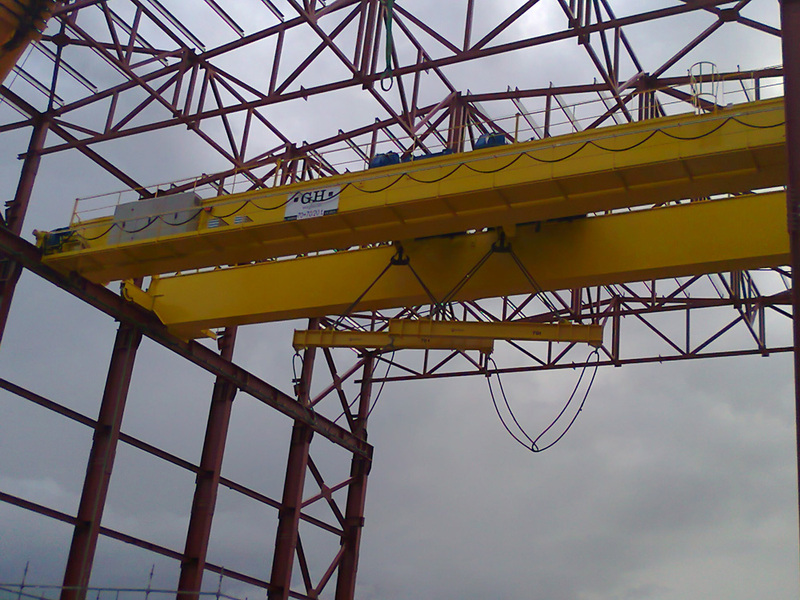 Customer: Orascom Construcción. 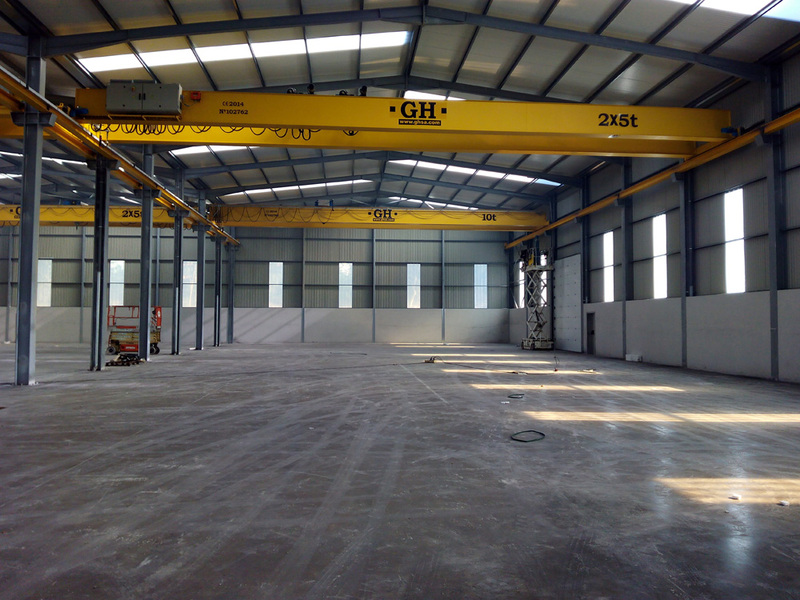 Place of installation: El Cairo (Egipto). 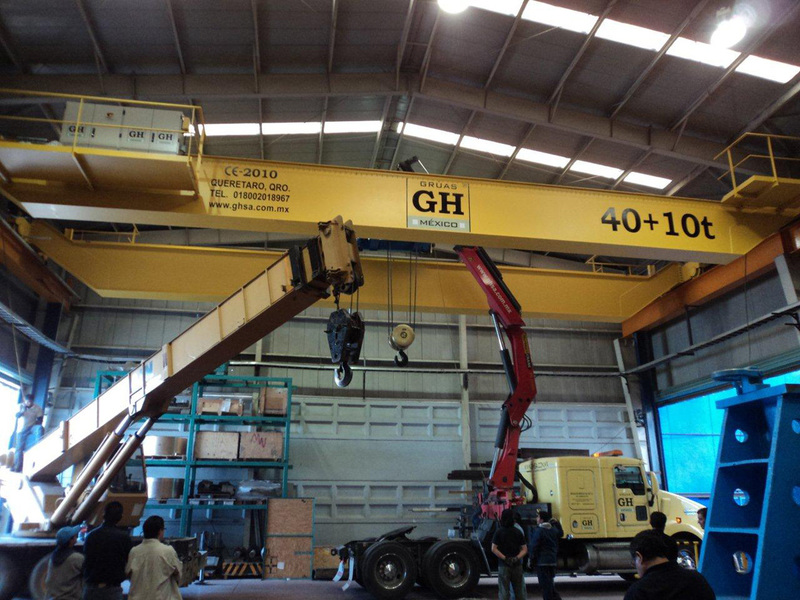 Capacity: 200/30/12,5t. 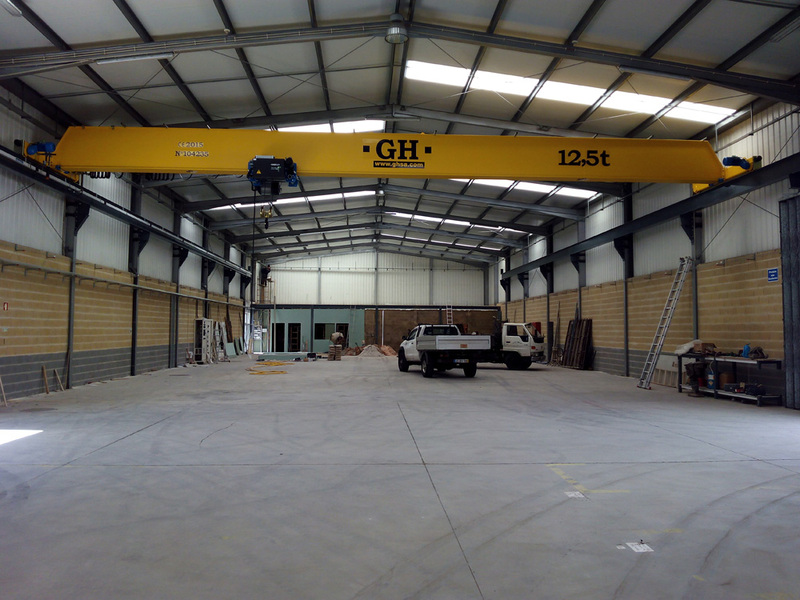 Span: 17m. 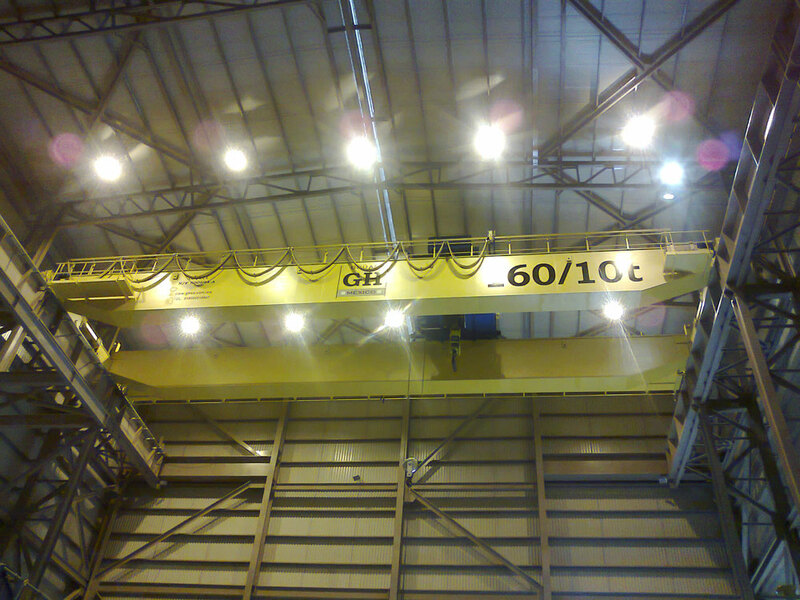 Lifting height: 20m. Customer: Sakana. Place of installation: Navarra. 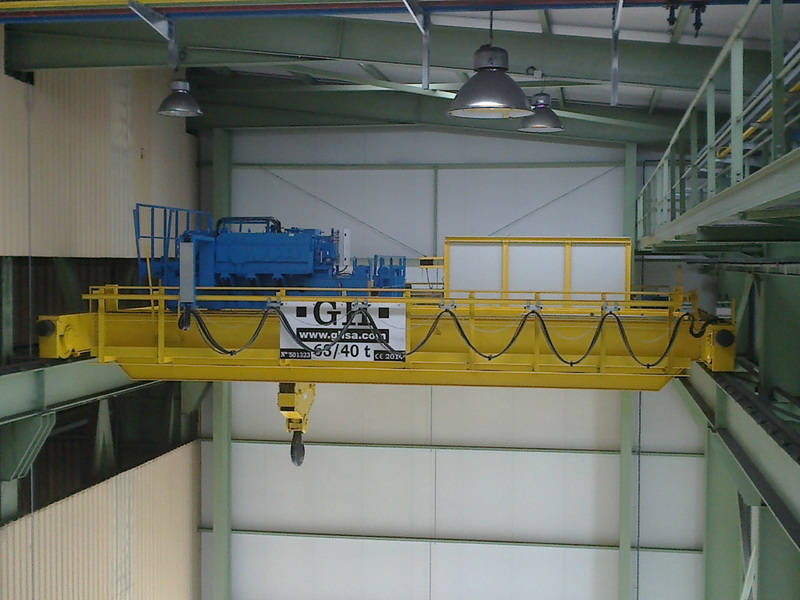 Capacity: 63/40t. Span: 10,33m. 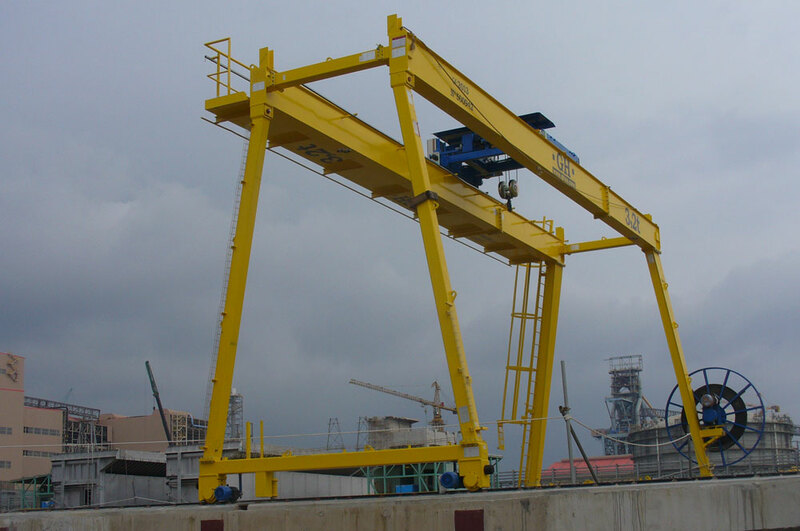 Lifting height: 14,3m. 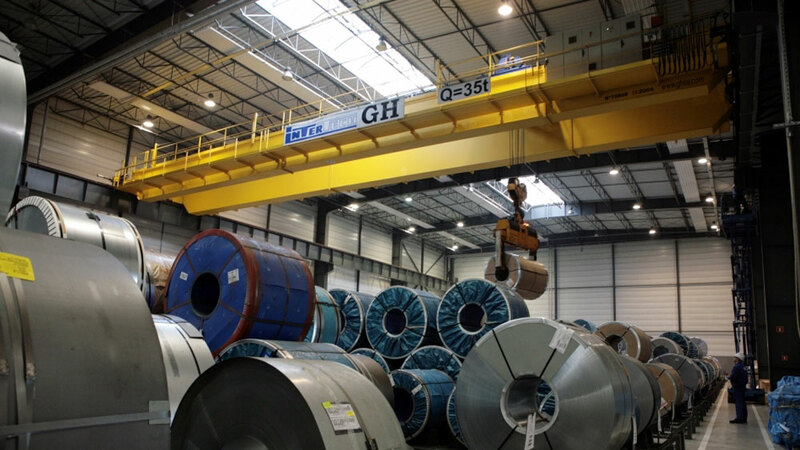 Customer: Global Steel. Place of installation: Santader. 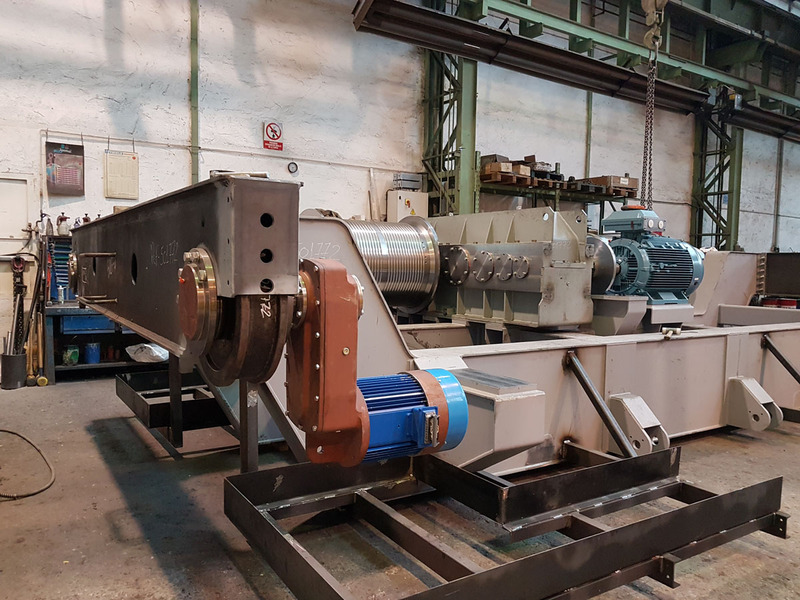 Capacity: 2x15t. 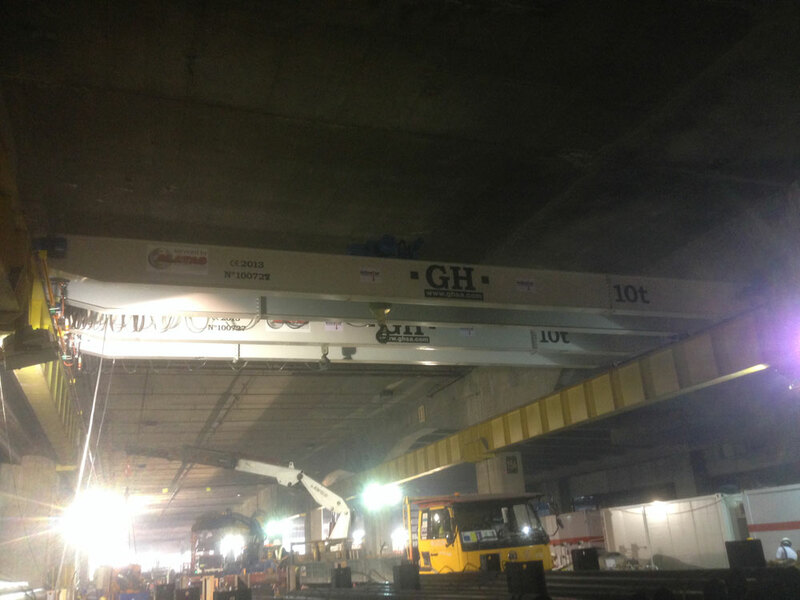 Span: 8100mm. 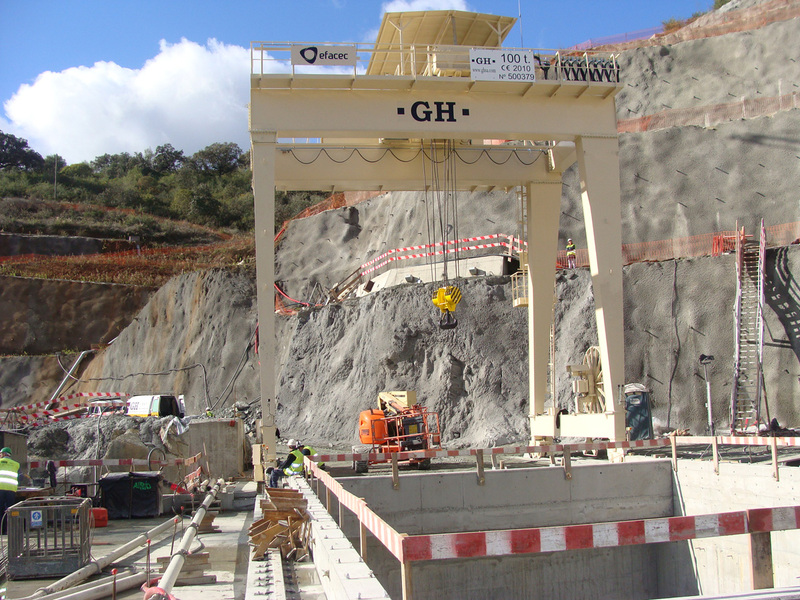 Customer: Acciona Infraestructura and Ghella Ans. 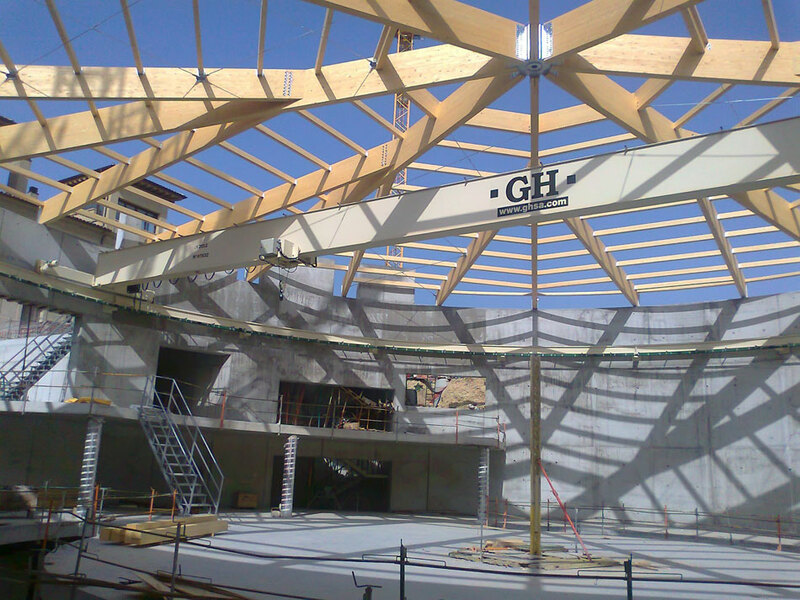 Place of installation: Oslo (Noruega). Customer: Woco Tech. 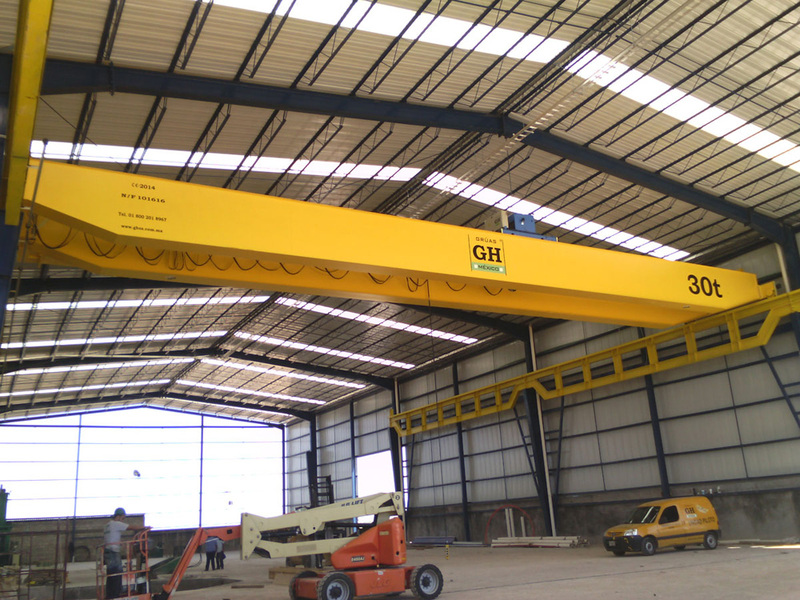 Place of installation: Querétaro. 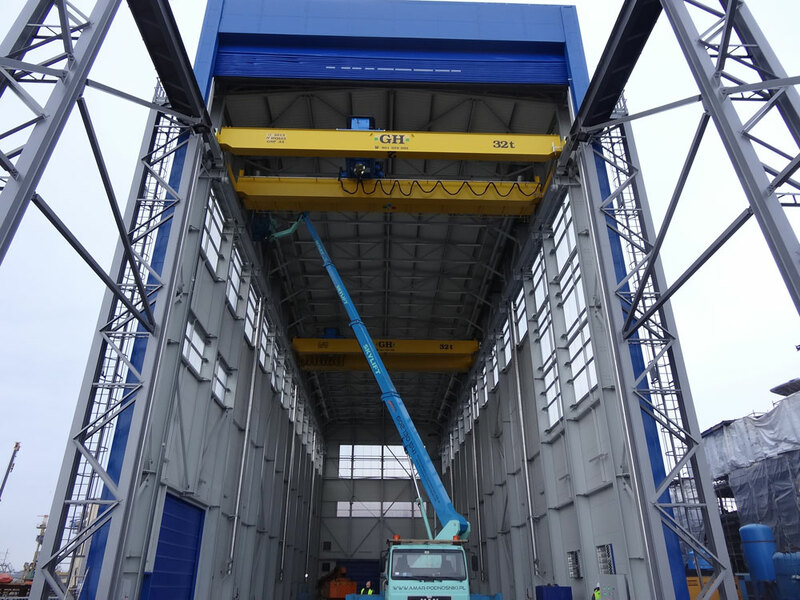 Capacity: 10+6t. Customer: Tubocreto. 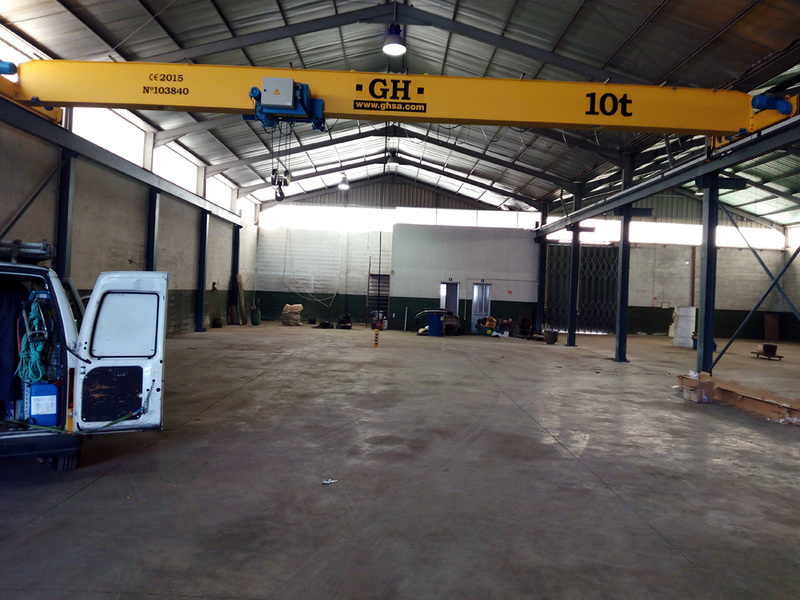 Place of installation: Lagos de Moreno, Jalisco. Capacity: 30 Tn. Customer: FCC. 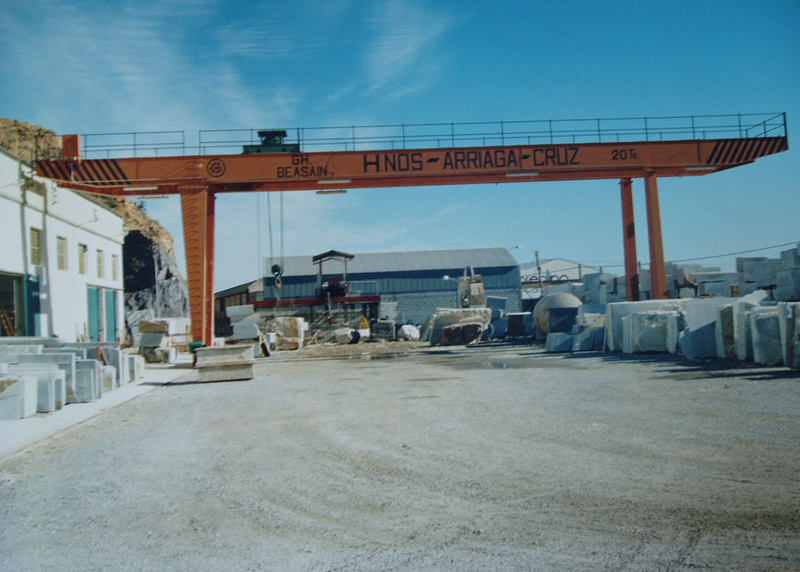 Place of installation: Presa de Castrovido (Terrazas - Burgos). Capacity: 8t. Customer: Wawrzyniak. 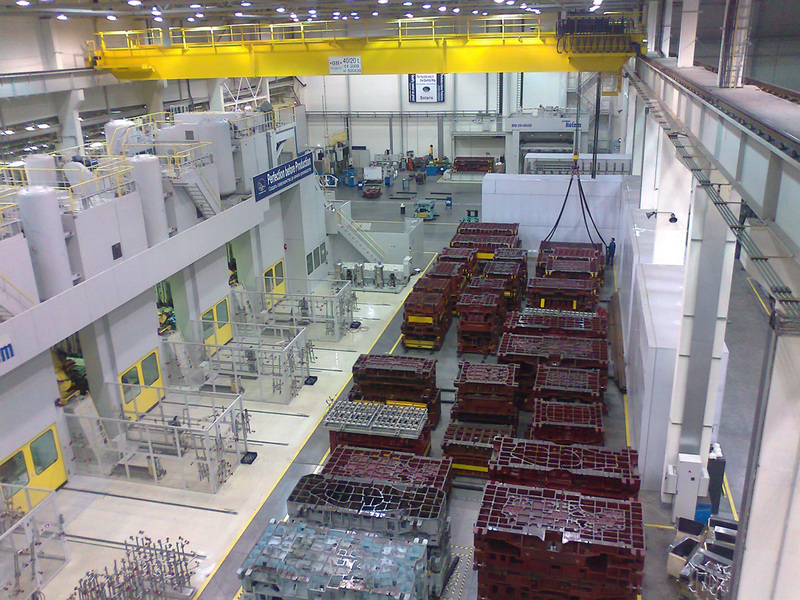 Place of installation: Zbiersk. 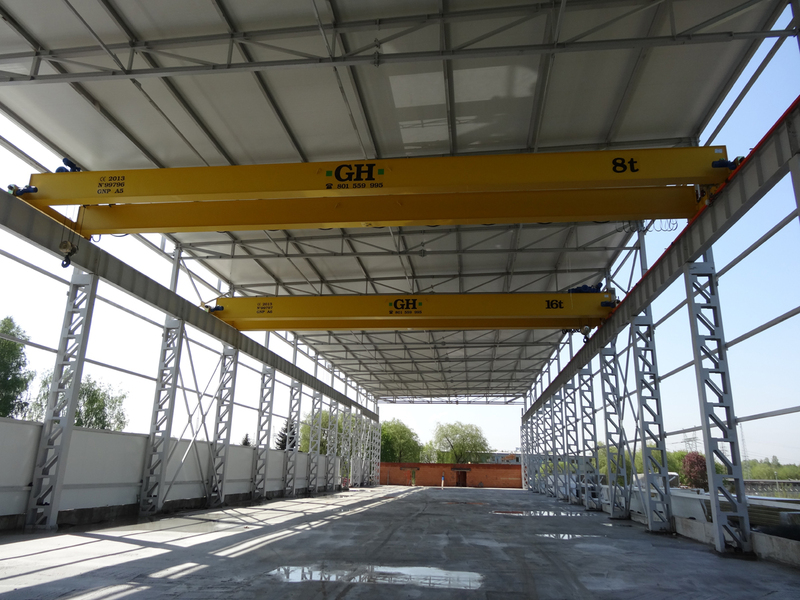 Capacity: 10t. Customer: Mostostal. 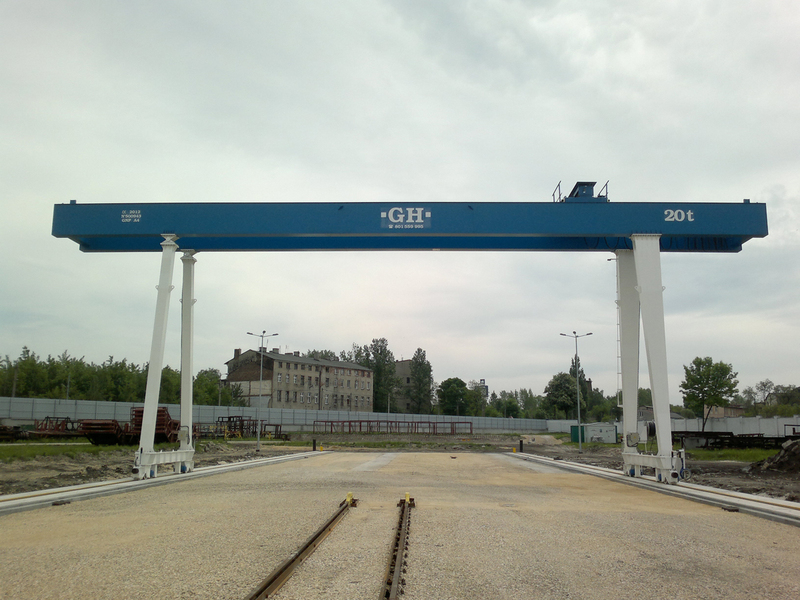 Place of installation: Szczecin, Polonia. 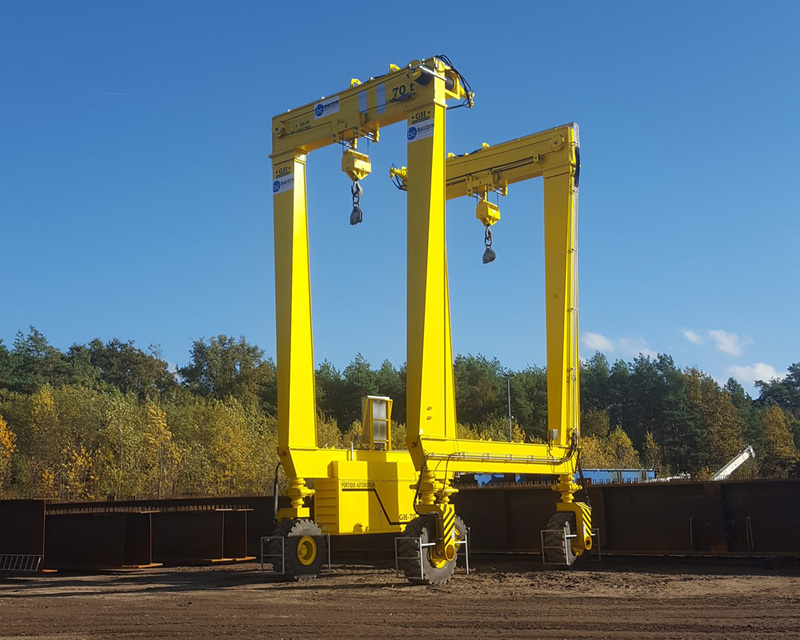 Capacity: 15t. Customer: Konstal. Place of installation: Cracovia, Polonia. 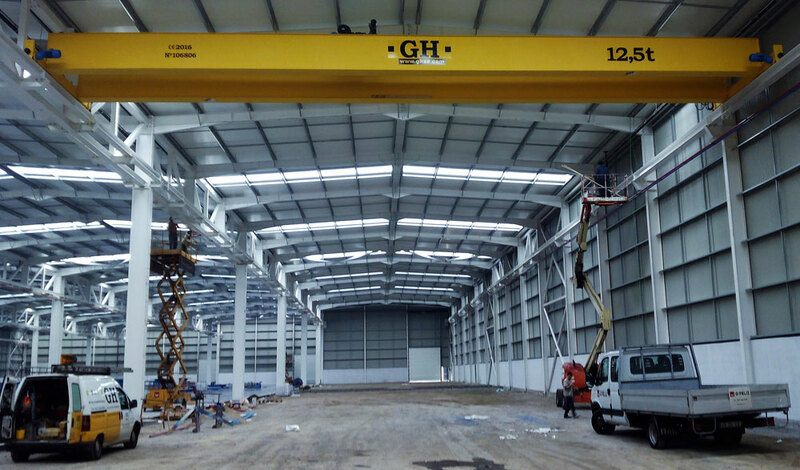 Capacity: 12,5t. 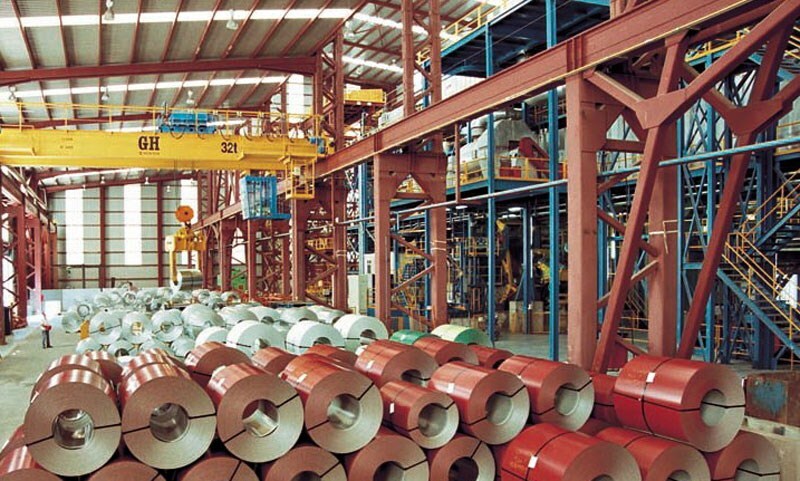 Customer: Arcelor Mittal. Place of installation: Cracovia, Polonia. Capacity: 8+8t. Customer: Walter Pack. Place of installation: India. 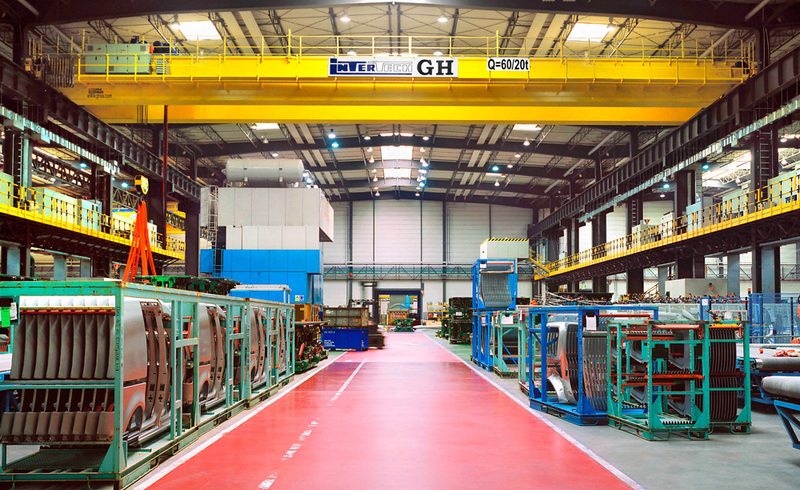 Capacity: 10t. Customer: Tusar. Place of installation: India. 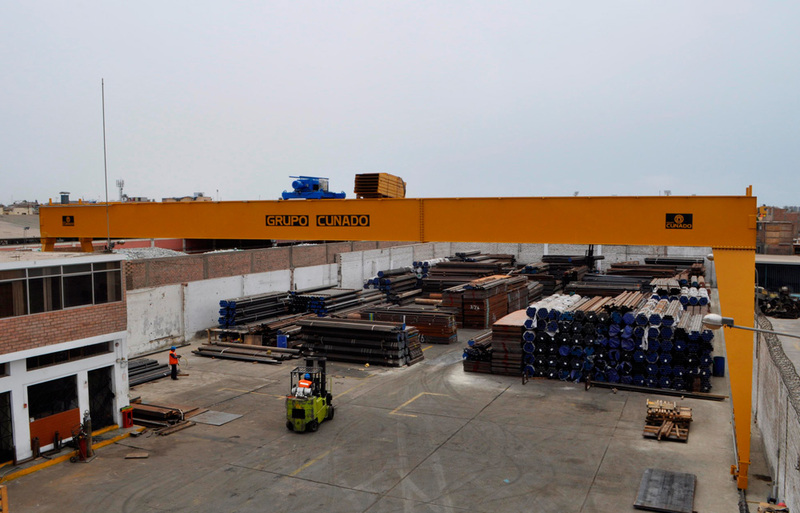 Capacity: 20t. Customer: Powergas. Place of installation: India. 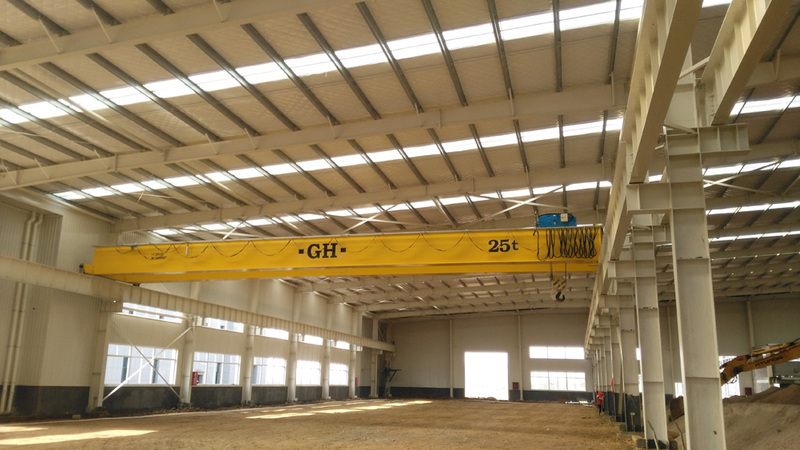 Capacity: 20t. 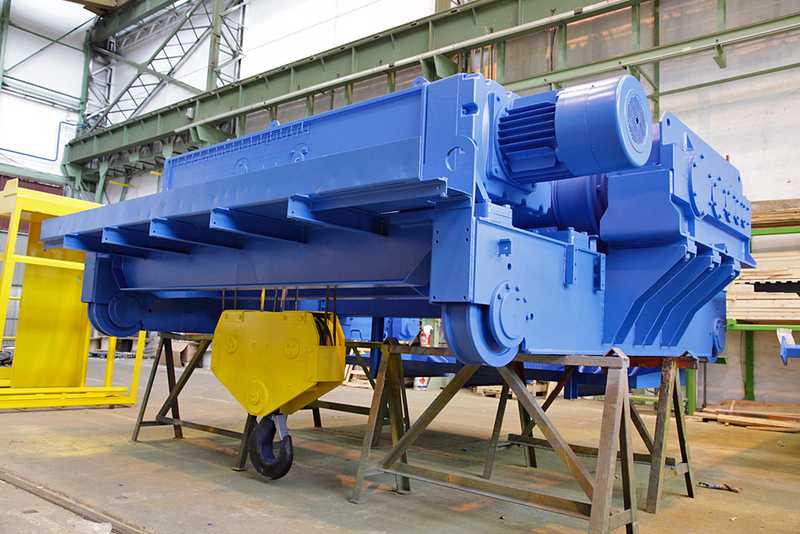 Customer: Voith. Place of installation: India. Capacity: 3,2t. 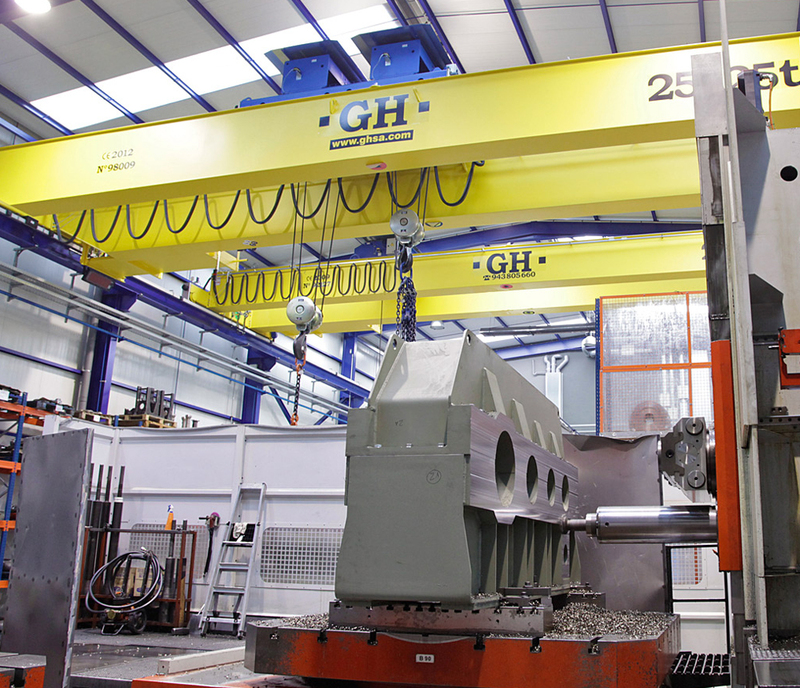 Customer: Ingersoll Rand. 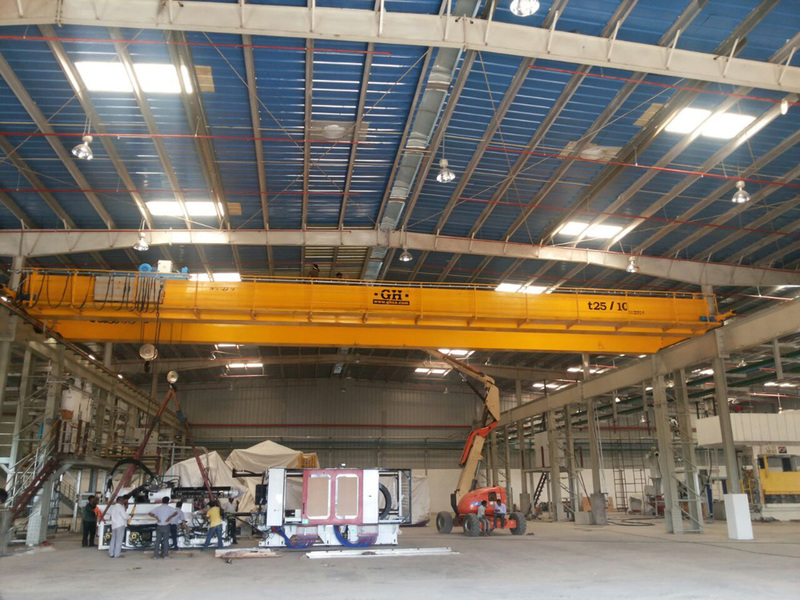 Place of installation: India. 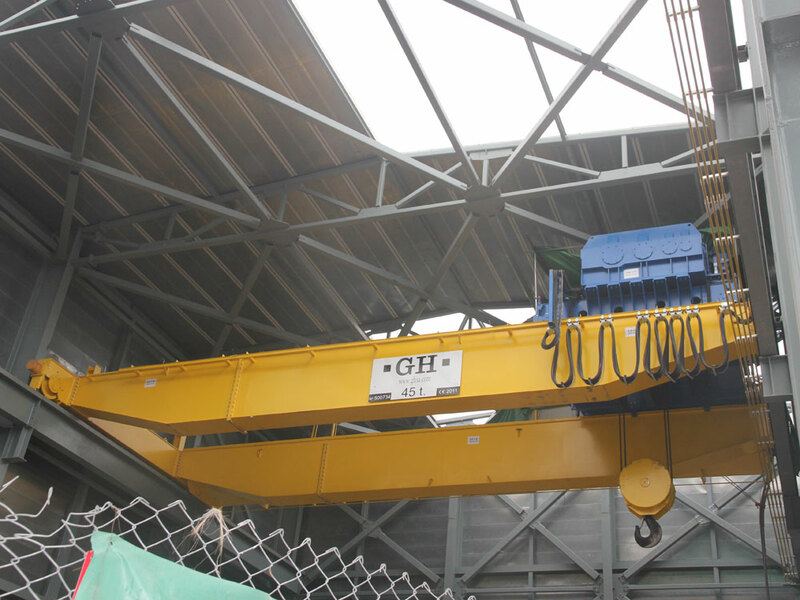 Capacity: 40t. Customer: Grupo Antolin. Place of installation: India. Capacity: 25/10t. Customer: Bonatrans. Place of installation: India. Capacity: 8t. Customer: NEA. Place of installation: India. 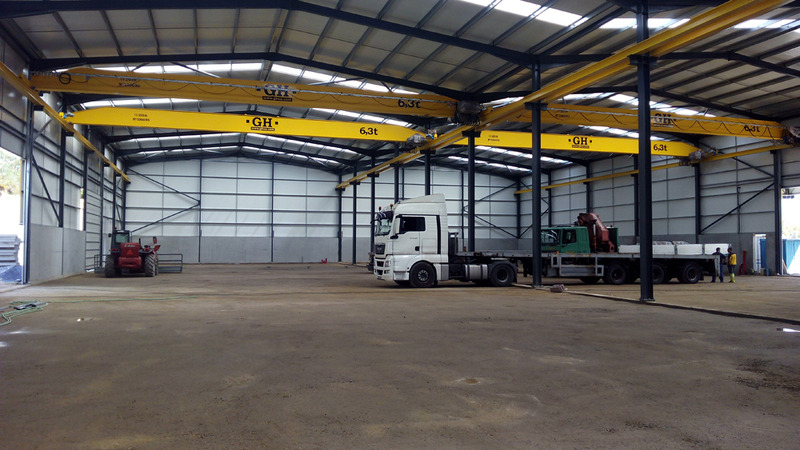 Capacity: 32t. 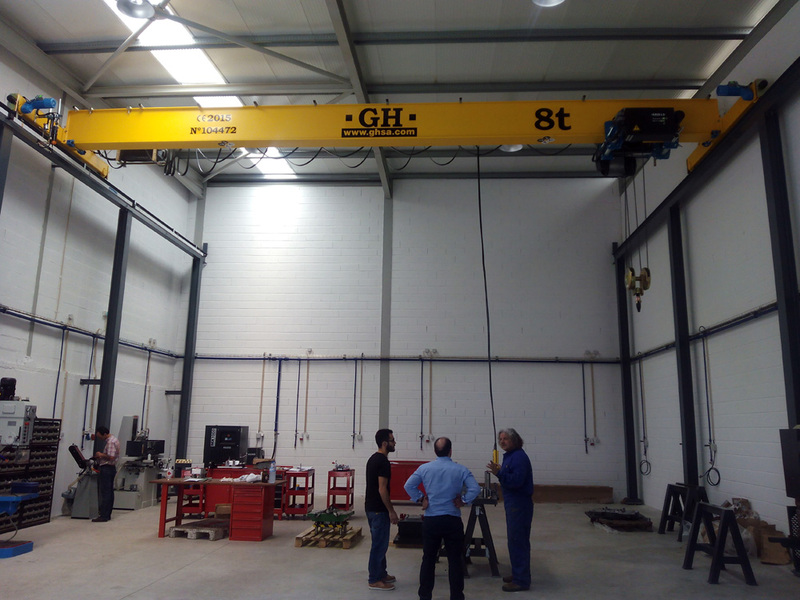 Customer: Beckmann Volmer Technology. Place of installation: China. 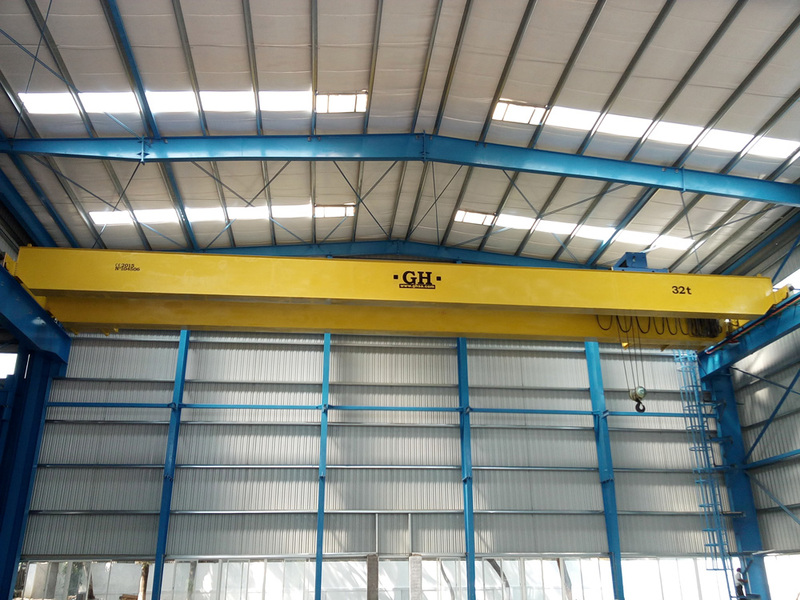 Capacity: 25t. Customer: Maquinaria Colas. 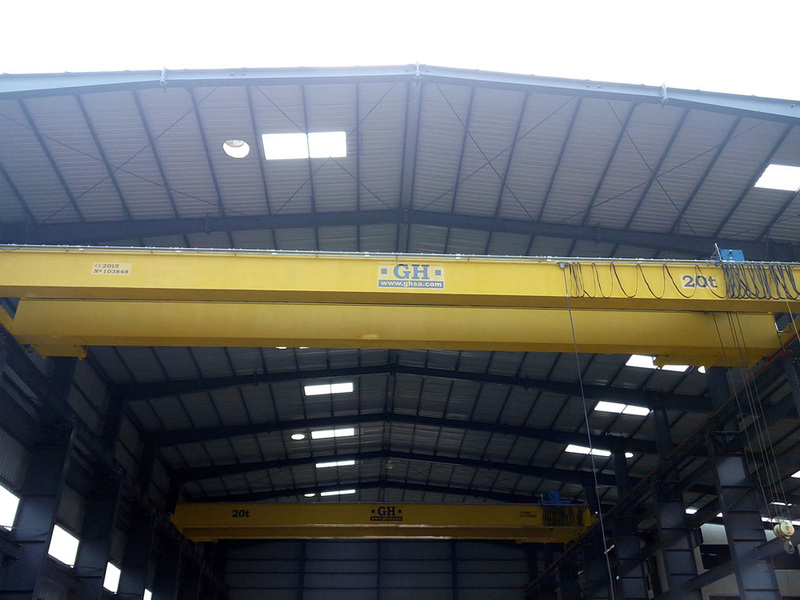 Capacity: 25t. Customer: Datek. 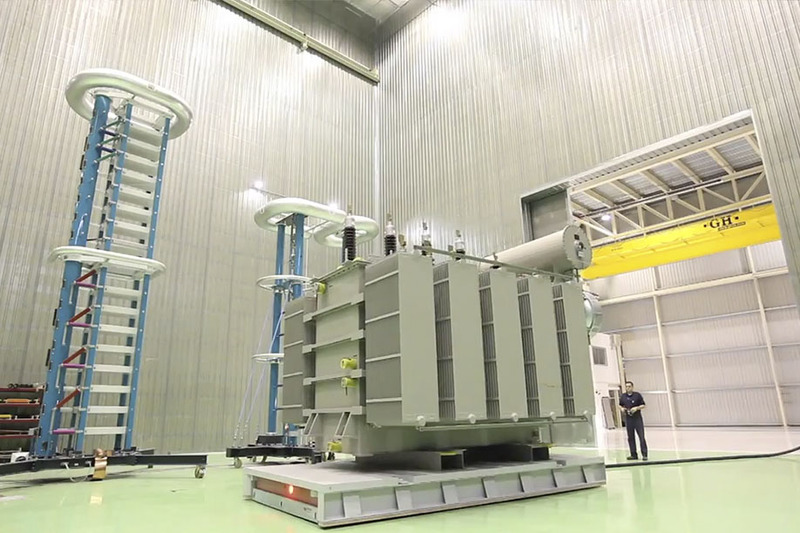 Place of installation: Central eléctrica de Rosten (Noruega). 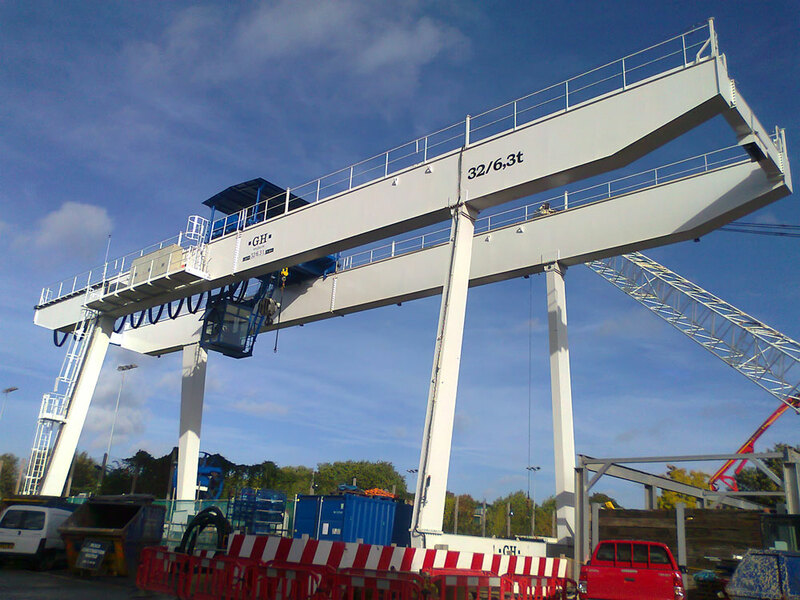 Capacity: 130/10/10t. Customer: Bodegas Pago de los Capellanes. 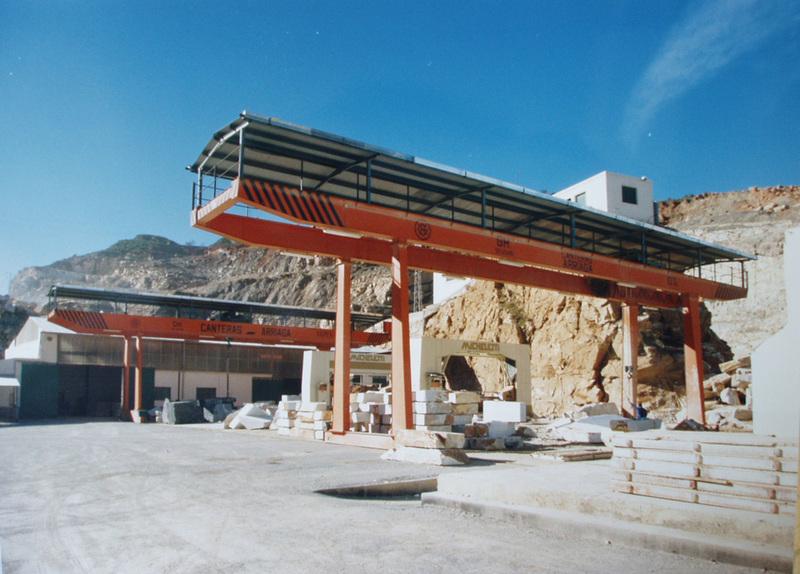 Place of installation: Bodegas Pago de los Capellanes. Capacity: 6,3t. Customer: Zamine. Place of installation: Lurín, Lima, Perú. 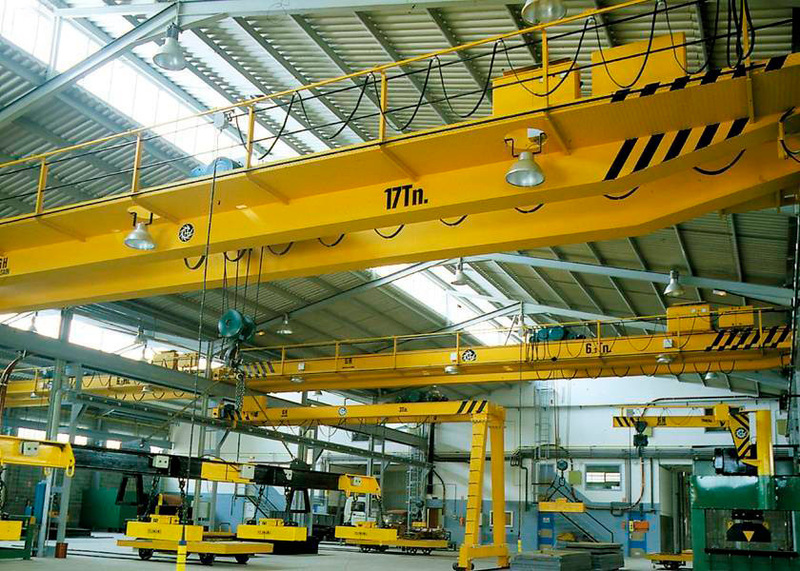 Capacity: 10t. Customer: Grupo Cuñado. Place of installation: Lima, Perú. Customer: Barloworld Finanzauto. Place of installation: Dos Hermanas, Sevilla. Capacity: 5t. Customer: Silos Cordoba. Capacity: 5t. 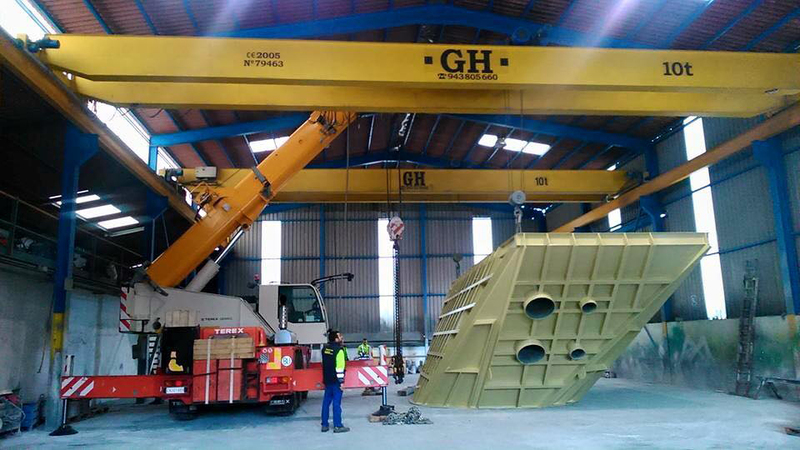 Customer: Acciona. Place of installation: Barásoain. 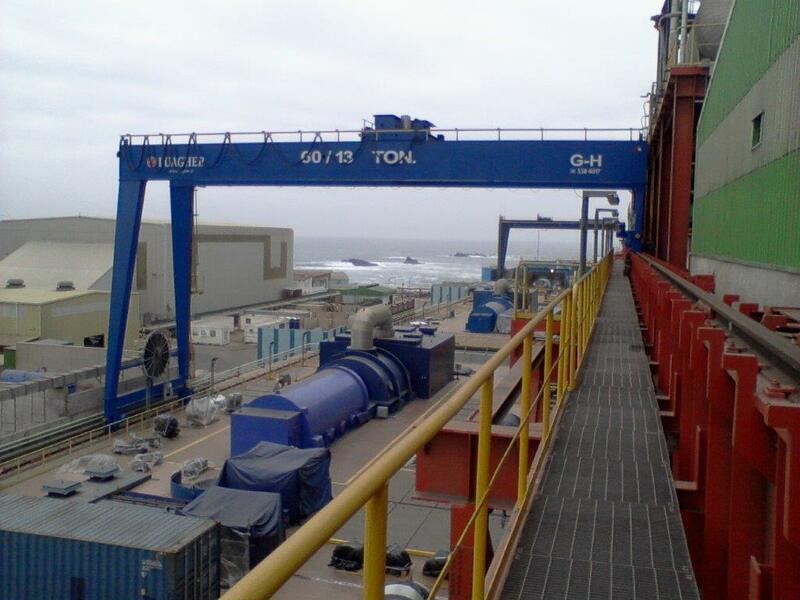 Capacity: 160t. 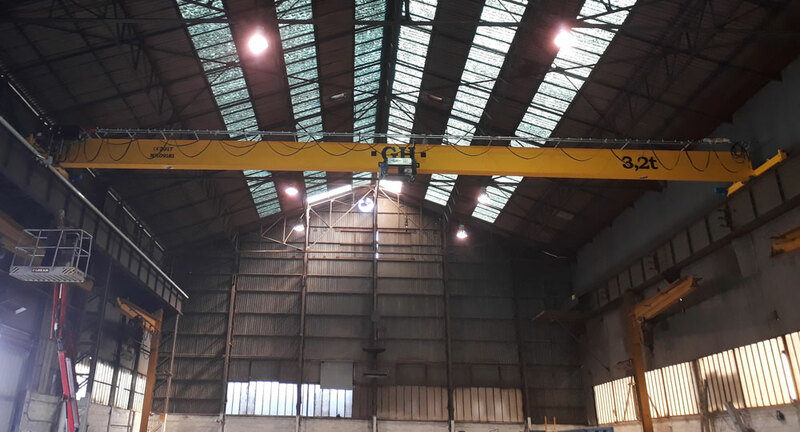 Installation of a 75 / 20t lifting capacity bridge crane, 7 jib cranes with 2 and 3t and a 2 x 80t gantry crane at the SIDERAR plant, in San Nicolás, province of Buenos Aires. 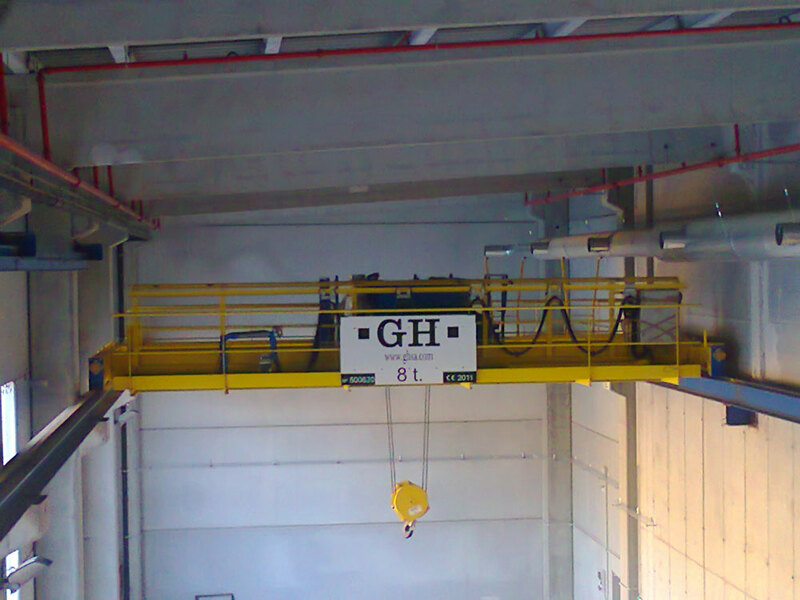 Bridge crane with 32t lifting capacity hoist installed in the Galvanized and Painted Plant belong to Alfonso Gallardo Group in Jerez de los Caballeros (Badajoz). 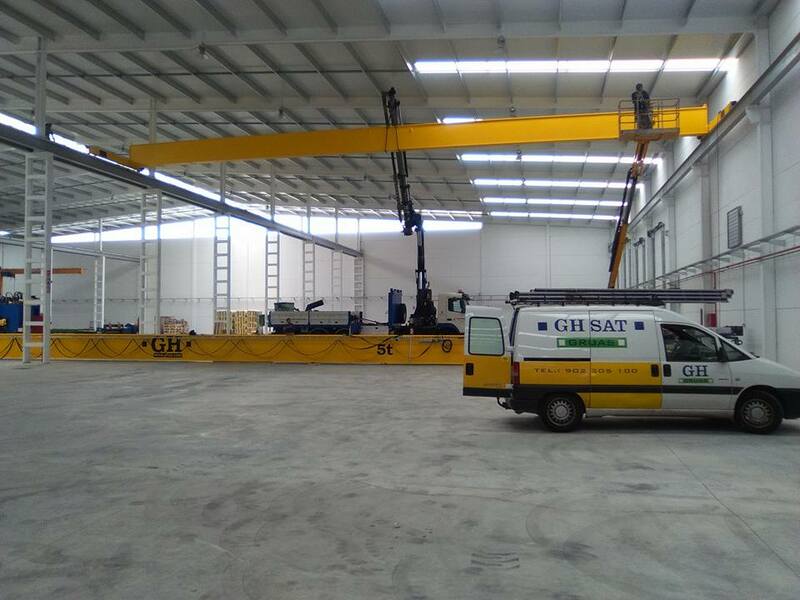 Two bridge cranes with hoist with a lifting capacity of 10t for customer Gaptek for an industrial building for the A-400M, the plane for which final assembly is carried out in Seville. 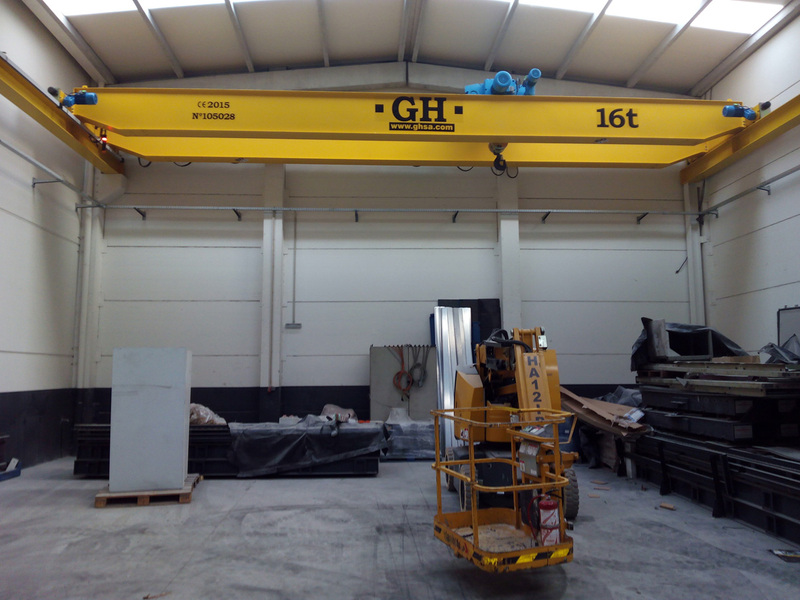 Jib crane with hoist of 5t lifting capacity installed in Viana do Castelo for Antonio Alves Ribeiro & Filhos Lda. 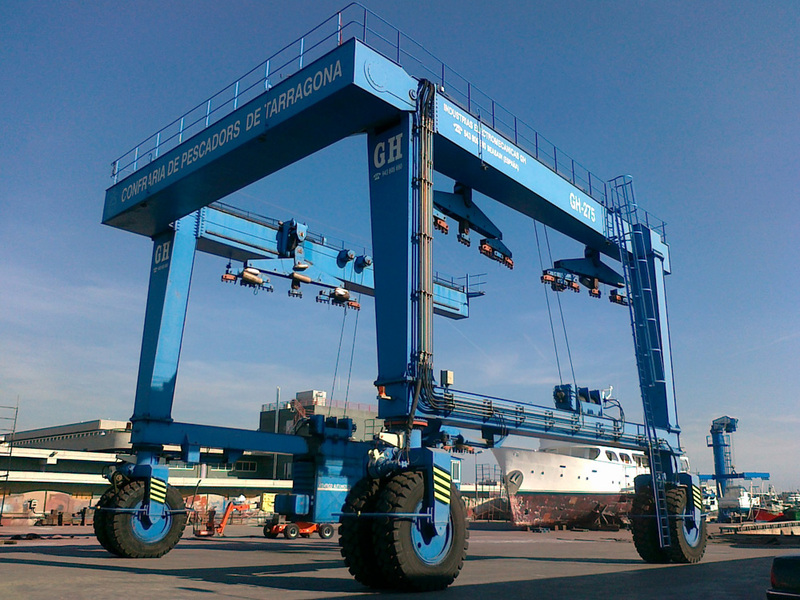 Model GH275 marine automotive gantry crane with a capacity of 250t installed in the port of Tarragona. 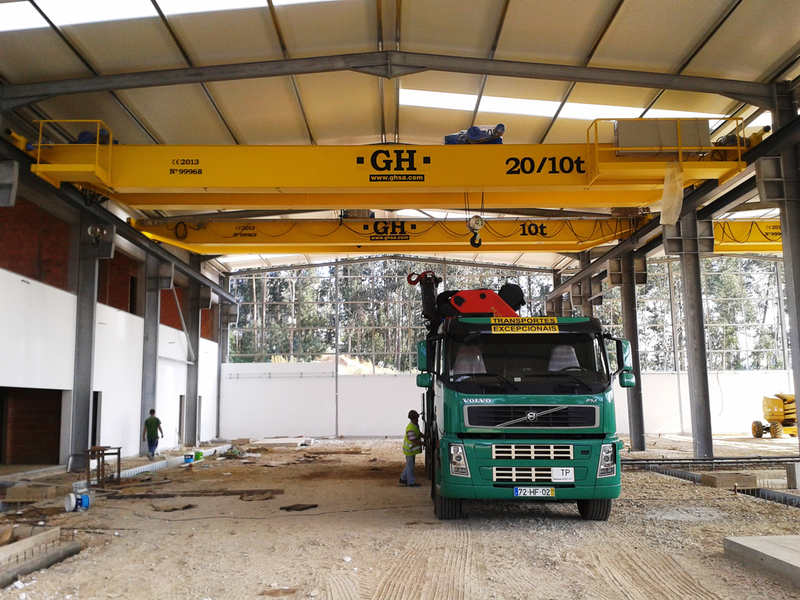 GH CRANES & COMPONENTS automotive gantry crane on tires of 2x50 tonnes installed in Santander. 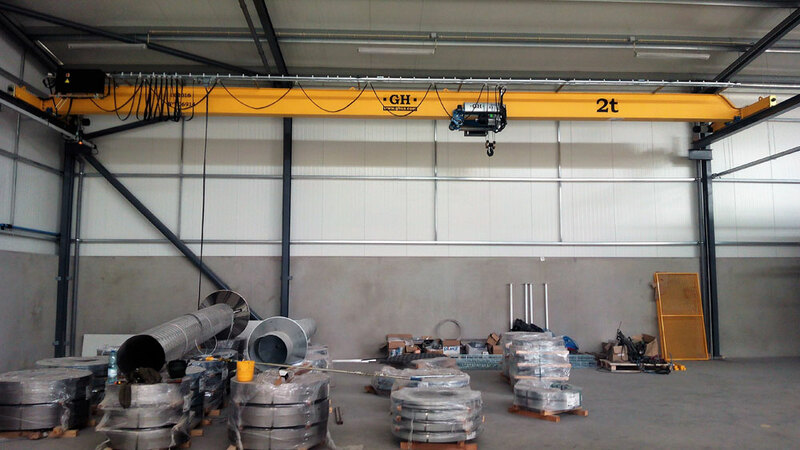 Wall jib crane installed in Alstom. 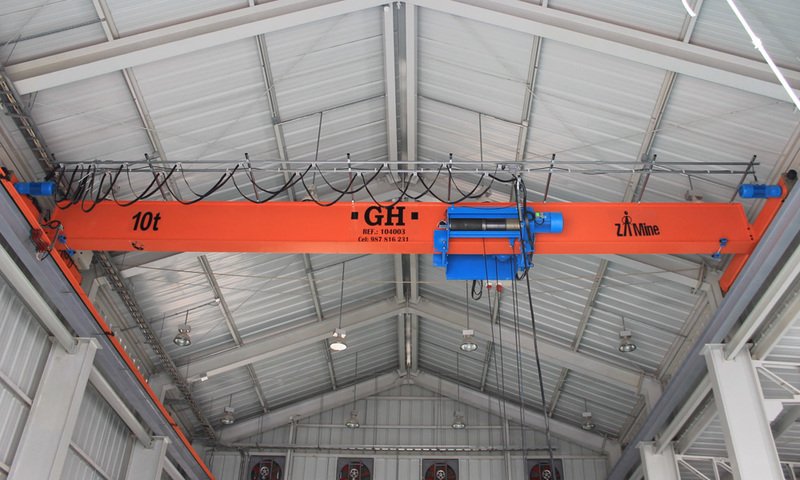 Industrial self-propelled gantry crane for Indubel. 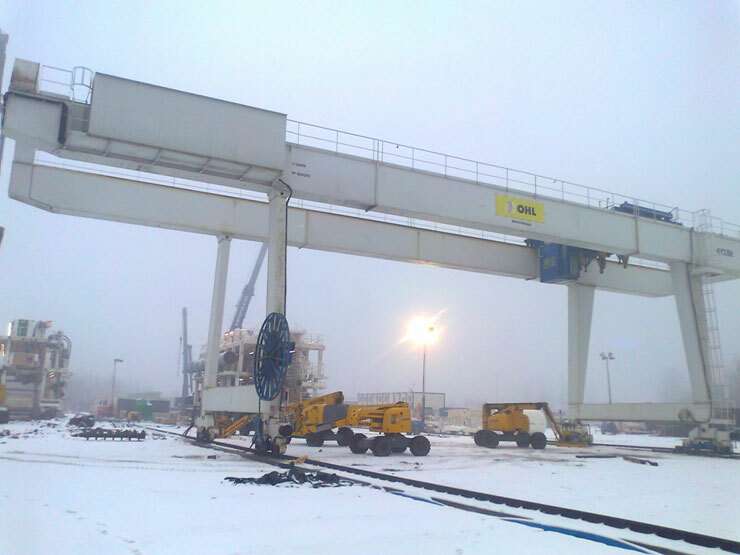 Installing multiple bridge cranes, booms and brackets Indar USA. 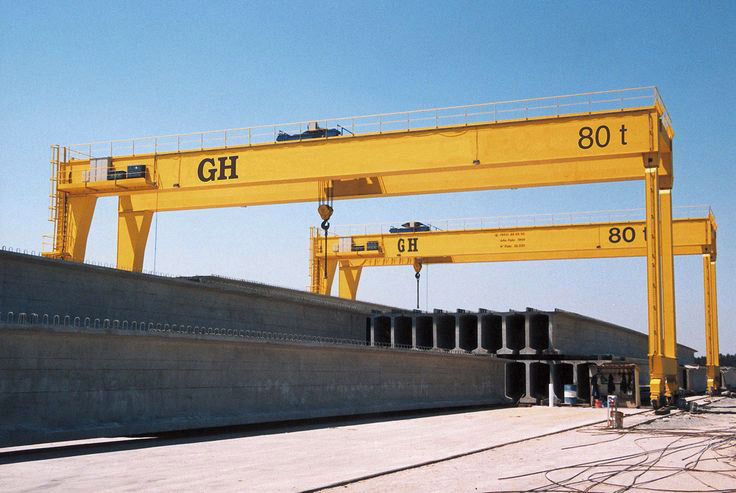 Single girder bridge crane of GH Cranes & Components with a lifting capacity of 6.3 tons. 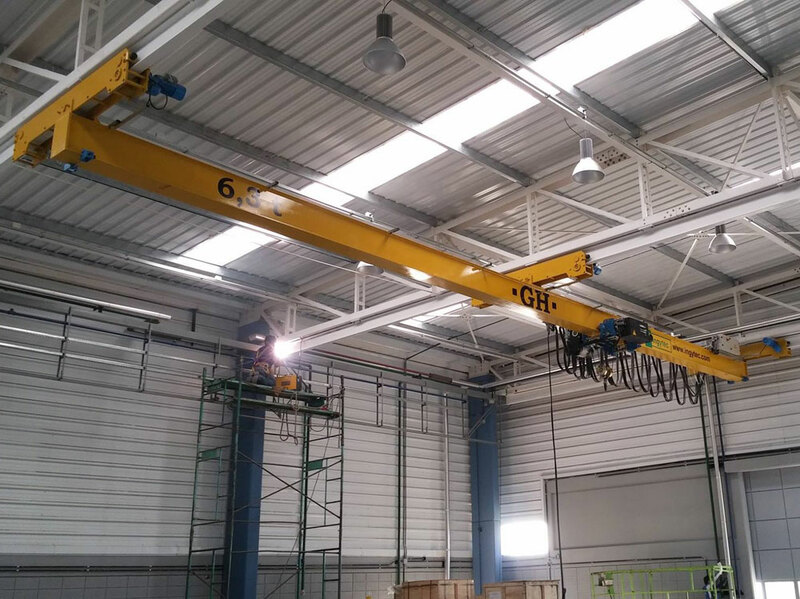 and 2x3,2 Ton, 19,2m of span and lifting height of 7m installed in Aveiro (Portugal) for customer Kinya Solutions, Lda. 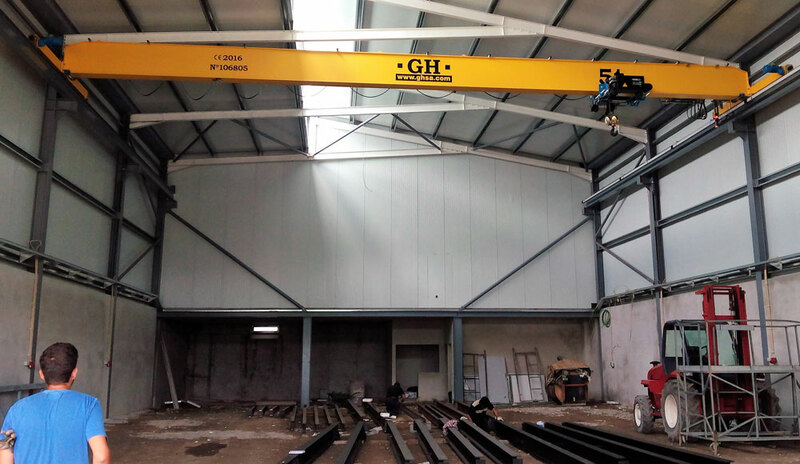 Single girder bridge crane of GH Cranes & Components with a lifting capacity of 6,3t, 17,5m span, and lifting height 5.5m installed in Aveiro (Portugal) for customer POLIVALE - Indústria Metalurgica Lda. 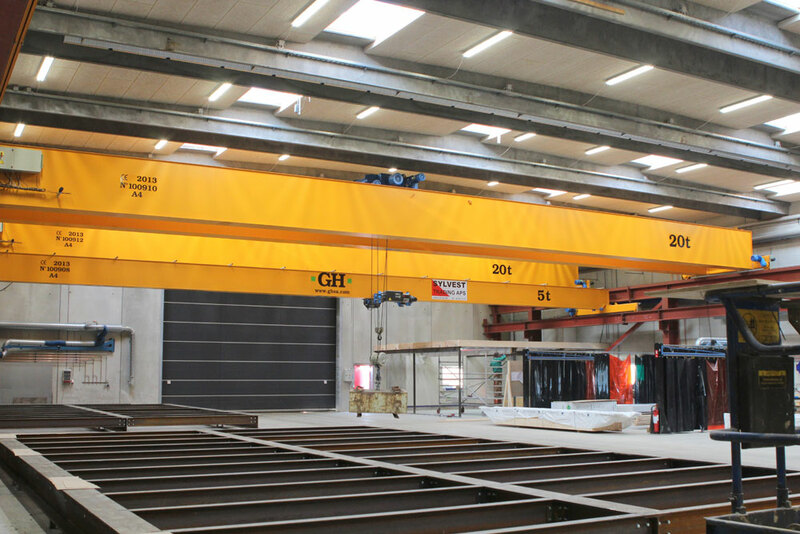 Single girder bridge crane of GH Cranes & Components with a lifting capacity of 6,3t, 19,1m of span and a lift height of 6.9m installed in Aveiro (Portugal) for customer Marsilinox - Indústria Metalurgica Lda. 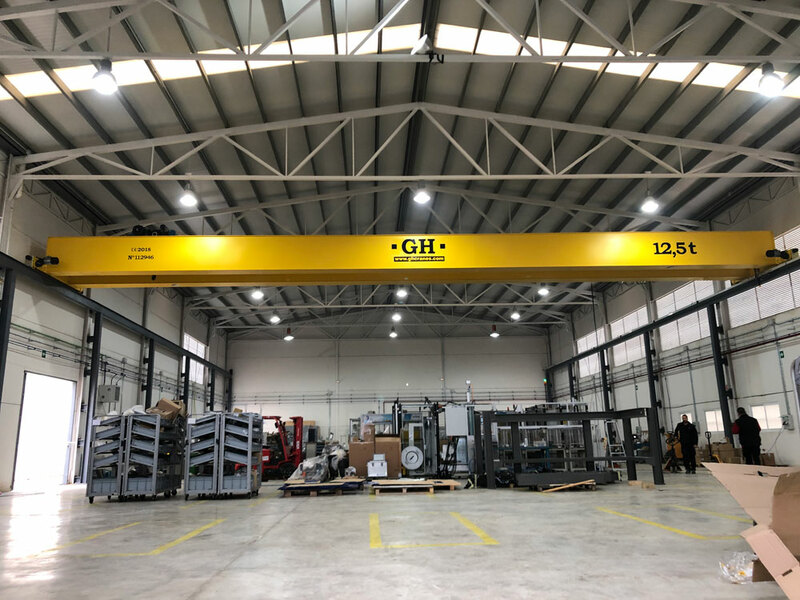 Double girder bridge of GH Cranes & Components with a lifting capacity of 10t, span of the crane 17,4m and lift height of 6.5m installed in Aveiro (Portugal) for the client Jorge Soares Martins & Filho, Lda. 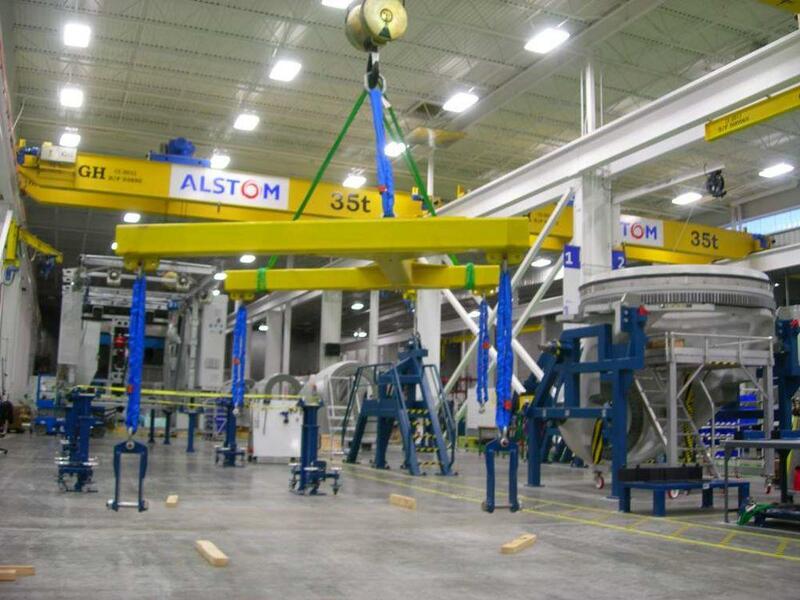 Bridge crane installed in Alstom. 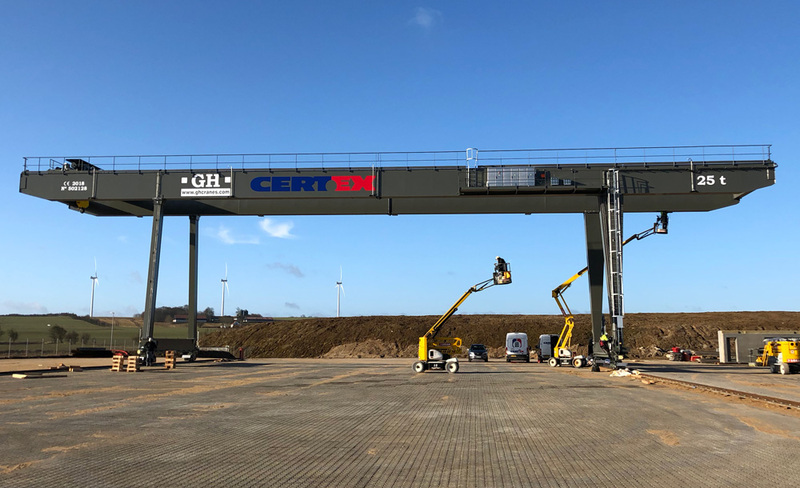 Several bridge crane installed with hoists of 20t and 35t lifting capacities for our client Alstom. 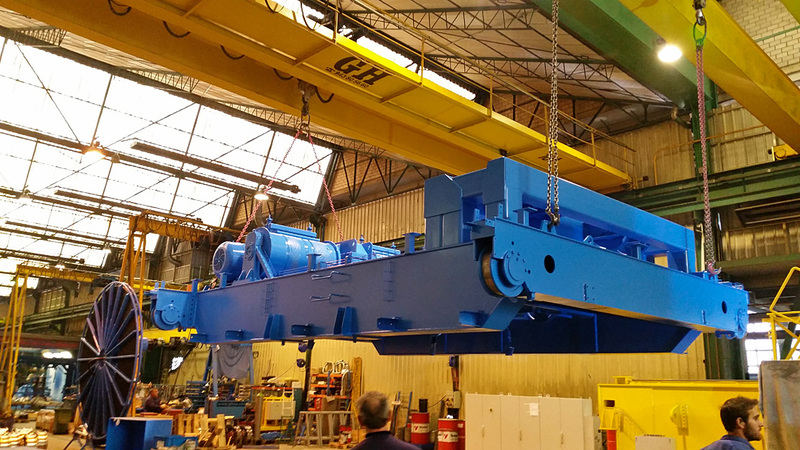 Bridge crane with hoist of 35t lifting capacity for client Alstom. 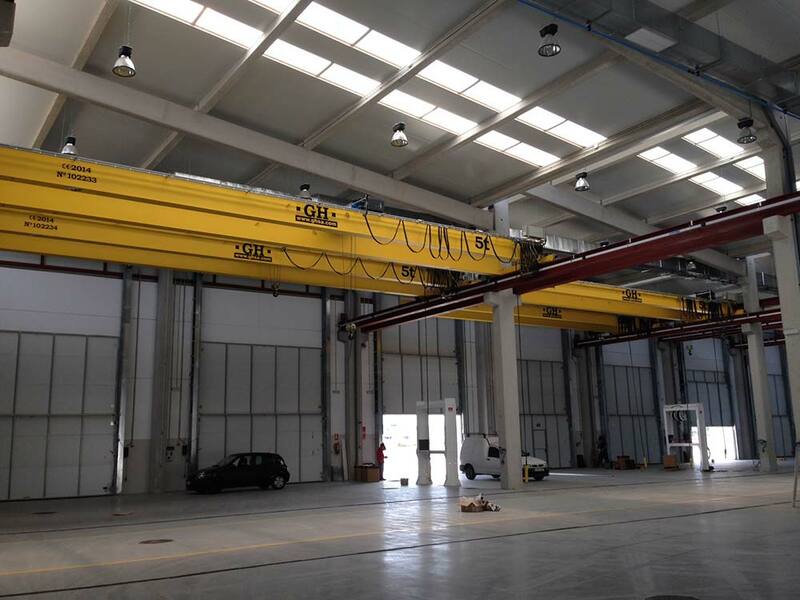 Danobat Railway Systems (DRS) opened new facilities in Bergara (Guipuzcoa) last 28thof September. 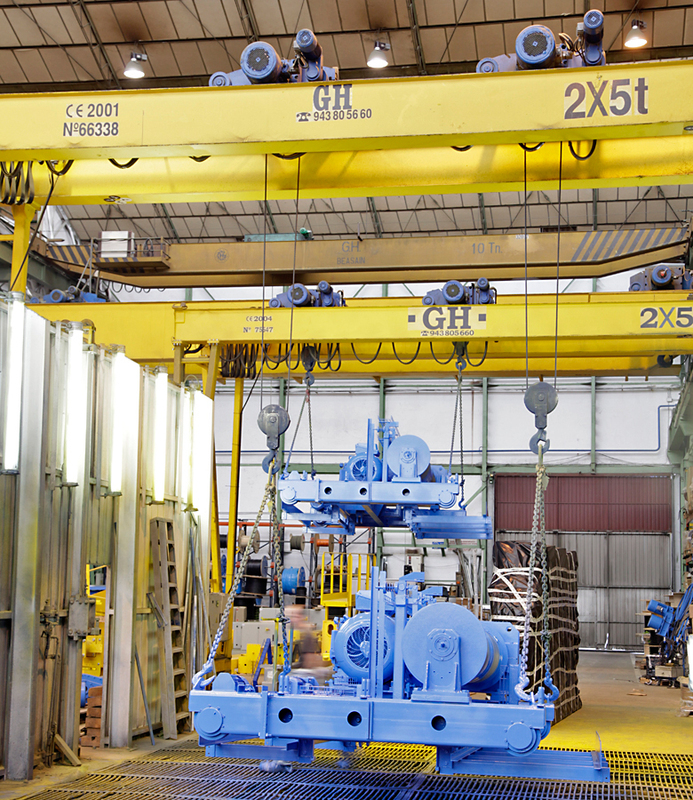 With an area of 10.000 square metres and a 12 million euros investment, it represents a determined bet of Danobat Railway Systems to become one of the world’s top turnkey machinery and production line supplier for the railway sector and high added value engineering services.On the other hand, DRS presented the production line for mounted railway axles, built in a record time for the Russian company T.V.S.Z, one of the most important freight wagonmanufacturers of its country. 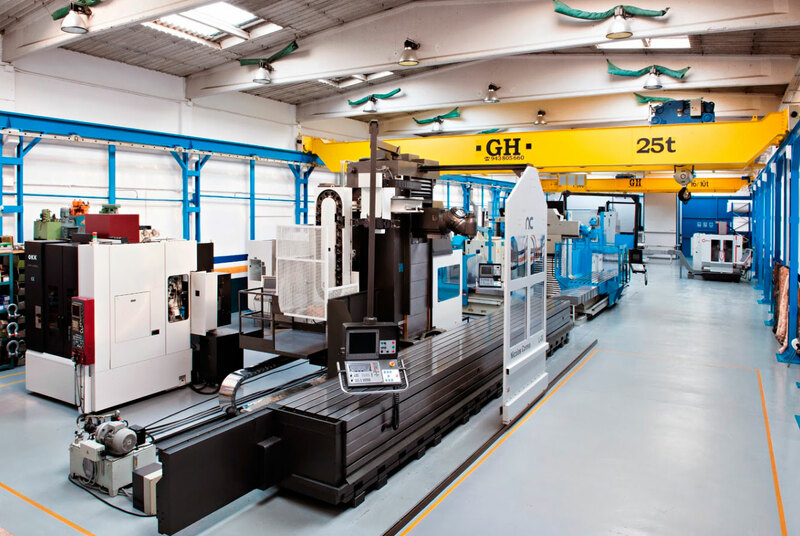 Its value, at the beginning 50 million euros, has increased after the incorporation of a range of supplements to 63 million, symbolizing the largest order ever of the Spanish machine tool. 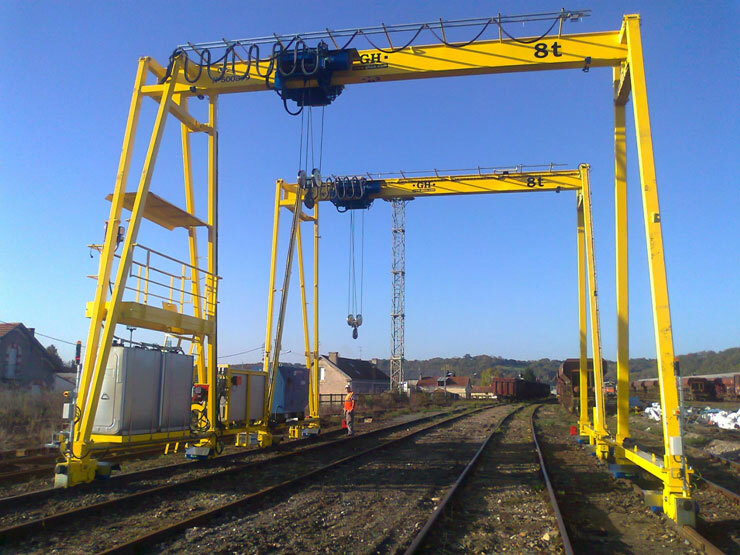 DANOBATGROUP goes far beyond machinery provision in the railways industry. 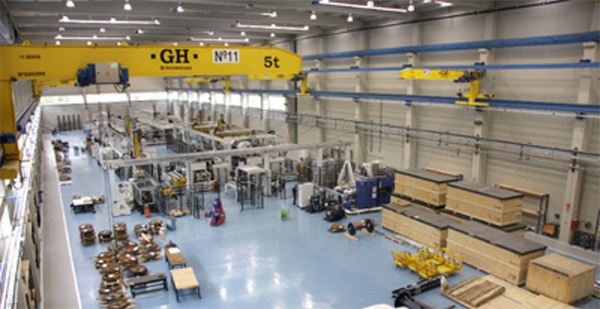 It also works as a railway technology partner providing engineering solutions to its clients from project planning to final execution as well as the notable railway equipment lifespan.Railways business unit has a highly qualified human team with proven experience; making it possible to produce leading customized railway equipment. 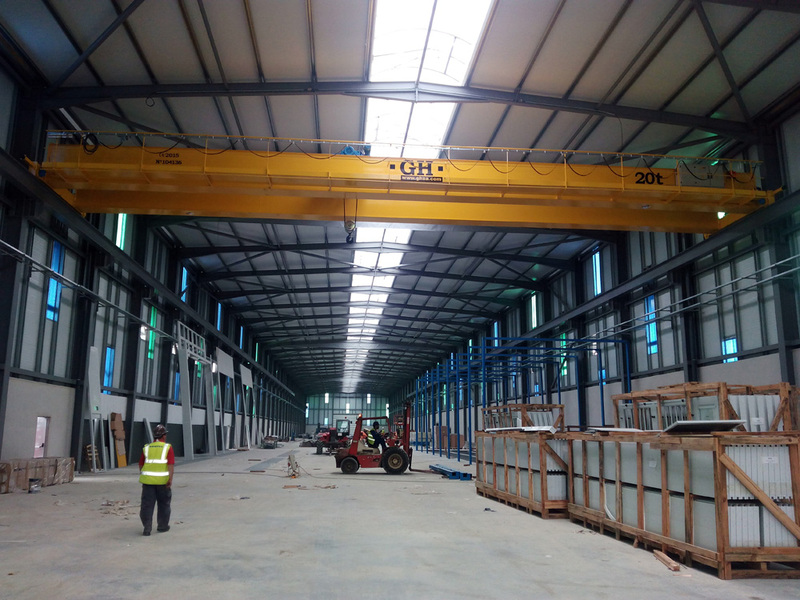 Alkargo is a reference in development of products in the scope of the electrical energy transformation.Among its facilities has several different capacities GH CRANES & COMPONENTS bridge cranes. 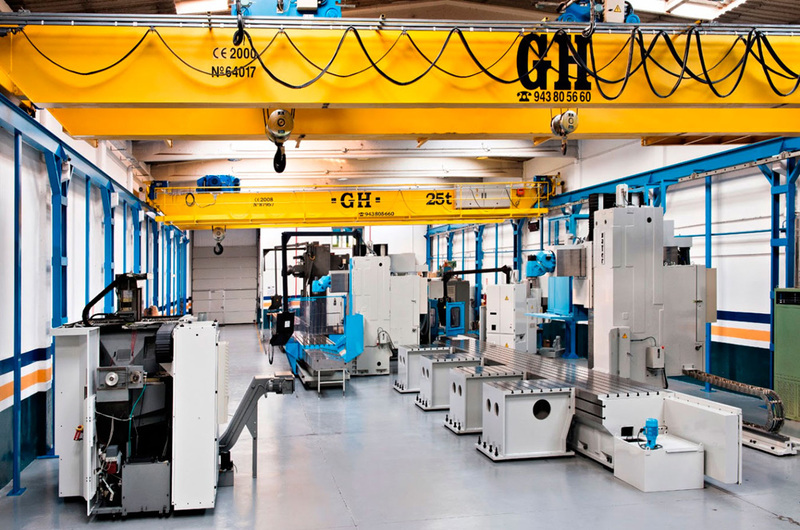 Maquinaria Colas is a company that buys and sells industrial machinery (CNC milling machines, CNC lathes, machining centres, boring machines, grinding machines), as much new as second-handed.It has several EOT cranes of different capacities distributed among more than 5,000 square metres. 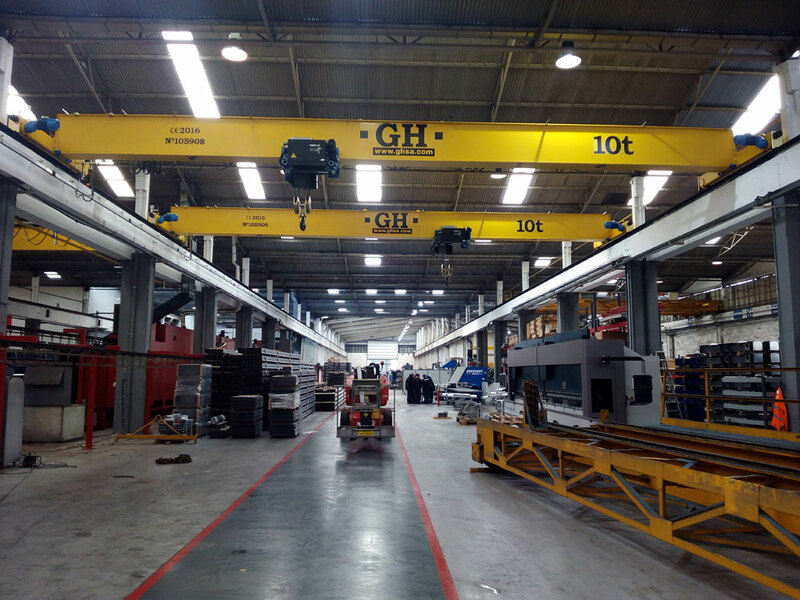 Double girder bridge crane with a hoist of 16t lifing capacity, 13.1 m of span and 6.2 m of lifting height for client SERMEC II - Industria, Comercio e Servicos, S.A. in Maia - Portugal. 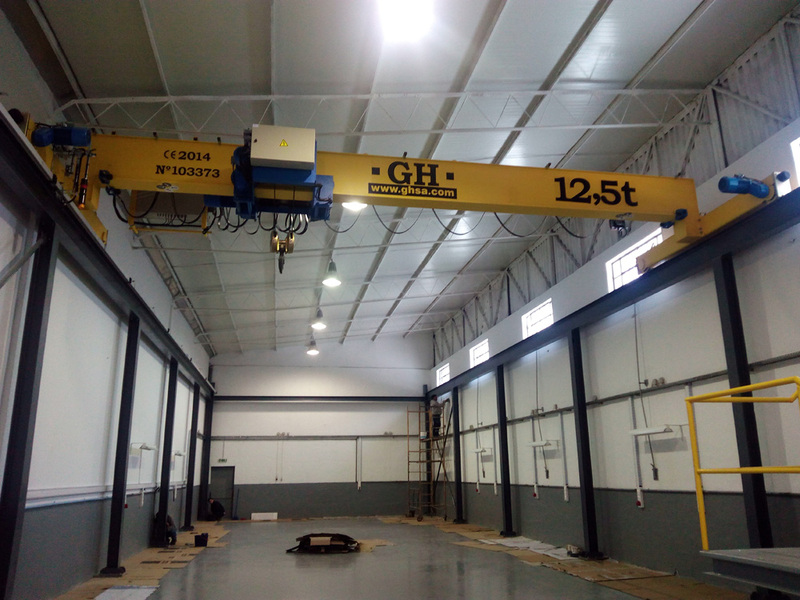 Bridge crane with 8t lift capacity hoist, 8.96 meters span and a lifting height of 4.87 meters for the client CS Molds - Moulds for Industry in Leiria (Portugal). 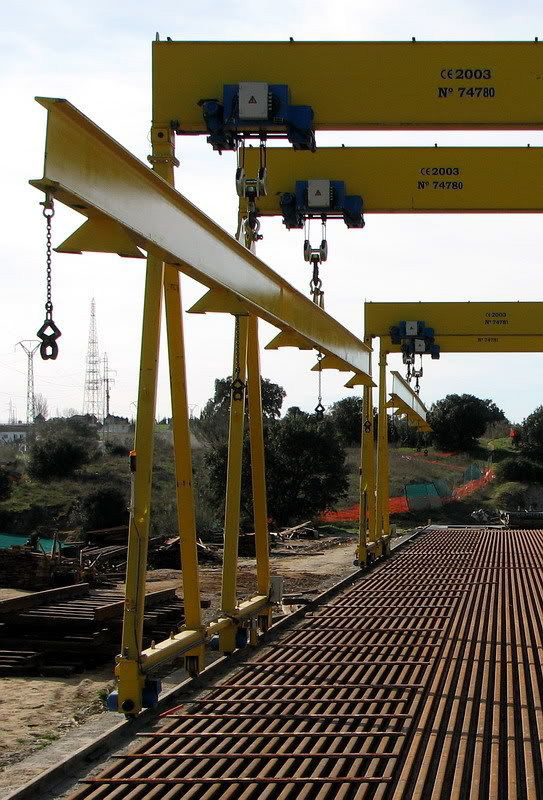 Varias grúas puente instaladas con polipastos de 20t y 50t de capacidad de elevación, con una altura de elevación de 10 metros y luz de grúa 23,6 metros en Sever do Vouga (Portugal) para A. SILVA MATOS - Metalomecânica, S.A.
Grúa puente birrail con un polipasto de 2t de capacidad de elevación, luz de grúa de 18 metros y una altura de elevación de 3,9 metros para cliente AFN, Lda en São João da Madeira - Portugal. 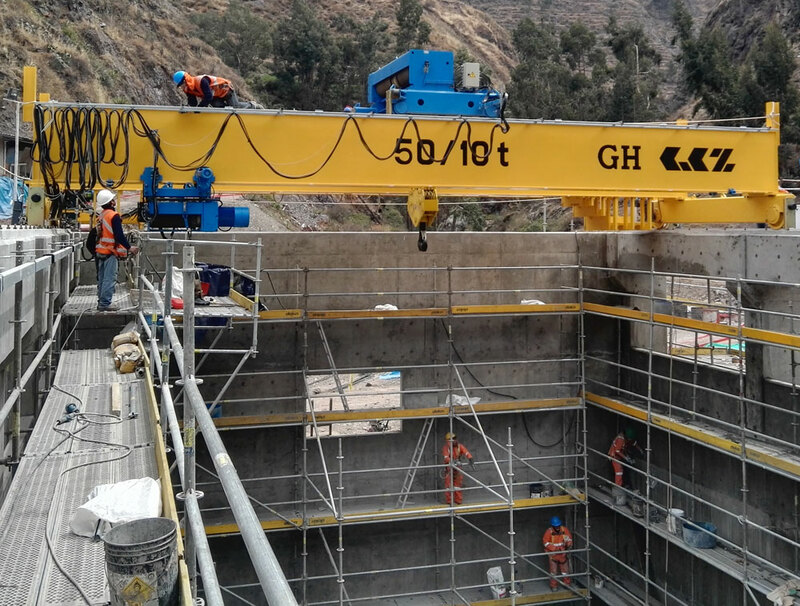 Grúa puente birrail con un polipasto de 8t de capacidad de elevación, luz de grúa de 11,3 metros y una altura de elevación de 5,5 metros para el cliente NVA Technology, Lda. en Maia, Portugal. 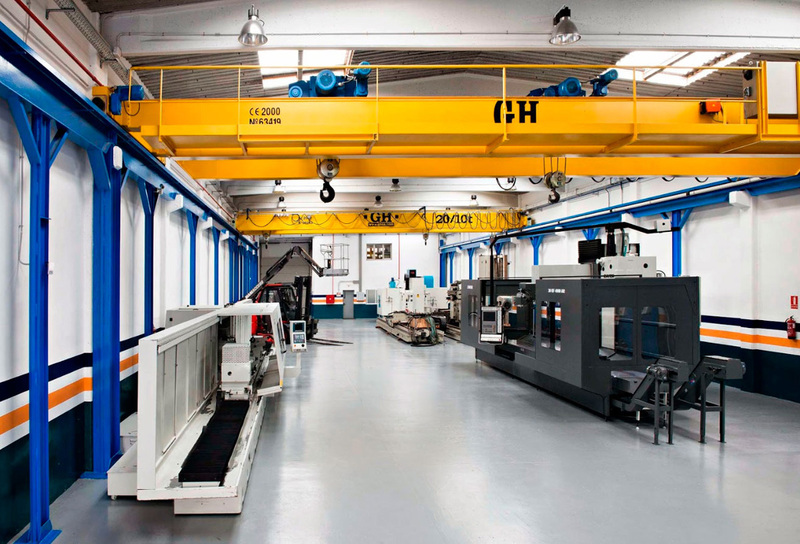 Grúa puente birrail con un polipasto de 20t y otro de 10t de capacidad de elevación, luz de grúa de 14,38 metros y una altura de elevación de 5,47 metros para cliente MTC - Mold Tuning Company, Lda en Oliveira de Azeméis - Portugal. 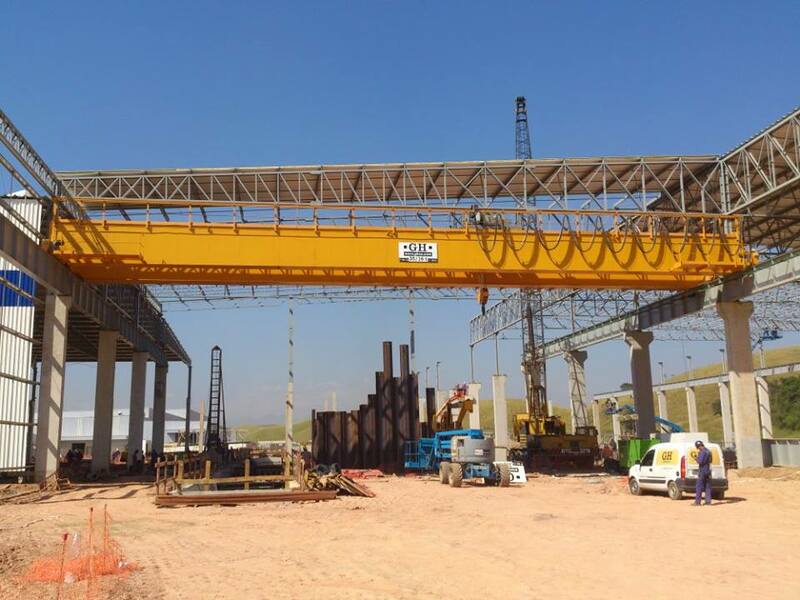 Grúa puente monoviga con un polipasto de 5t de capacidad de elevación, luz de grúa de 19 metros y una altura de elevación de 5,5 metros para cliente Estruturas Metálicas Florpóvoa, Lda en Póvoa de Varzim - Portugal. 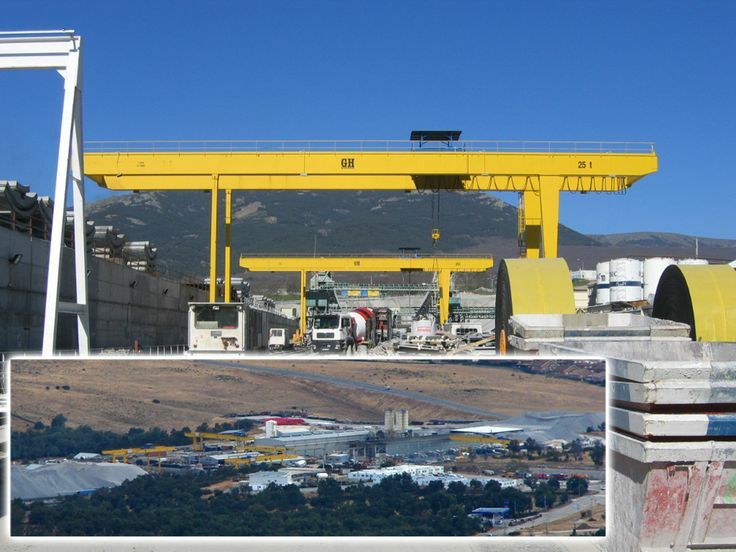 Grúa puente monoviga con un polipasto de 5t de capacidad de elevación, luz de grúa de 18,2 metros y una altura de elevación de 4,6 metros para cliente MANUEL GUERRA - Indústria de Cunhos e Cortantes, Lda en Vila Nova de Gaia - Portugal. 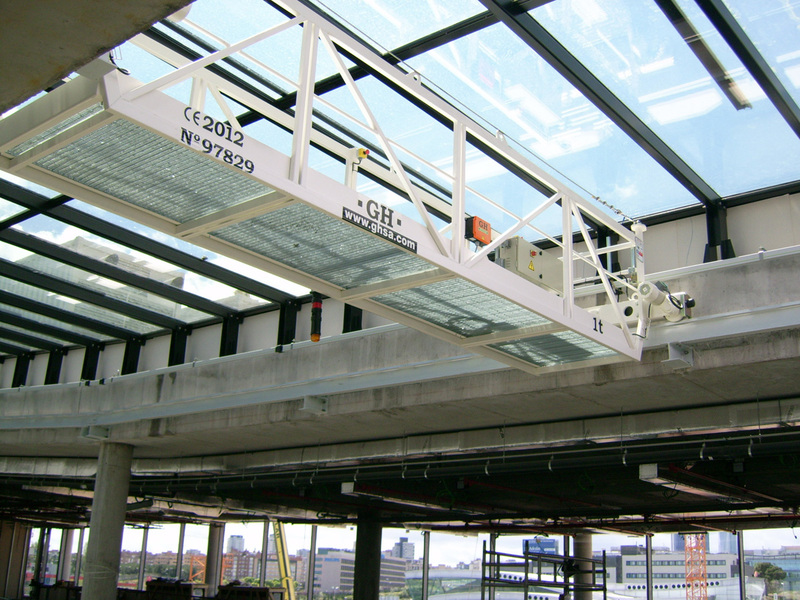 Grúa puente monoviga con un polipasto de 12,5t de capacidad de elevación, luz de grúa de 17,4 metros y una altura de elevación de 7 metros para cliente CODEPLAS - Engenharia de Peças Plásticas, Lda en Oliveira de Azeméis - Portugal. 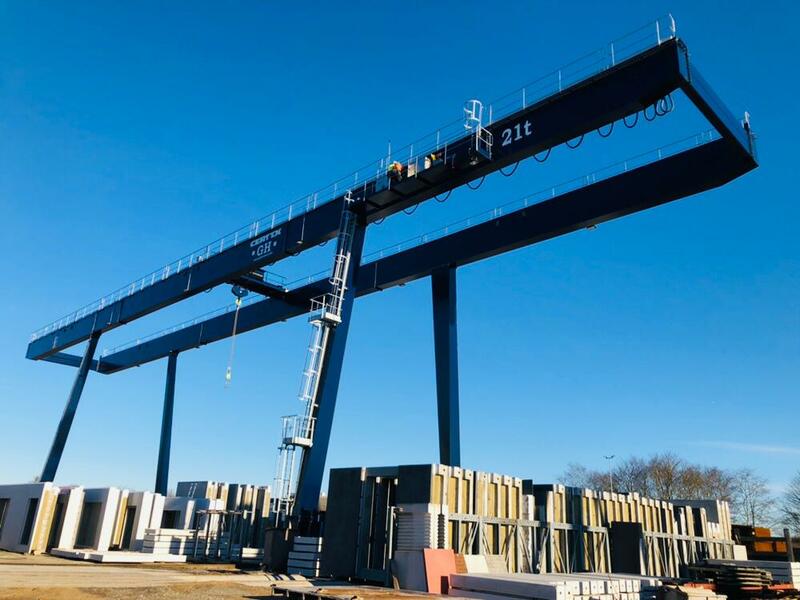 Grúa puente birrail con un polipasto de 32t de capacidad de elevación, luz de grúa de 15,6 metros y una altura de elevación de 6,5 metros para cliente PLANFURO II - Moldes em Aço, Desbaste Rectificação, S.A en Marinha Grande - Portugal. 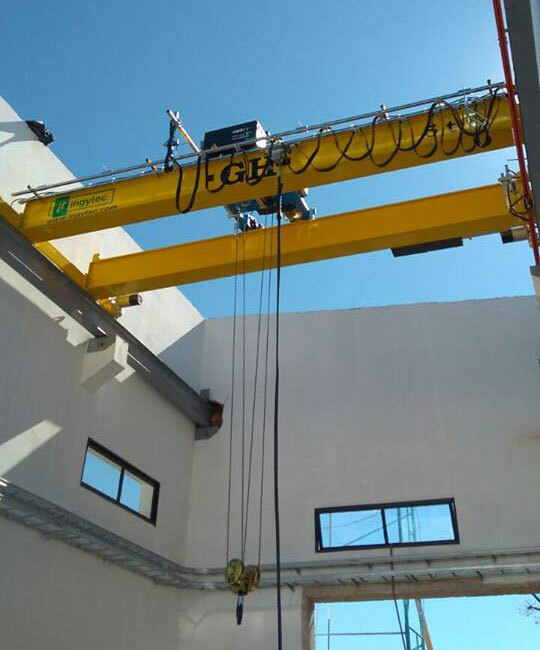 Grúa puente birrail con un polipasto de 20t de capacidad de elevación, luz de grúa de 23,6 metros y una altura de elevación de 10 metros para cliente A. SILVA MATOS - Metalomecânica, S.A en Sever do Vouga - Portugal. 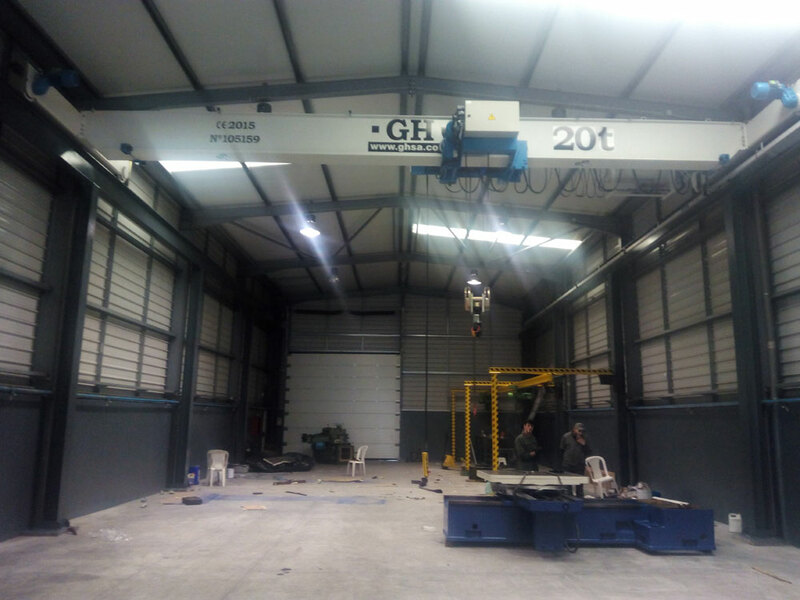 Grúa puente monoviga con un polipasto de 12,5t de capacidad de elevación, luz de grúa de 9 metros y una altura de elevación de 4,01 metros para cliente Polytools II - Polimentos de Moldes, Lda. en Oliveira de Azeméis - Portugal. 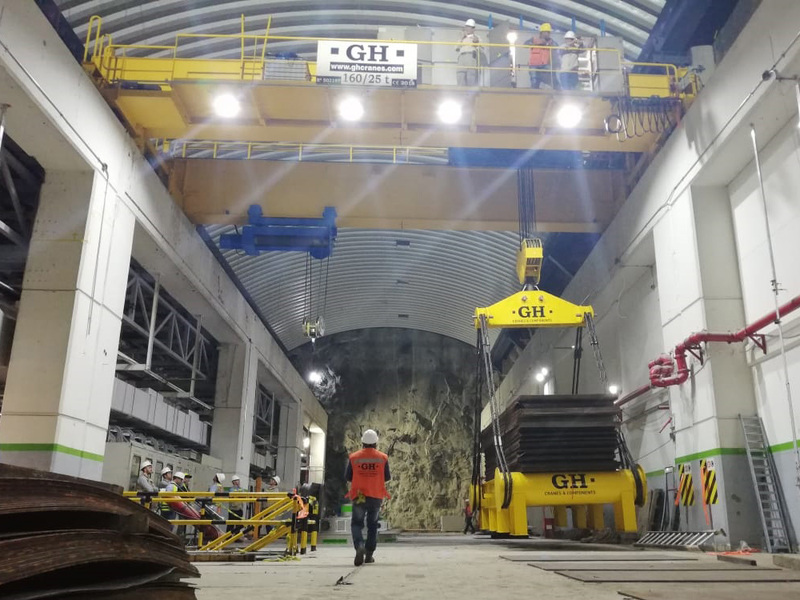 Grúa puente con un polipasto de 10t de capacidad de elevación, luz de grúa de 14,6 metros y una altura de elevación de 4,73 metros para cliente Matrimoldes - Moldes e Ferramentas, Lda. en Aveiro - Portugal. 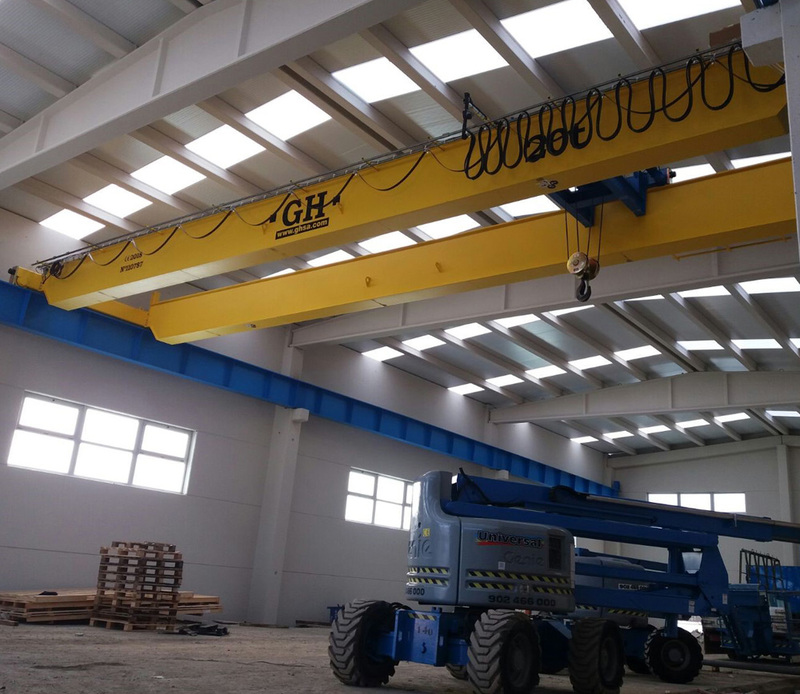 Grúa puente con un polipasto de 20t de capacidad de elevación, luz de grúa de 16,4 metros y una altura de elevación de 6,5 metros para cliente Stockmachines, Lda. en Braga - Portugal. 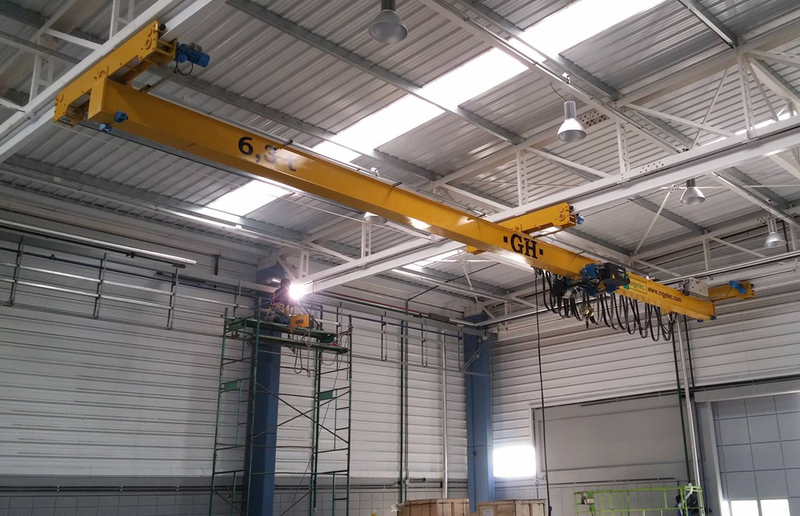 Grúa puente con polipasto de 5t de capacidad de elevación para cliente VIDROMAX-Vidros e Espelhos, S.A. en Mealhada - Portugal. 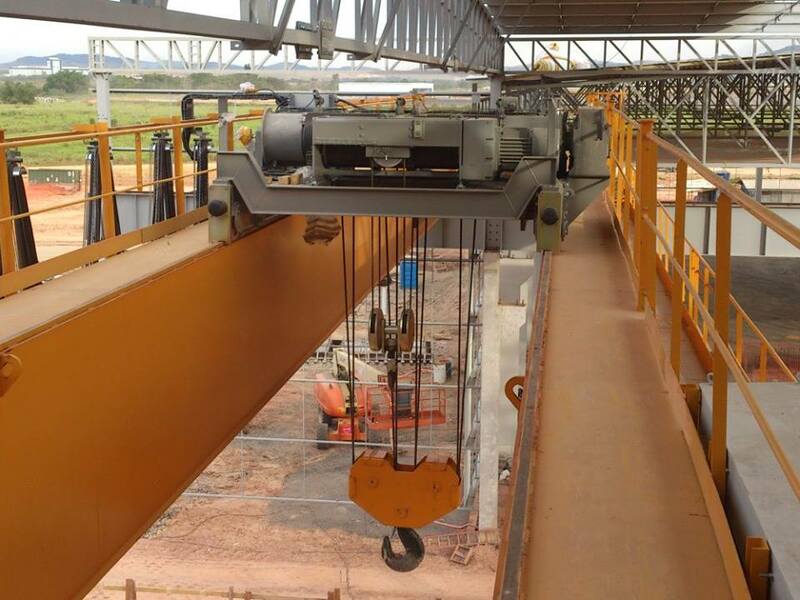 Varias grúas puente instaladas, dos con dos polipastos de 5t de capacidad de elevación, y otra grúa puente con 10t de capacidad de elevación para cliente ESTUFASMINHO, S.A. en Esposende - Portugal. 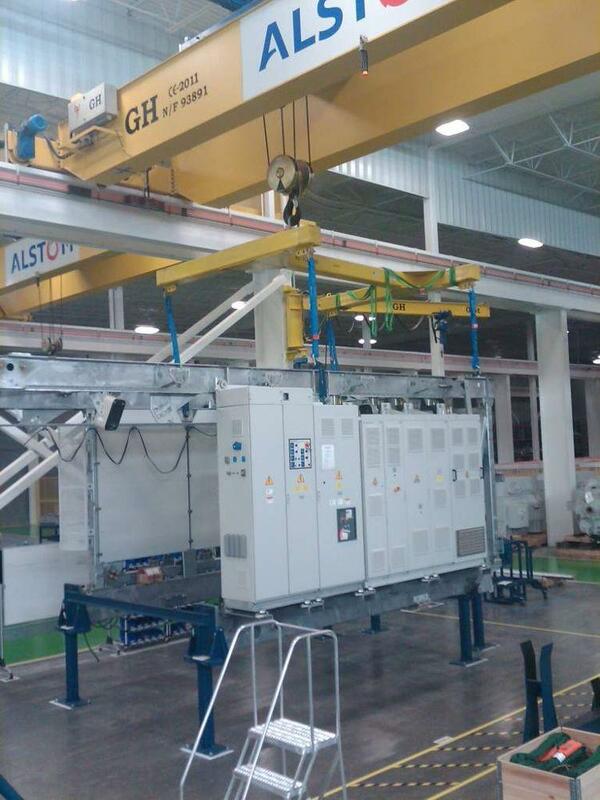 Grúa puente con dos polipastos, el principal con una capacidad de elevación de 25t y el auxiliar 6,3t, para cliente ARCAST, S.A. en Braga - Portugal. 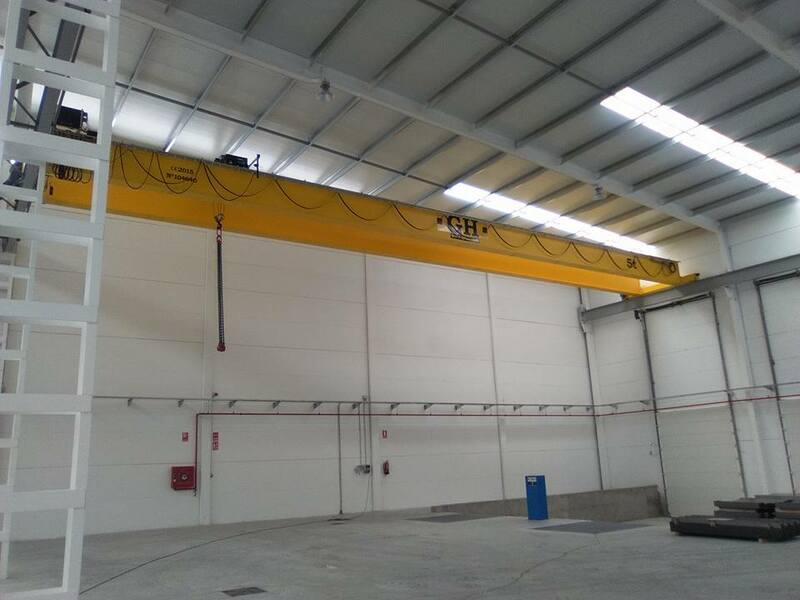 Grúa puente con polipasto de 10t de capacidad de elevación para cliente BRAMP - Metais e Polímeros de Braga, Lda. en Graga - Portugal. 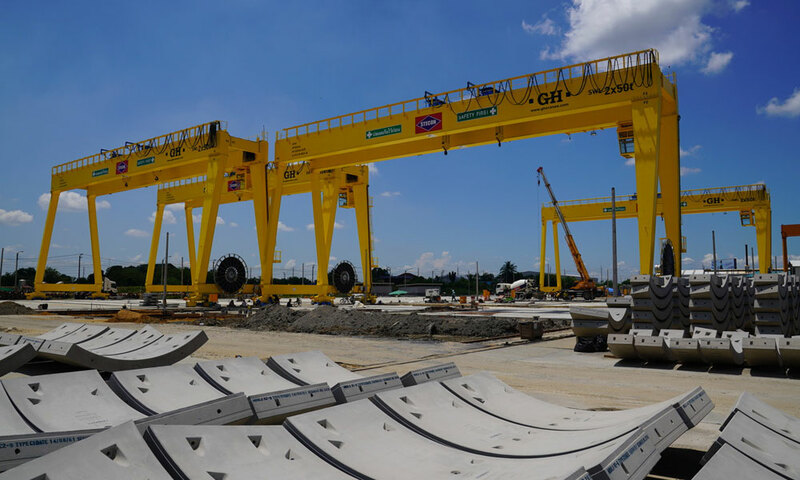 Grúa puente con polipasto de 50t de capacidad de elevación para cliente Siemens en Brasil. 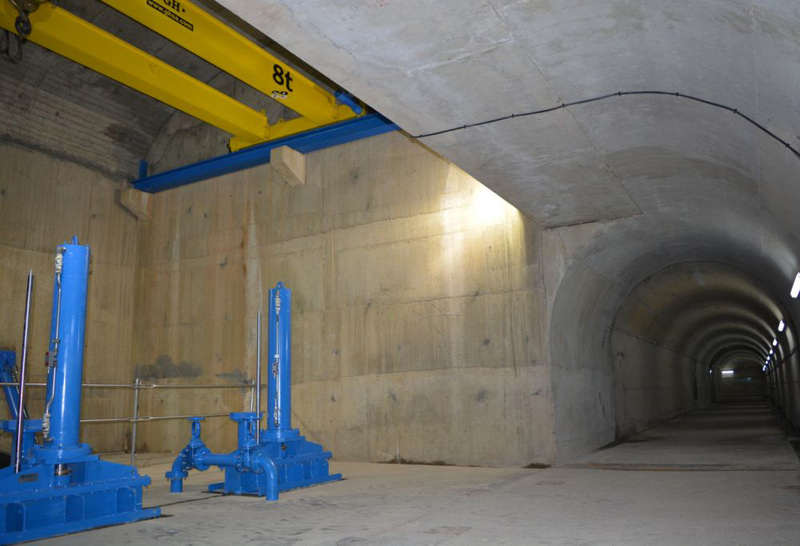 Grúa puente con polipasto de 8t de capacidad de elevación en Lloret de Mar. 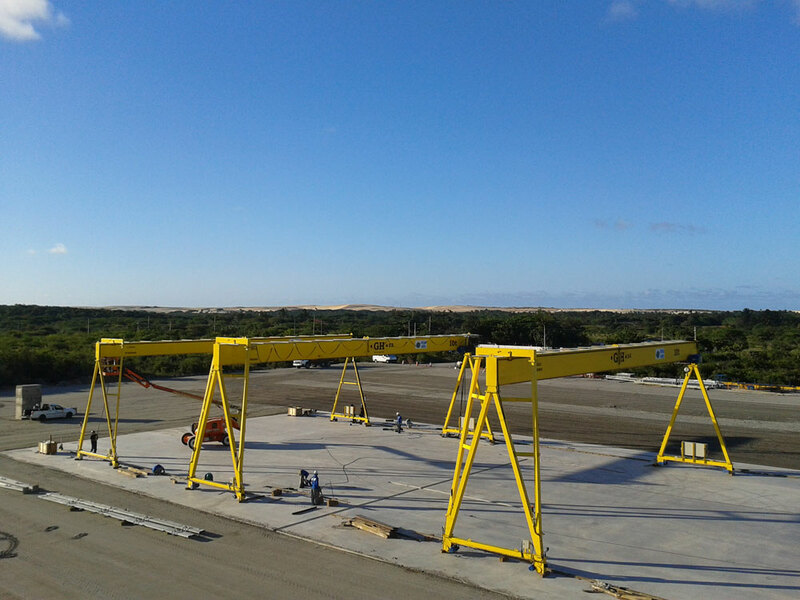 EOT crane for Acciona México with two hoists (160t and 10t). 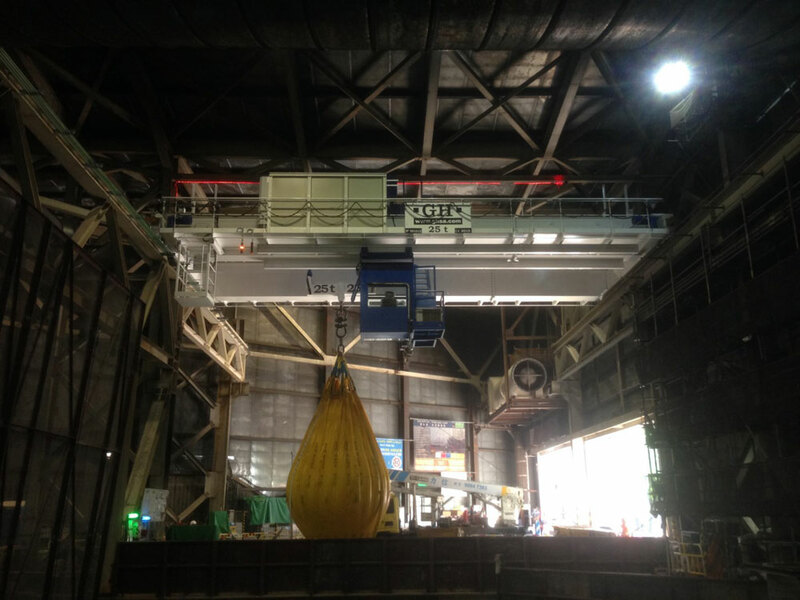 Grúa puente con dos polipastos, el principal con una capacidad de elevación de 100t y el auxiliar 20t, para cliente Alkargi en Mungia. 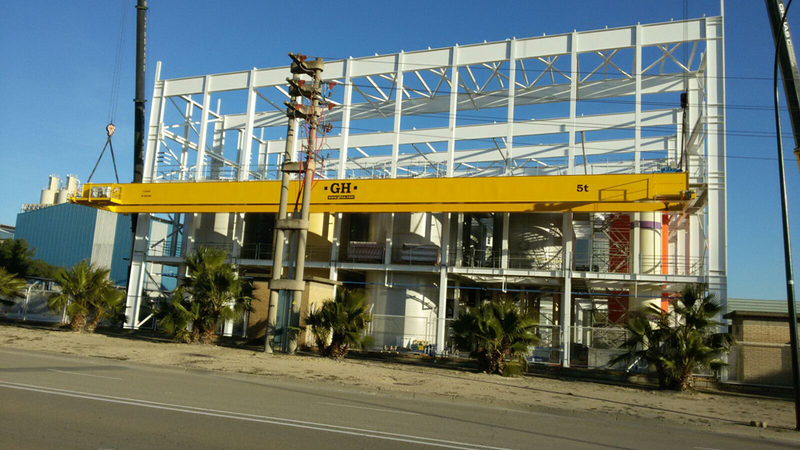 Grúa puente con dos polipastos principales con capacidad de 70t y uno de ellos con uno auxiliar con capacidad de 20t para cliente Elecnor en Badajoz. 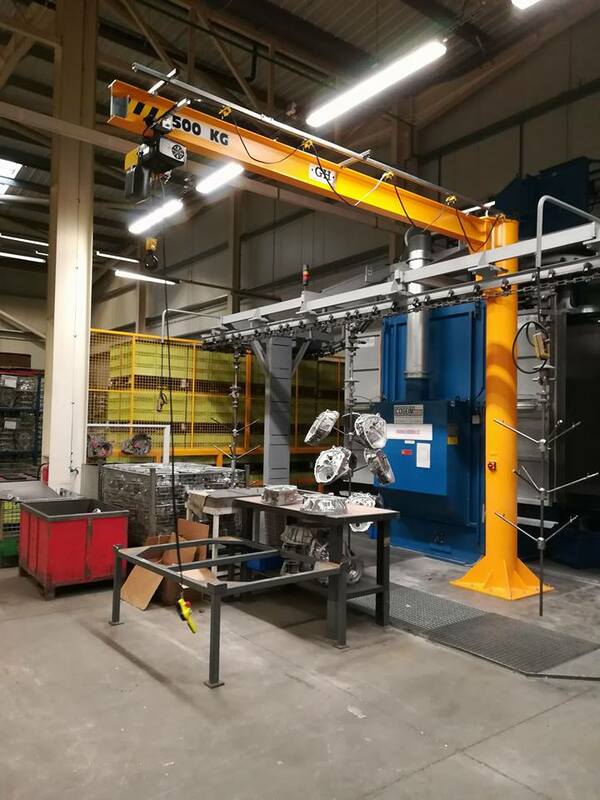 EOT crane with a 5t hoist for Valeo. 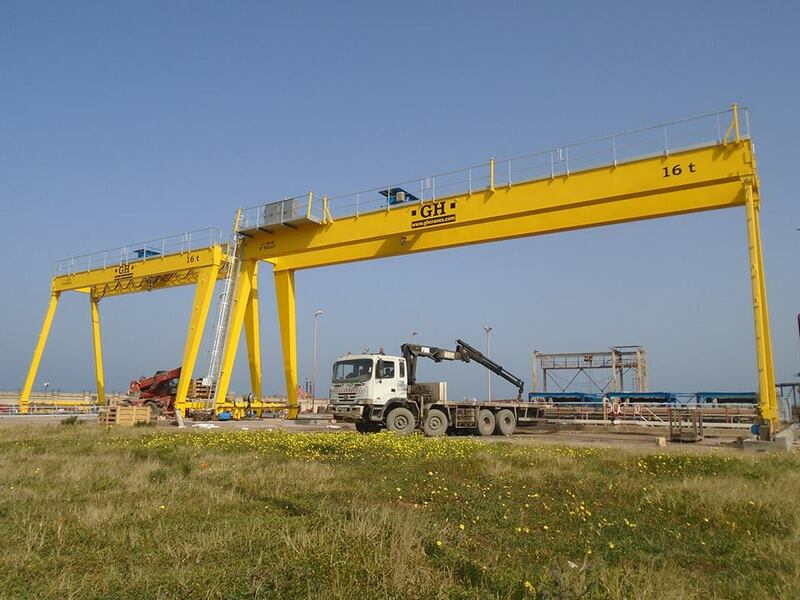 EOT crane for Luagher in Chile. 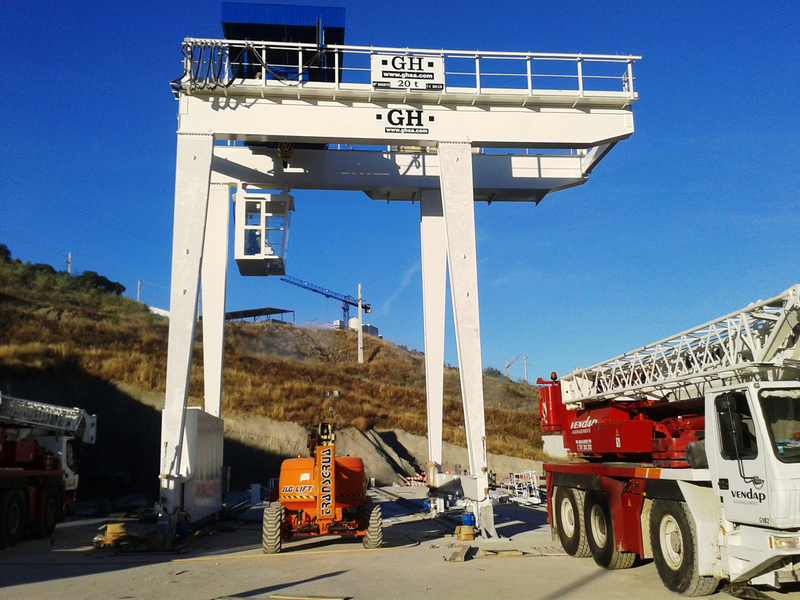 EOT crane with two hoists (6.3t and 3.2t) in Vitoria. 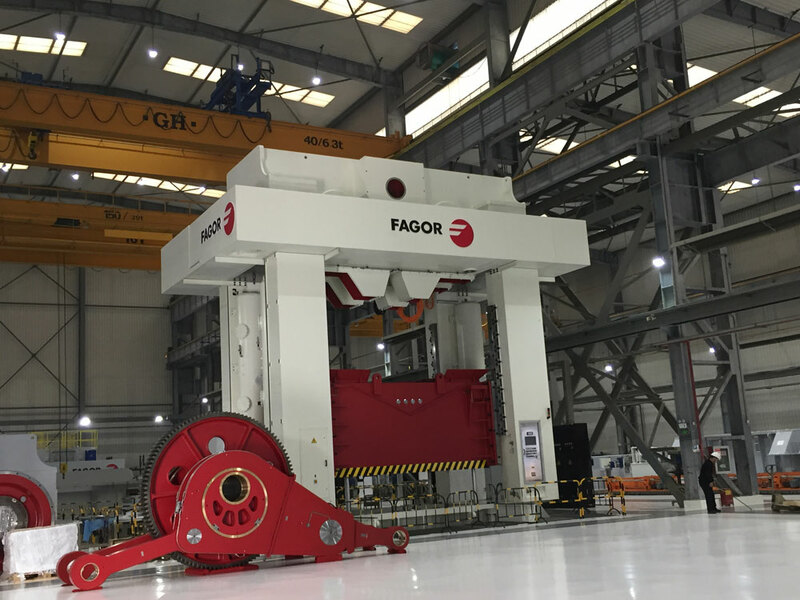 Suspended EOT with a 5t hoist for Fagor en Kunshan, in China. 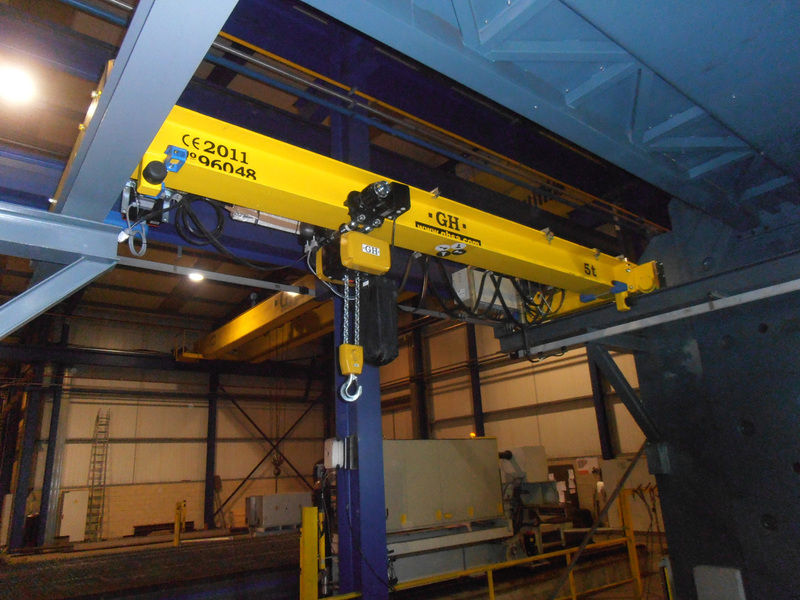 EOT crane for Celsa Polonia with a 12.5t hoist. 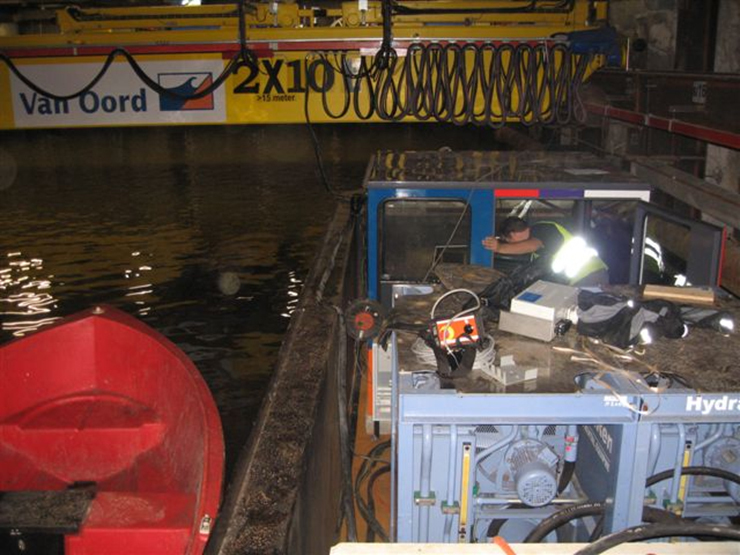 EOT crane with two 10t hoists located in an underground canal in Holland for Van Oord. 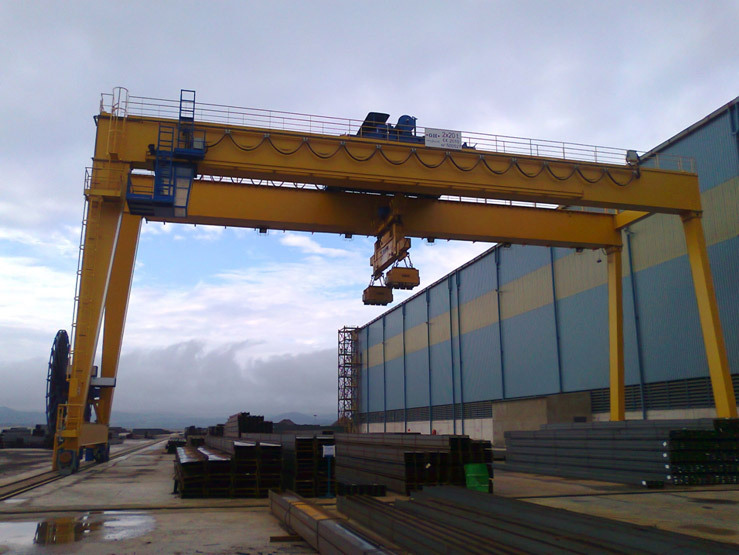 EOT crane Aristrain Arcelor Mittal Beasain with two hoists (30t and 10t). 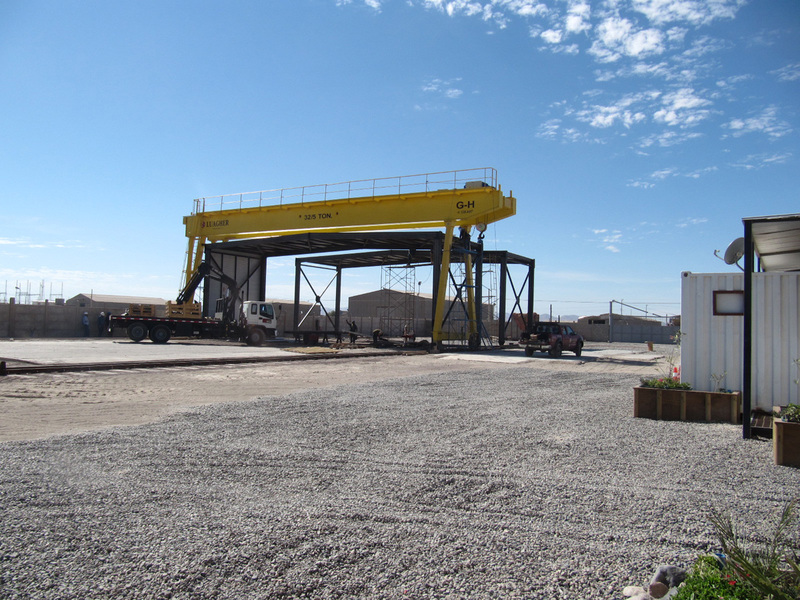 Two EOT cranes for Alkargo. 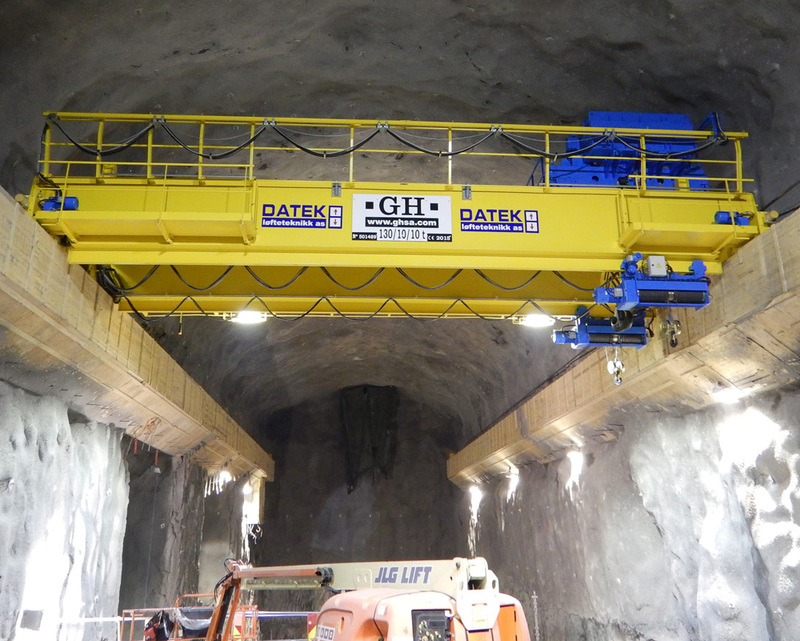 The upper one has two 120t hoists, and the lower a 100t hoist and a 20t one. 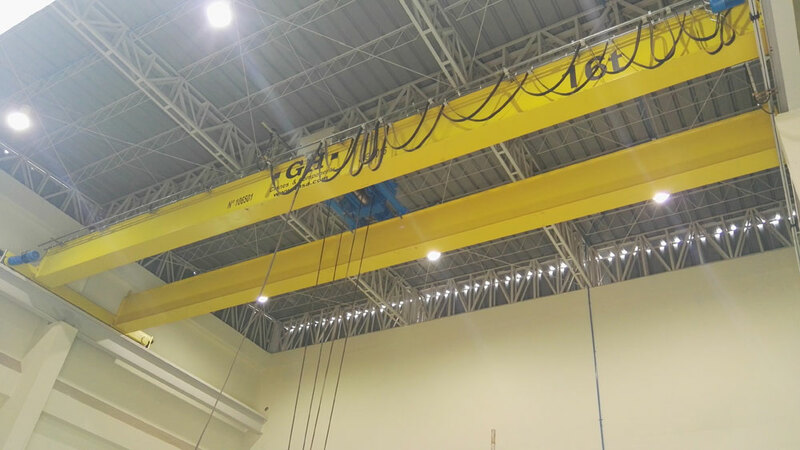 EOT crane with two hoists (50t and 25t). 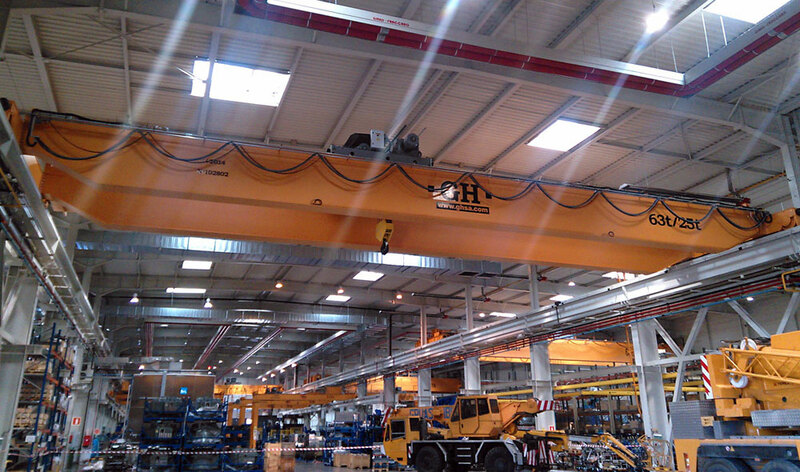 EOT crane with double-girder 32t hoist for Etermar. 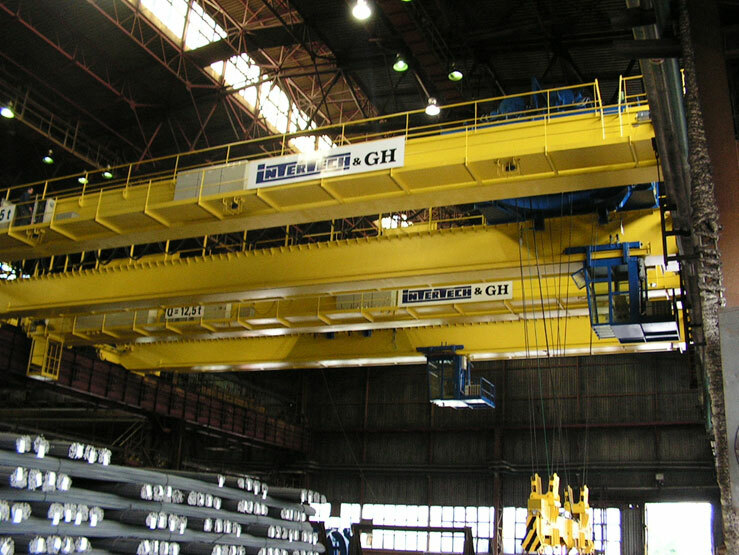 EOT crane with two hoists (32t y 16t). 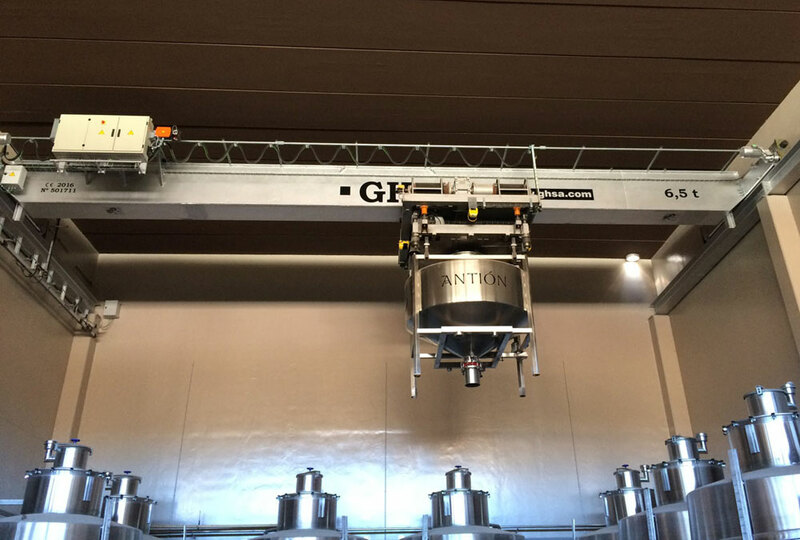 Special EOT crane for circular installation with low-height single-girder hoist for Bodegas Pueyo (winery). 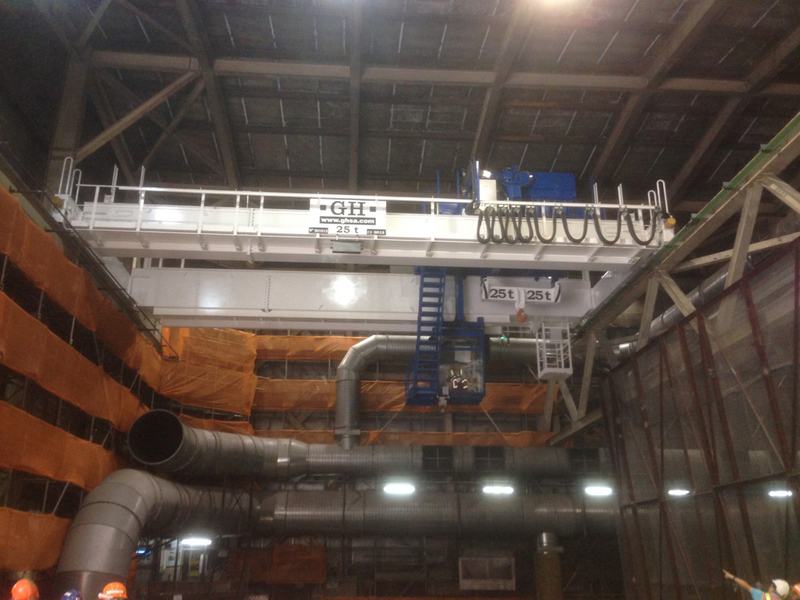 EOT crane with two 3.2t hoists. 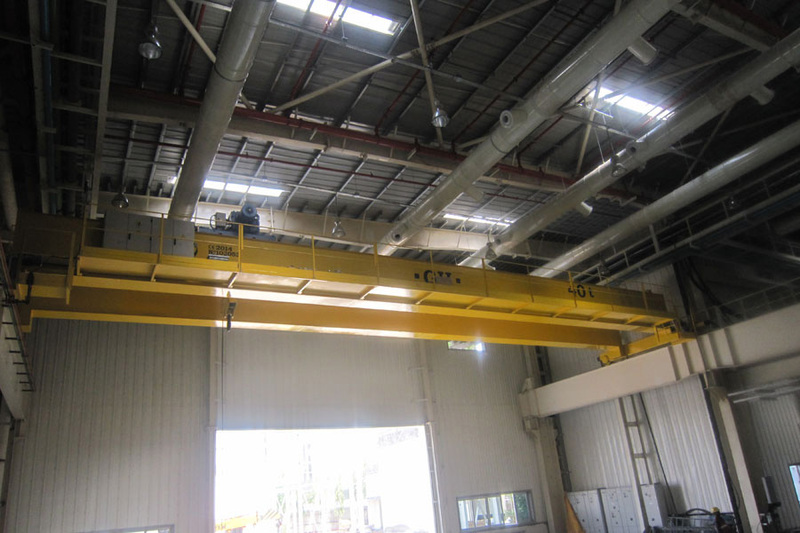 EOT crane with suspended single-girder hoist.